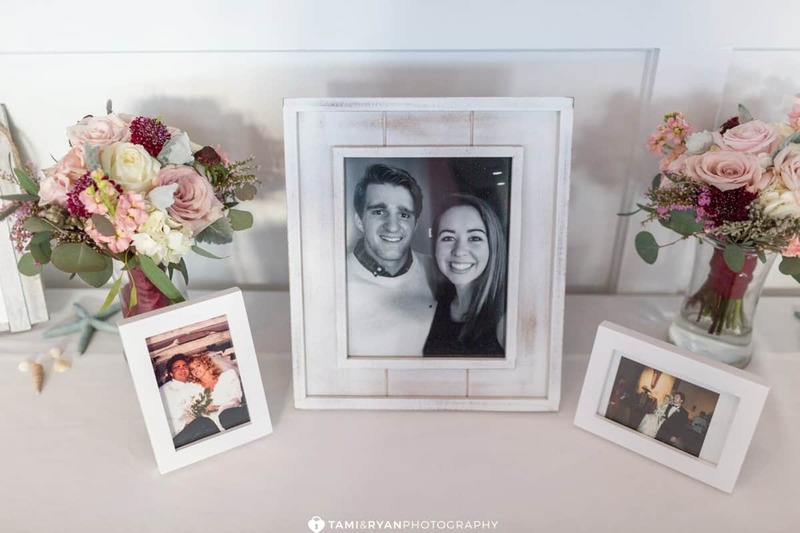 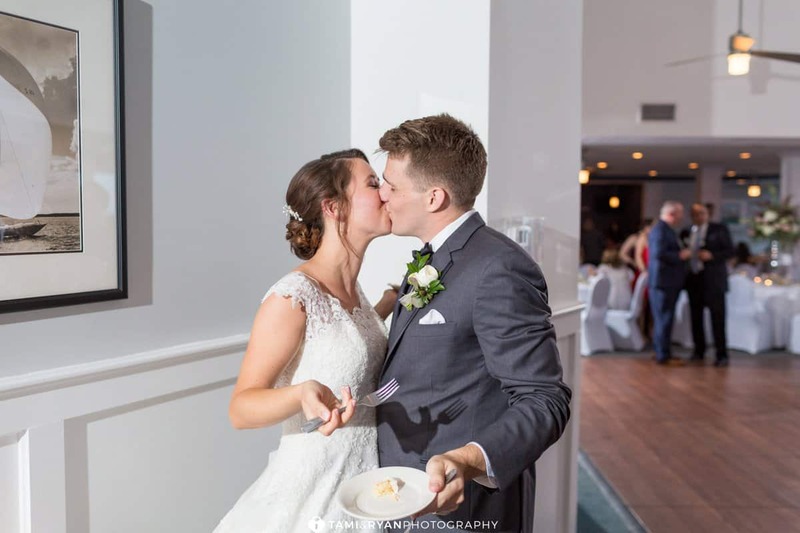 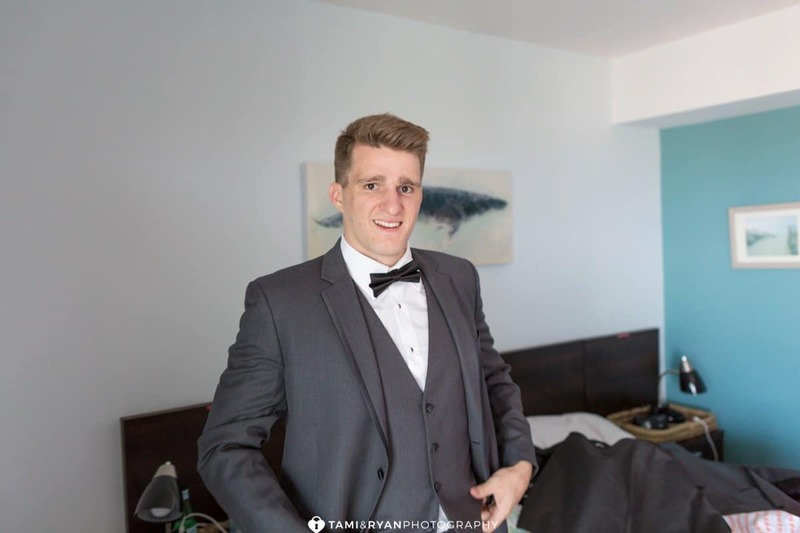 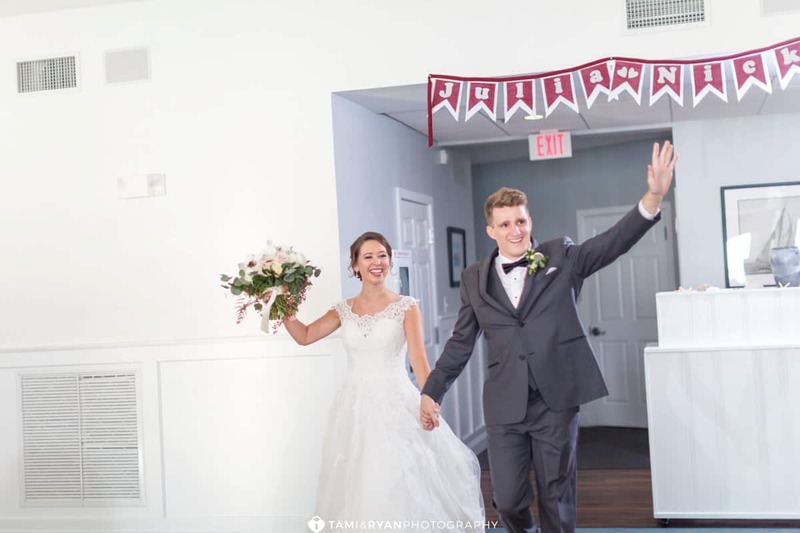 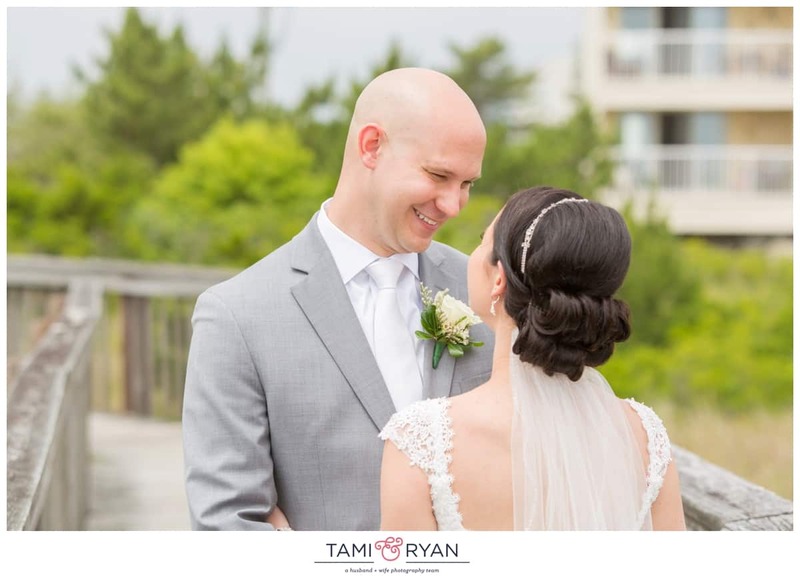 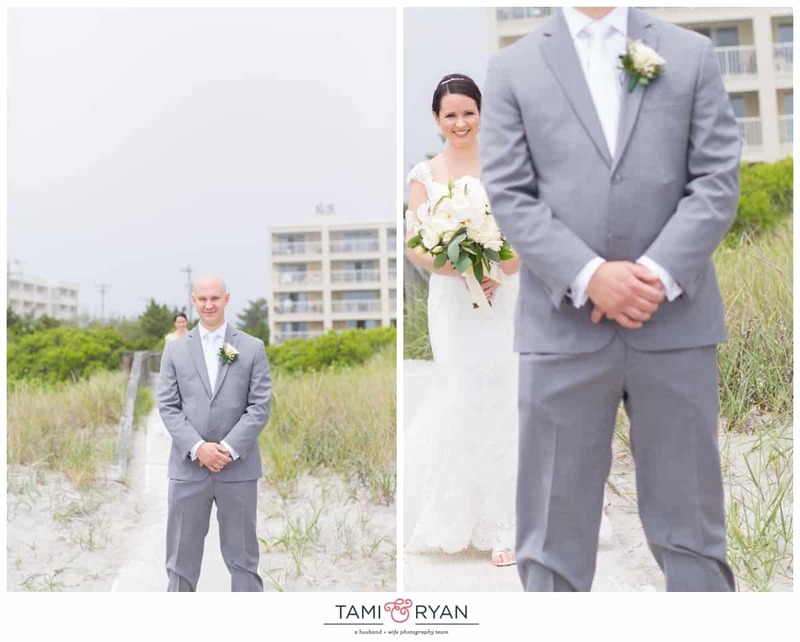 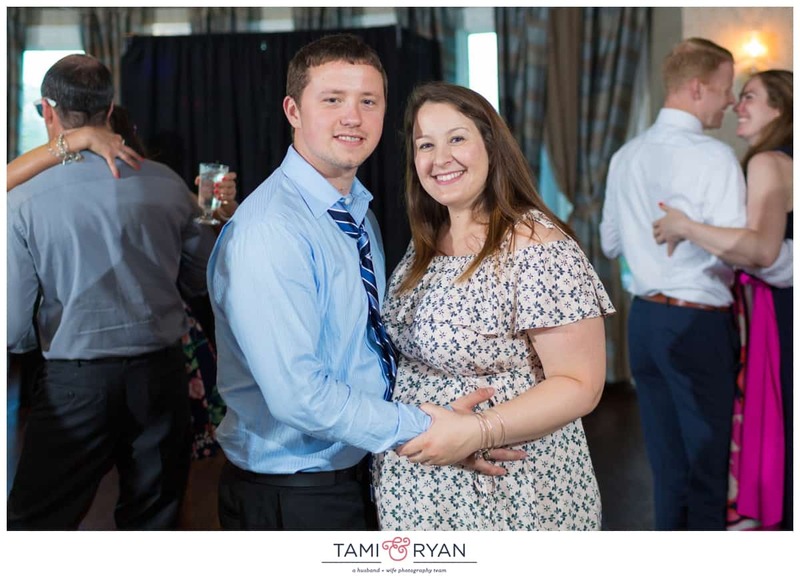 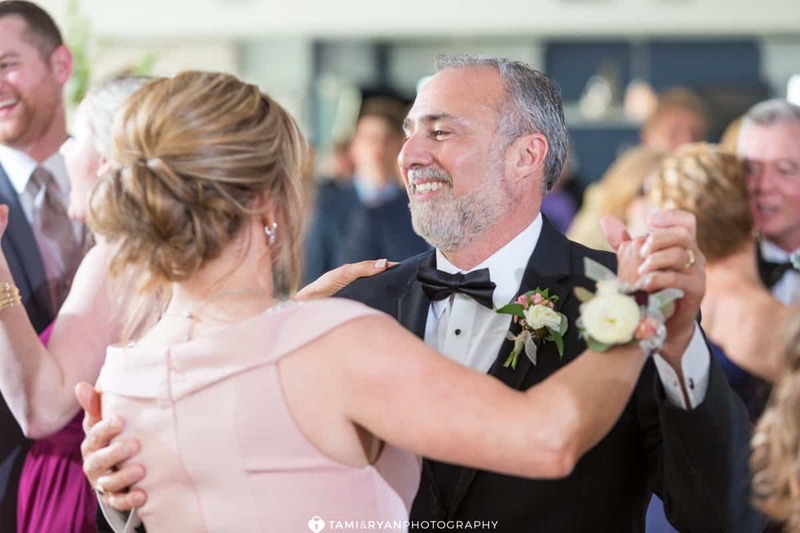 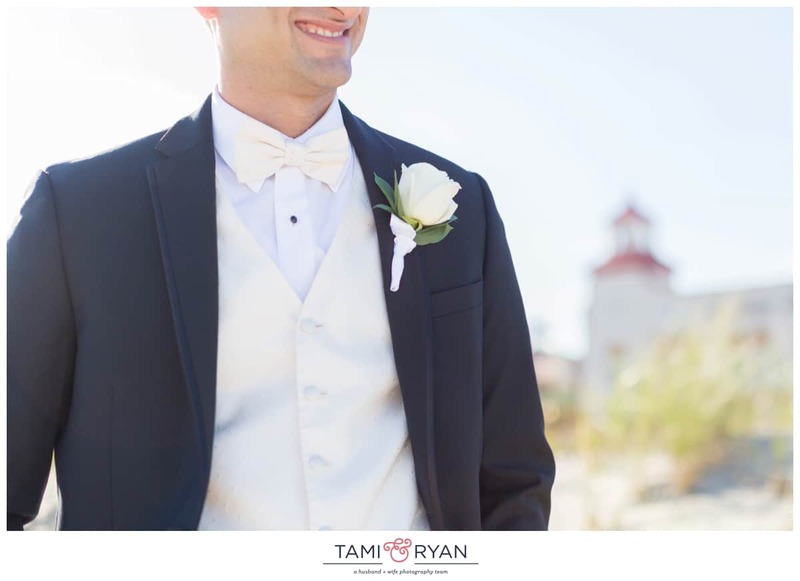 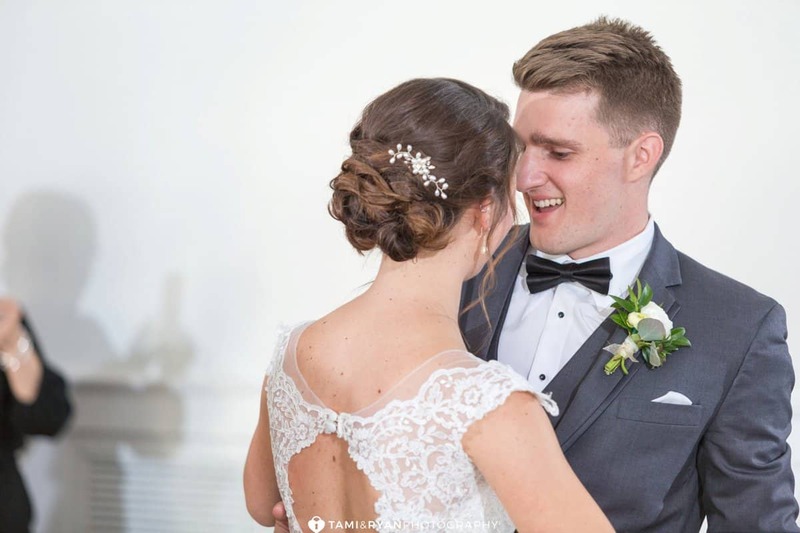 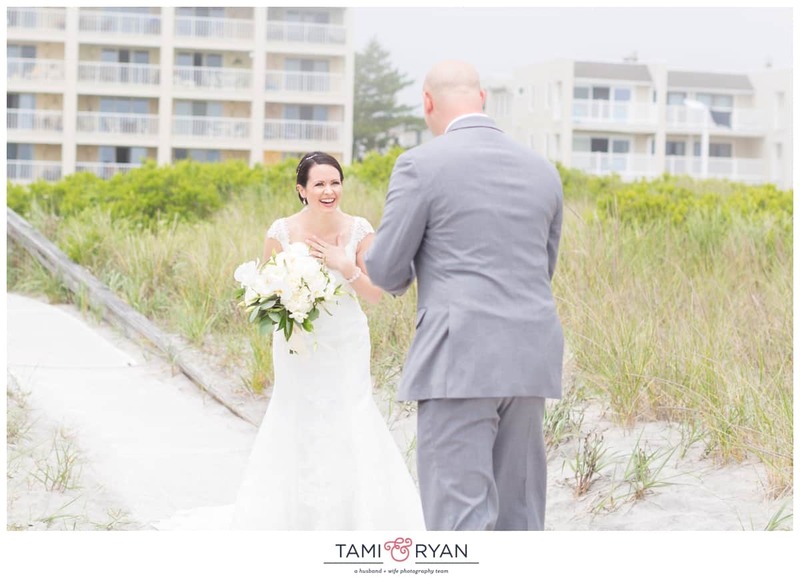 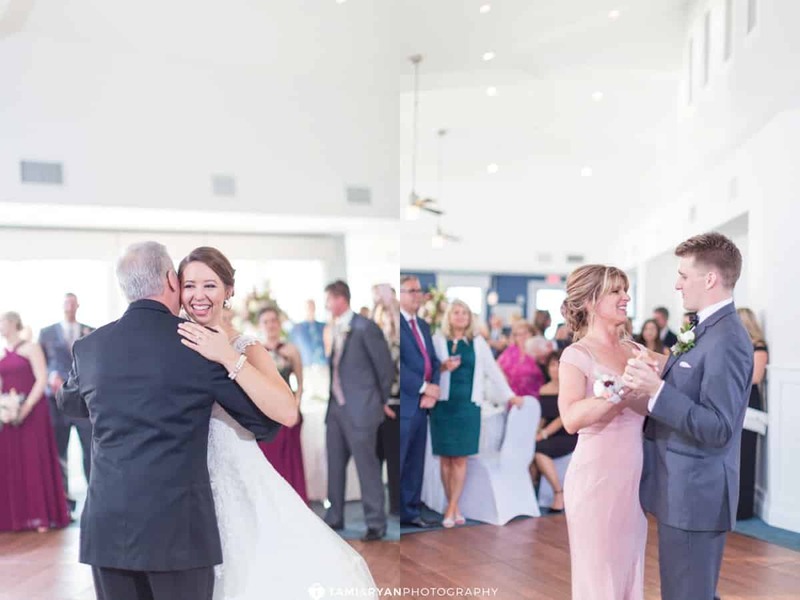 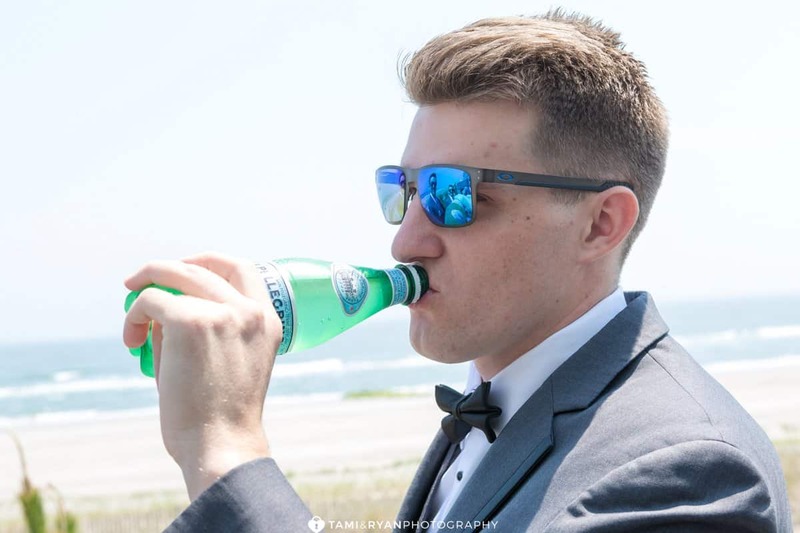 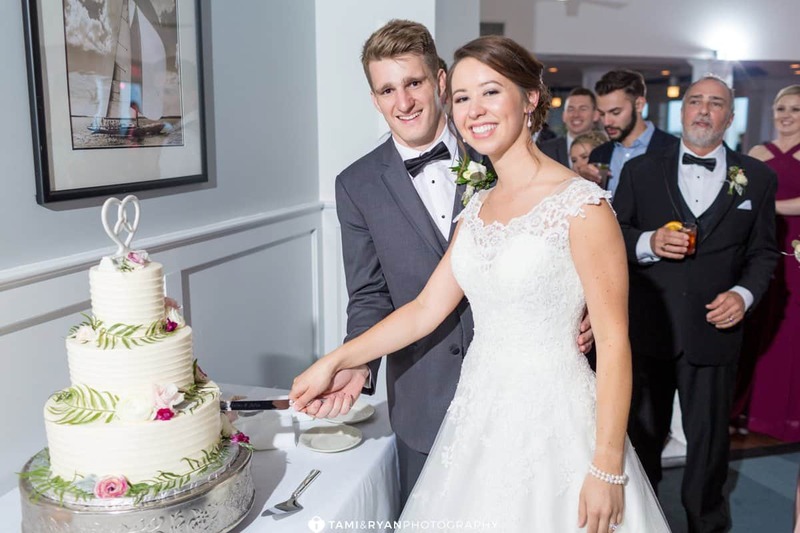 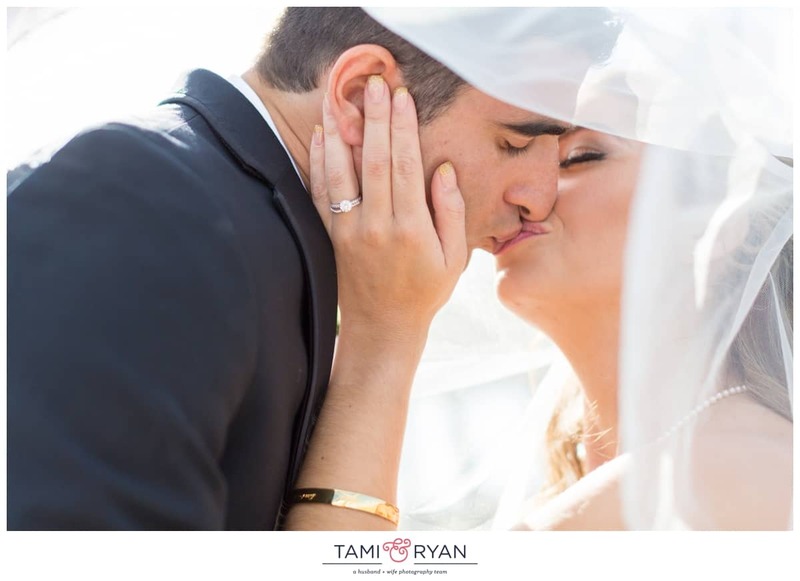 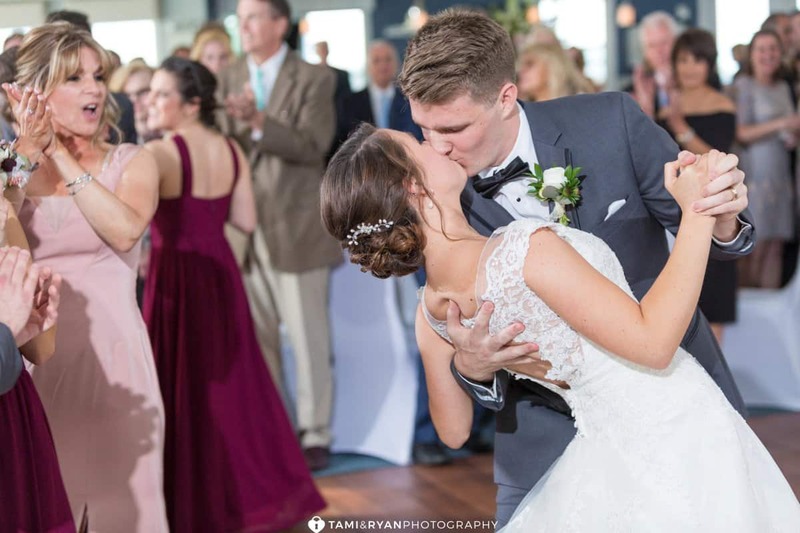 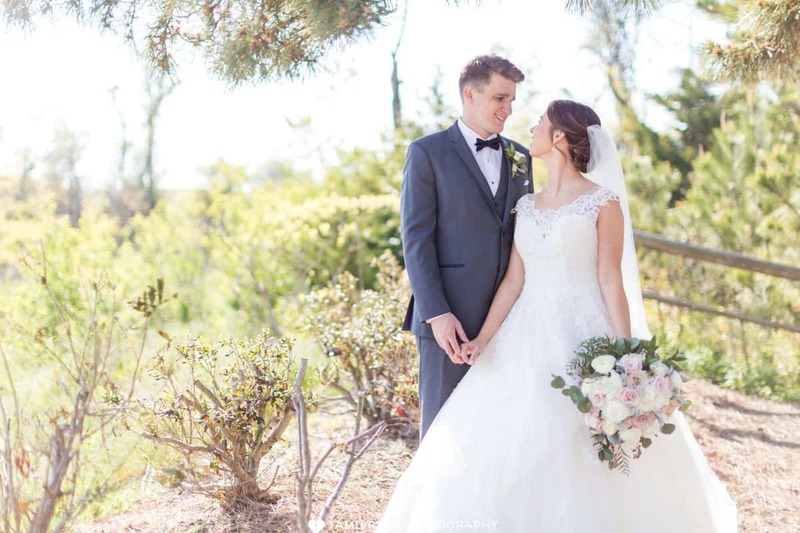 Like the words from one of my favorite songs by Jack Johnson, Julia and Nick surely are ‘Better Together.’ This lovely, down to earth, fun couple planned such a beautiful, romantic Yacht Club of Sea Isle City wedding! 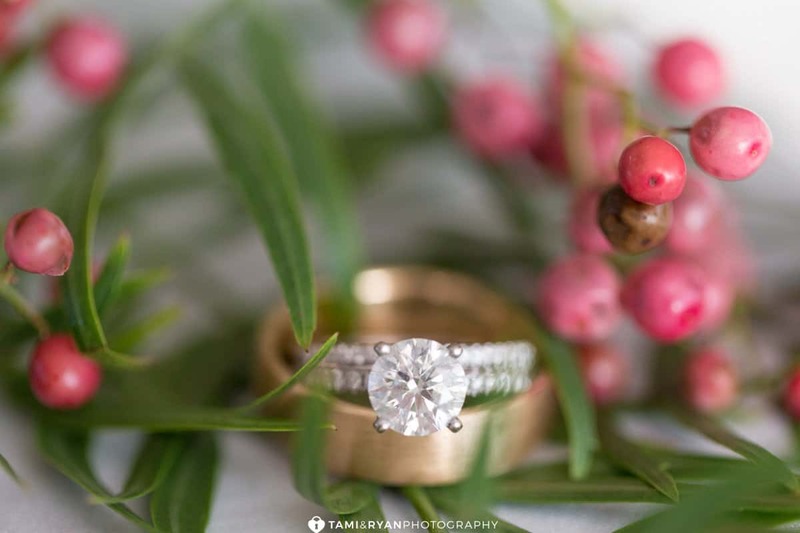 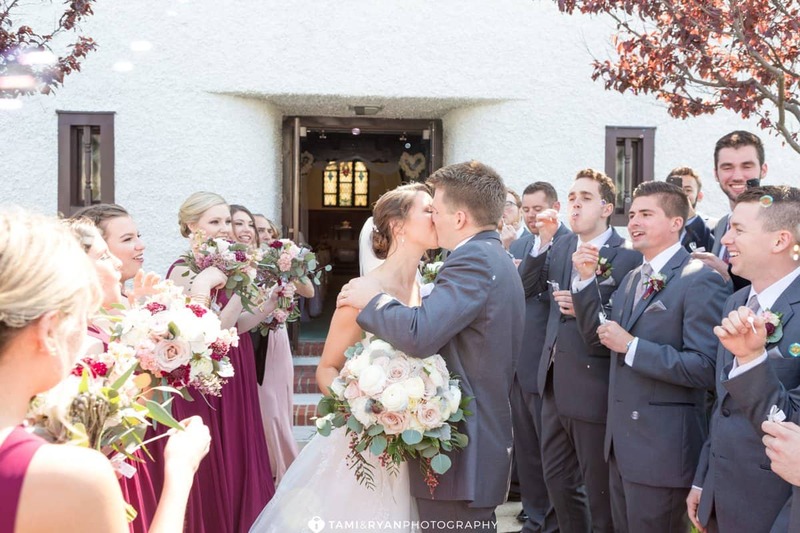 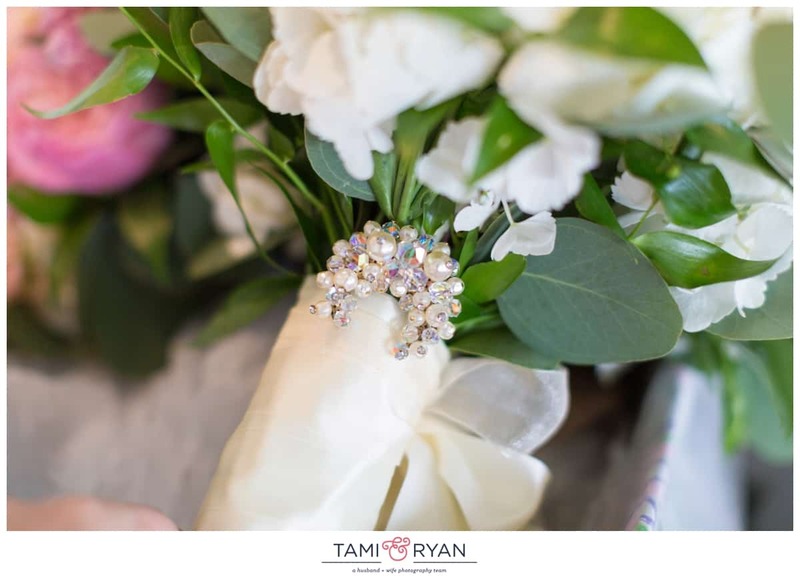 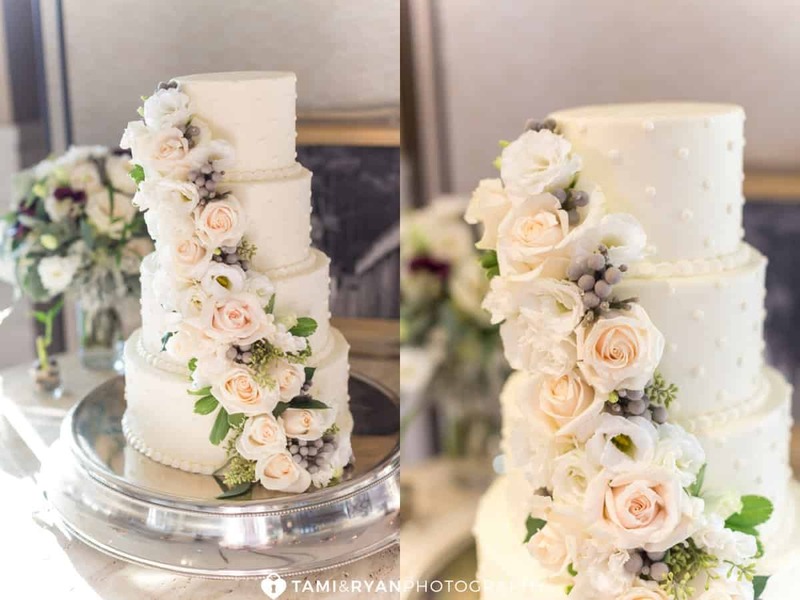 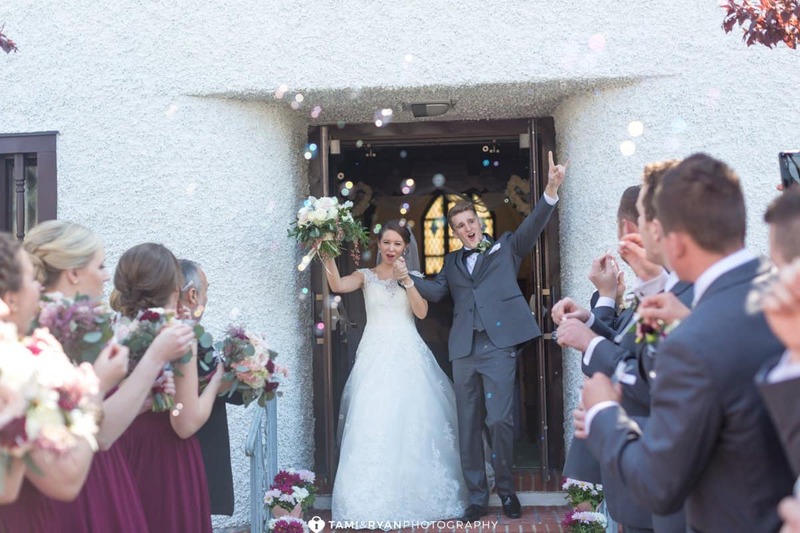 From all of the little details, to the flowers, to the band, you could tell that so much thought and so much love was put into making this a perfect day for the two of them to celebrate the beginning of their greatest adventure yet! 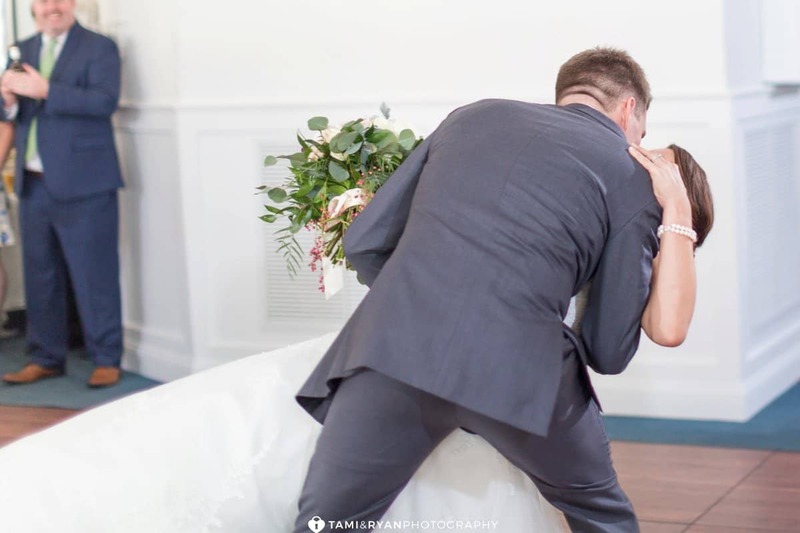 Marriage! 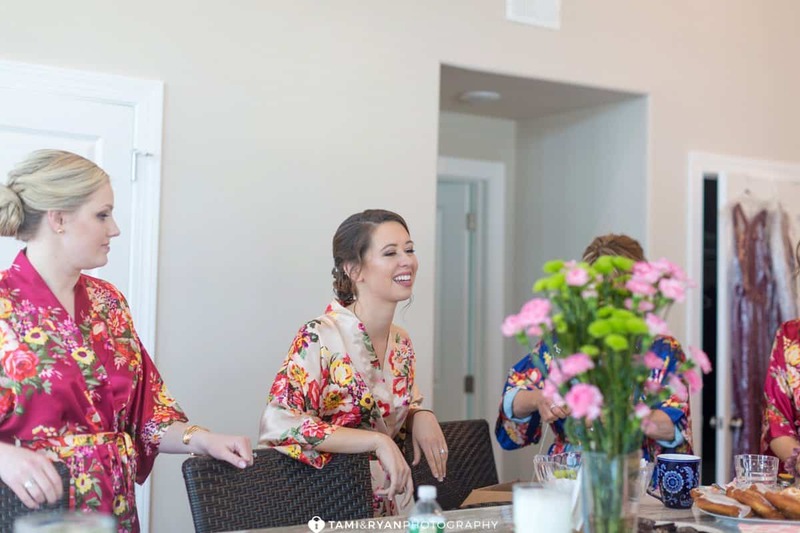 Julia and her girls arrived back at the house, after a morning of pampering at the Fusion Salon. 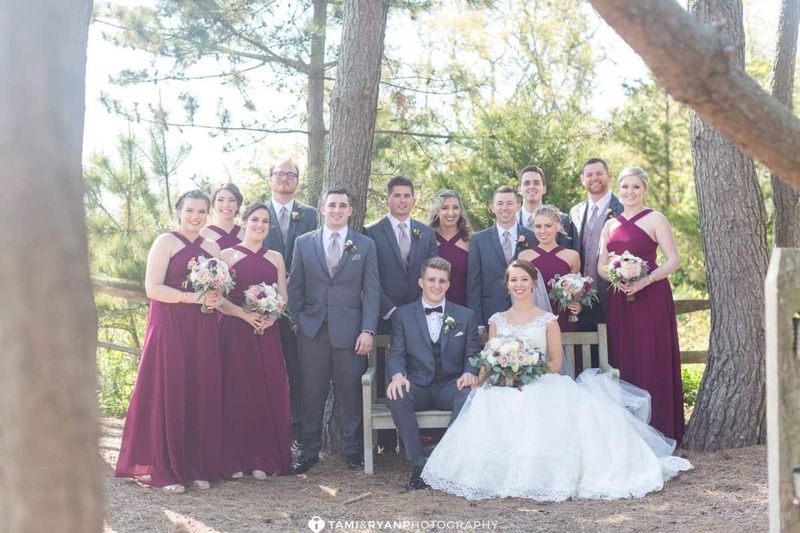 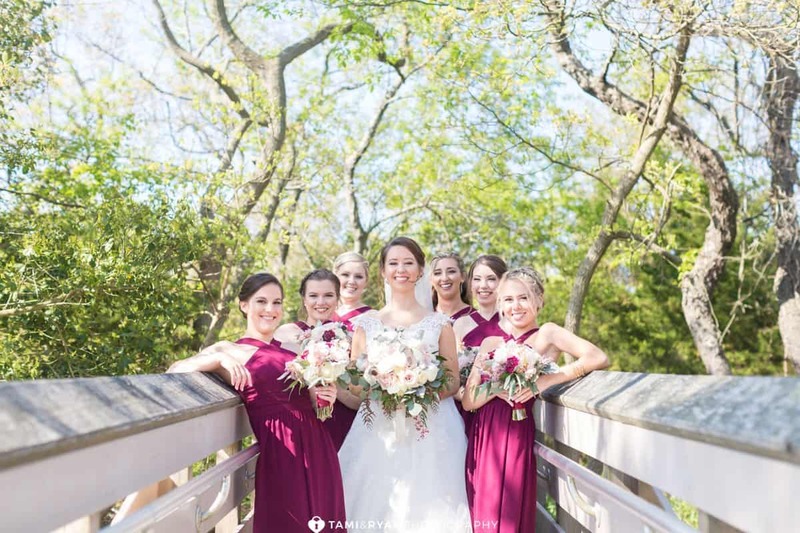 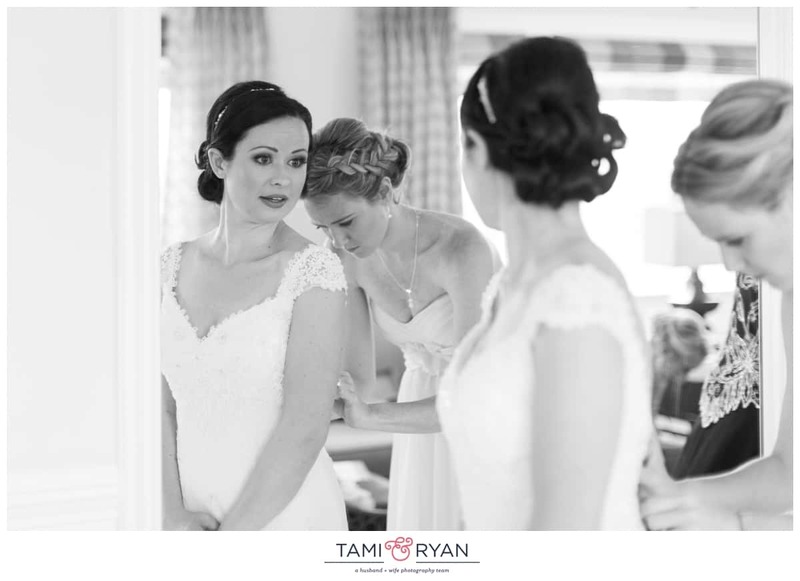 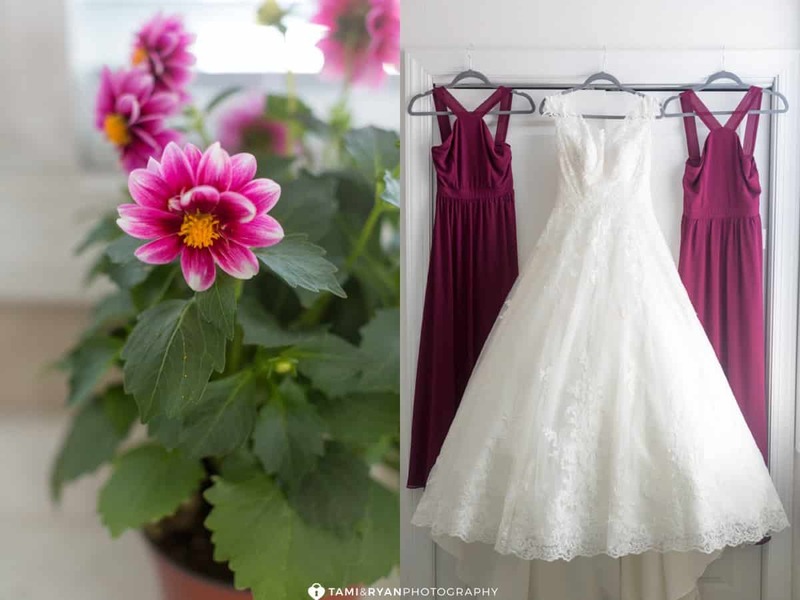 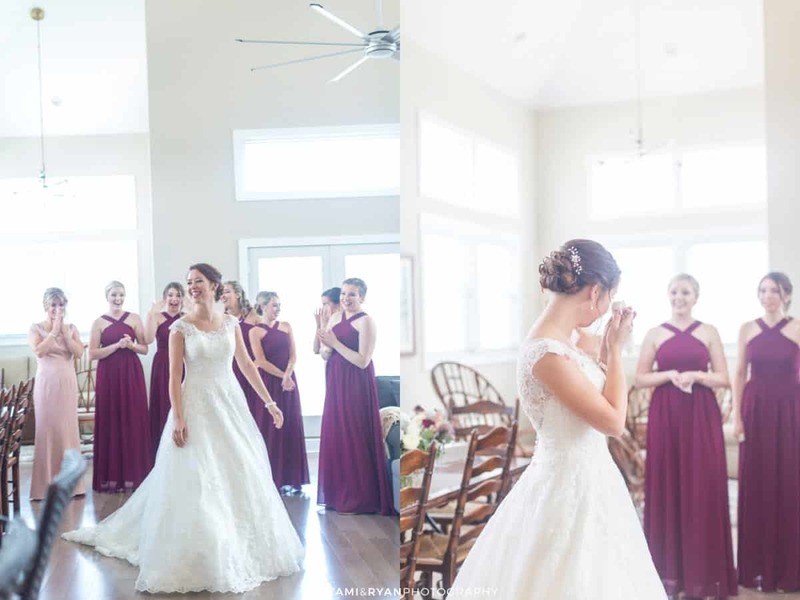 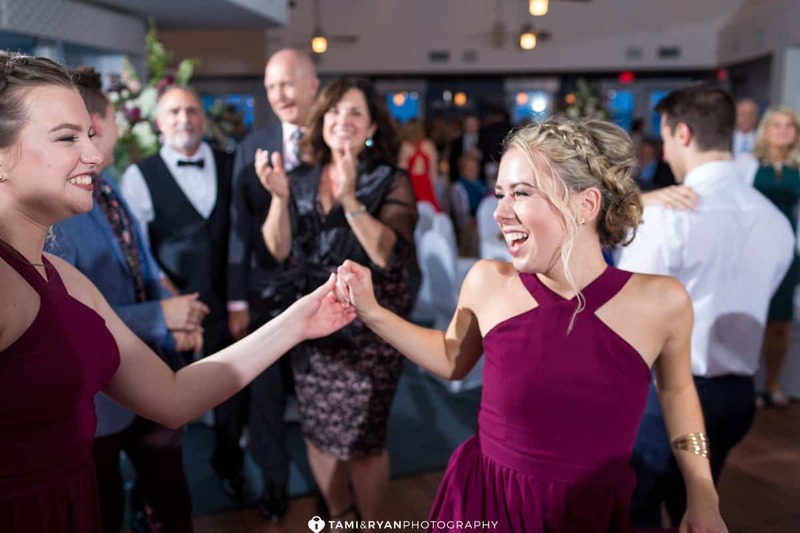 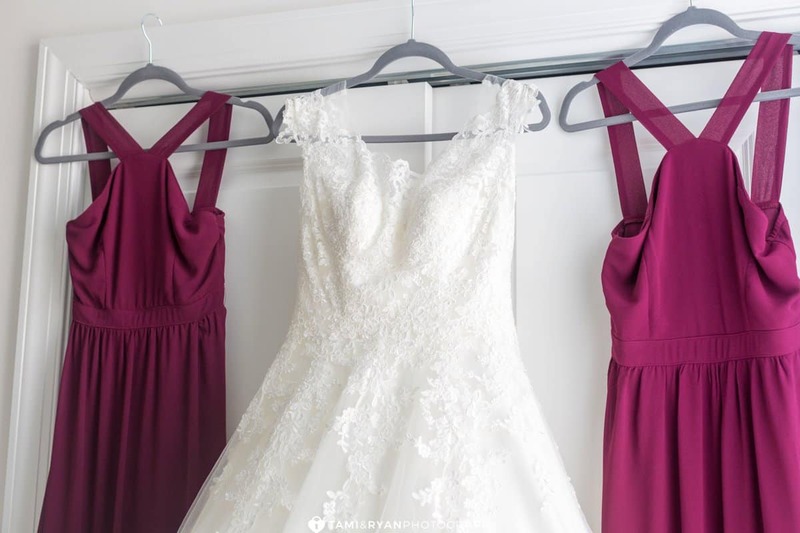 Each girl looked so beautiful, and their hair and makeup was perfect with their burgundy bridesmaids dresses! 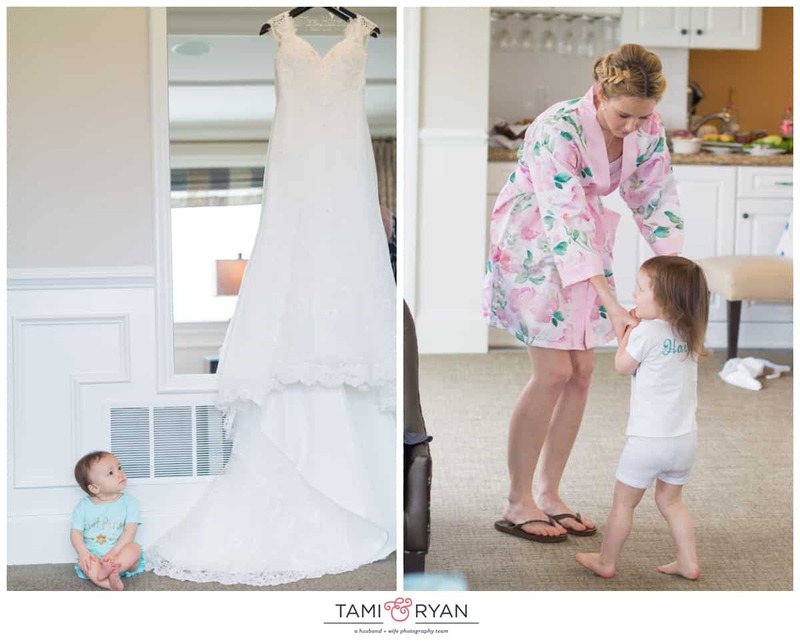 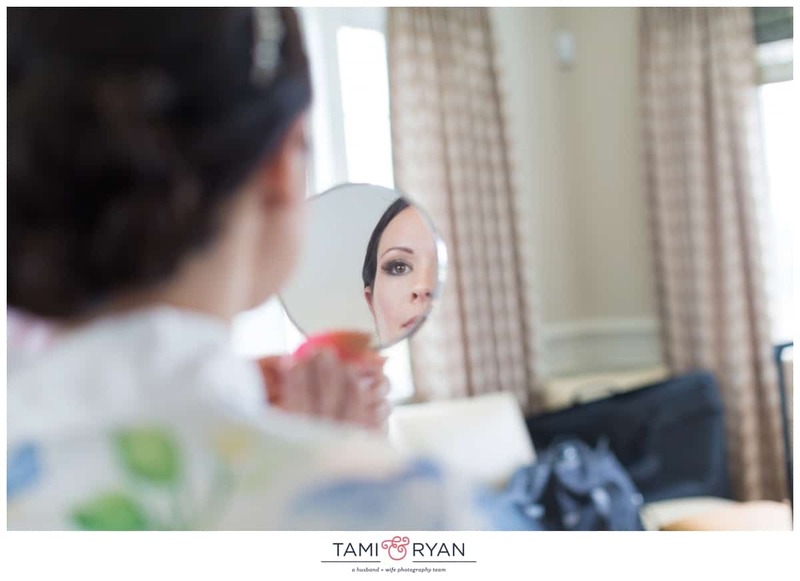 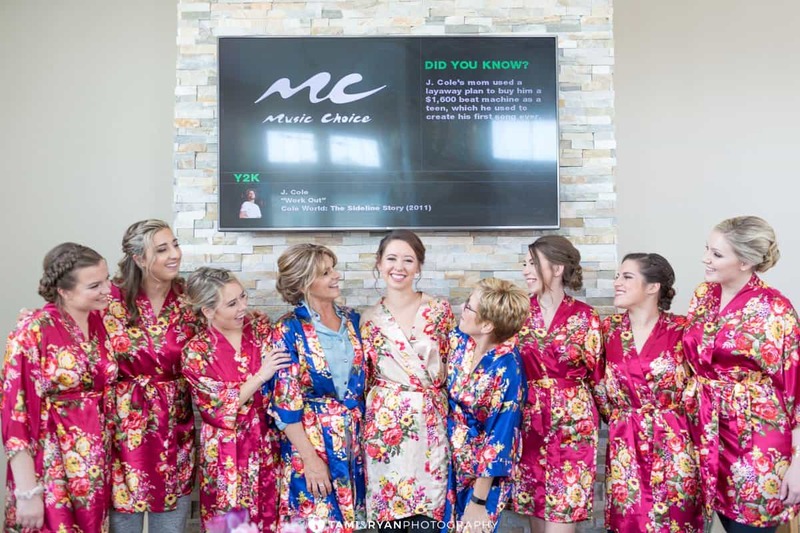 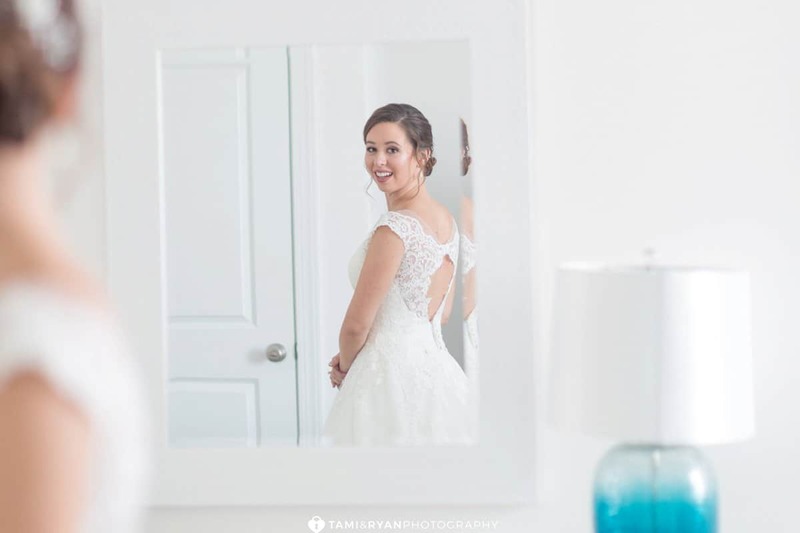 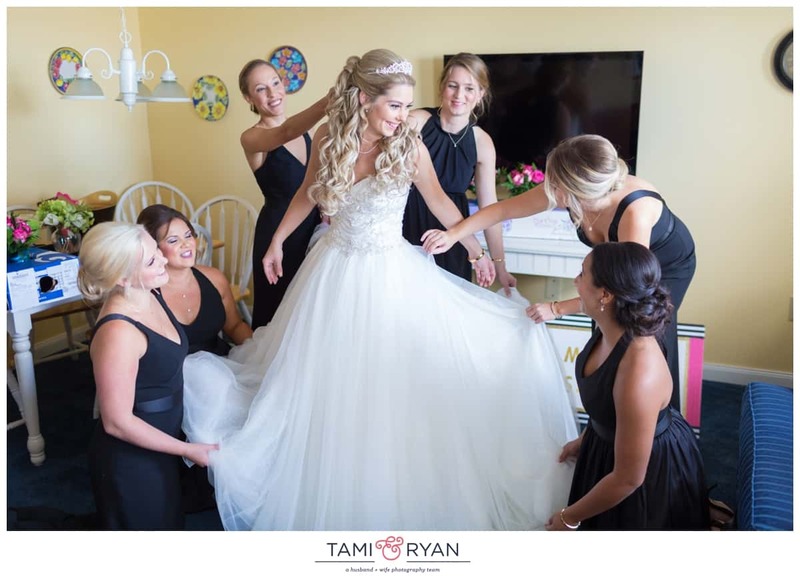 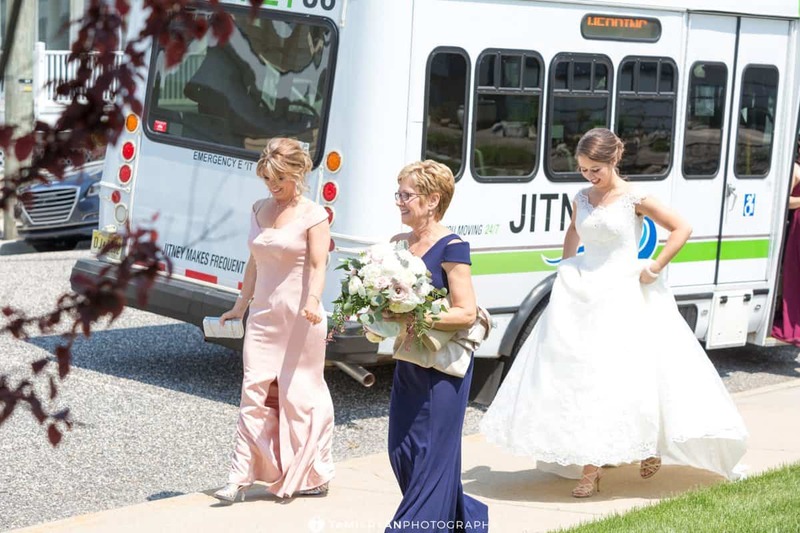 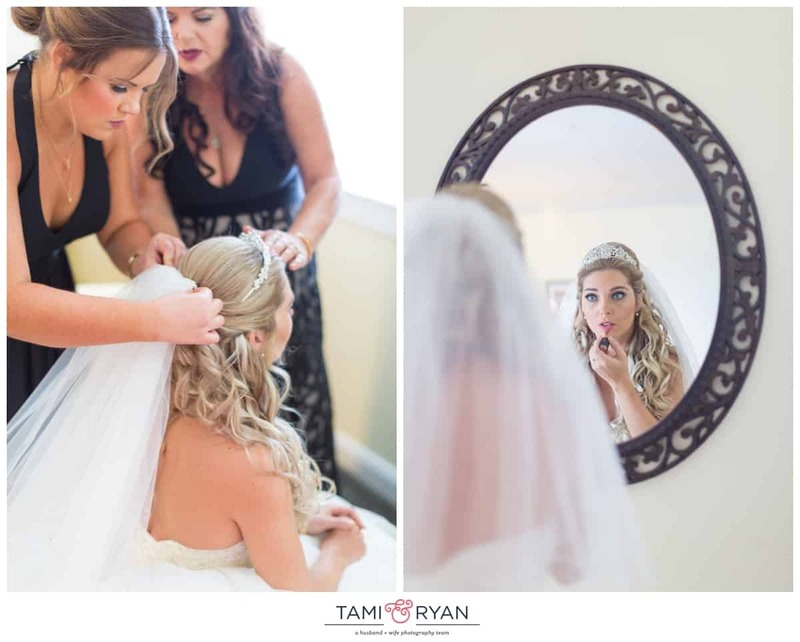 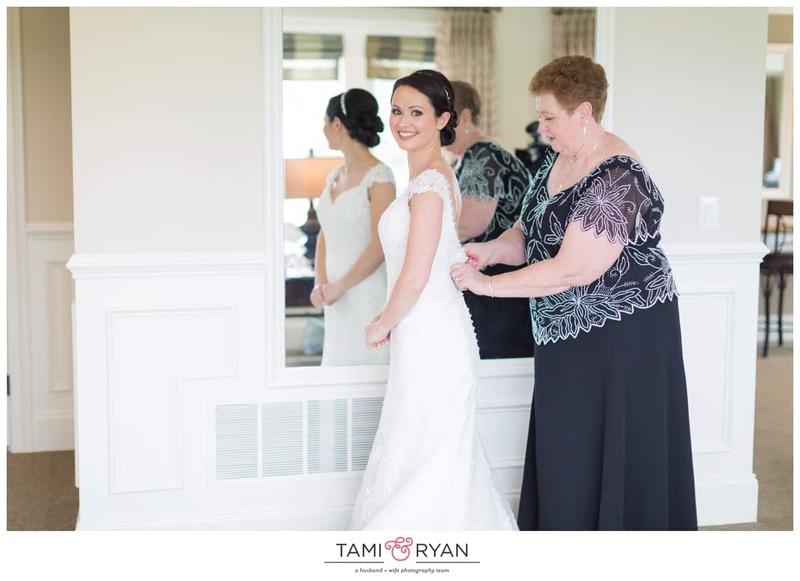 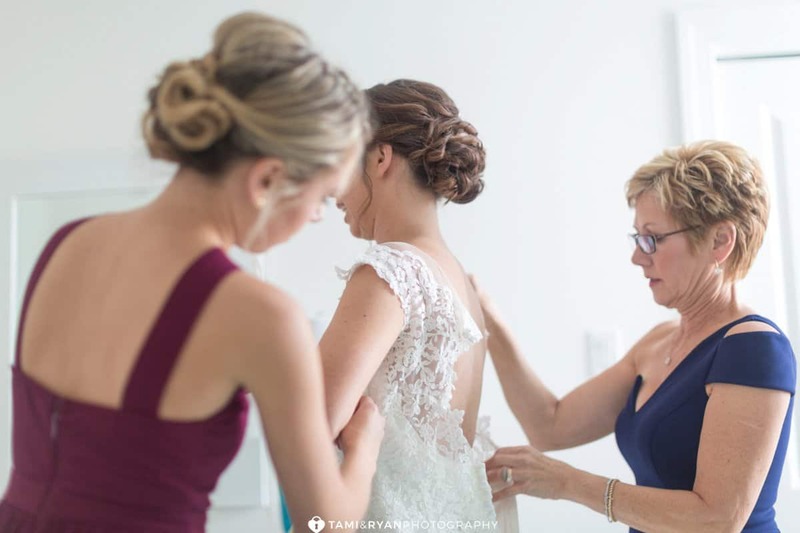 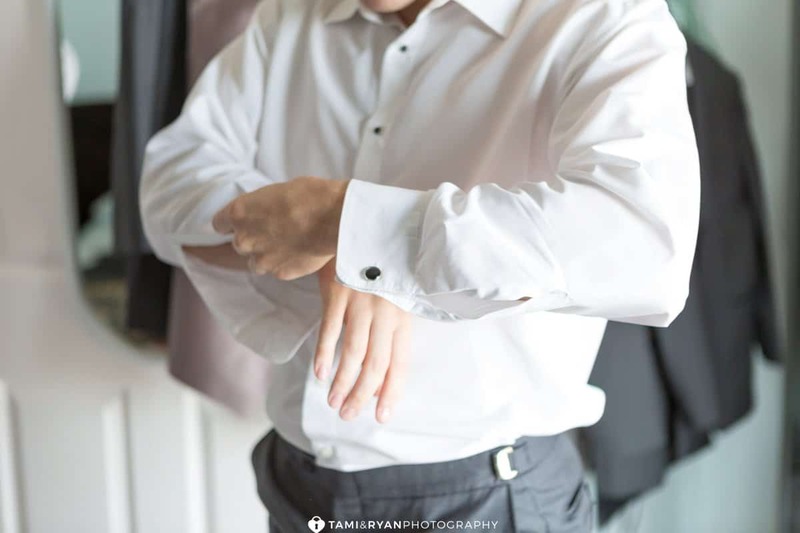 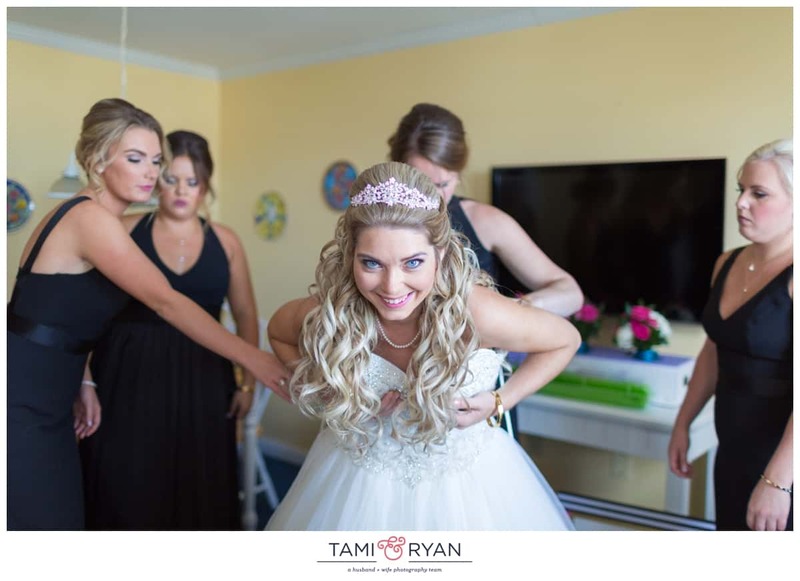 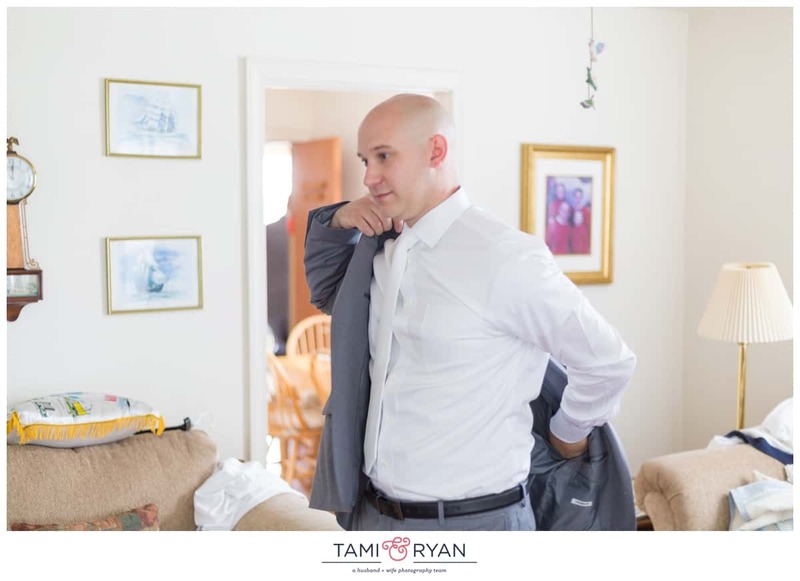 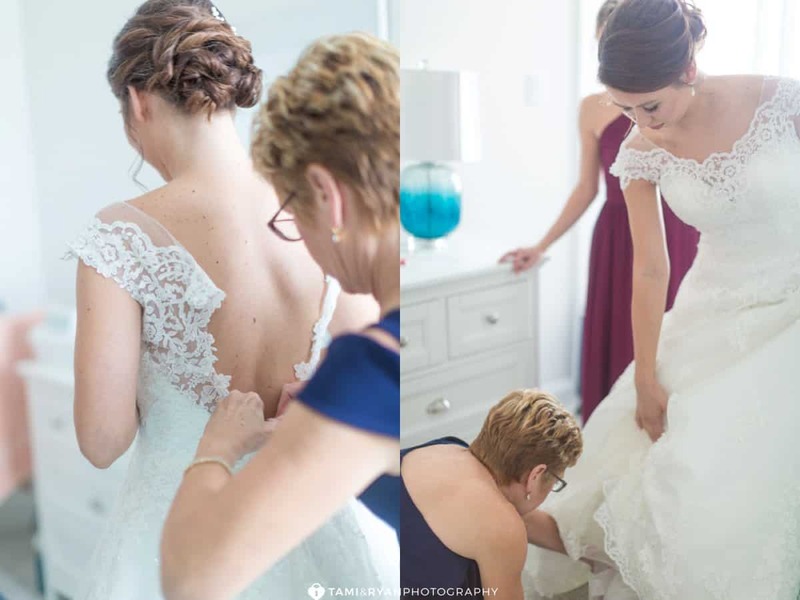 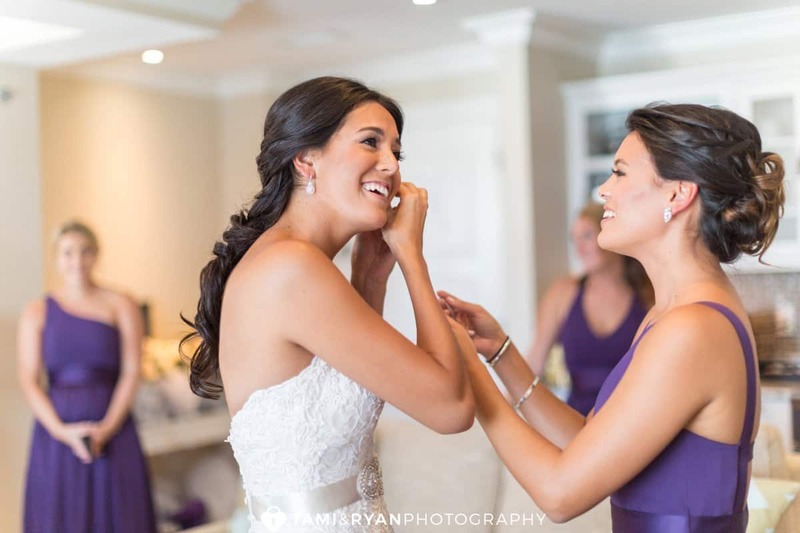 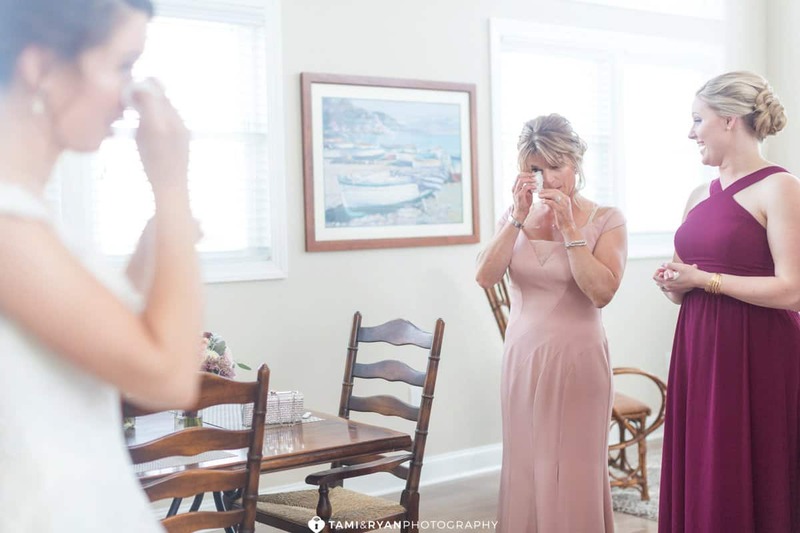 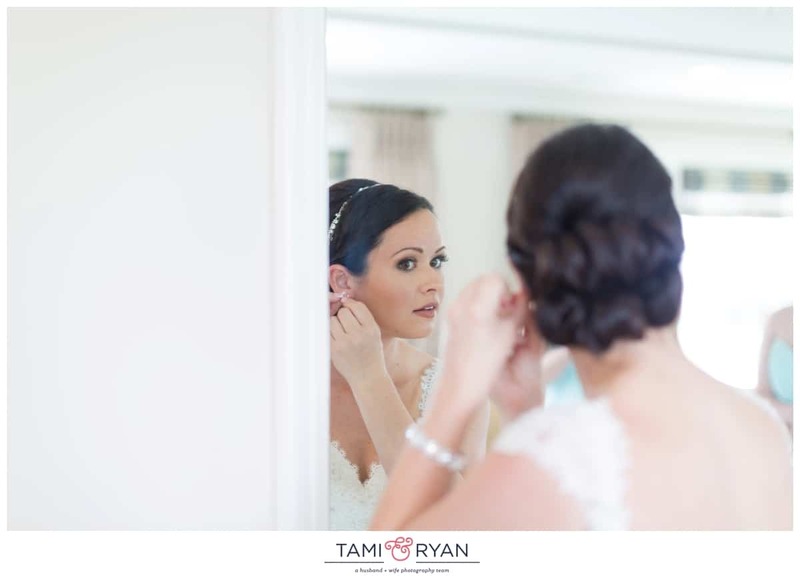 Julia’s mom and sister helped her to get ready, while the rest of the bridesmaids and her future Mother in Law were waiting in the Family room for the reveal! 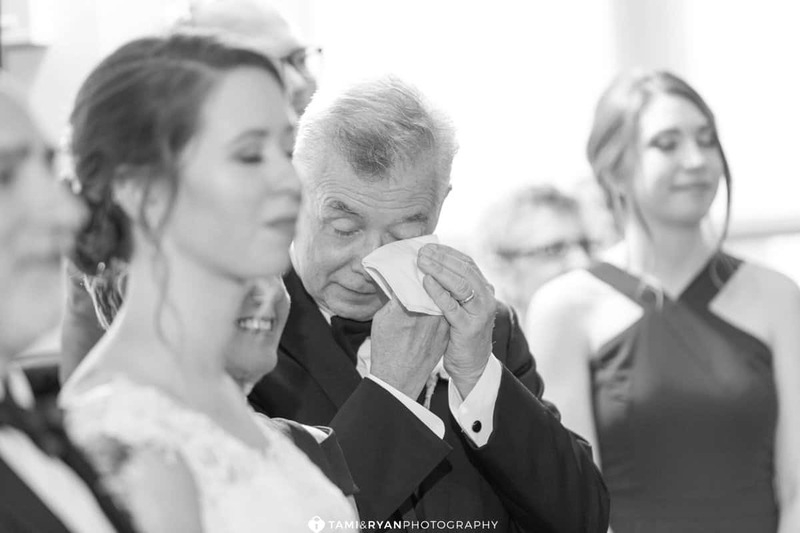 There were so many happy tears shed! 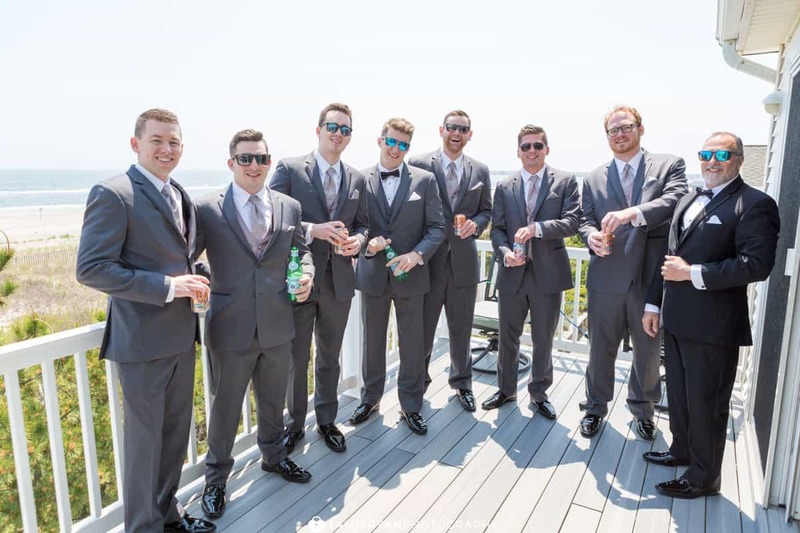 Meanwhile, the guys were on the other side of the island, just hanging out, drinking some Pellegrino, and waiting for the festivities to begin! 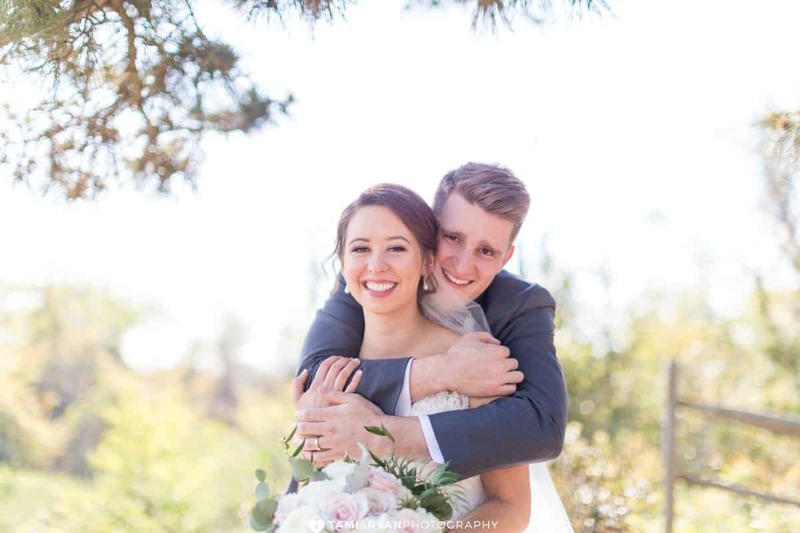 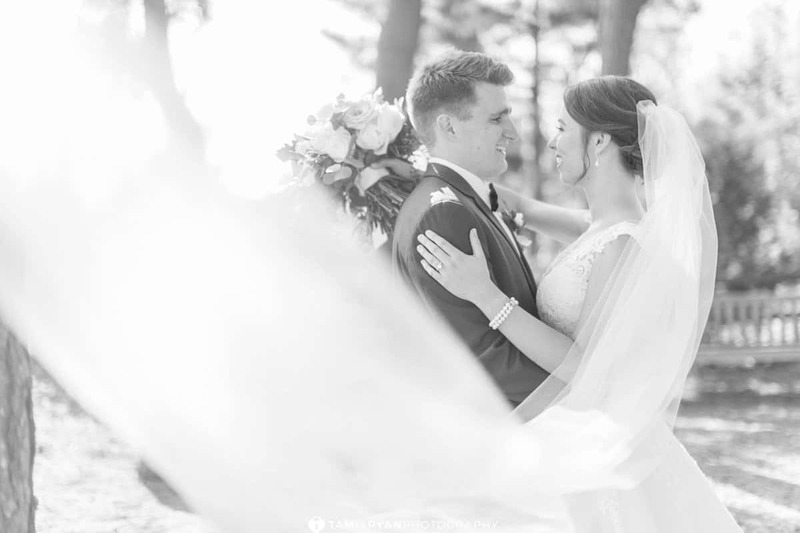 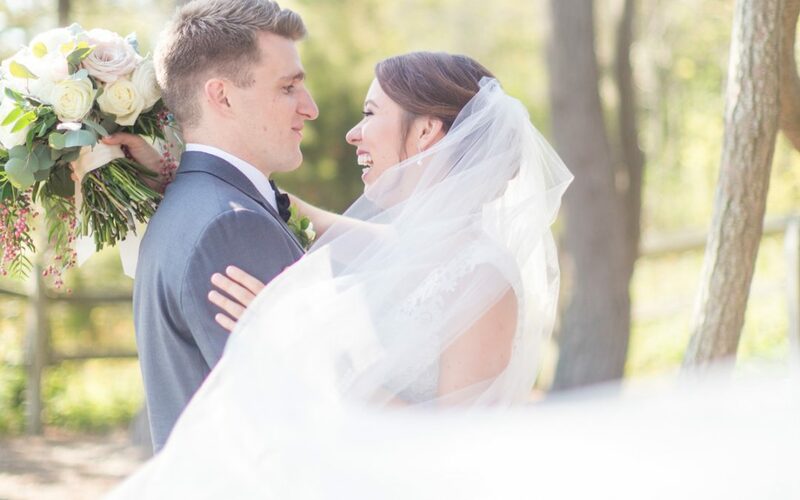 Nick and Julia met while studying abroad in Beijing (which is where they are currently honeymooning!!). 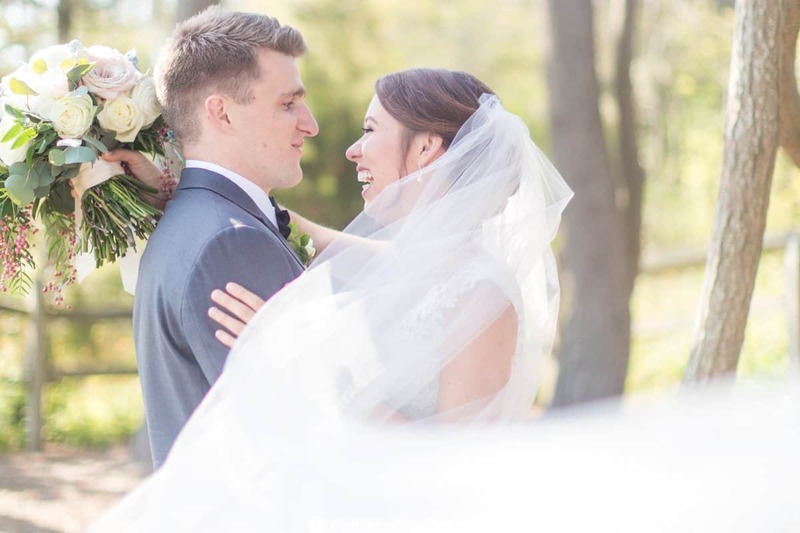 He was at school in Cleveland and Julia was in Baltimore, and they both had chosen Beijing for their Junior Fall Semester abroad! 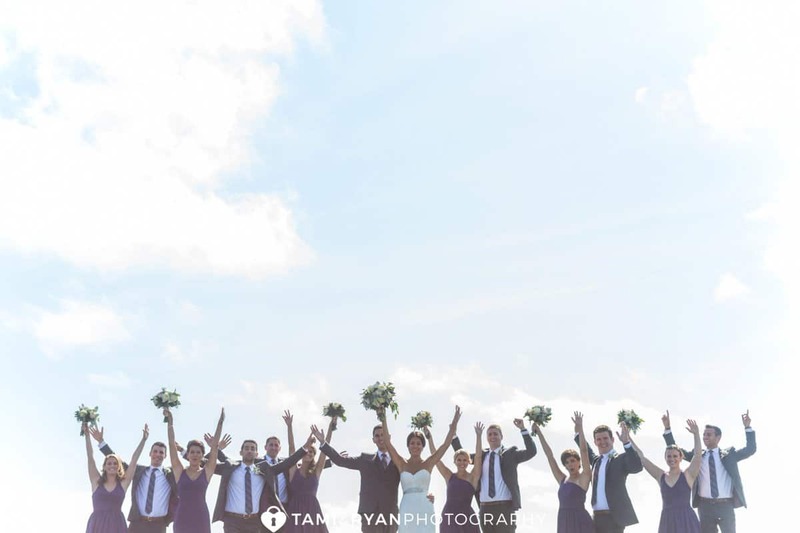 A few days after arriving, the group of students took a 3 week Silk Road trip across China. 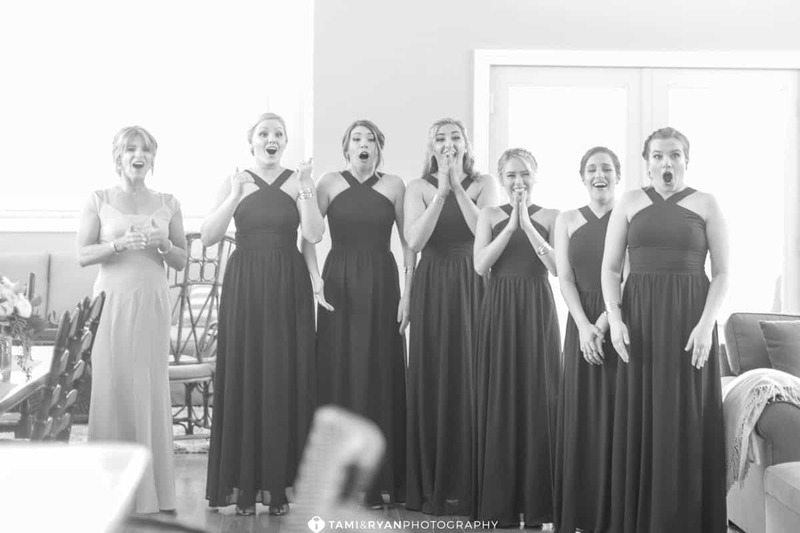 Two weeks into the trip, a group of them had gone to a Karaoke bar. 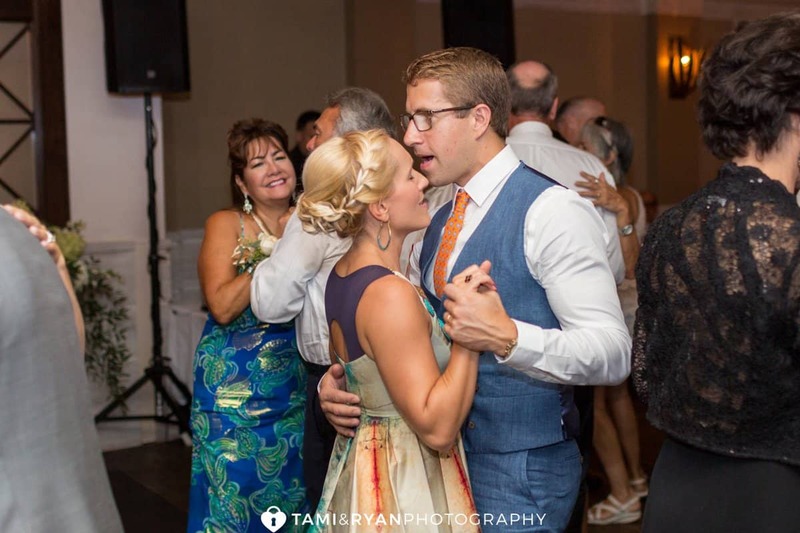 Nick and Julia talked the entire way there, as well as all throughout the night. 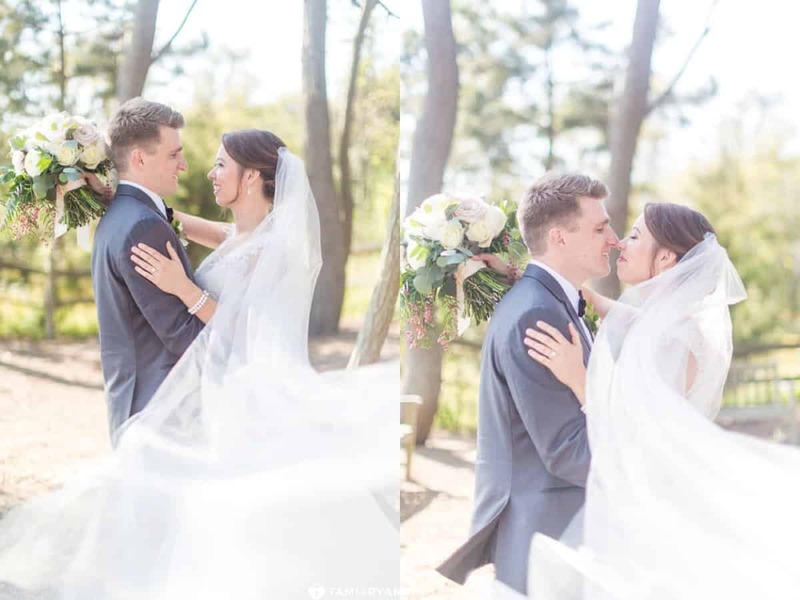 There was a spark between them, as shortly after returning to Beijing, they were inseparable! 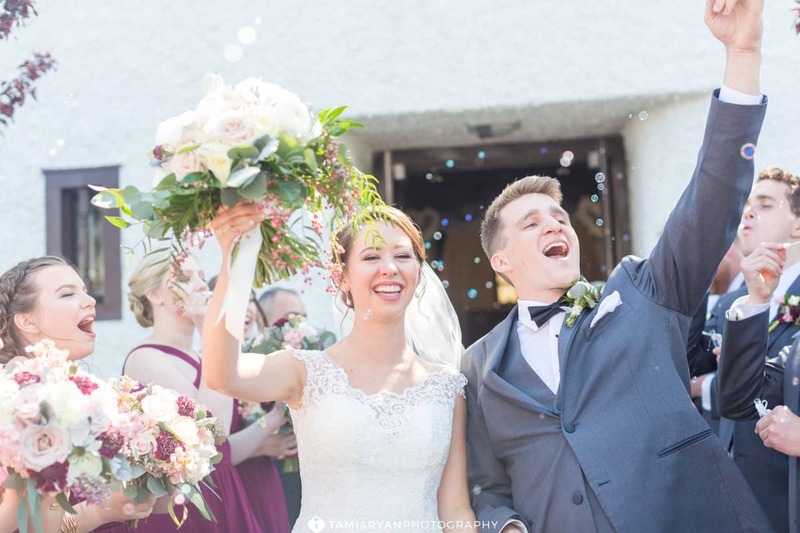 Over the next year and a half, they successfully endured a long distance relationship and visited one another as often as they could! 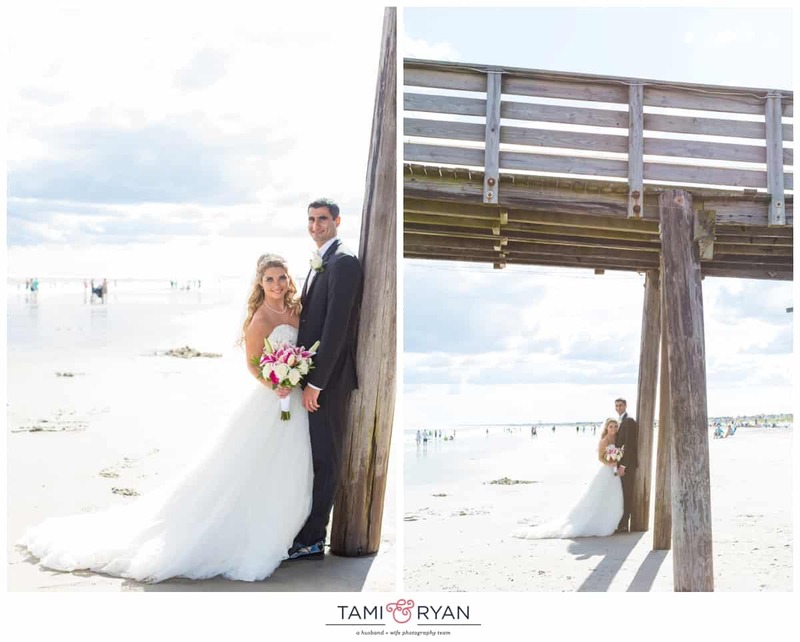 After graduation, they both moved to Florida for their graduate programs! 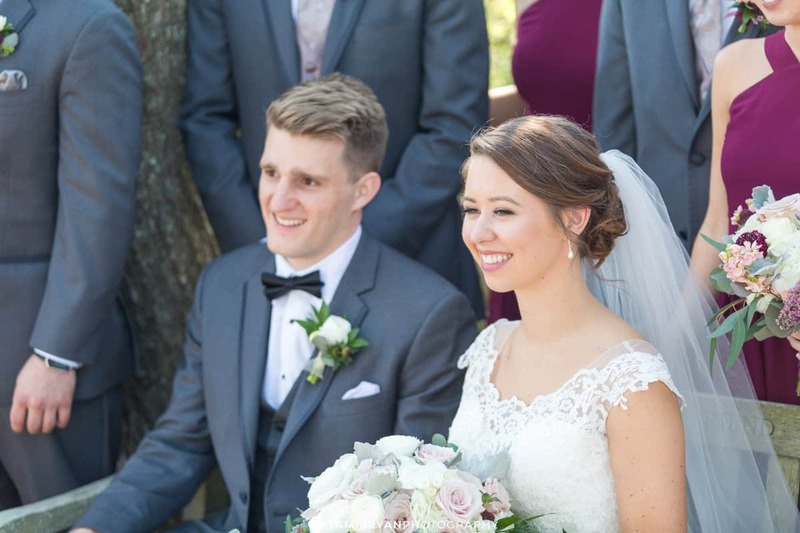 It was in Florida, in 2017, that Nick proposed to Julia – at the China Pavilion in Epcot! 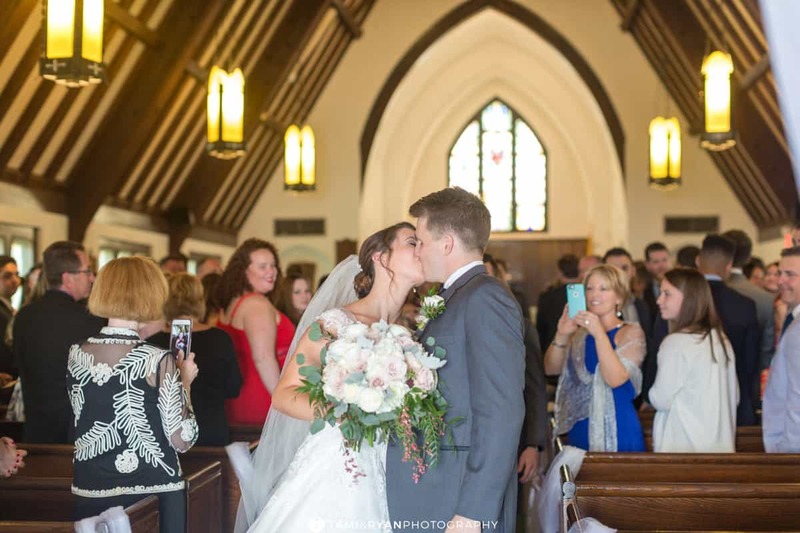 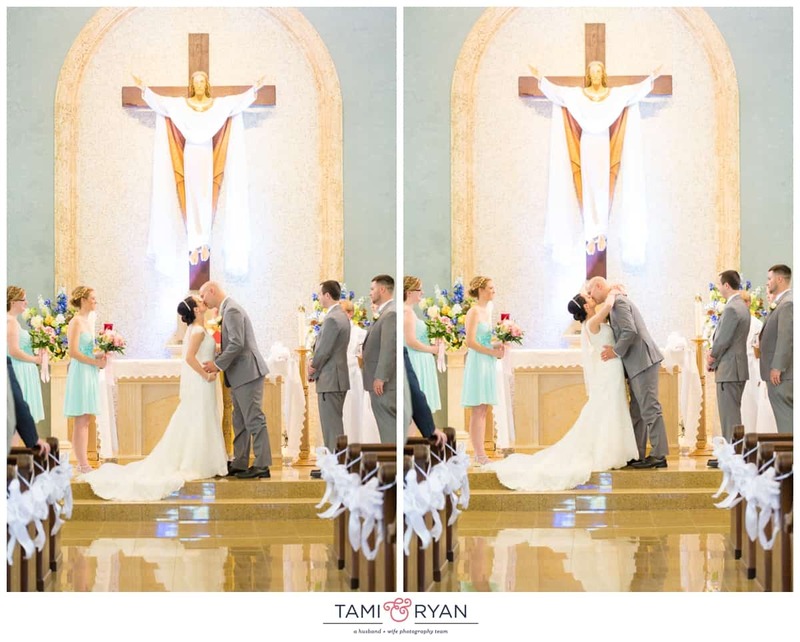 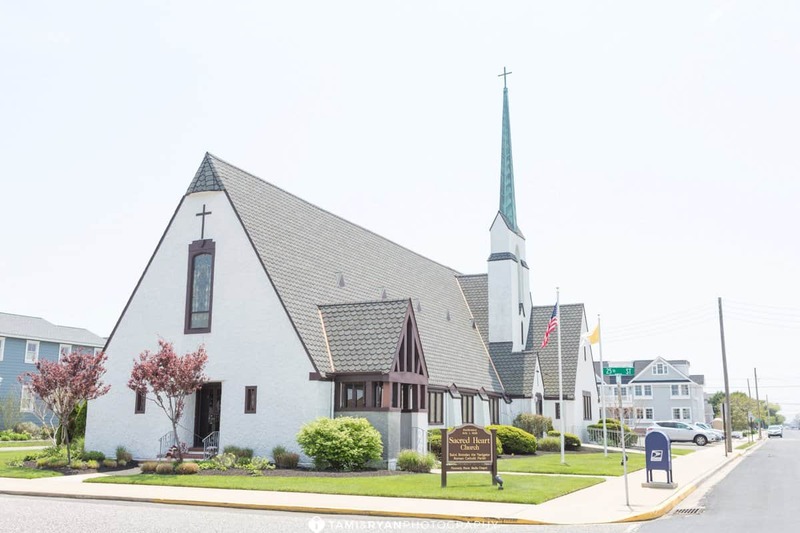 Julia and Nick said their vows at a beautiful jersey shore church that turns 90 years old this year! 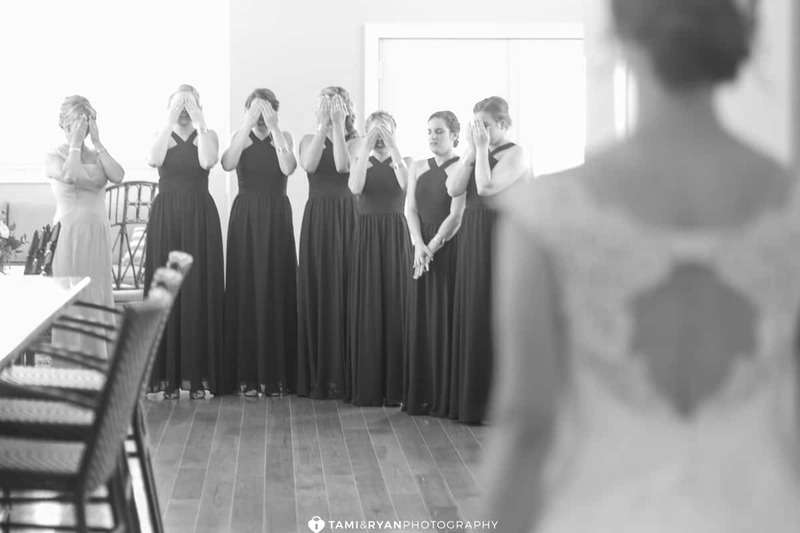 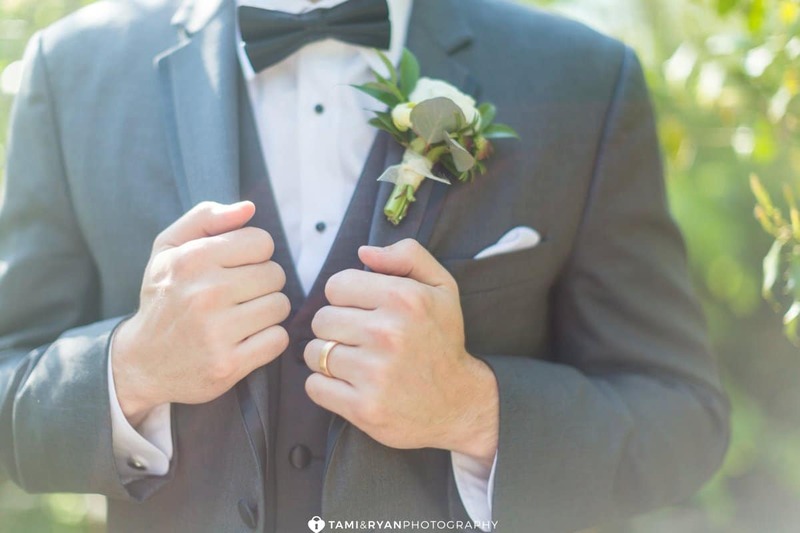 Every moment was planned perfectly, and they were pronounced husband and wife! 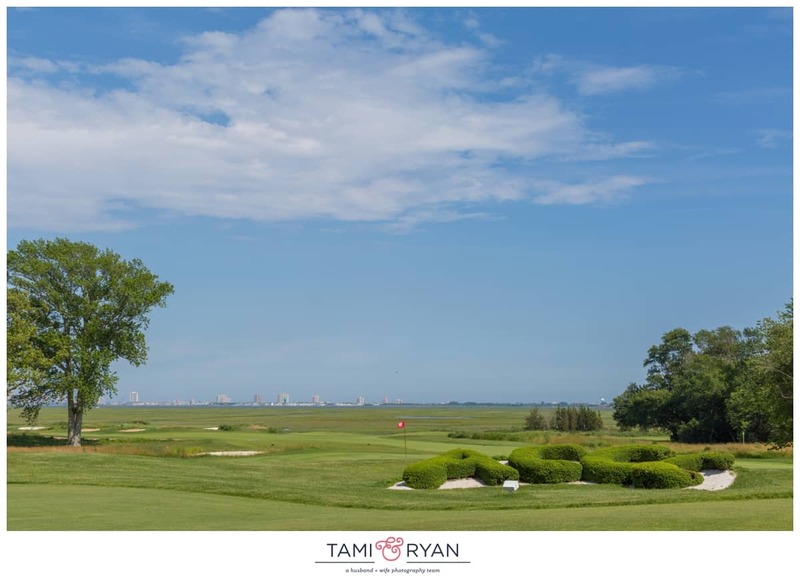 Stone Harbor Bird Sanctuary is a 21.5-acre bird sanctuary and nature preserve in Stone Harbor, Cape May County, New Jersey. 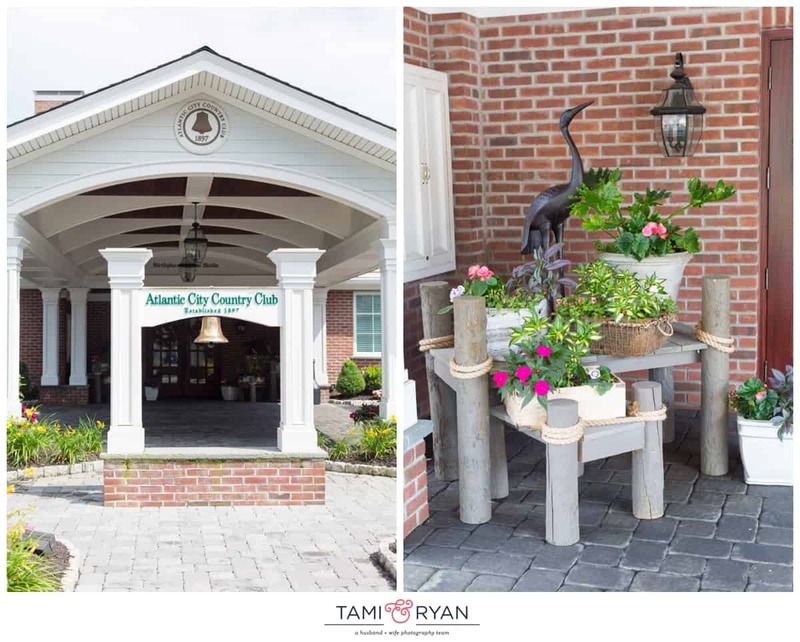 When heading down the shore, you’d never expect to have such a beautiful, serene place right on the middle of the island! 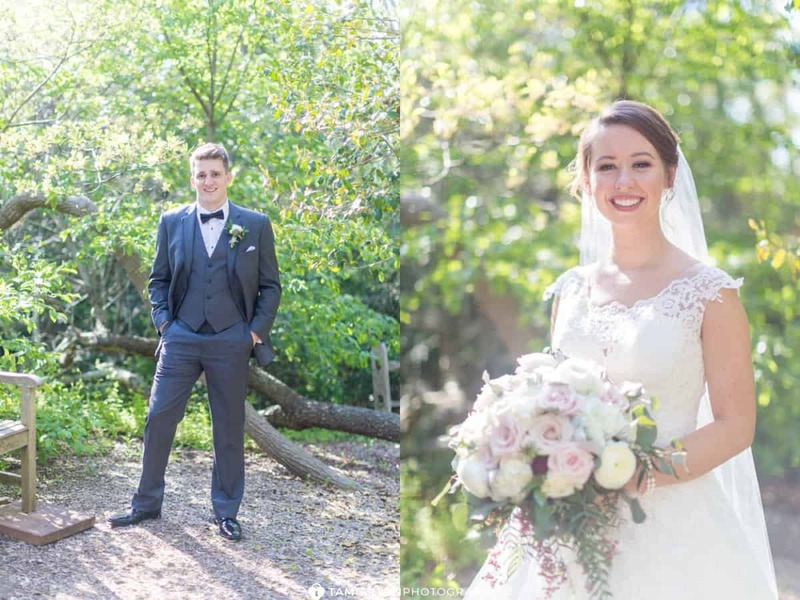 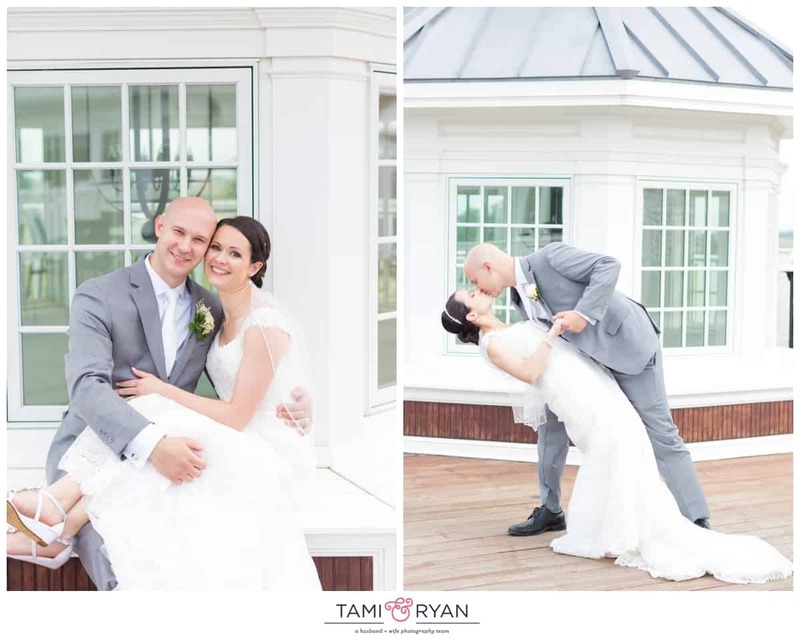 We had a great time capturing the people that mean the most to Julia and Nick in this beautiful location! 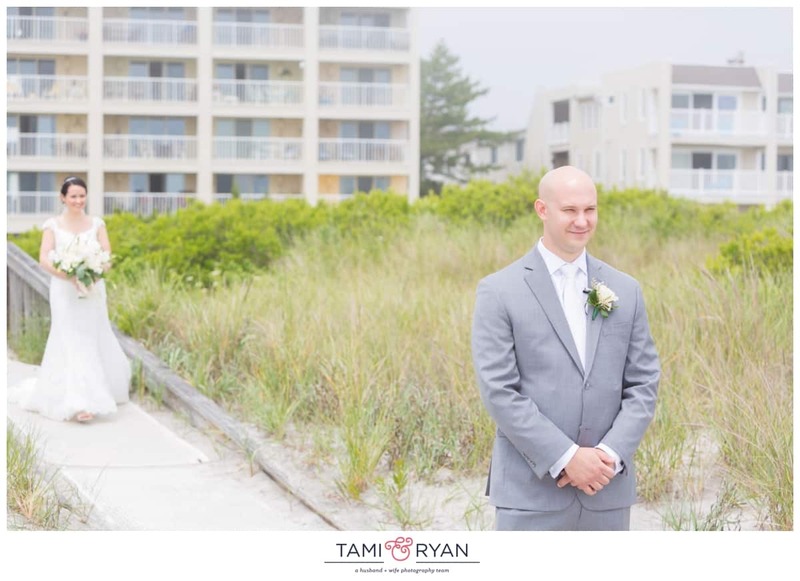 Although, Julia and Nick were getting married down at the Jersey Shore, they didn’t want the typical beach photos. 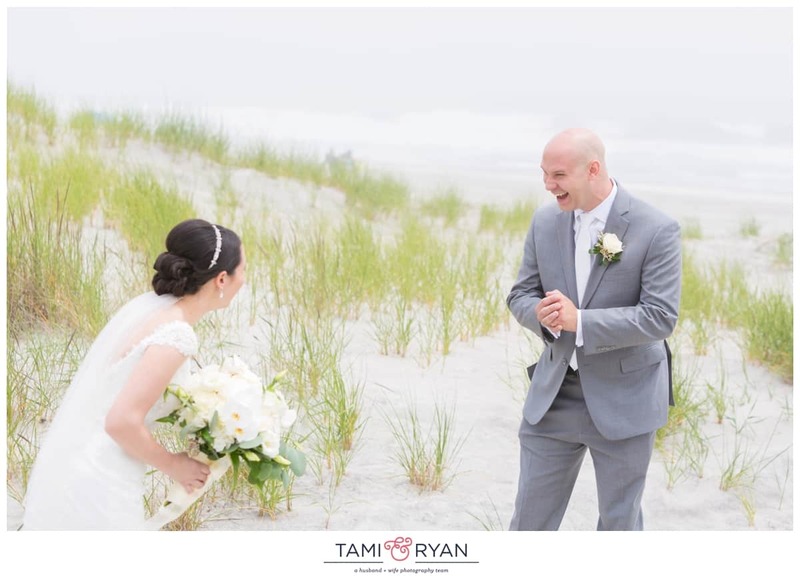 So, when I recommended the Stone Harbor Bird Sanctuary, they were so excited! 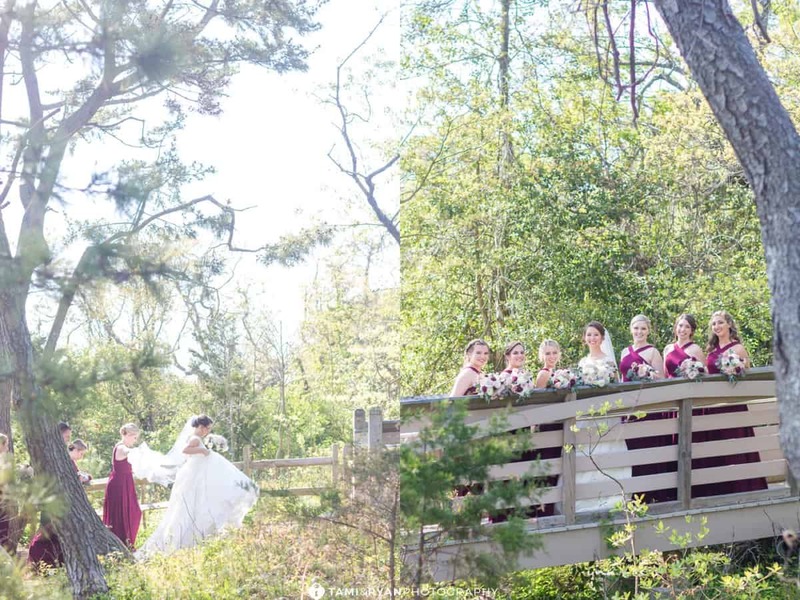 We walked through the Egret Espy Path, through whispering pine trees, over a beautiful footbridge, and through the intricate, artistic remnants of white spruce. 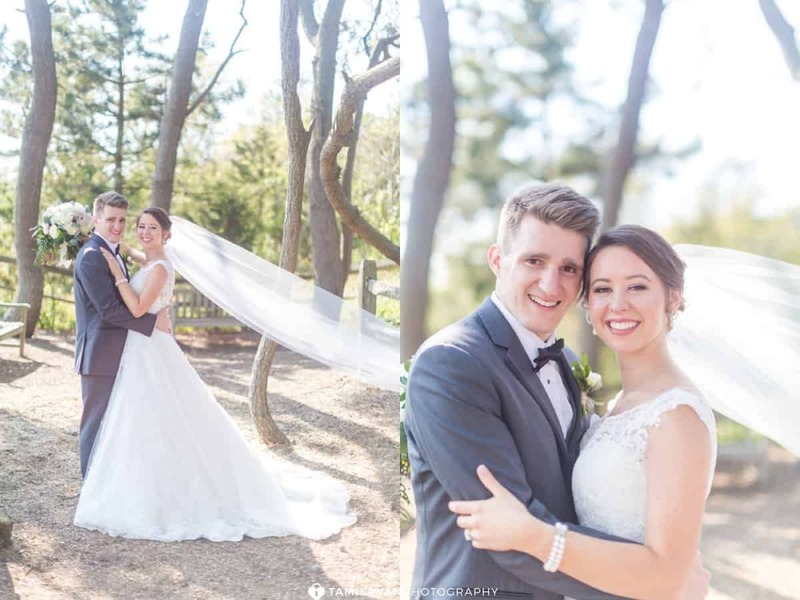 Julia and Nick were such a joy to capture, and truly made our job easy! 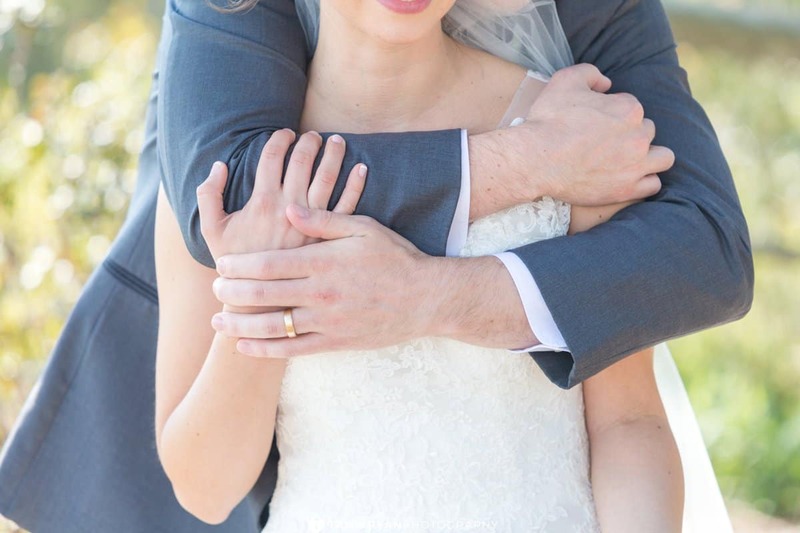 There is so much love between these two, and it is undeniable! 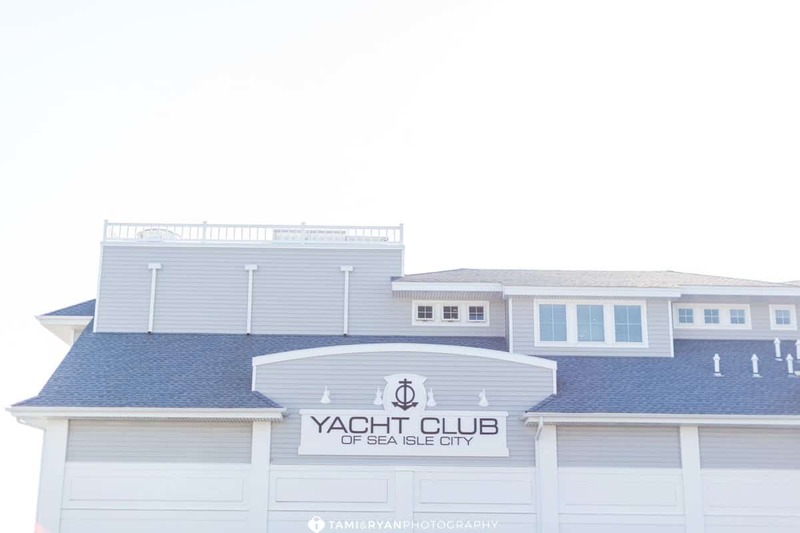 The Yacht Club of Sea Isle City is located in the Bay. 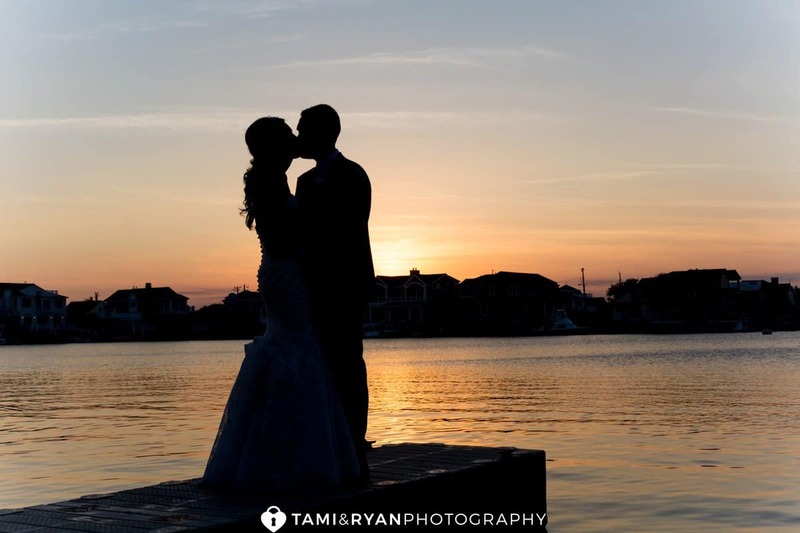 The building overlooks the water and has absolutely breathtaking views of sunset! 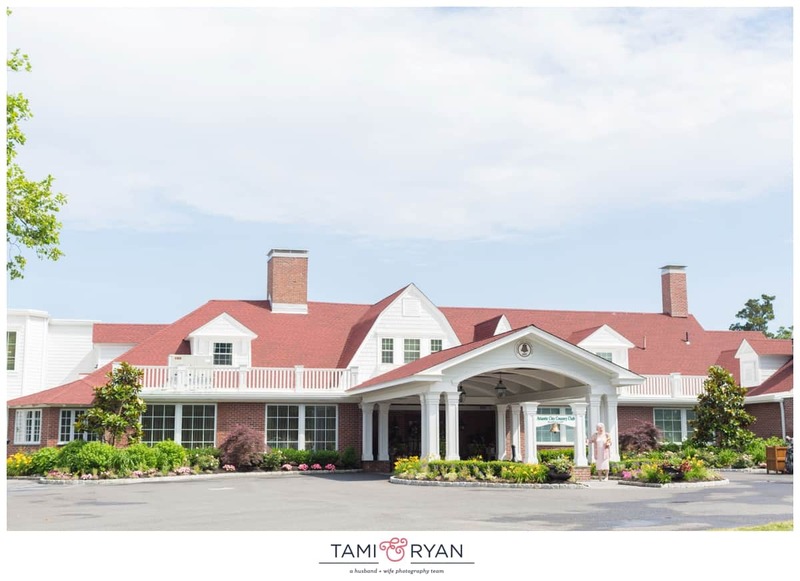 From the staff to the food, the YCSIC does not disappoint! 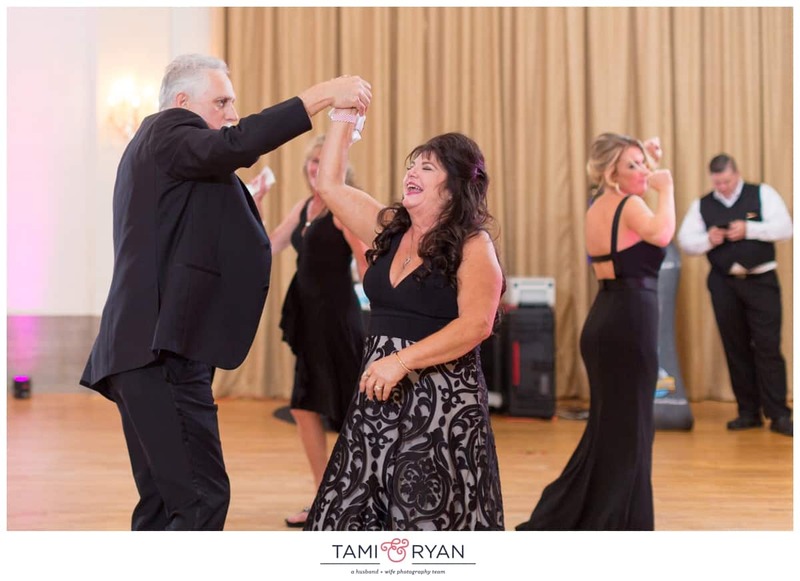 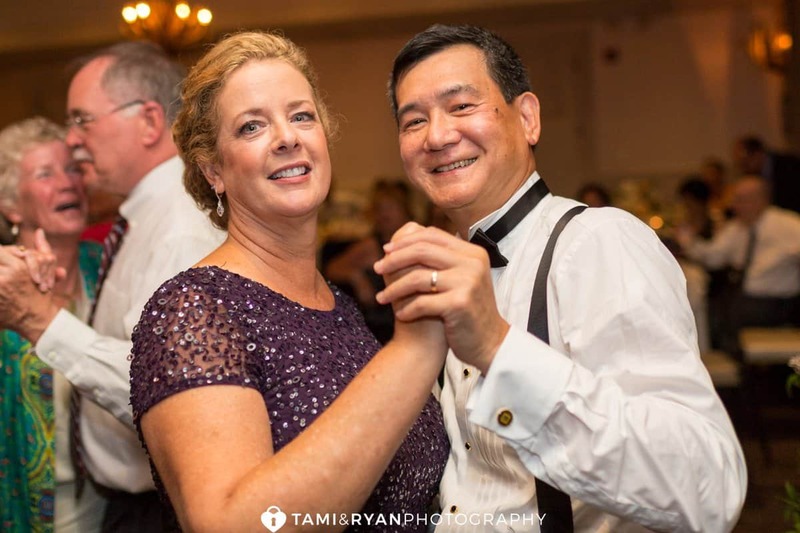 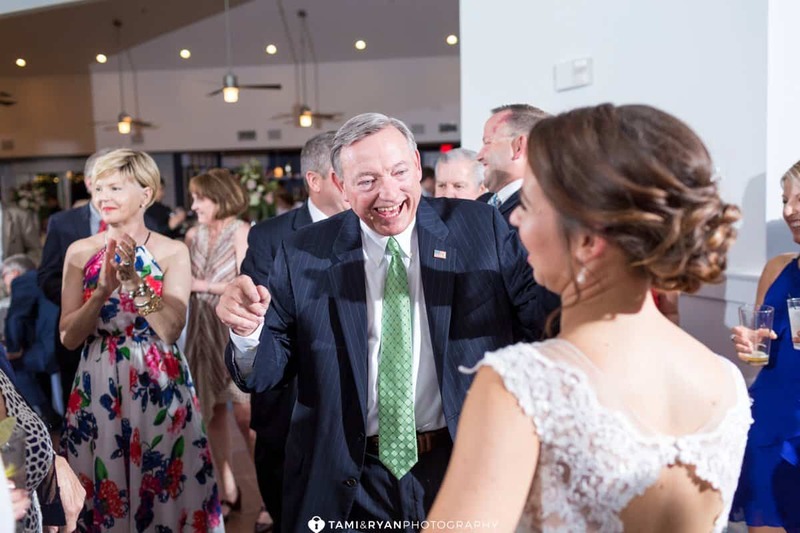 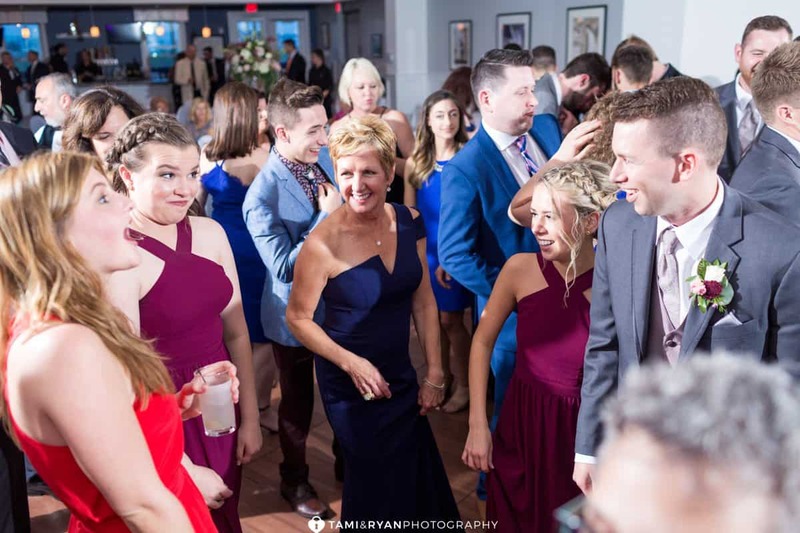 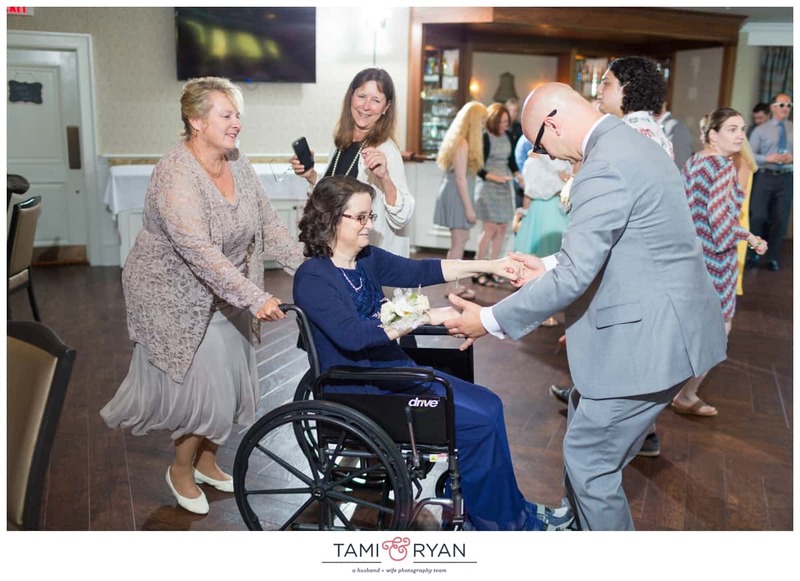 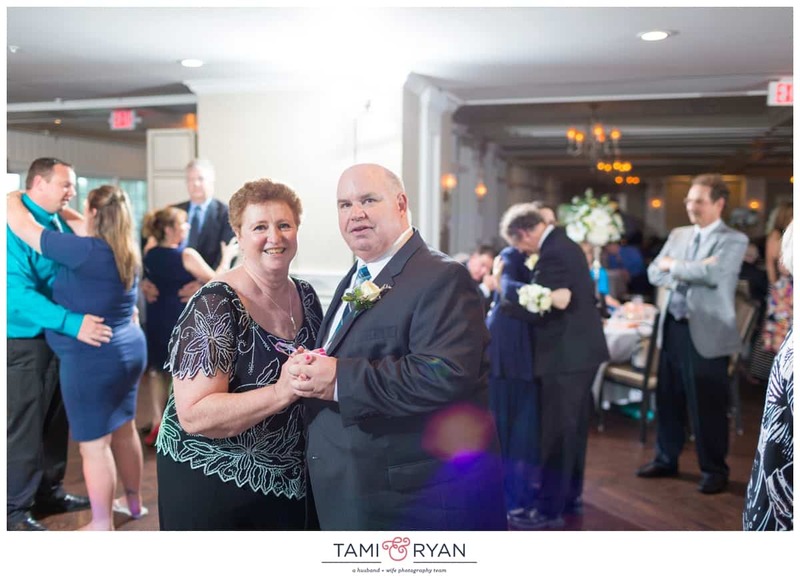 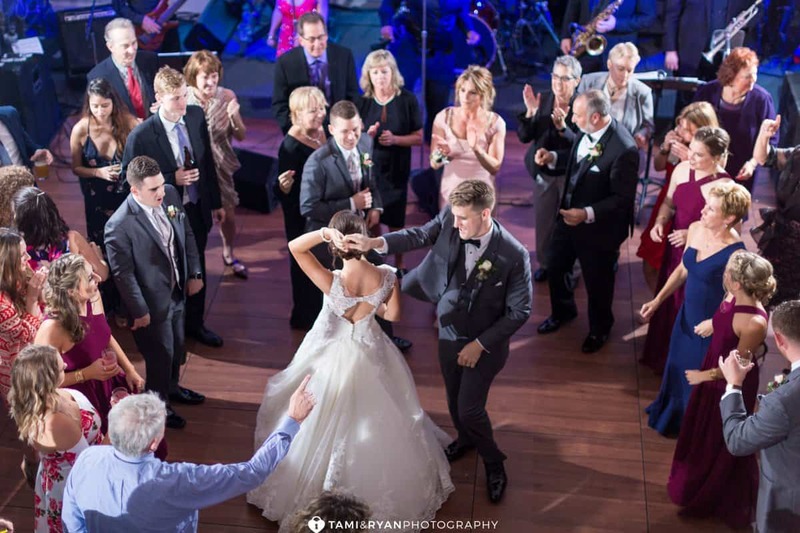 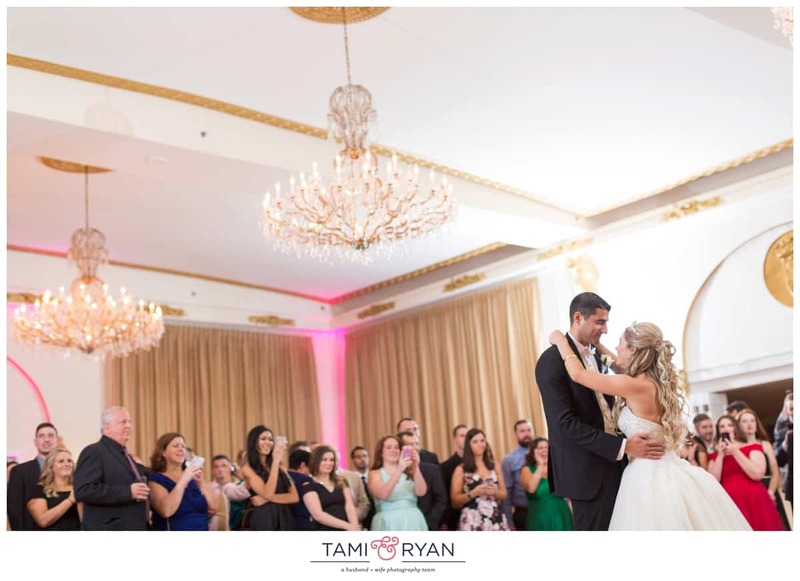 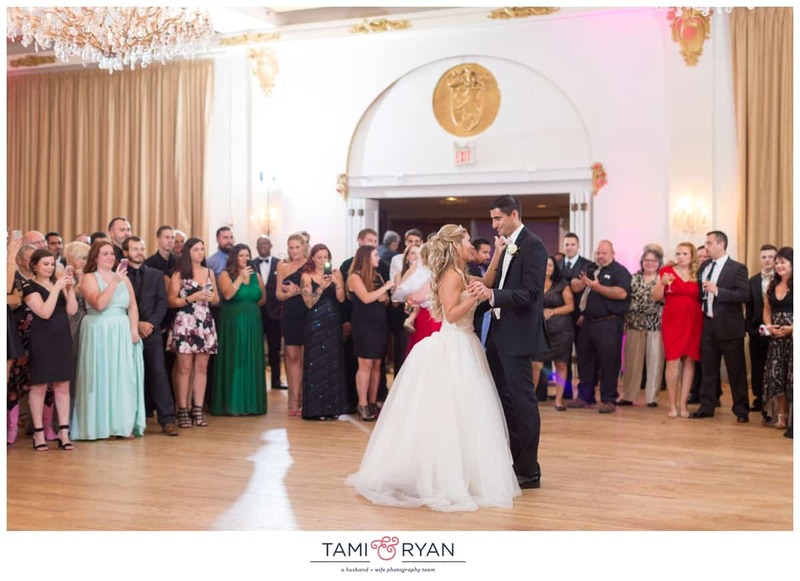 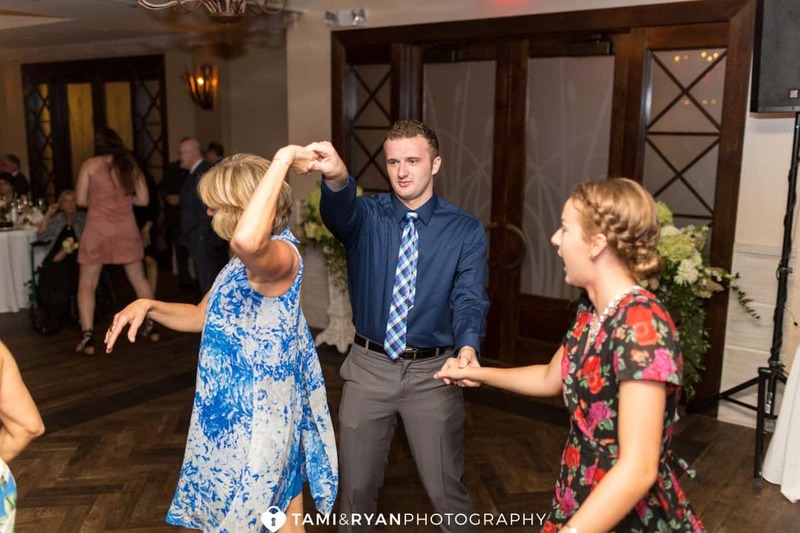 Julia and Nick chose to have the Big City Band Philadelphia as their entertainment for the evening, and gosh, it was a great choice! 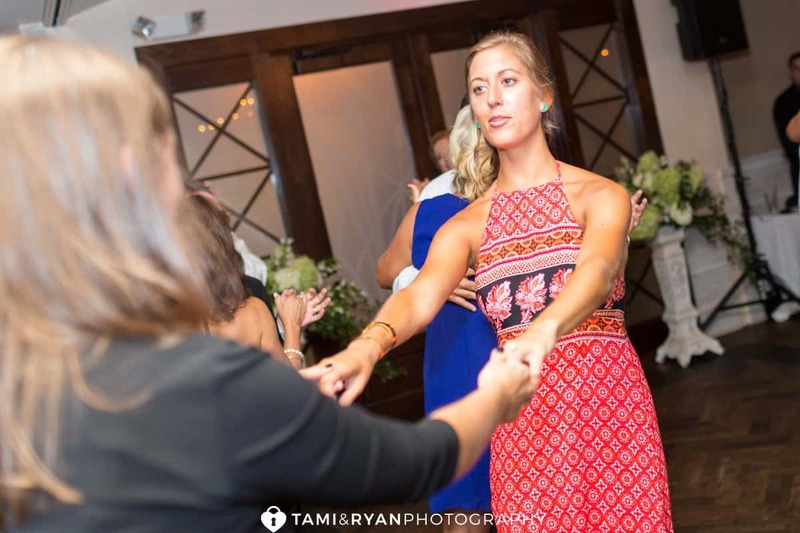 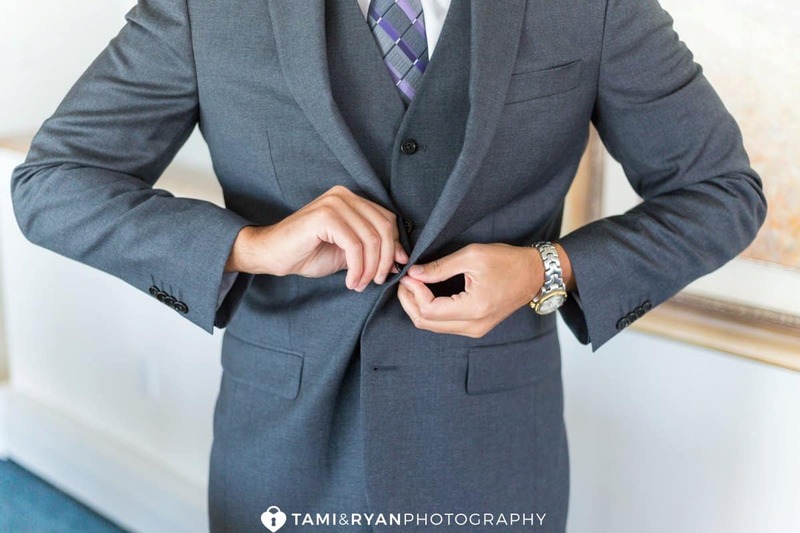 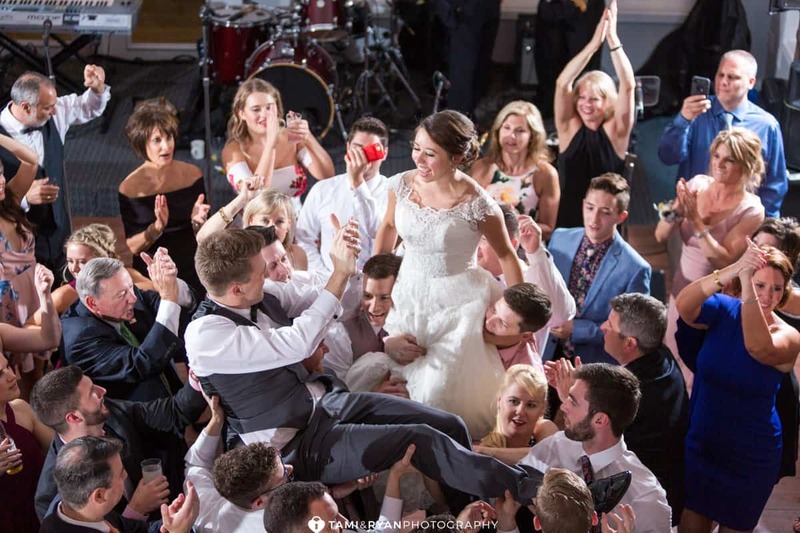 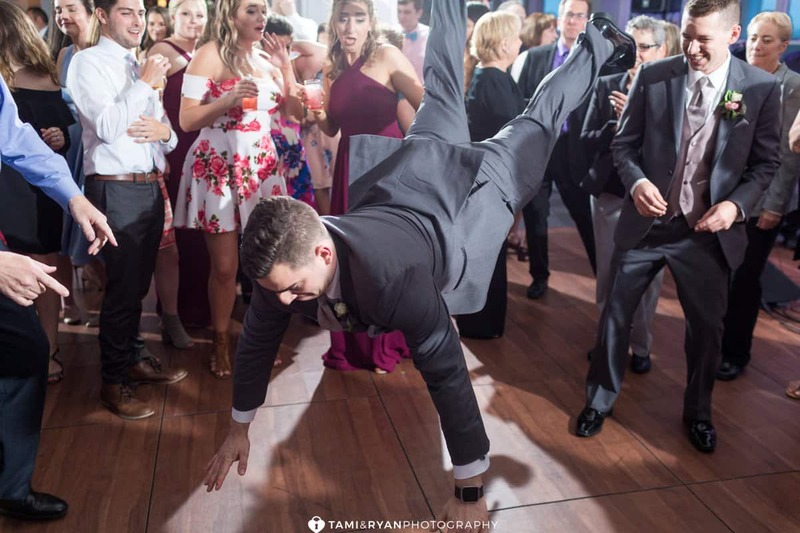 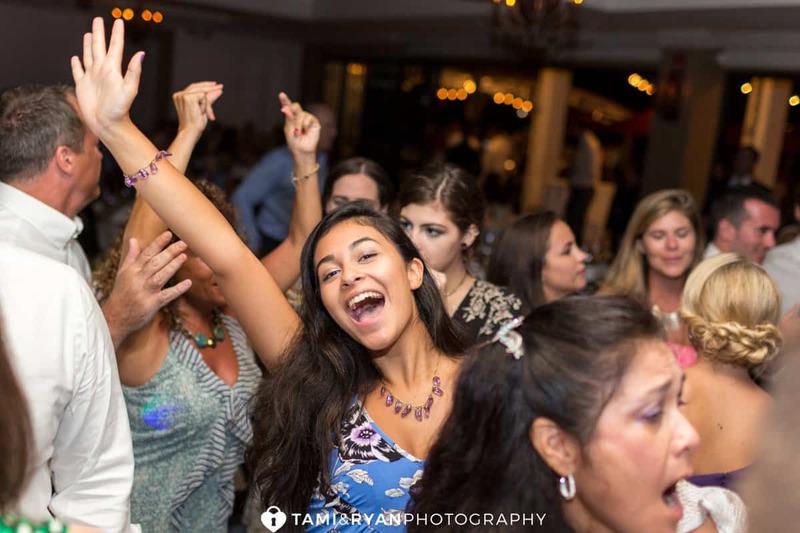 We always LOVE bands at weddings, and they were phenomenal! 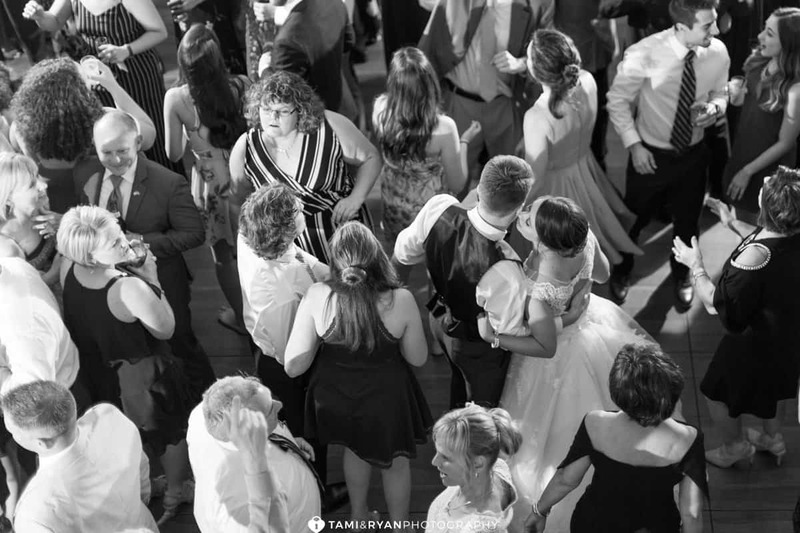 I think the dance floor was full all night! 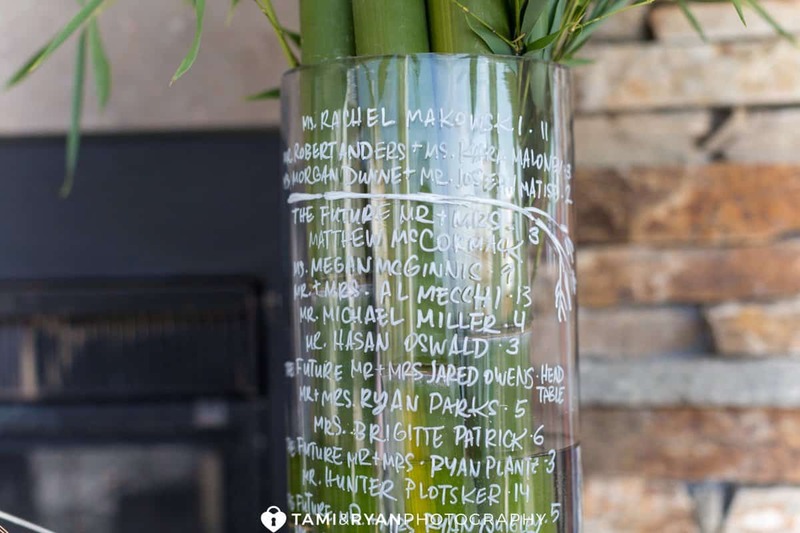 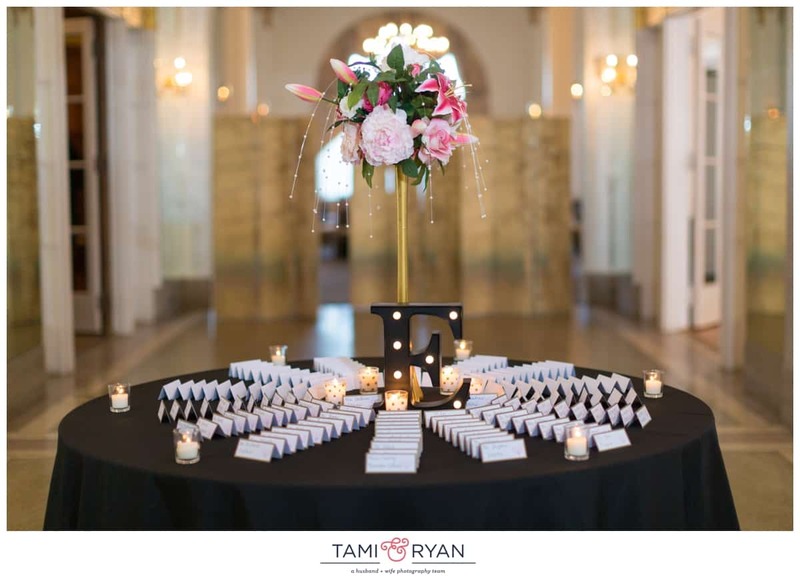 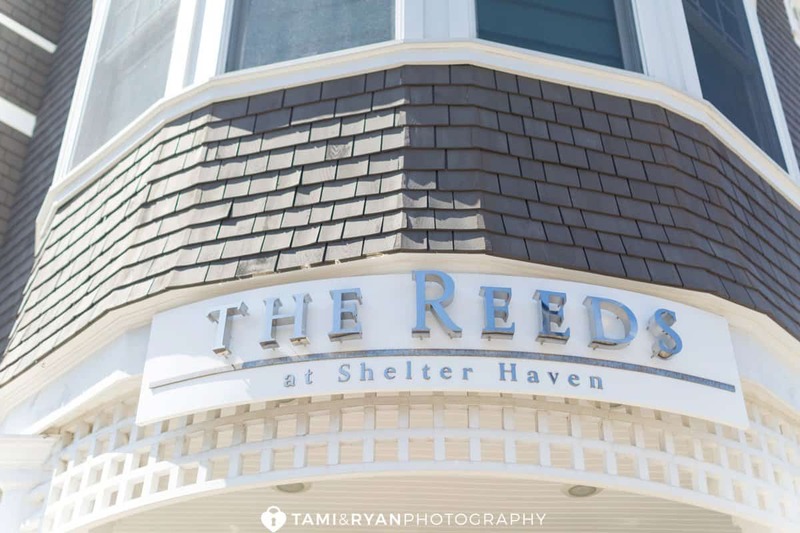 Kensi & Peter planned a romantic Reeds at Shelter Haven Wedding. 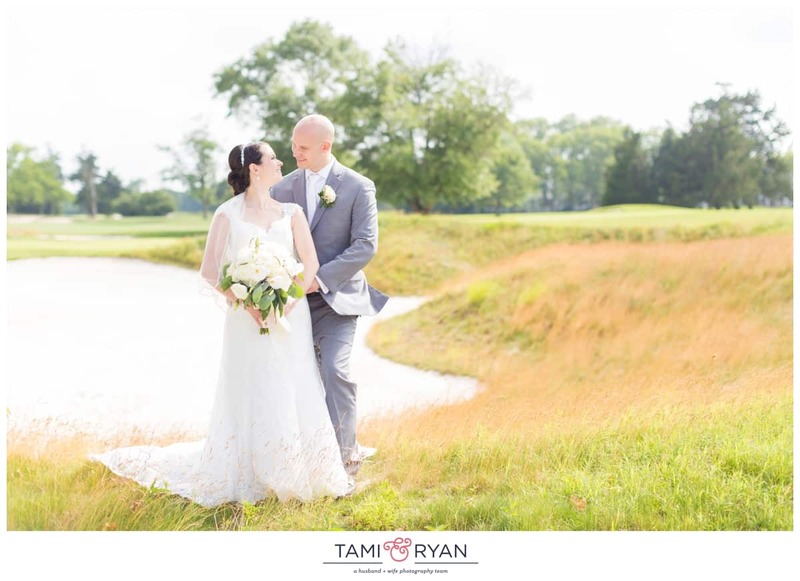 It was a beautiful, warm September day with just a bit of breeze in the air to keep it cool. 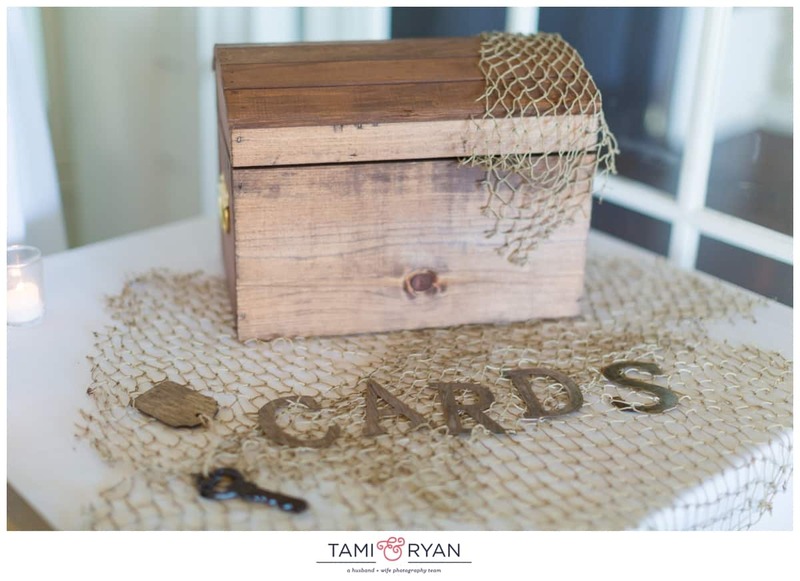 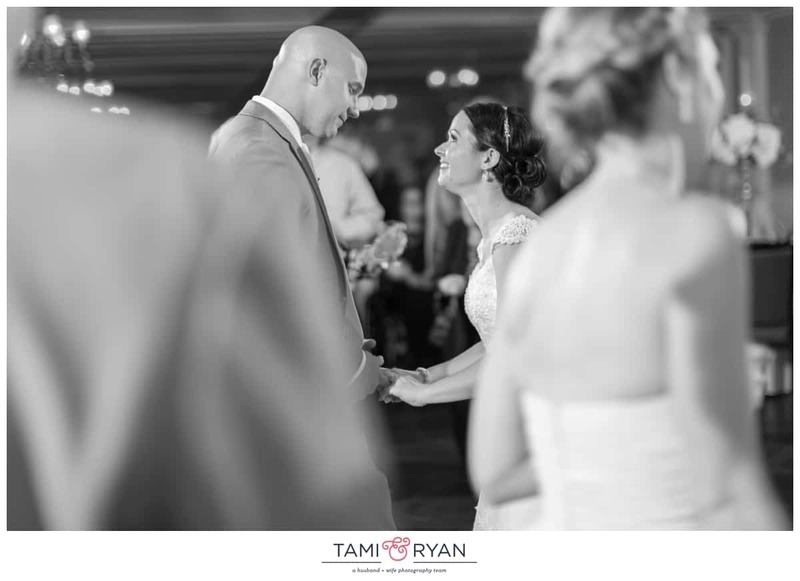 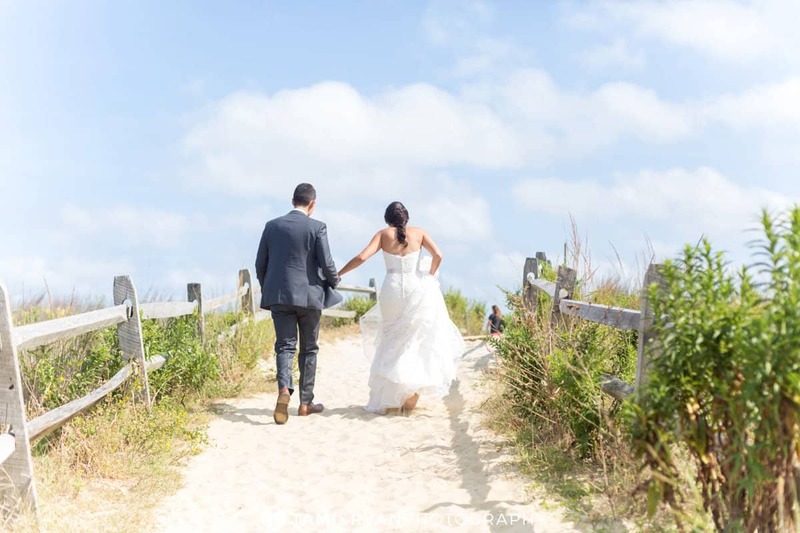 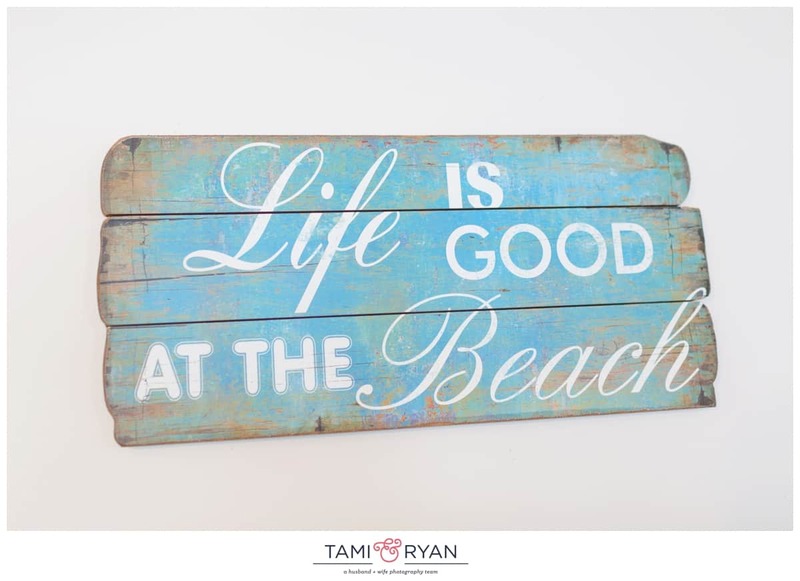 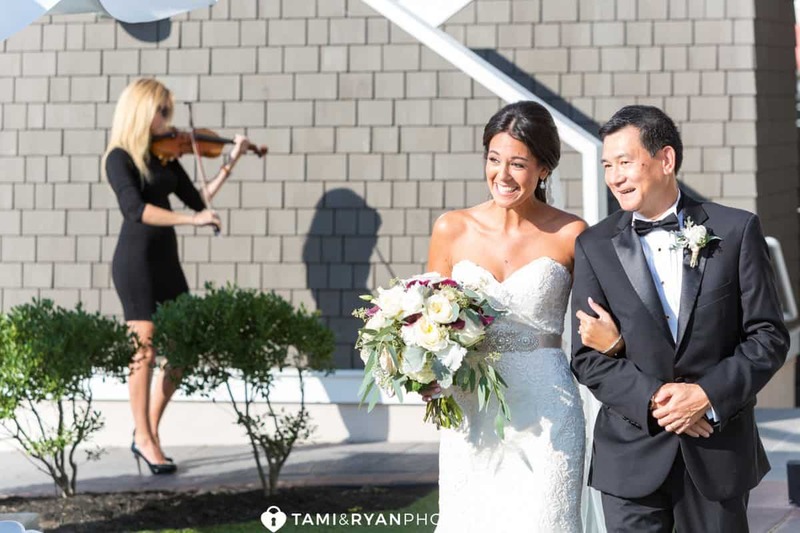 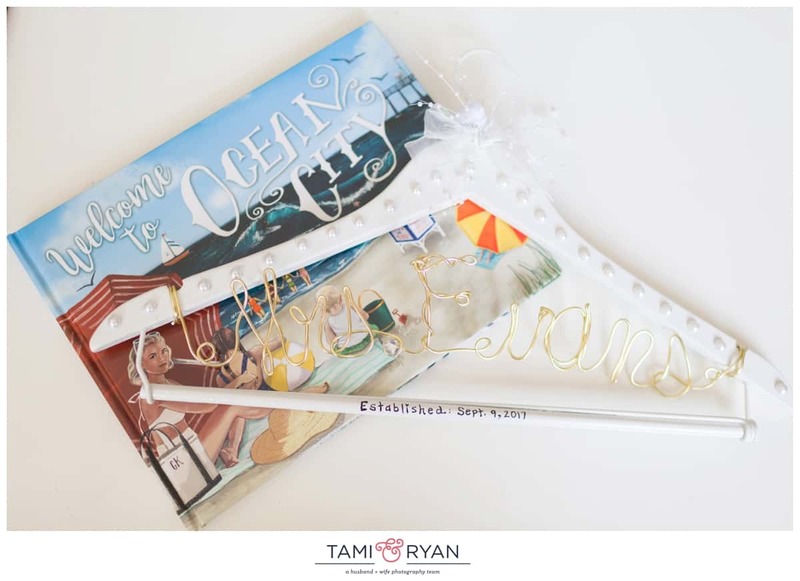 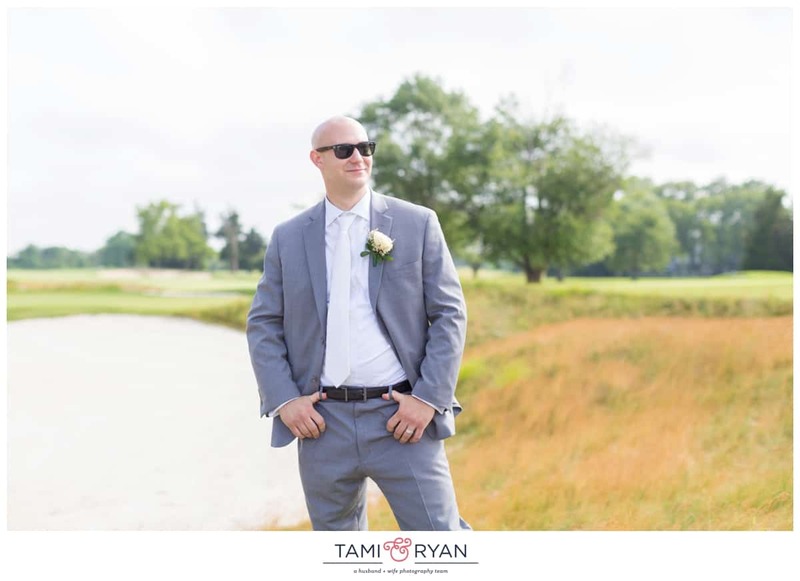 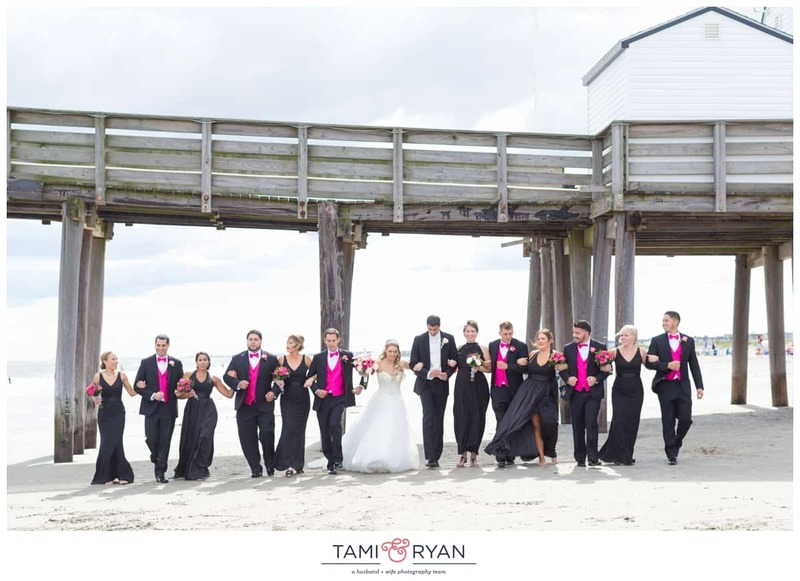 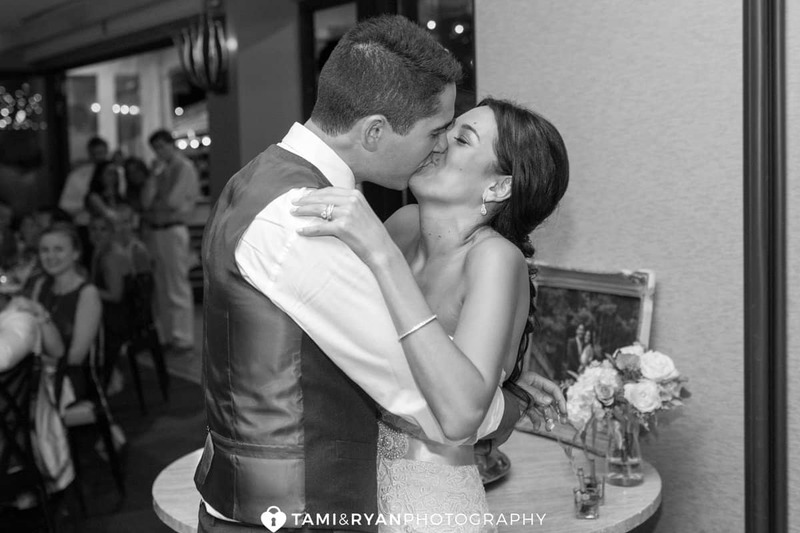 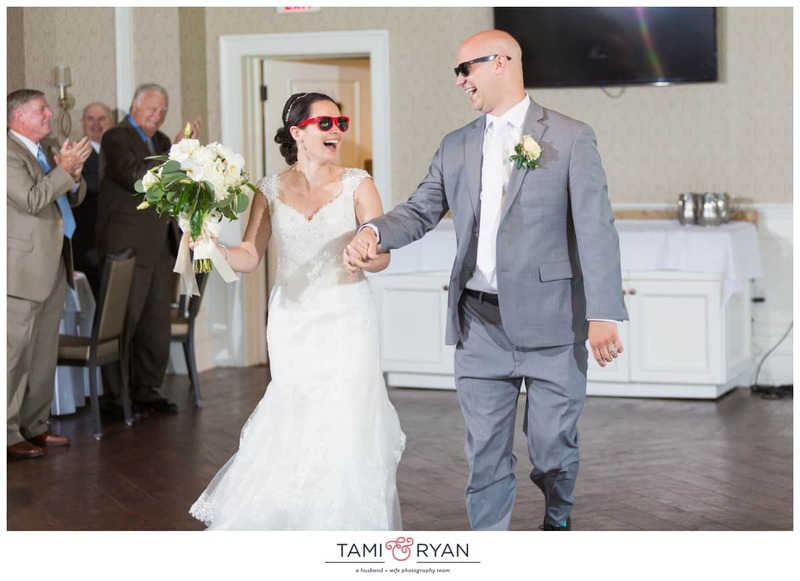 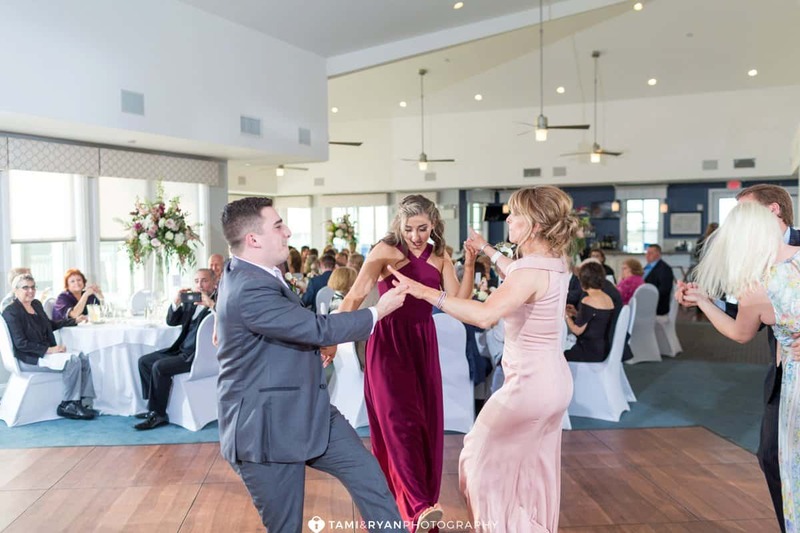 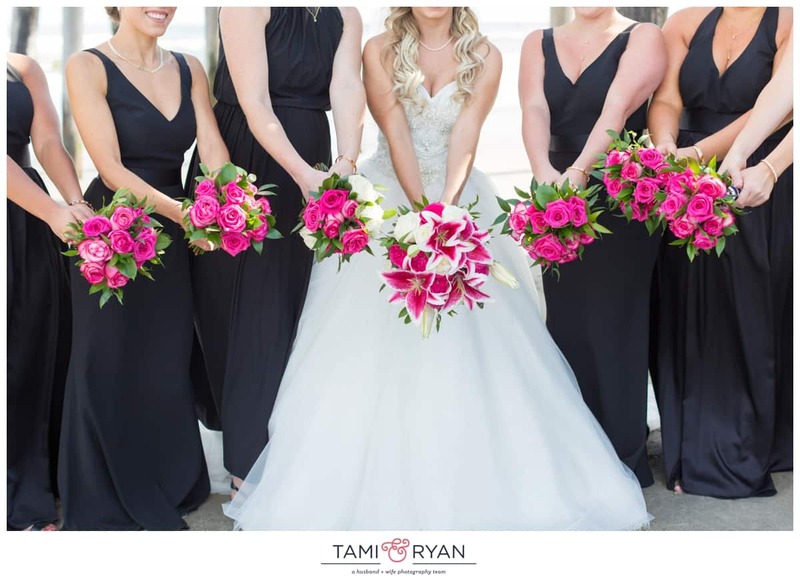 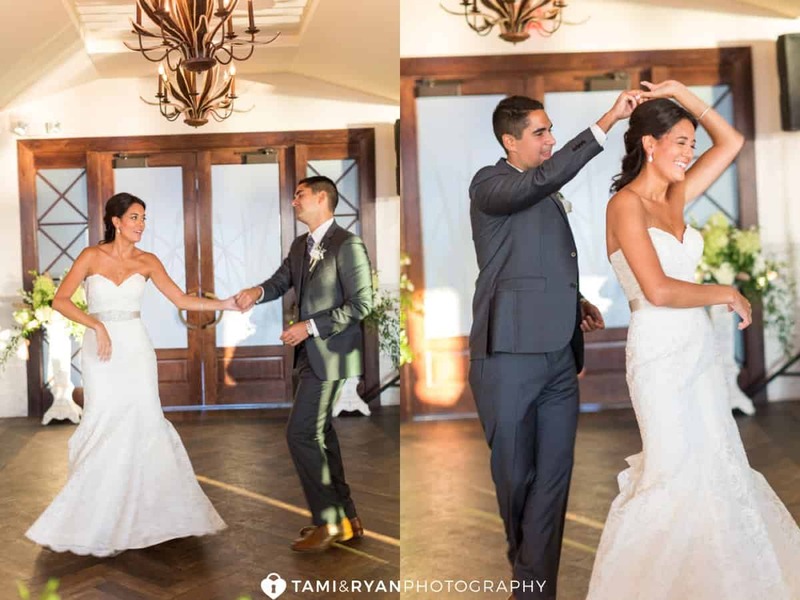 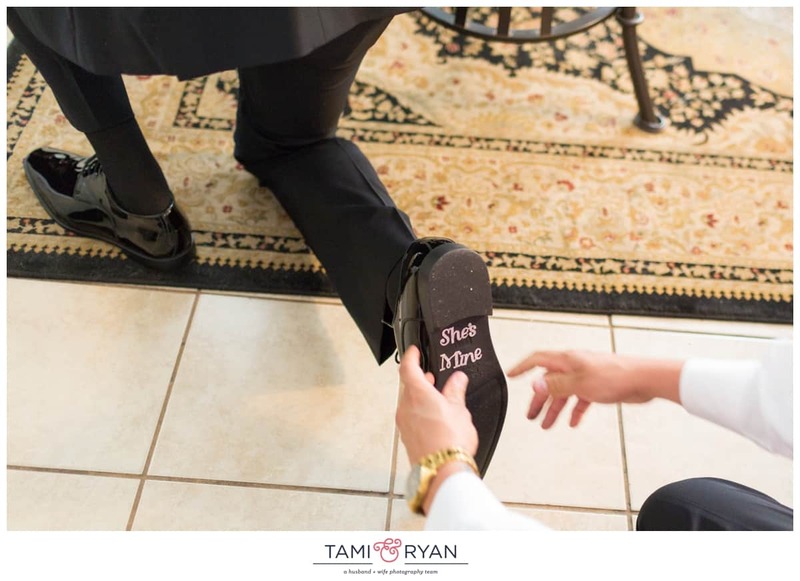 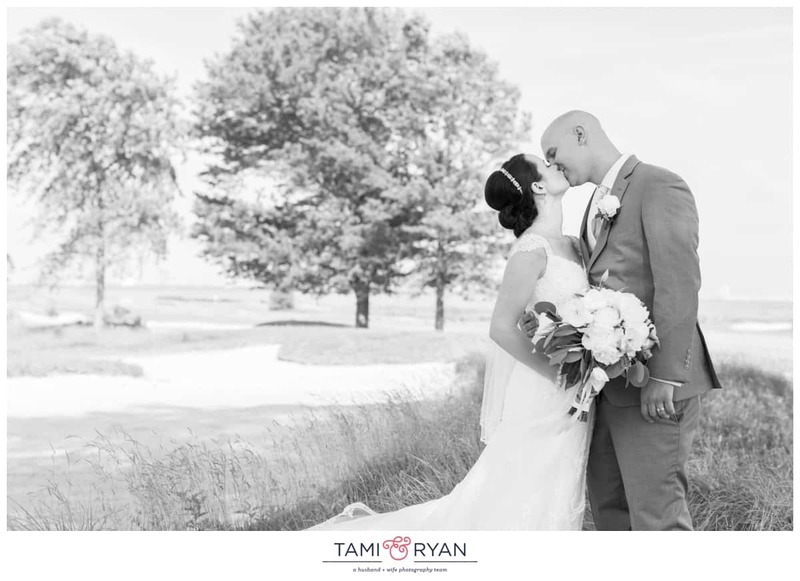 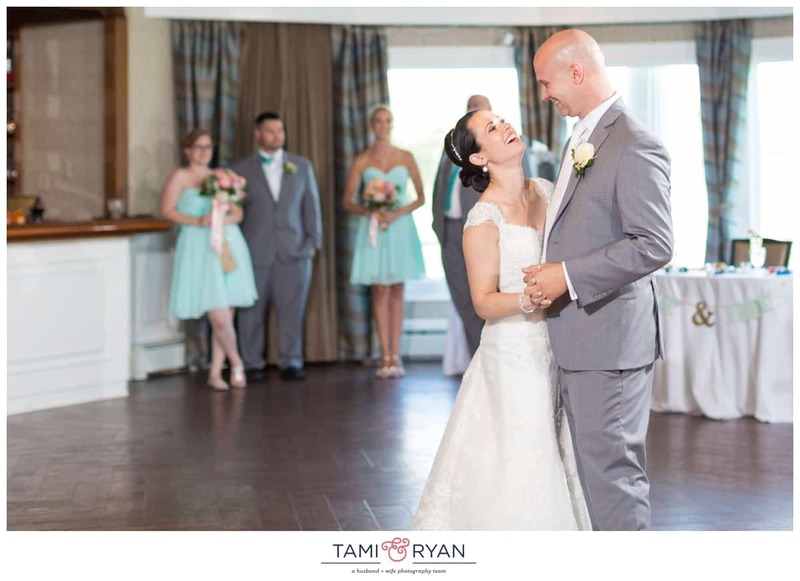 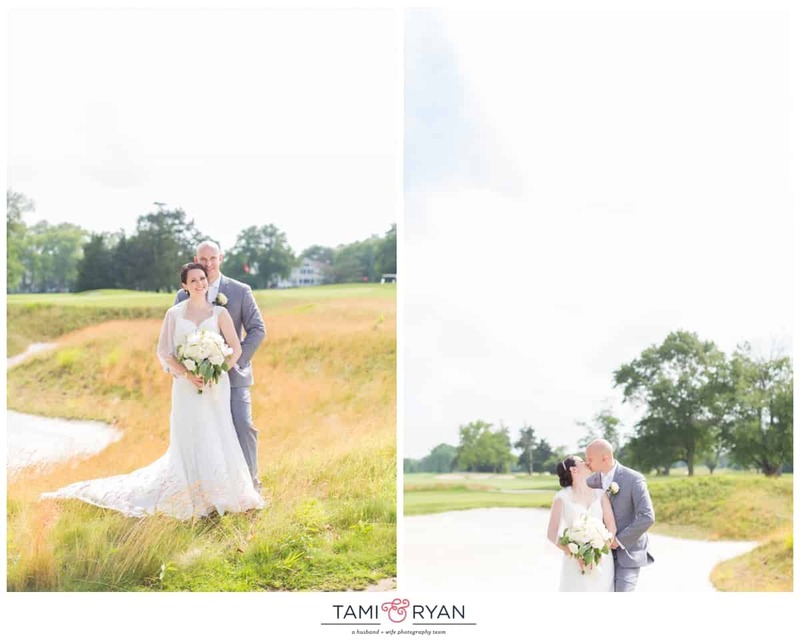 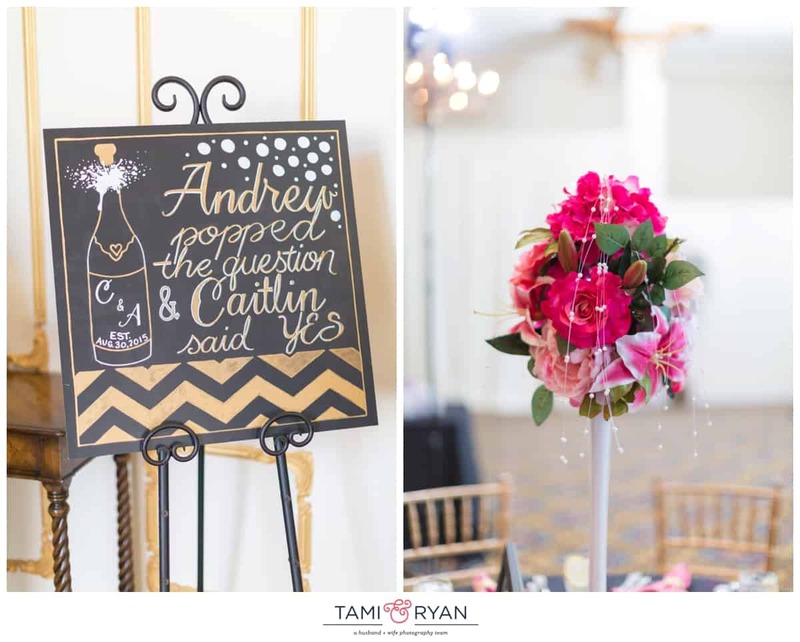 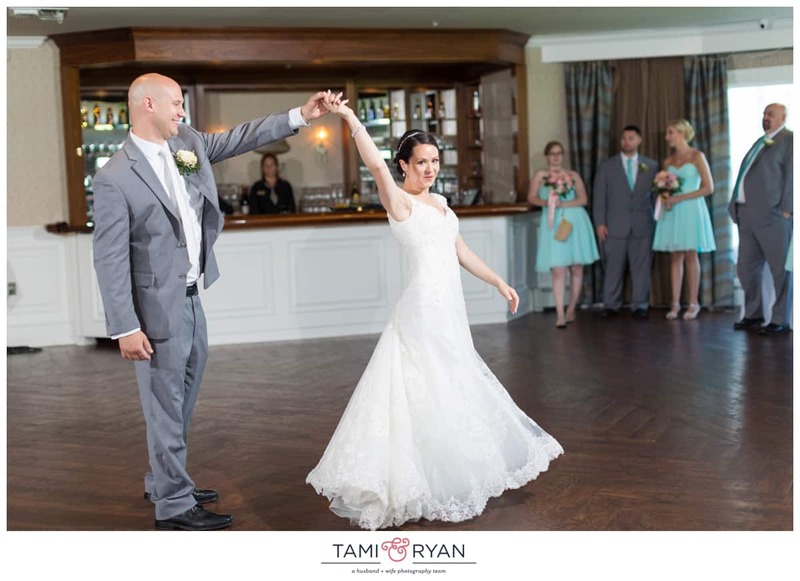 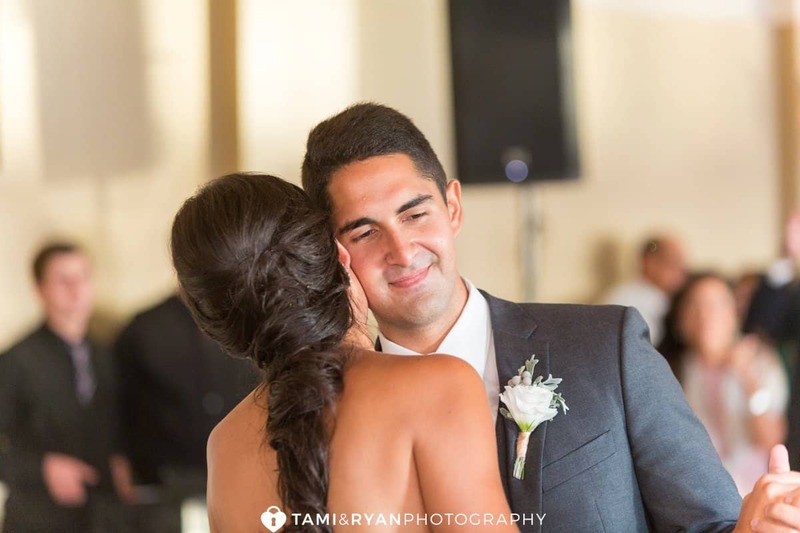 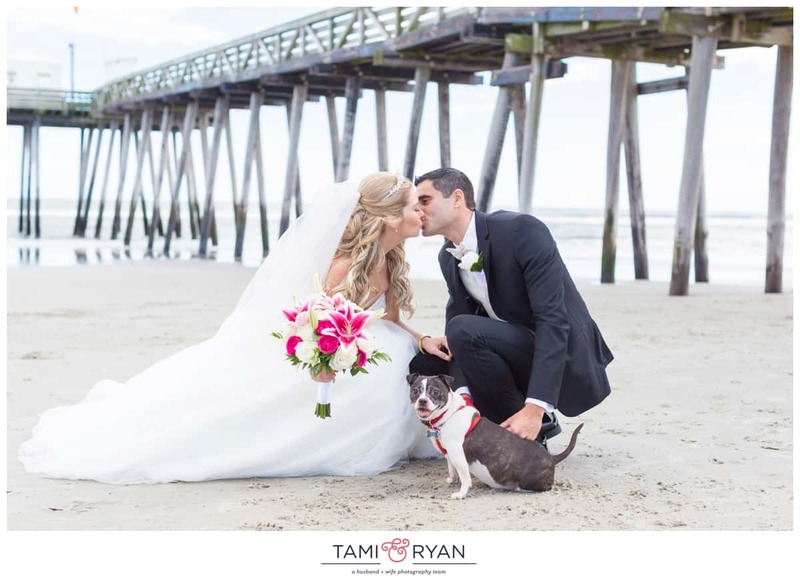 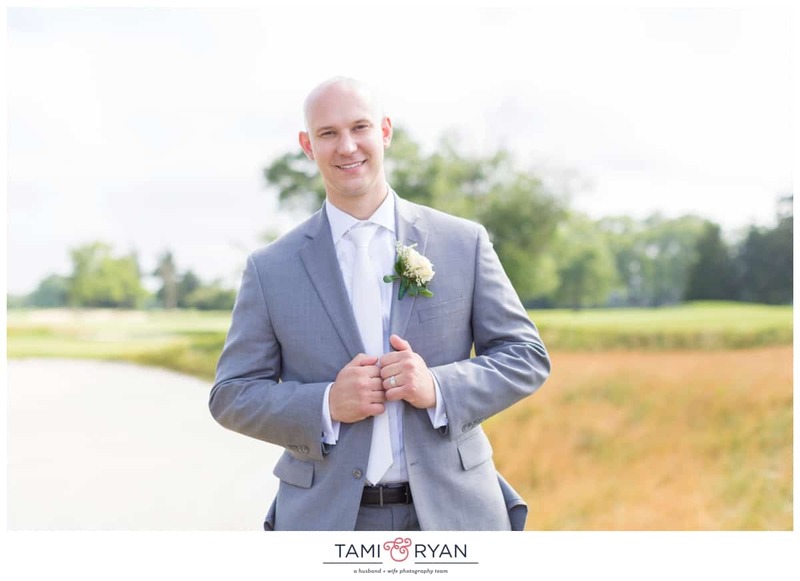 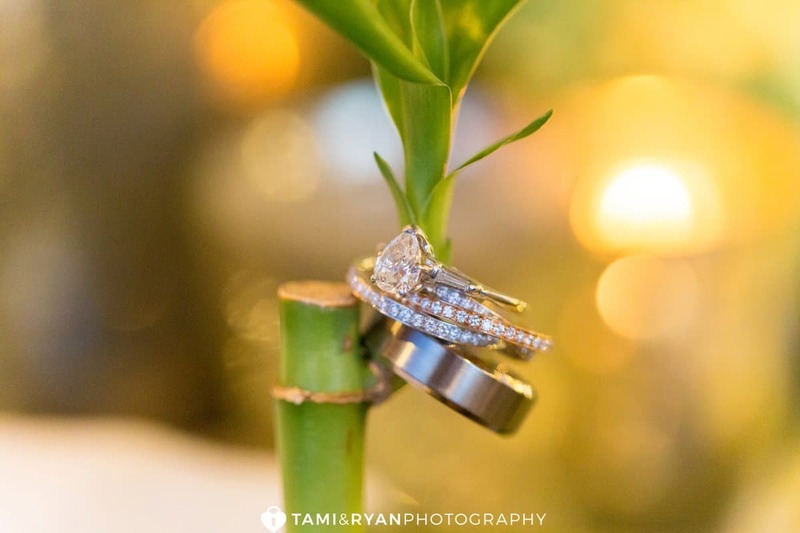 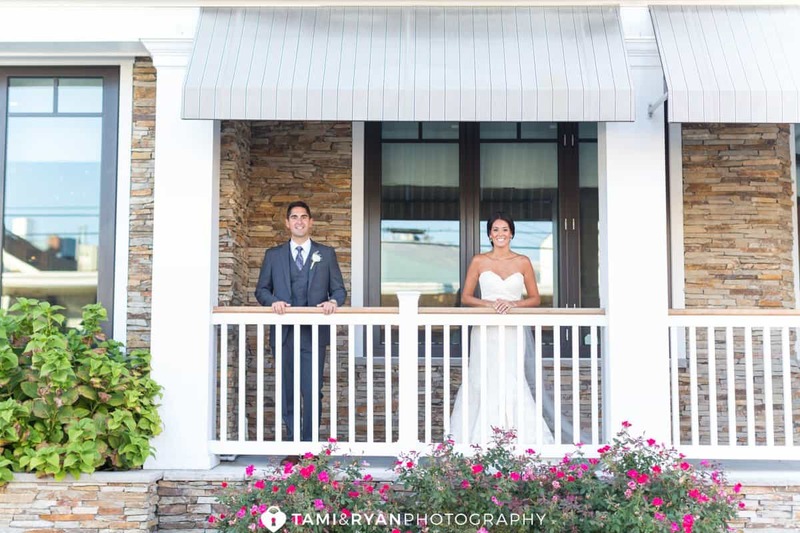 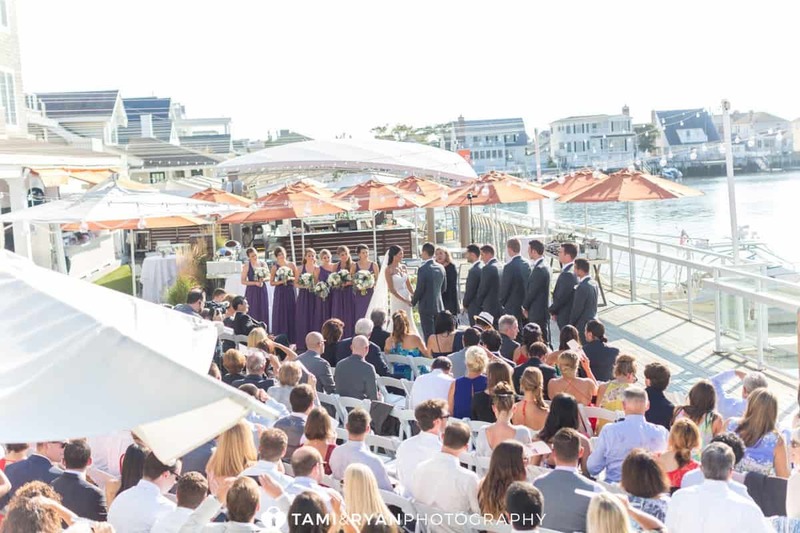 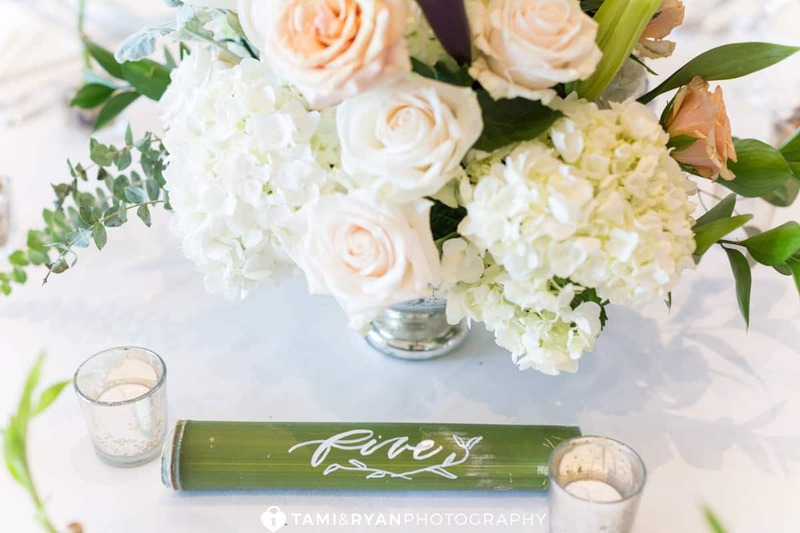 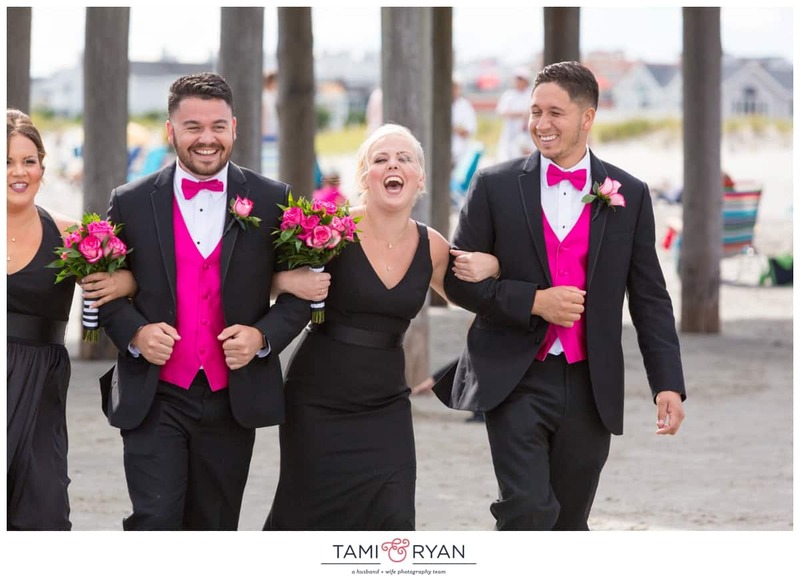 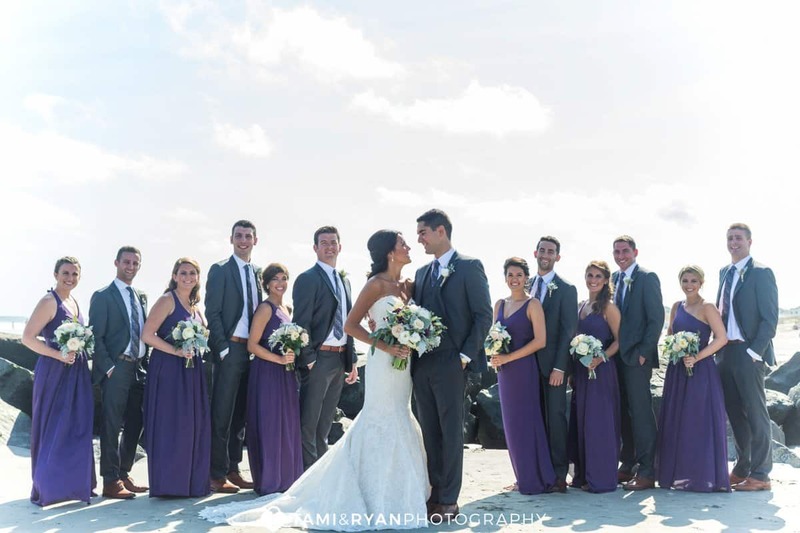 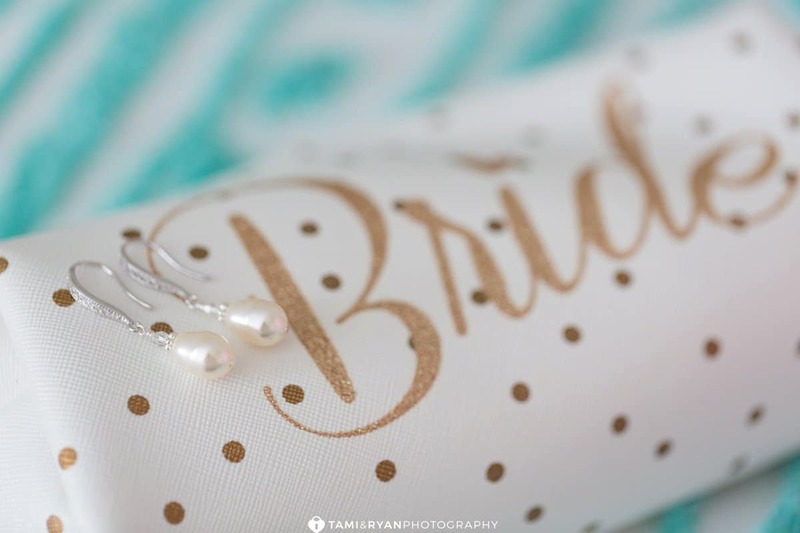 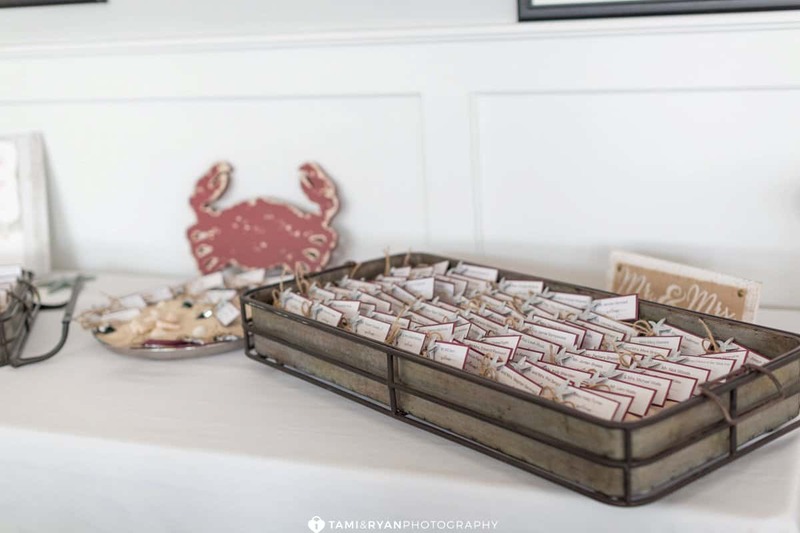 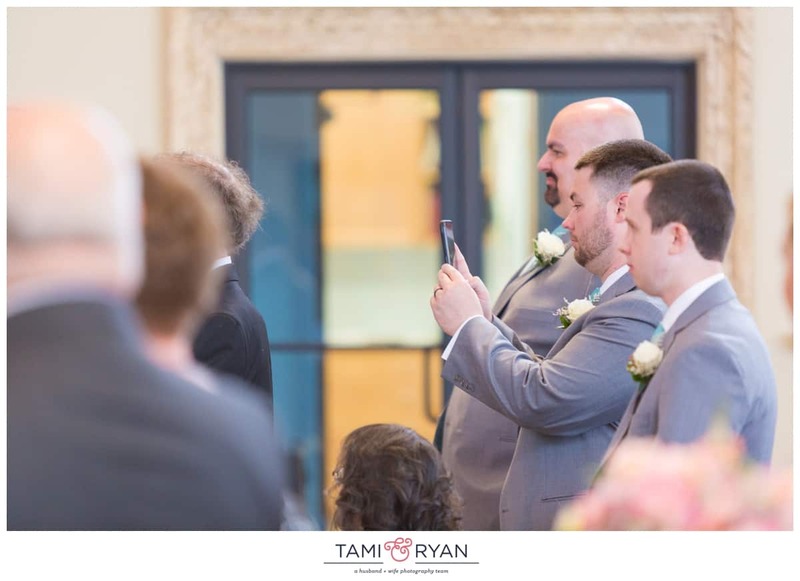 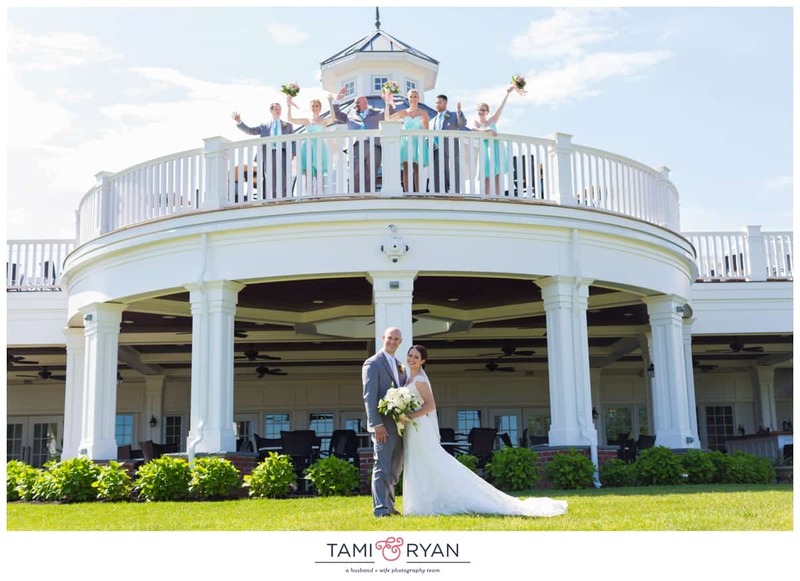 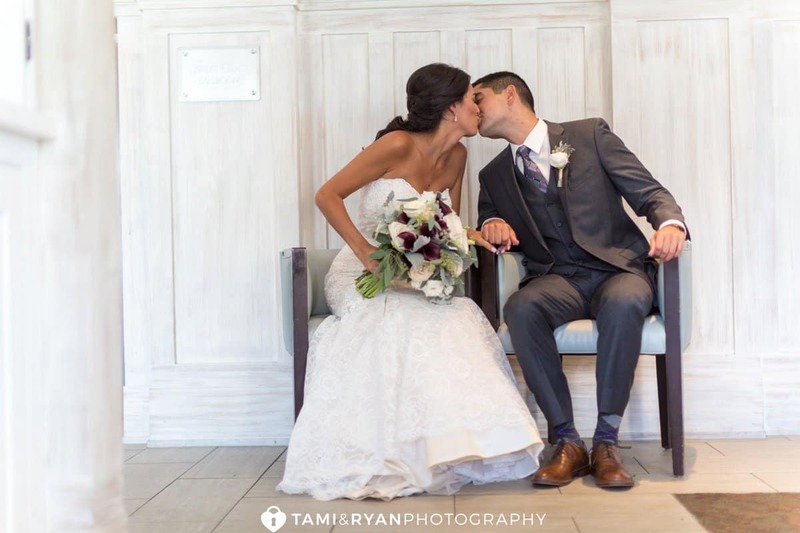 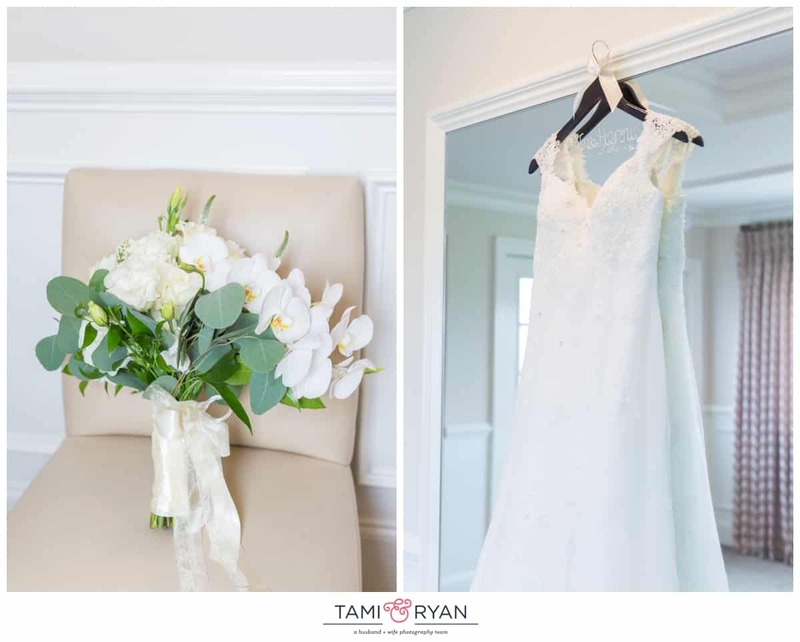 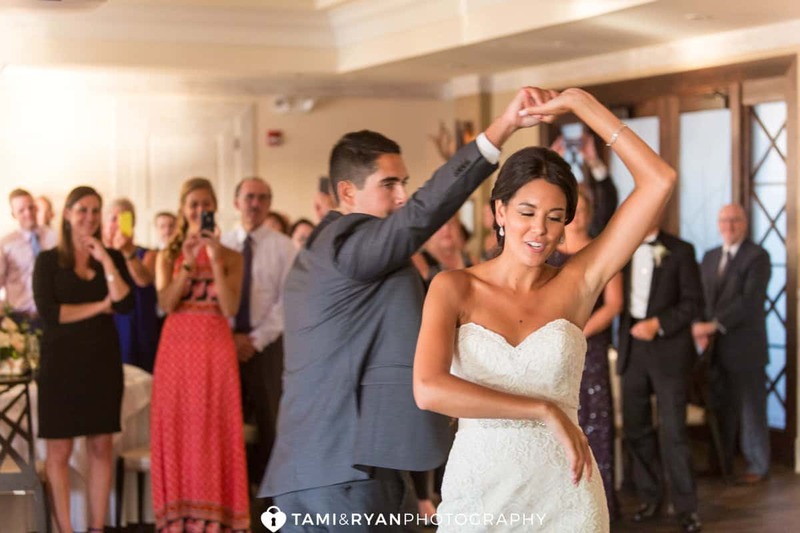 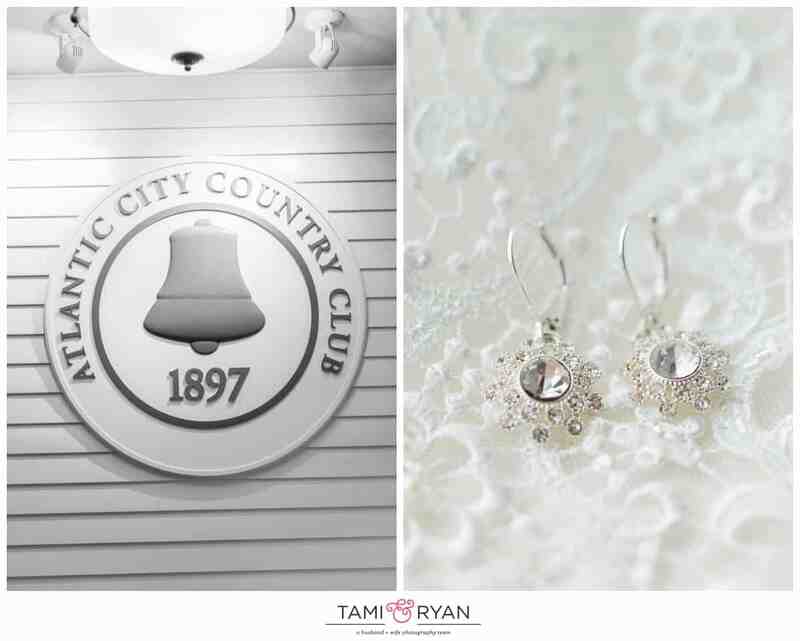 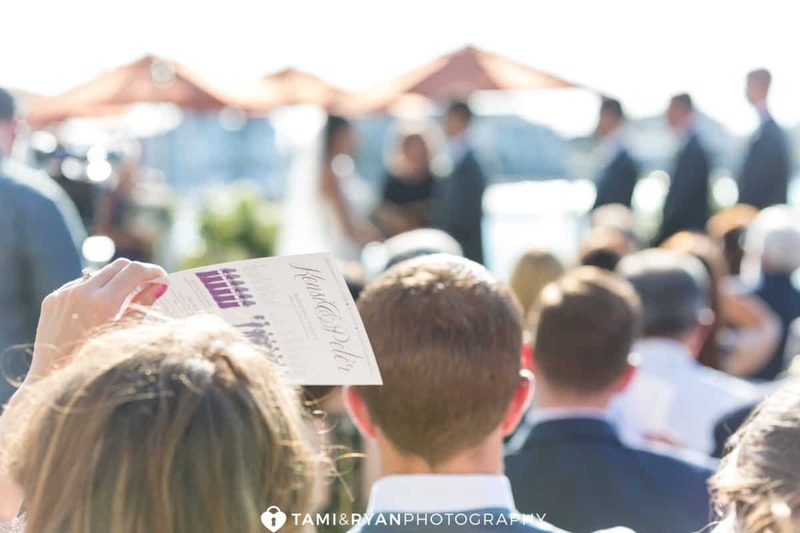 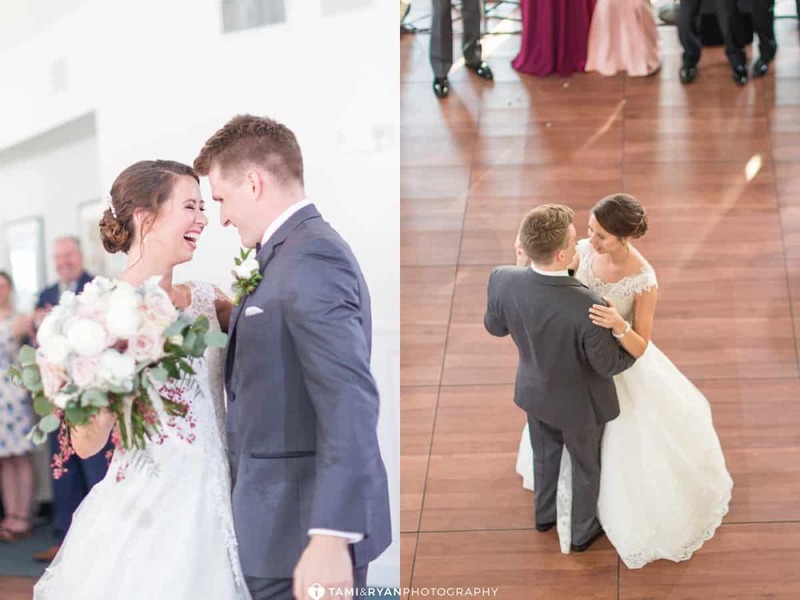 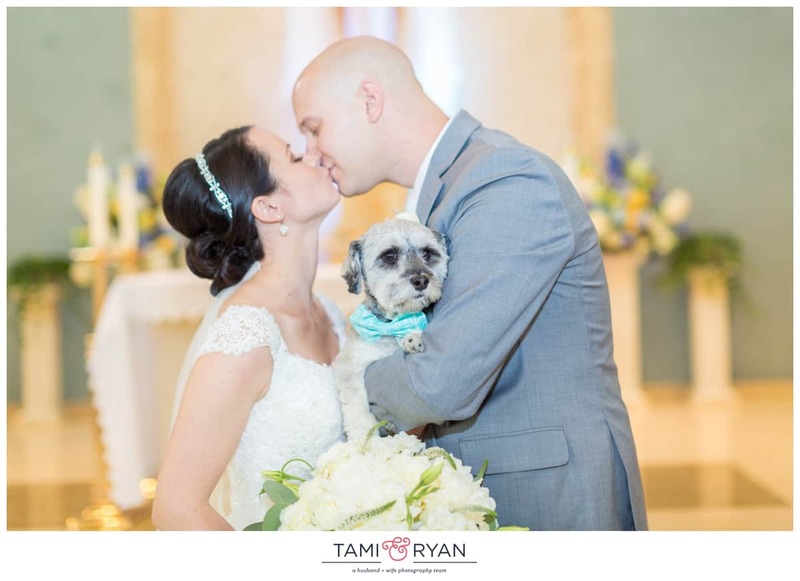 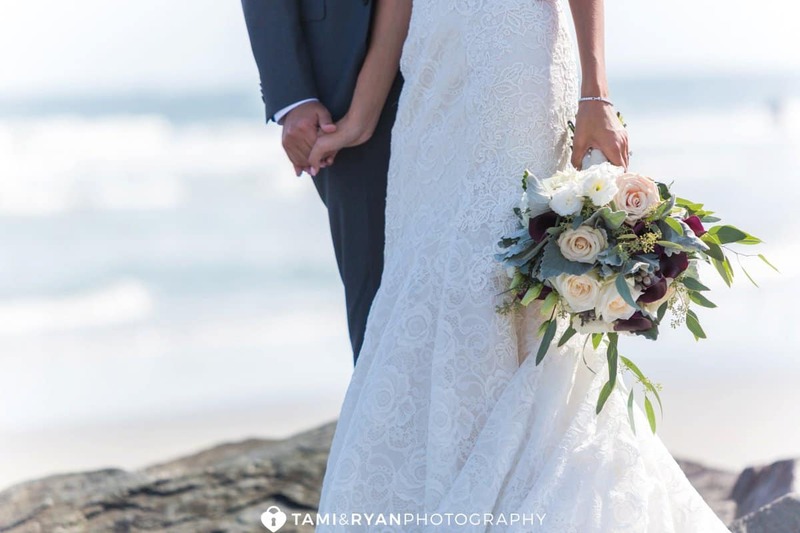 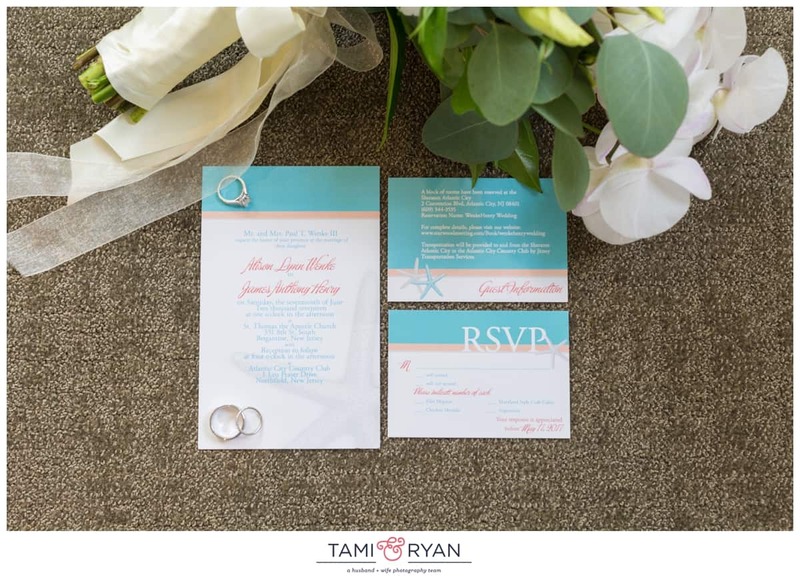 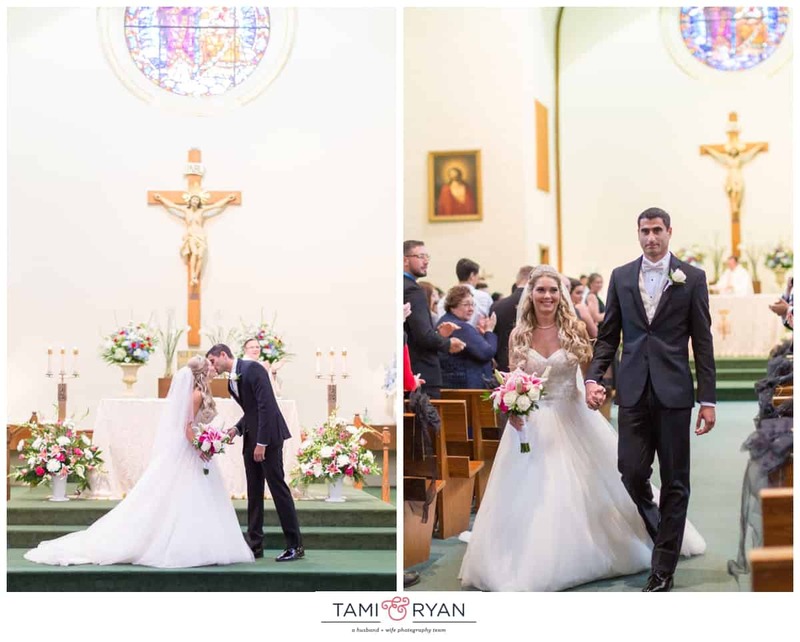 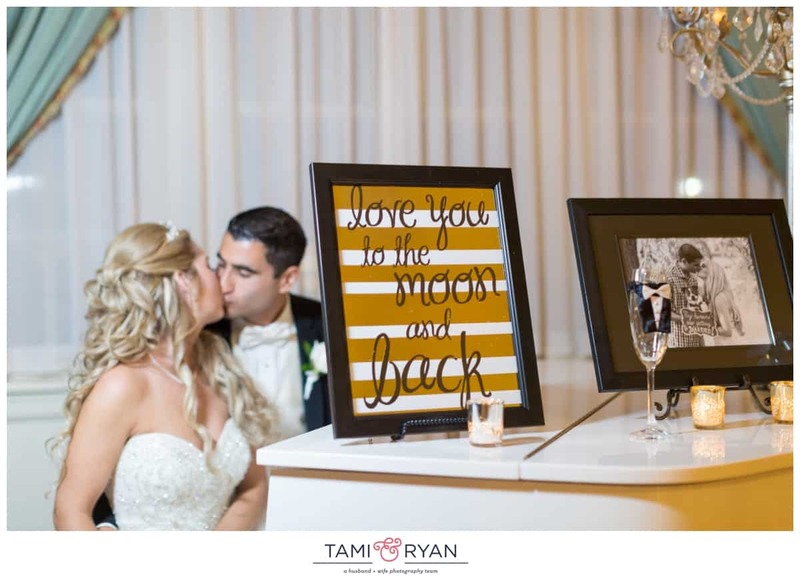 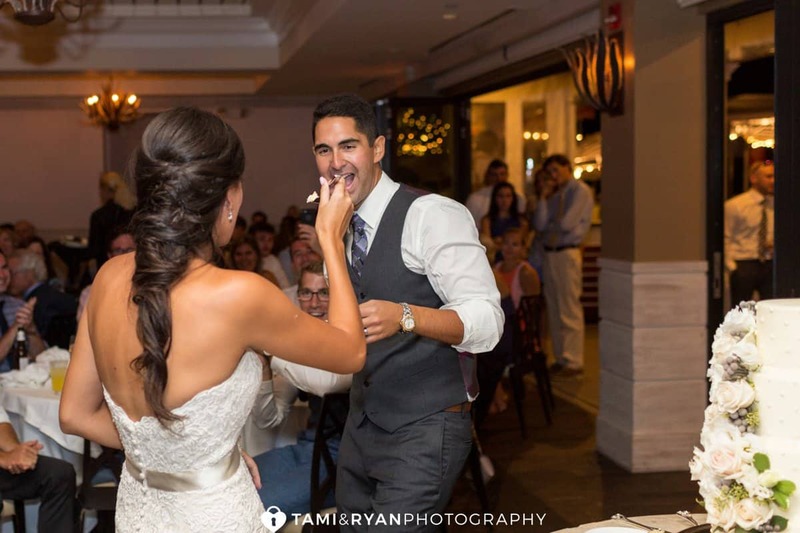 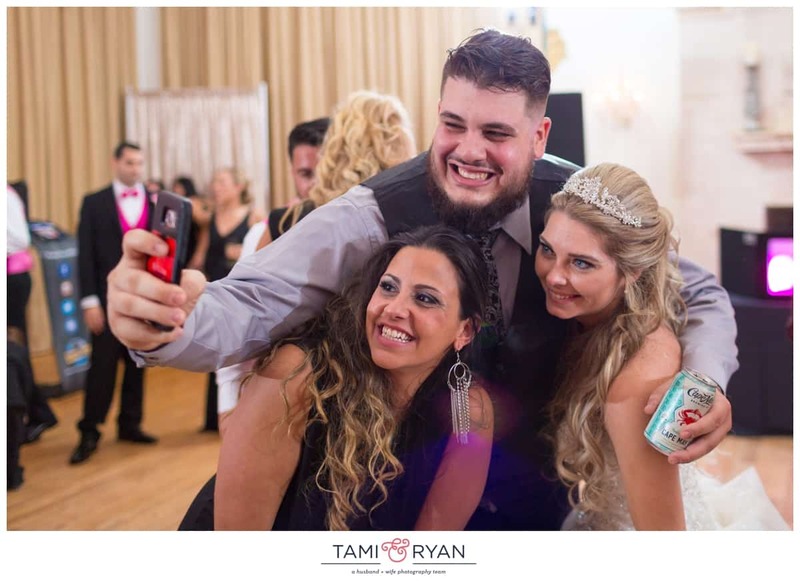 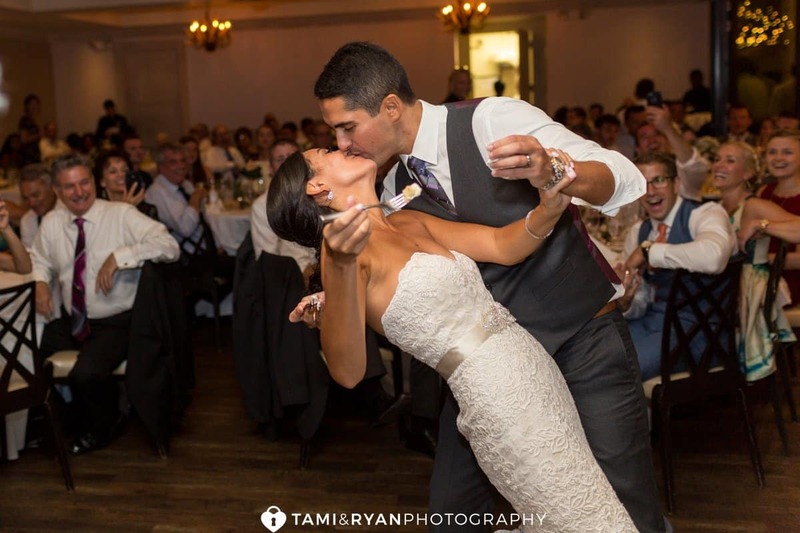 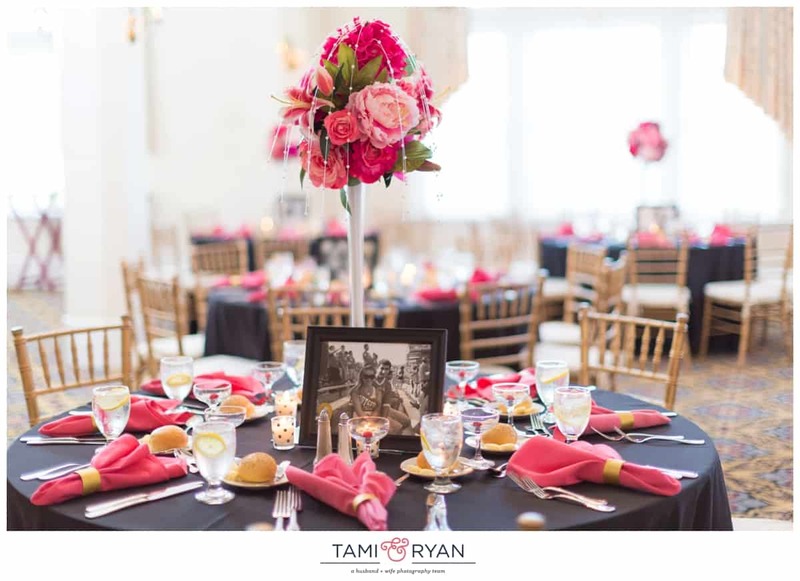 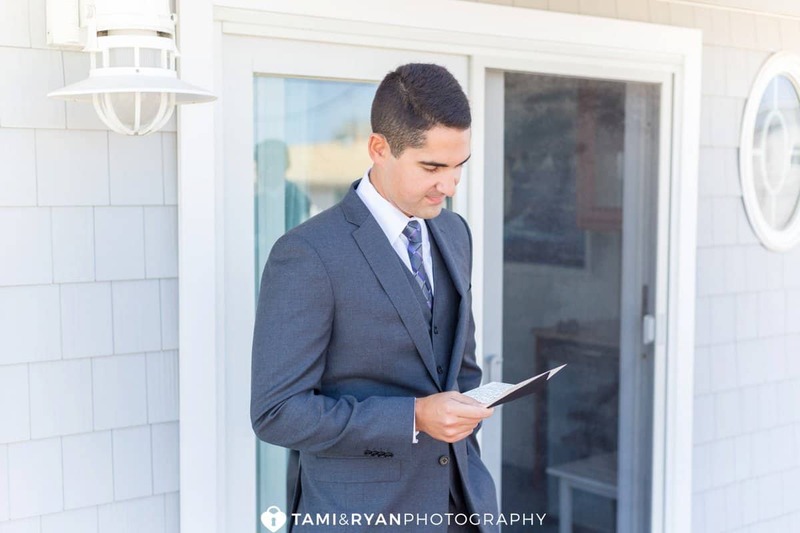 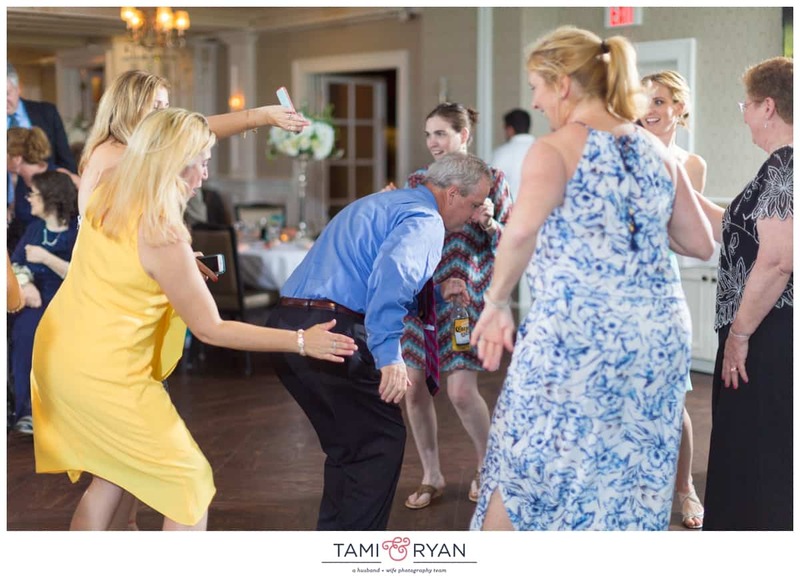 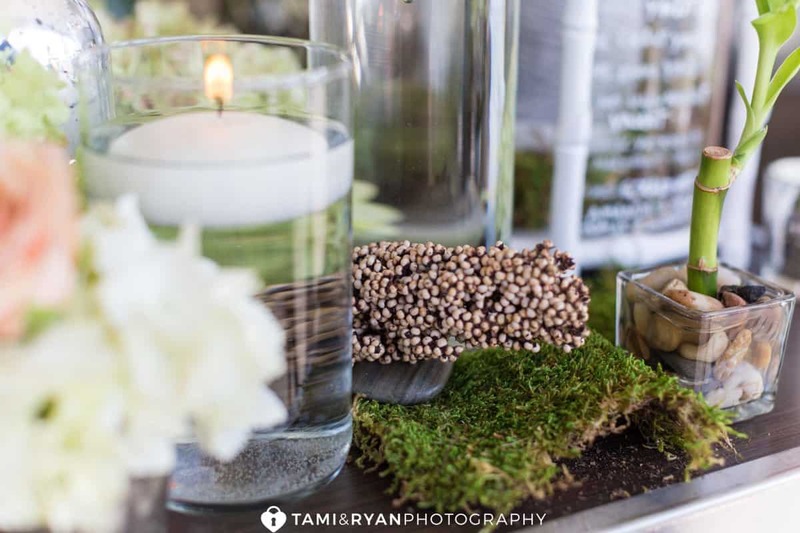 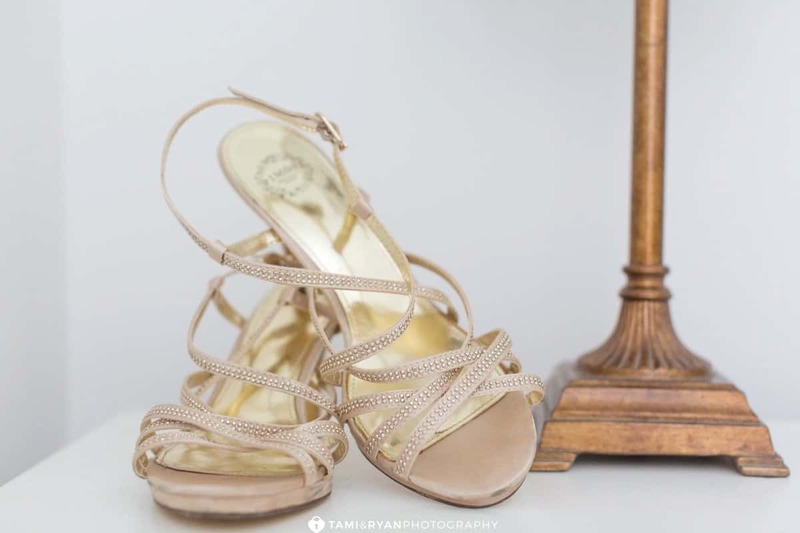 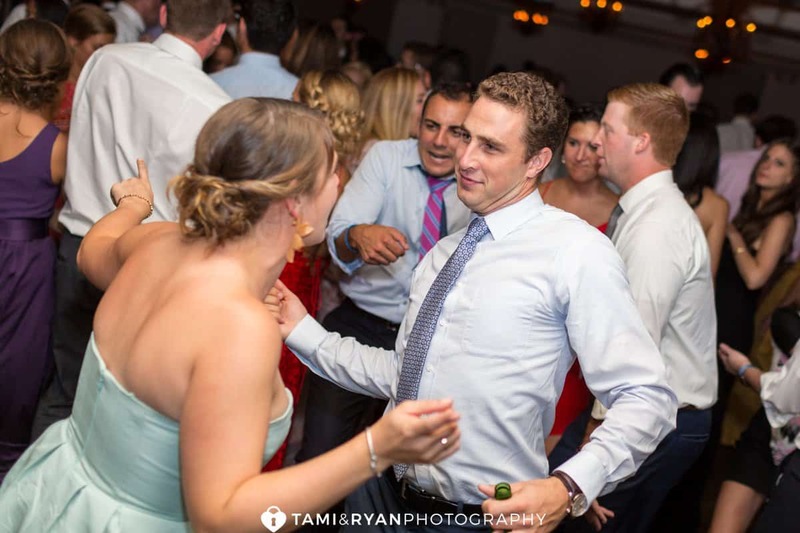 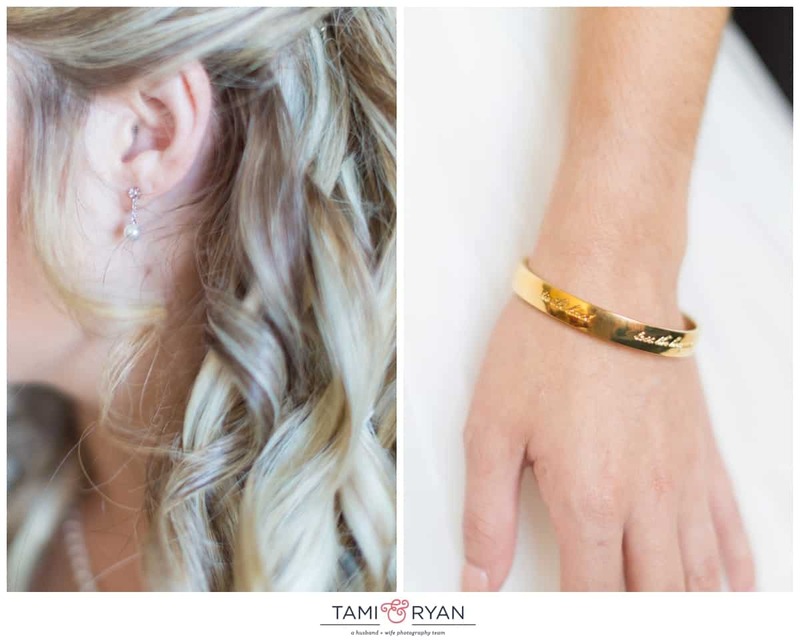 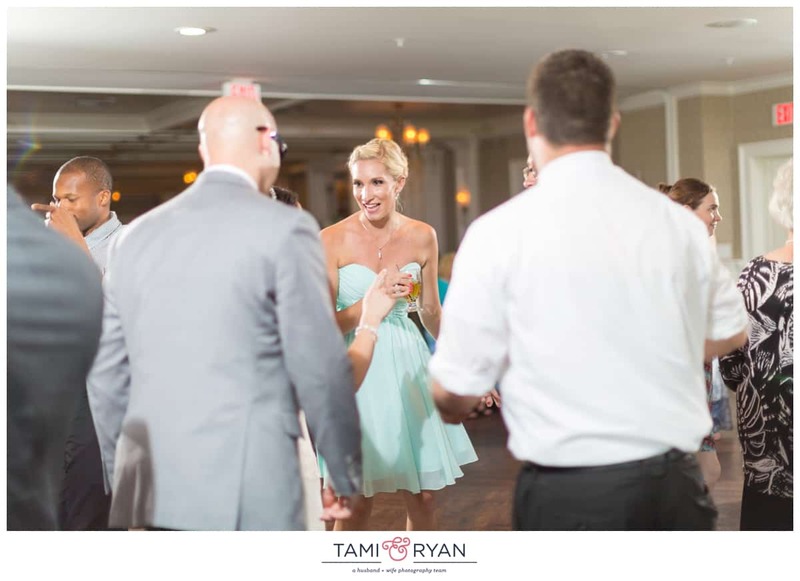 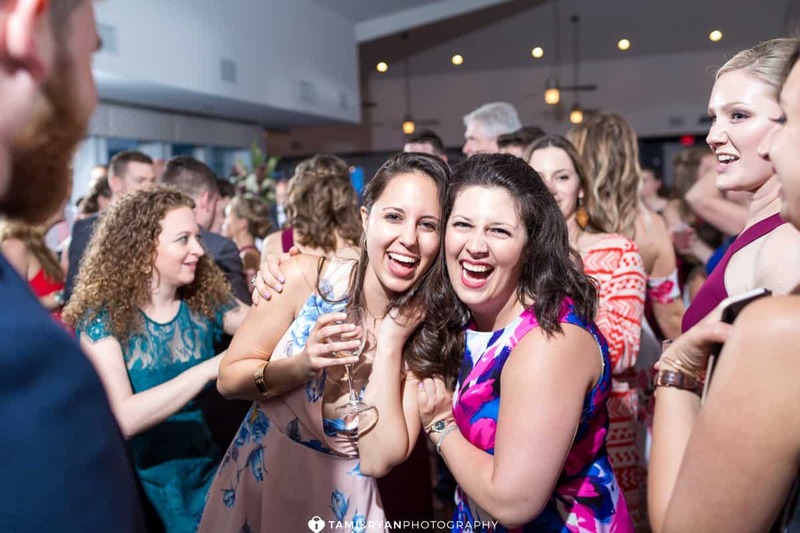 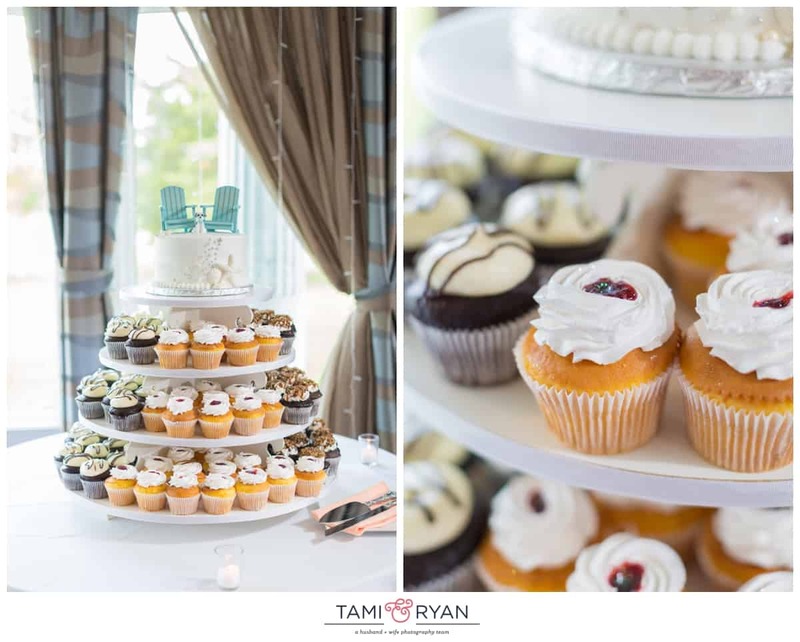 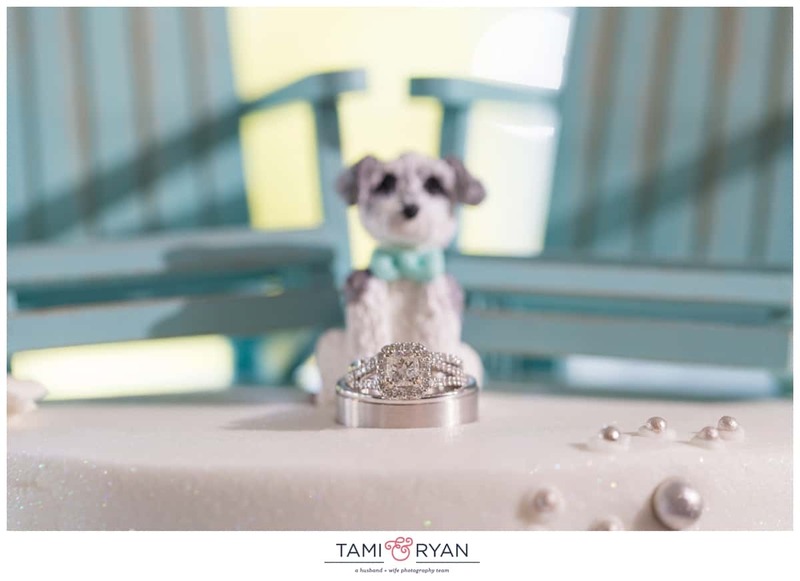 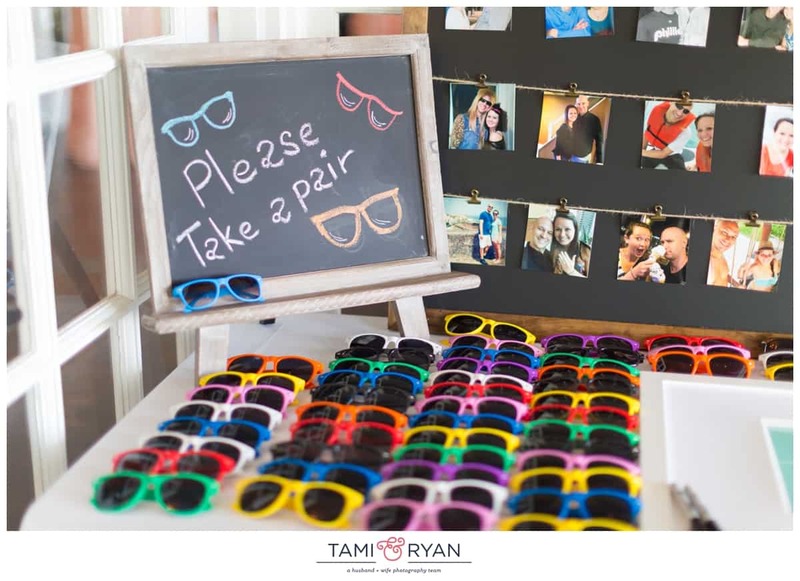 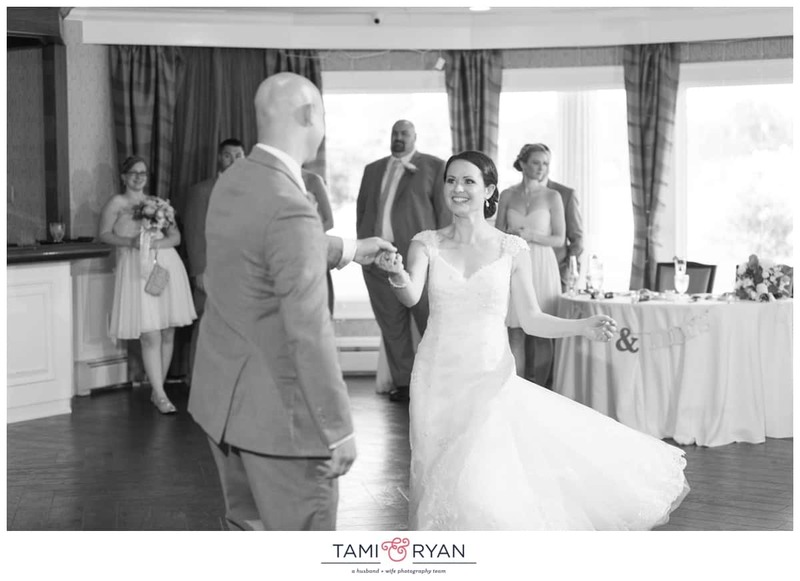 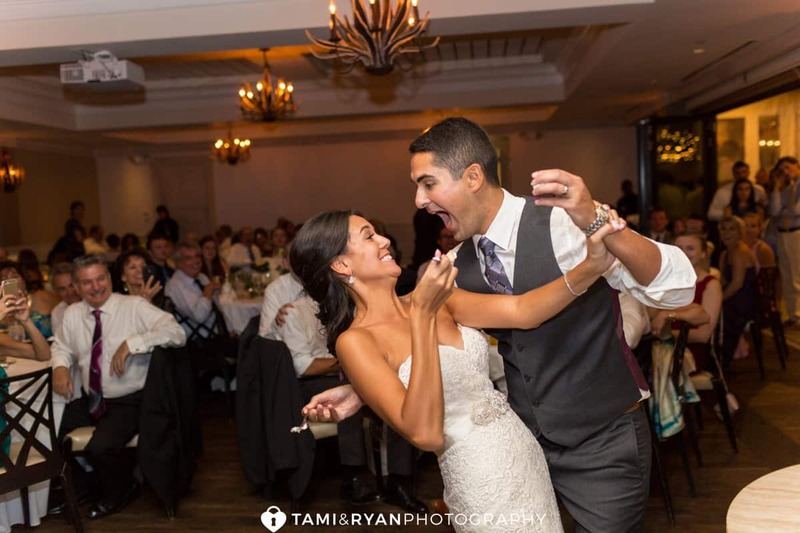 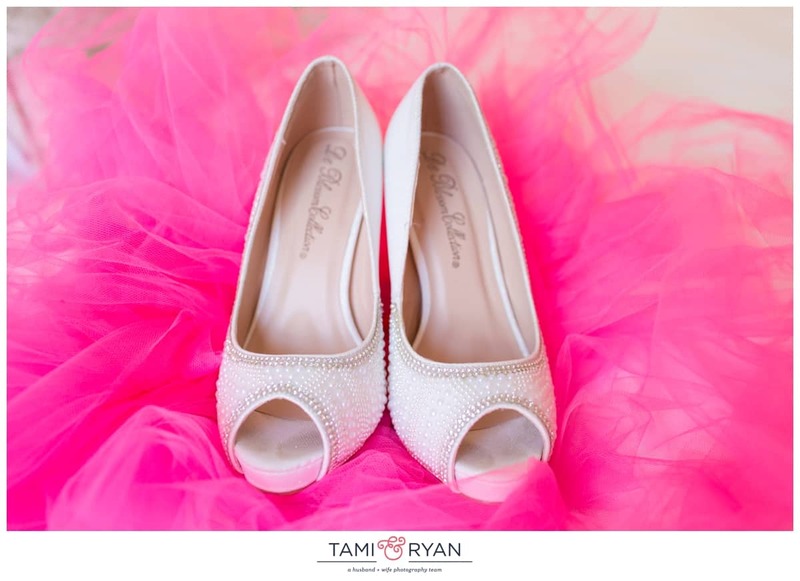 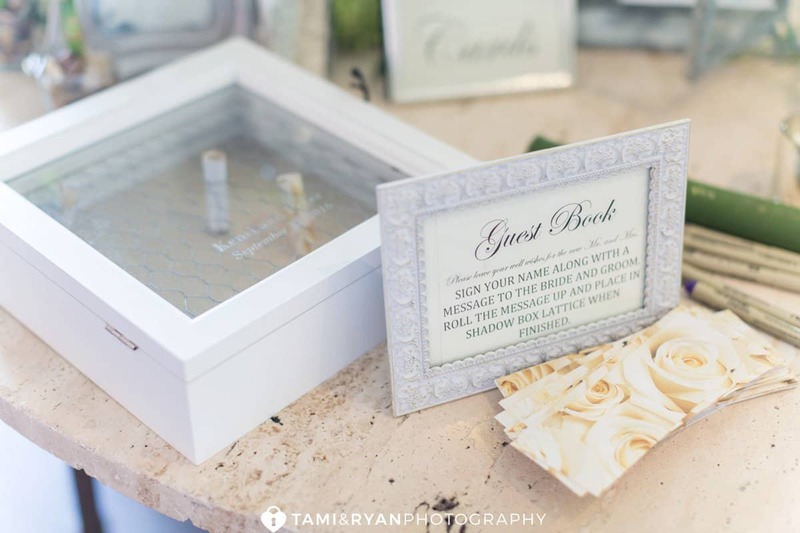 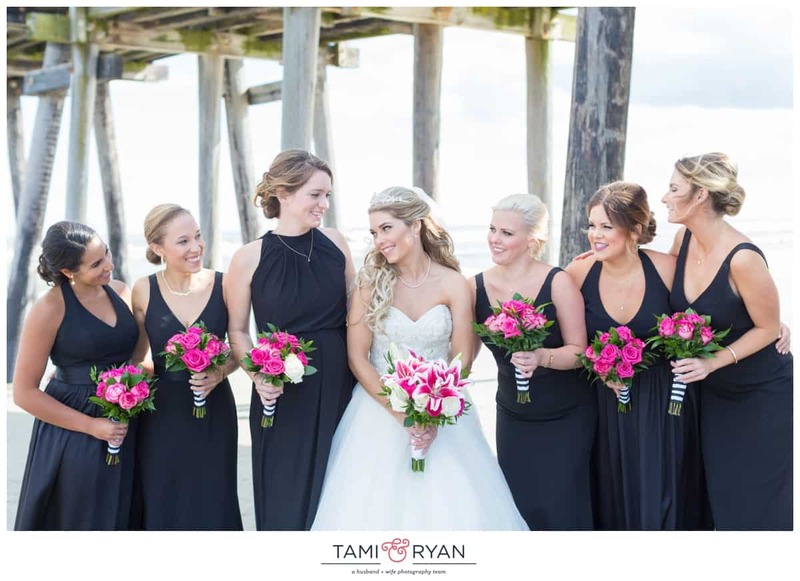 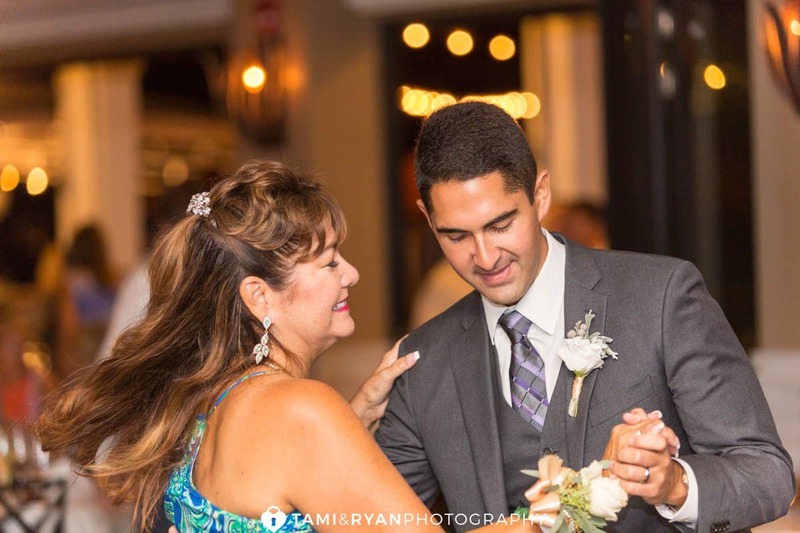 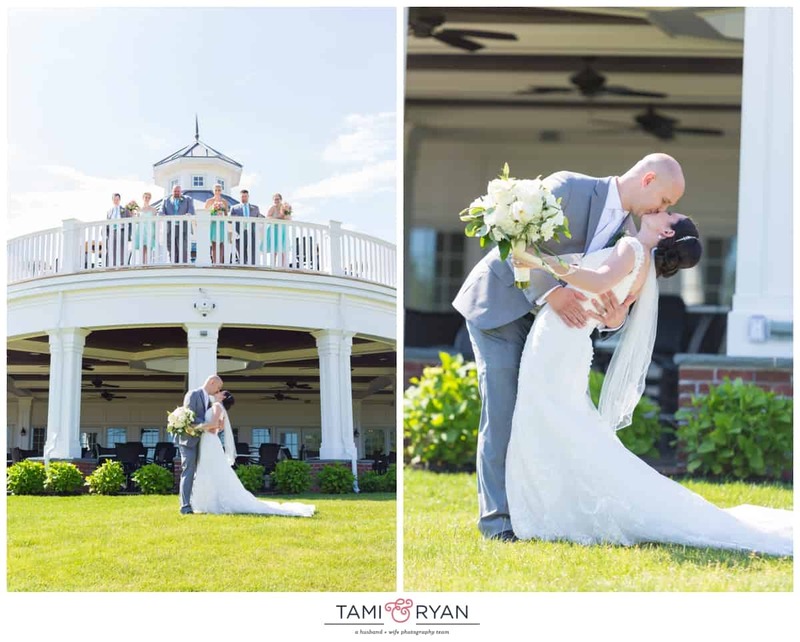 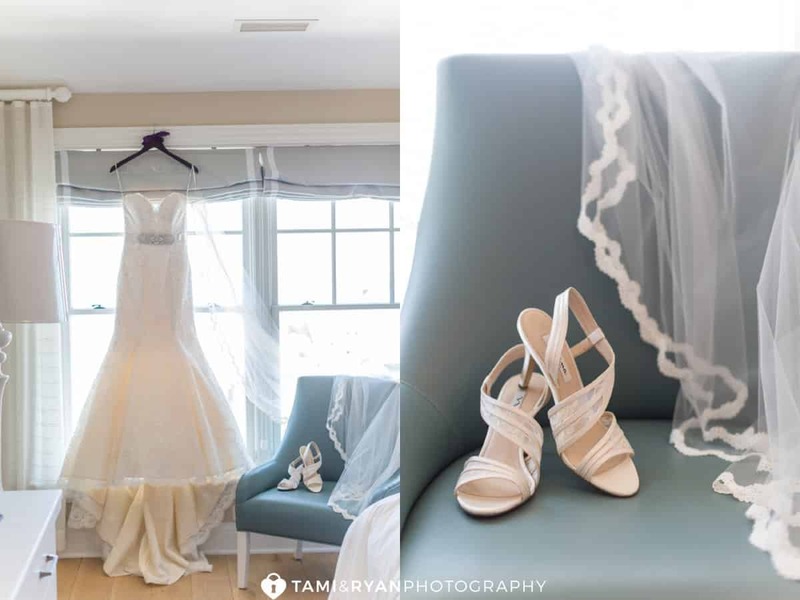 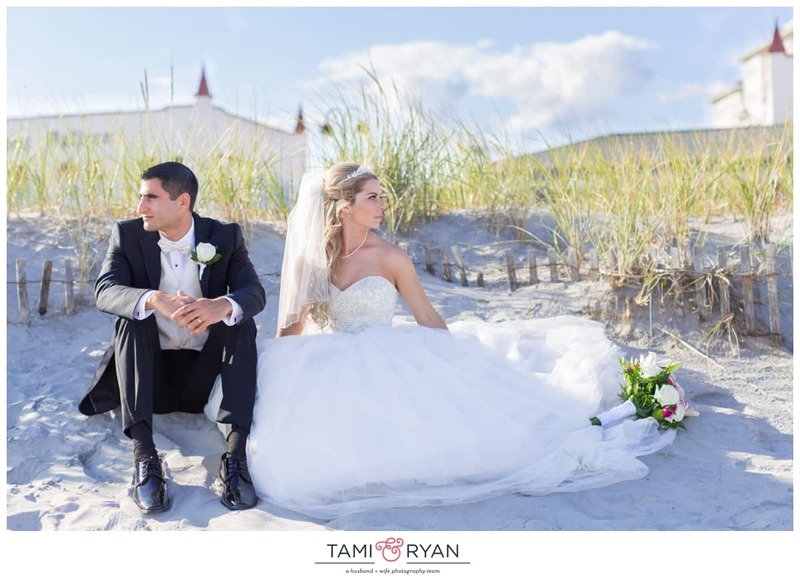 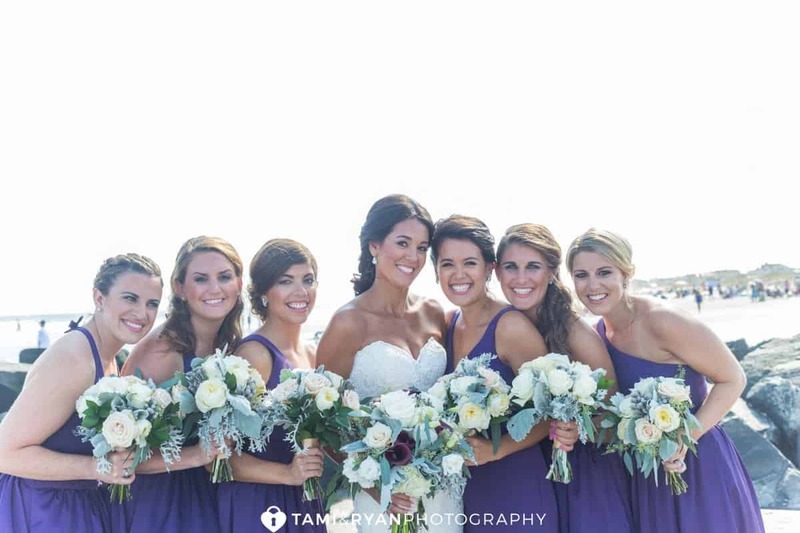 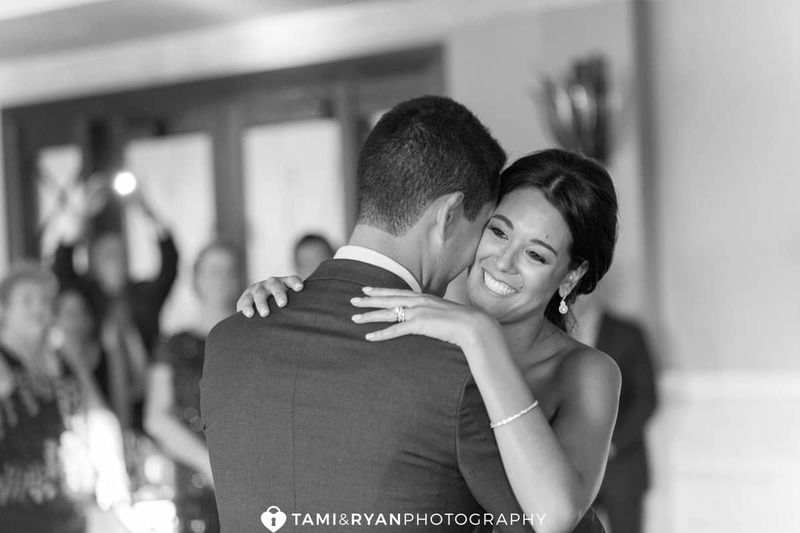 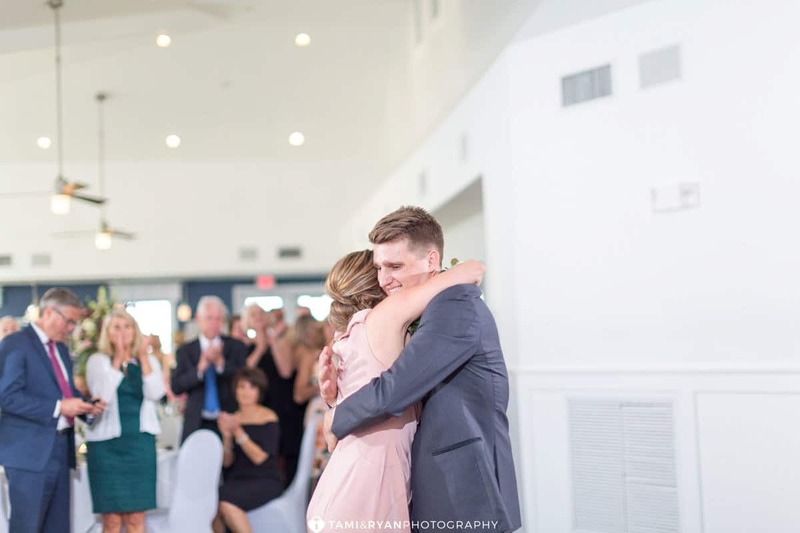 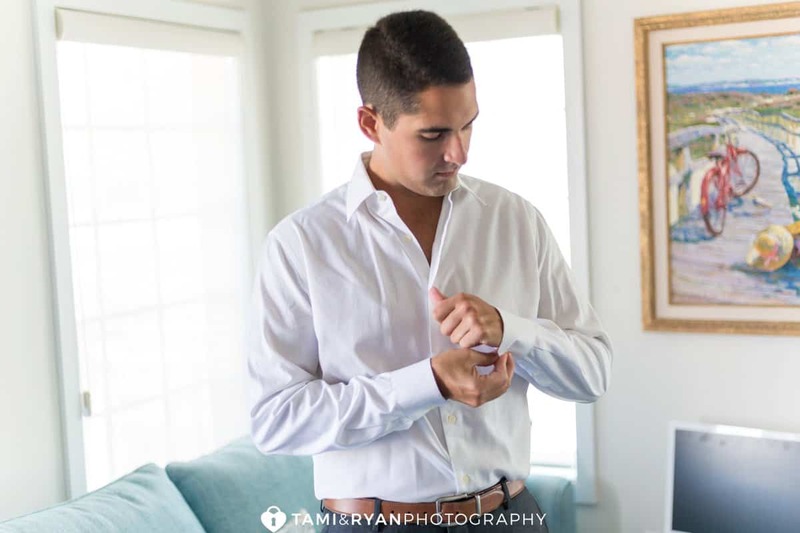 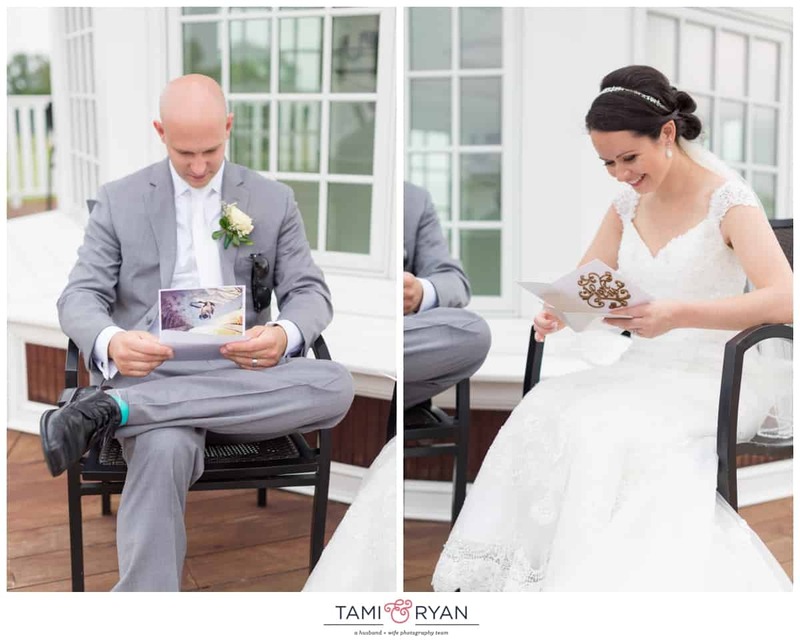 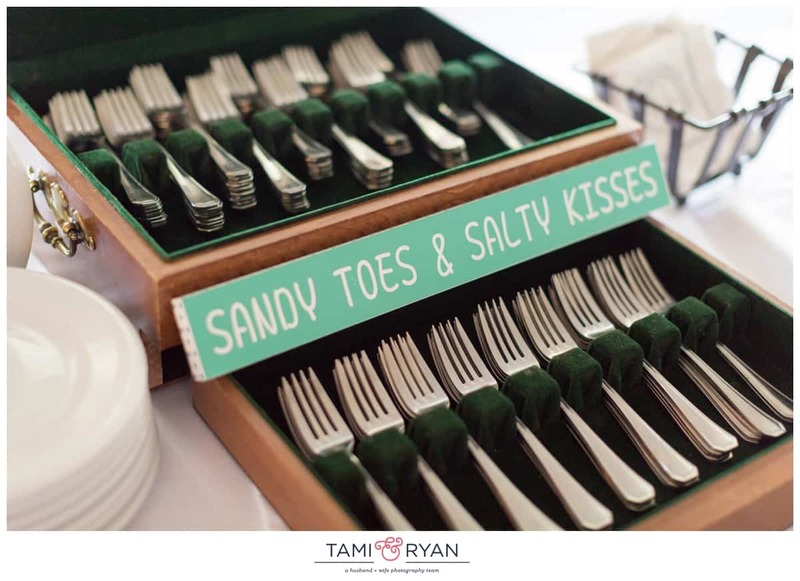 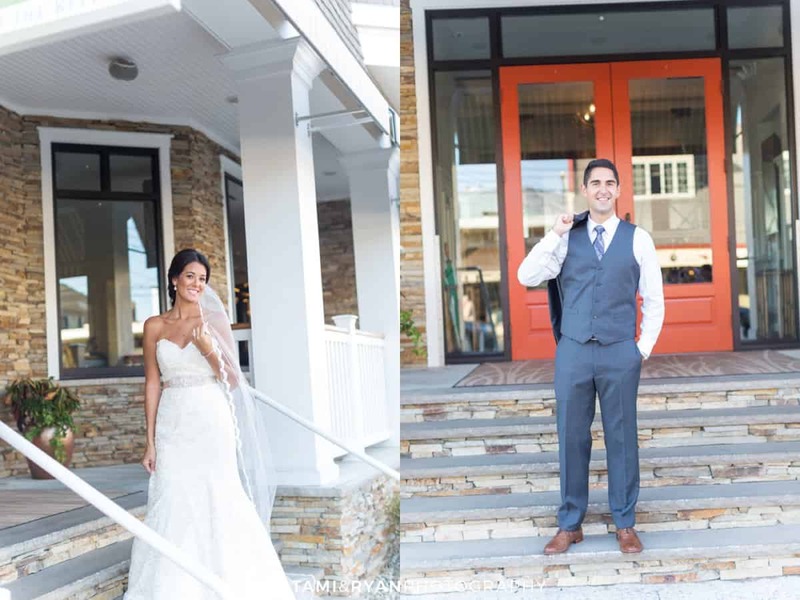 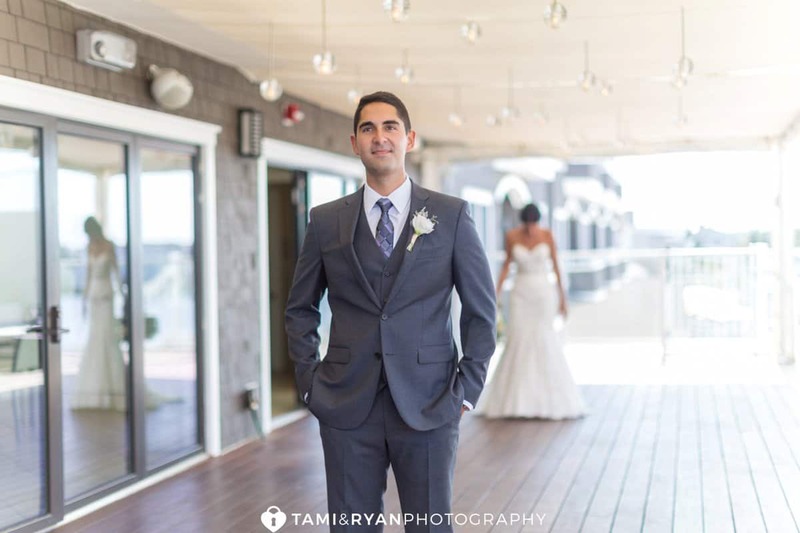 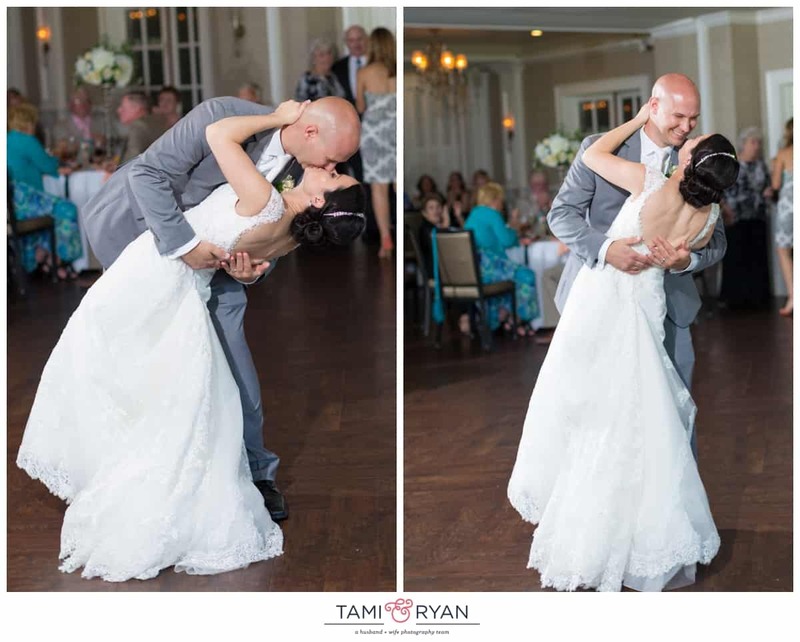 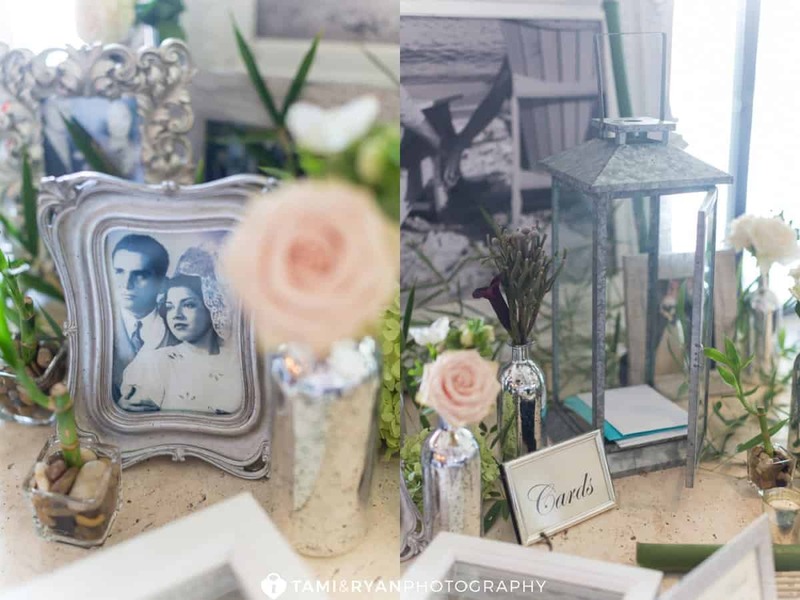 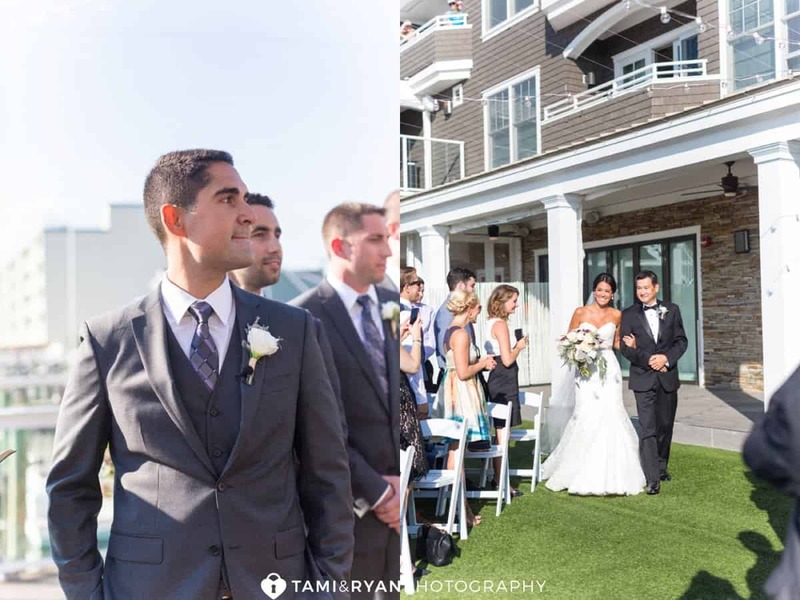 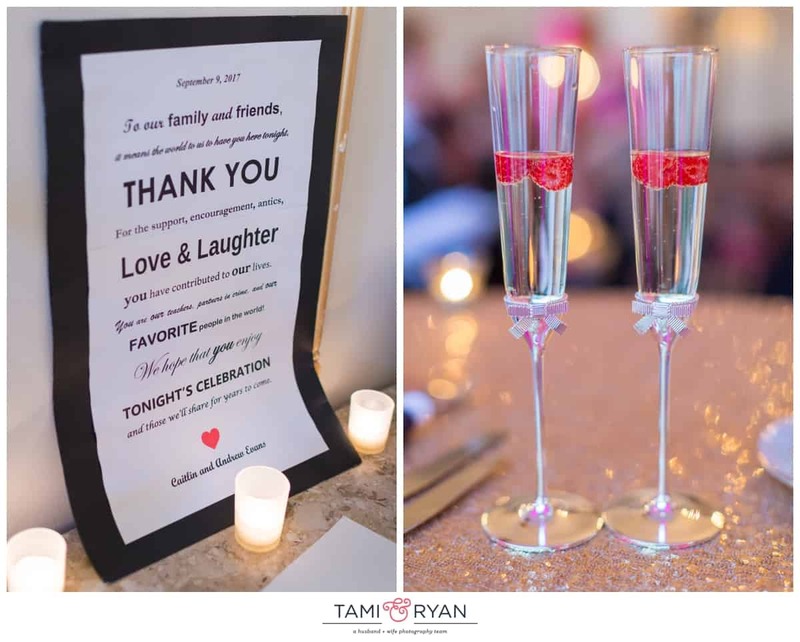 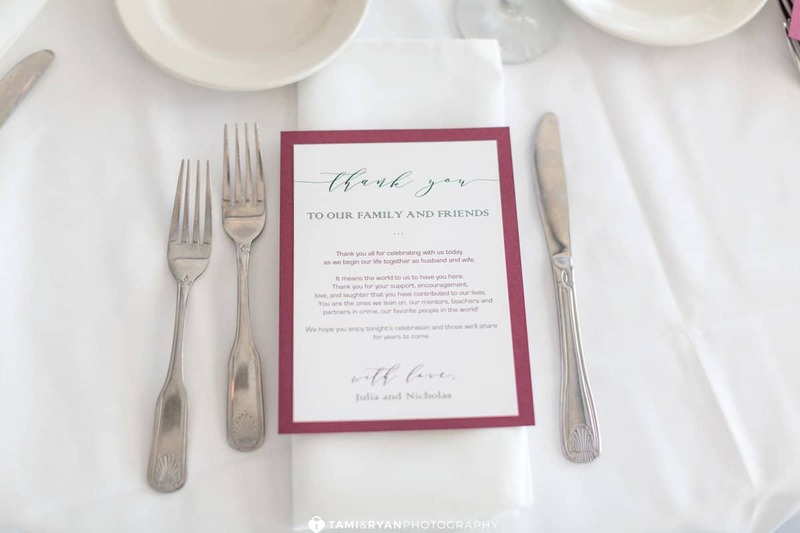 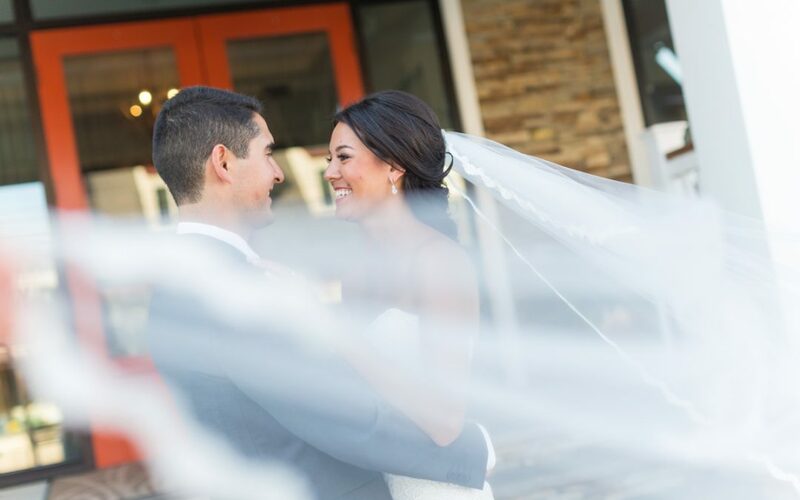 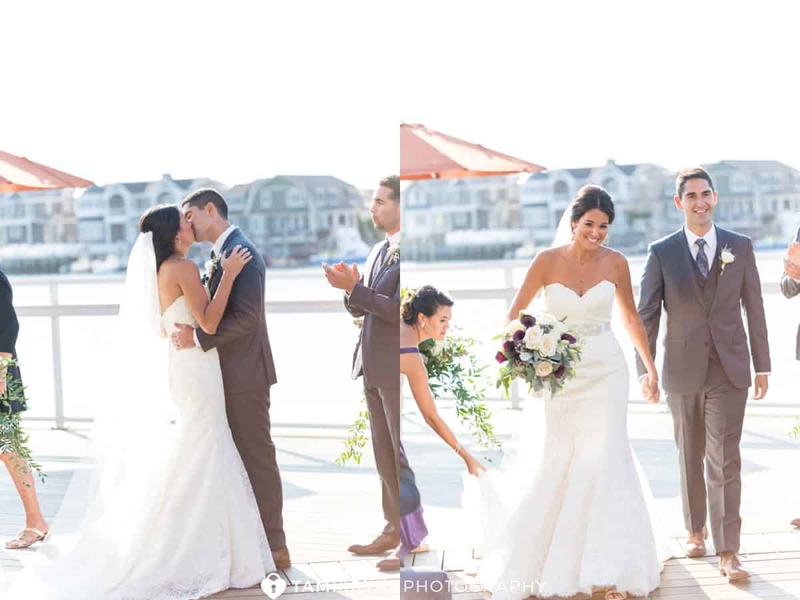 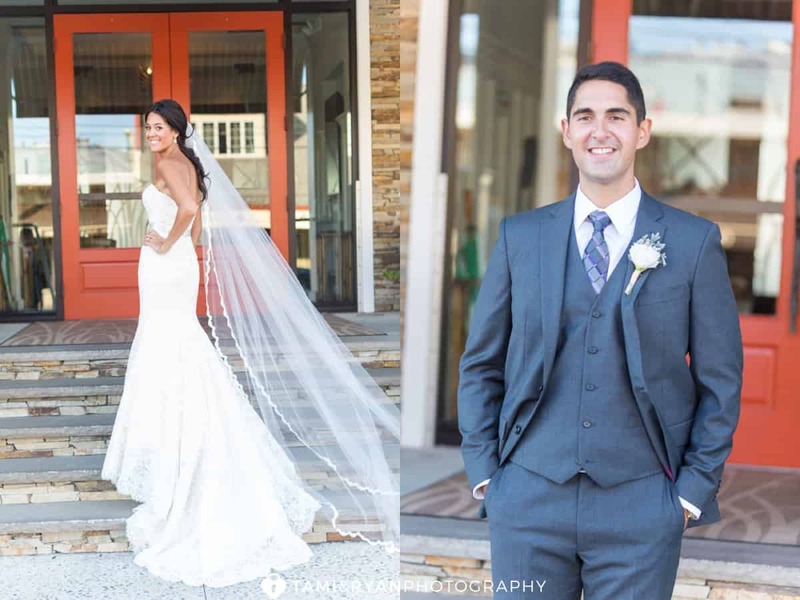 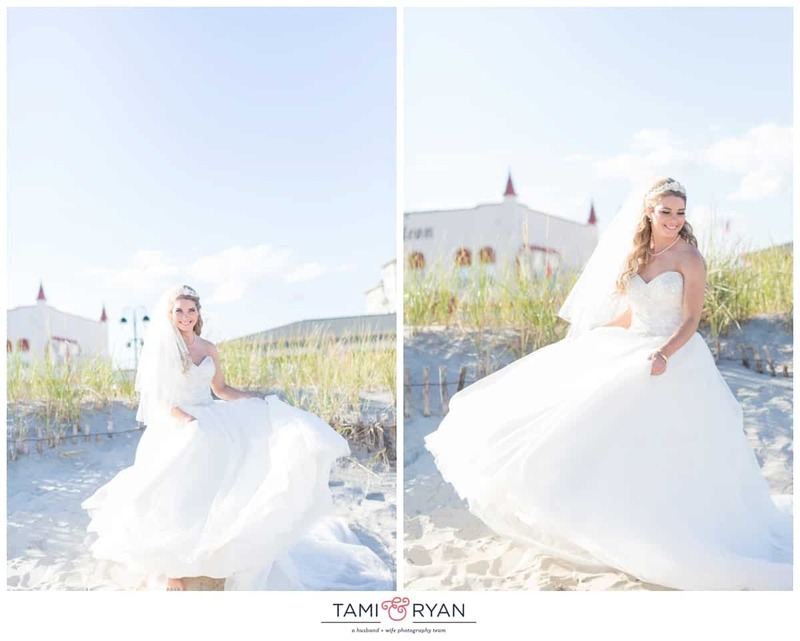 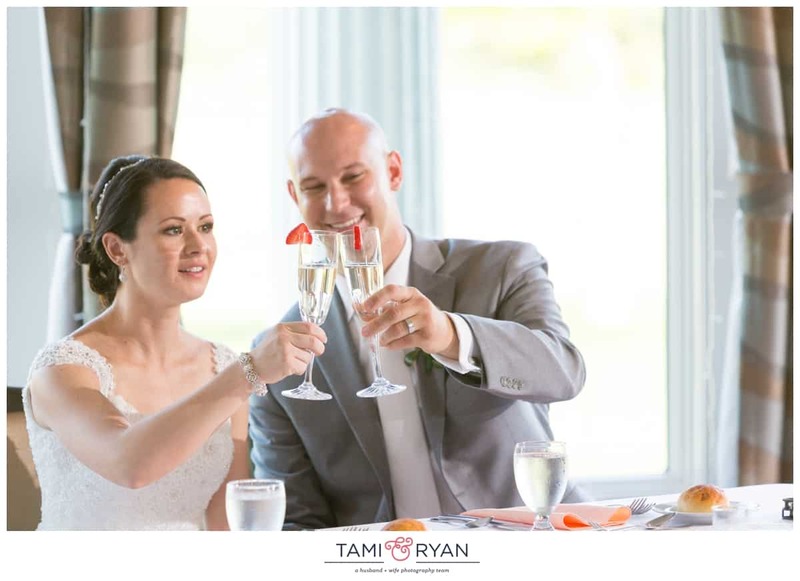 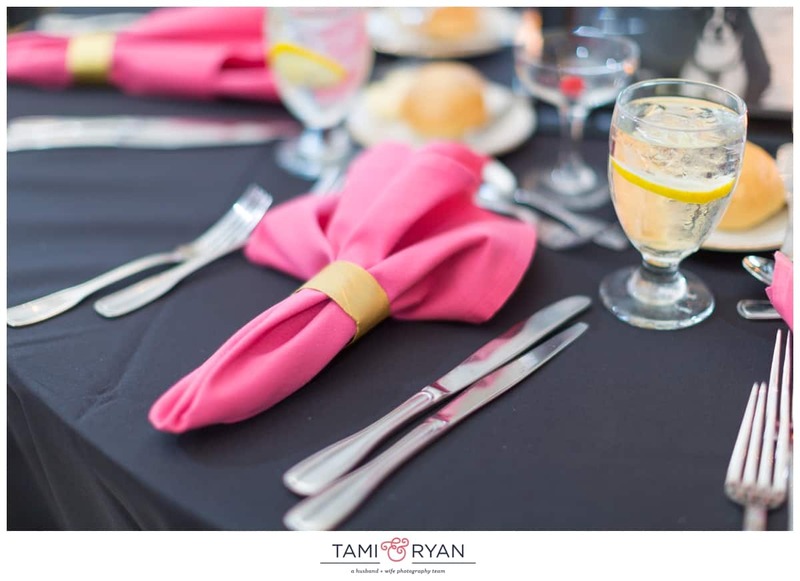 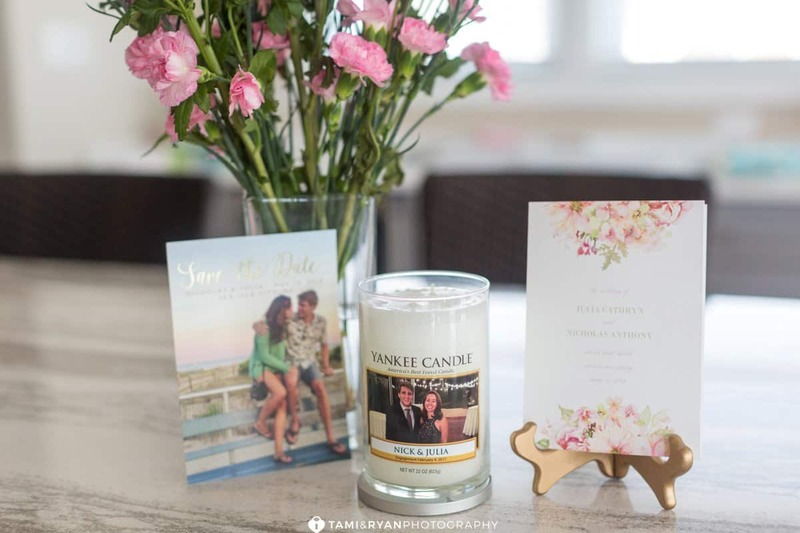 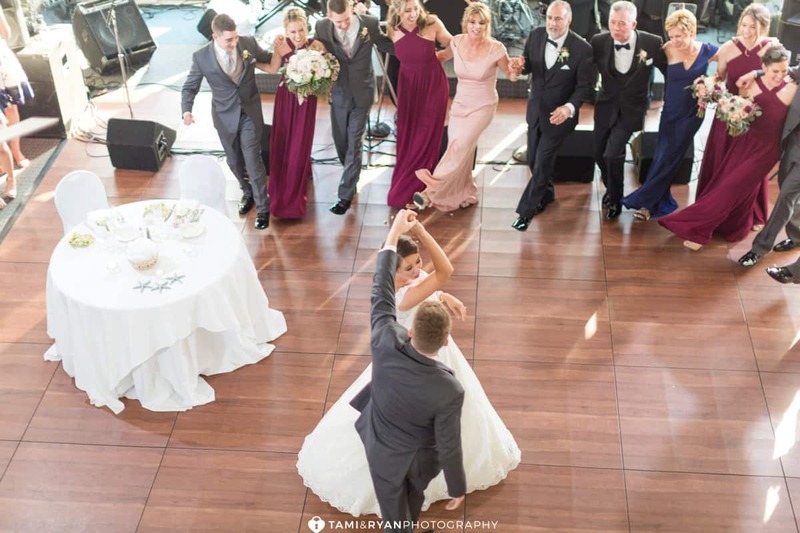 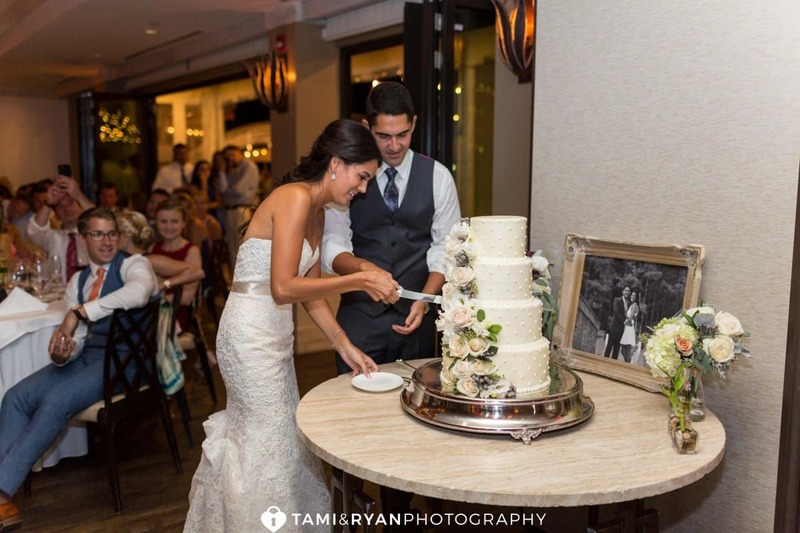 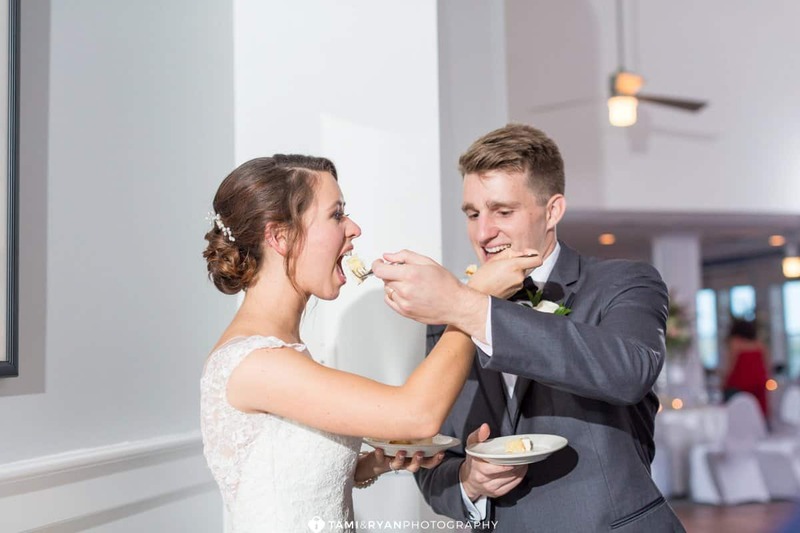 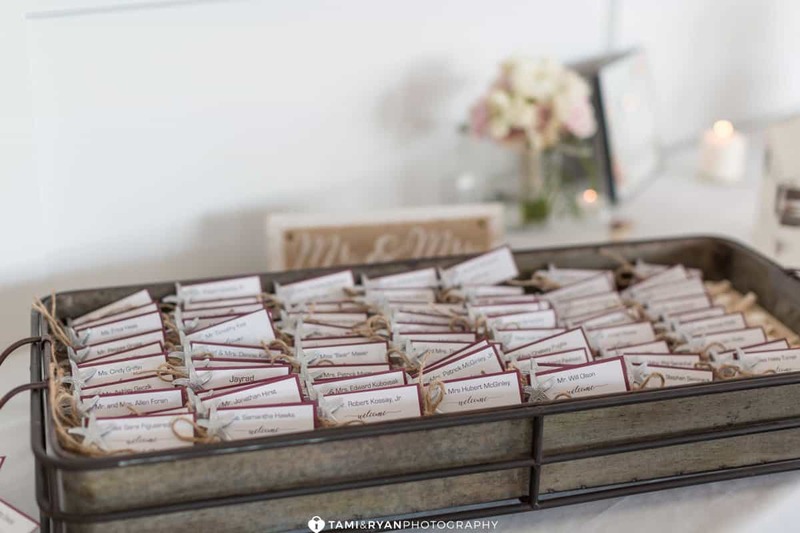 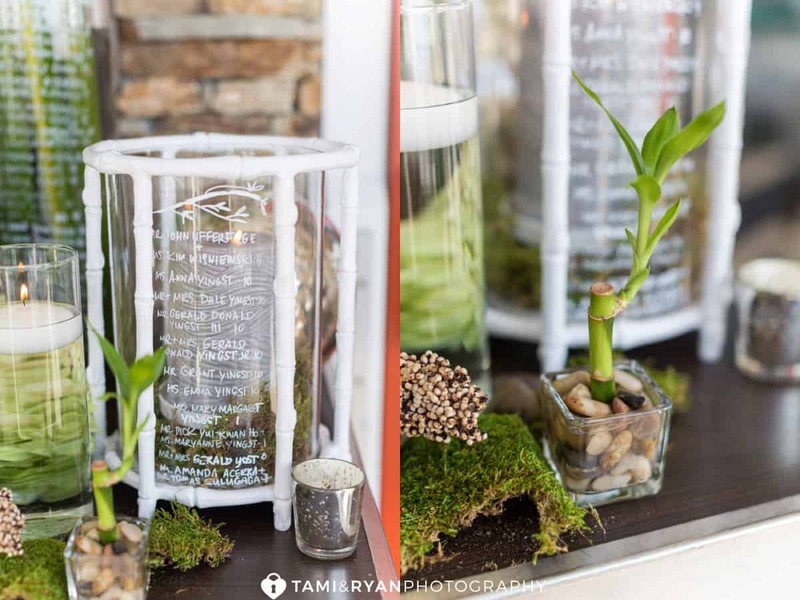 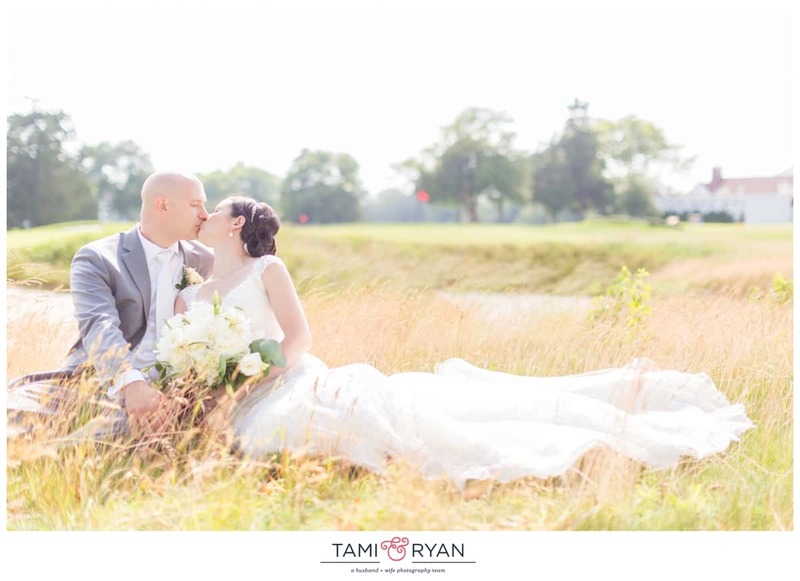 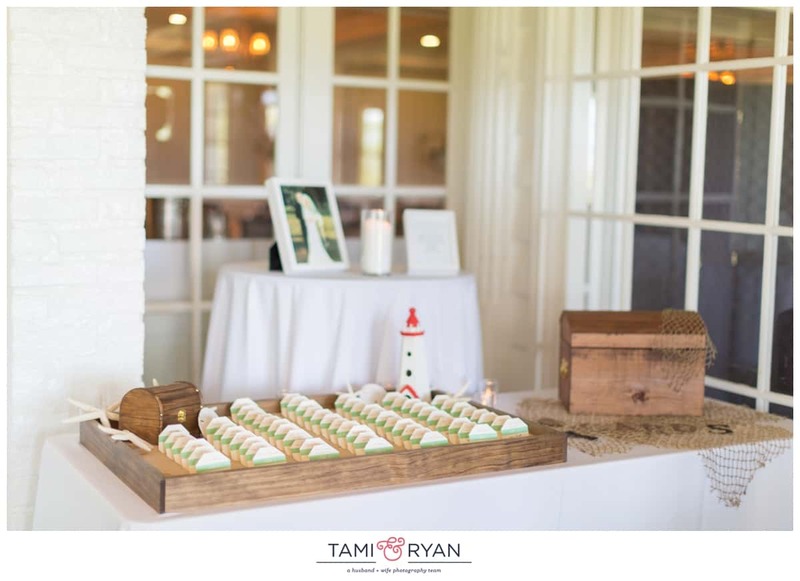 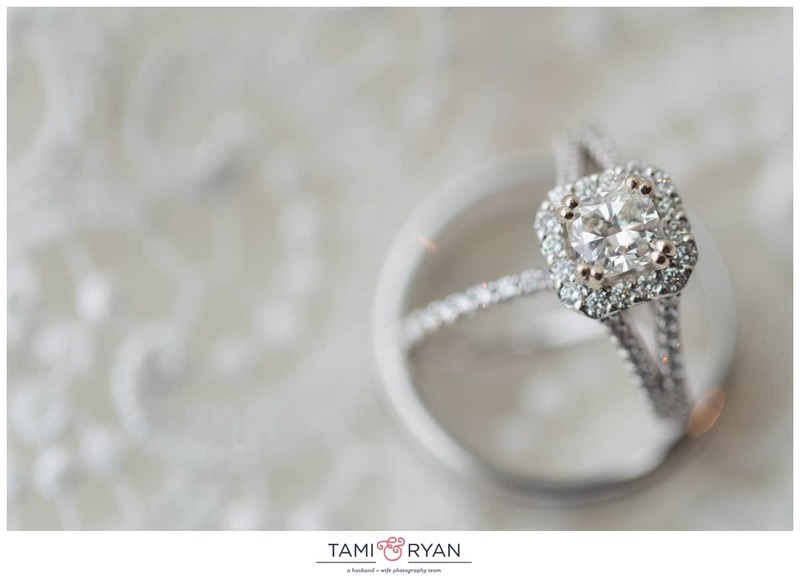 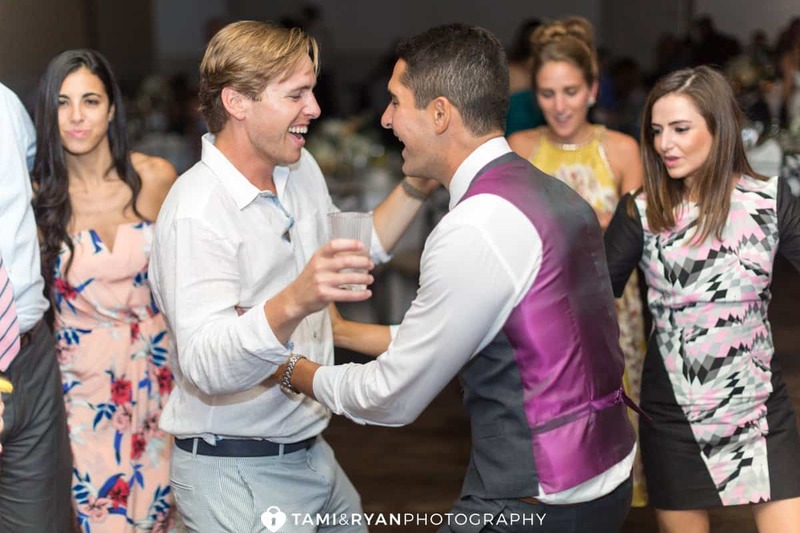 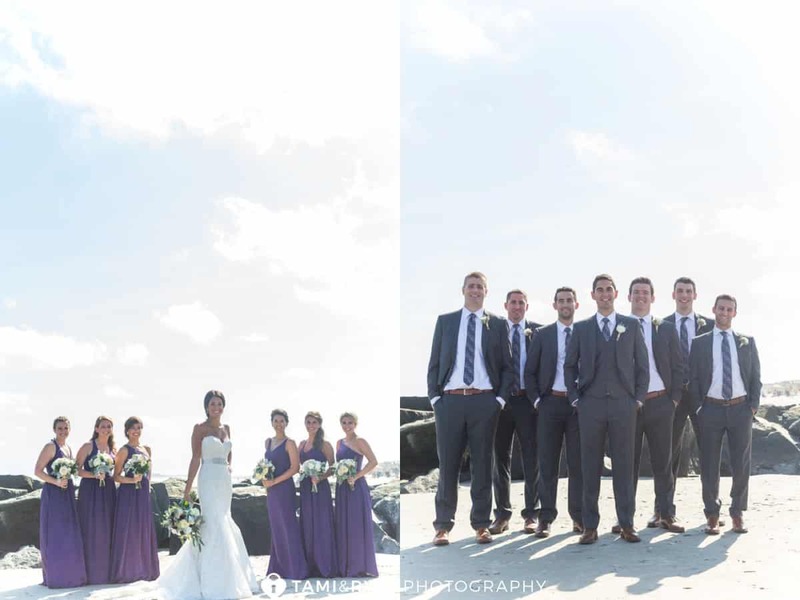 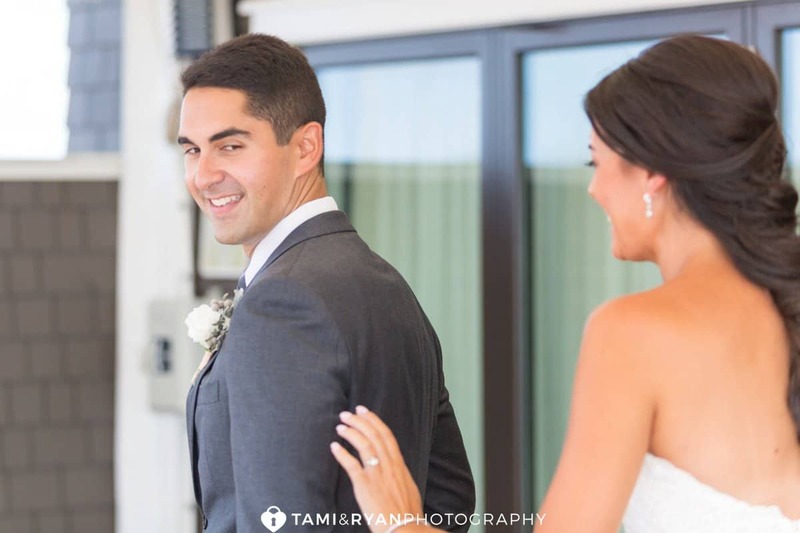 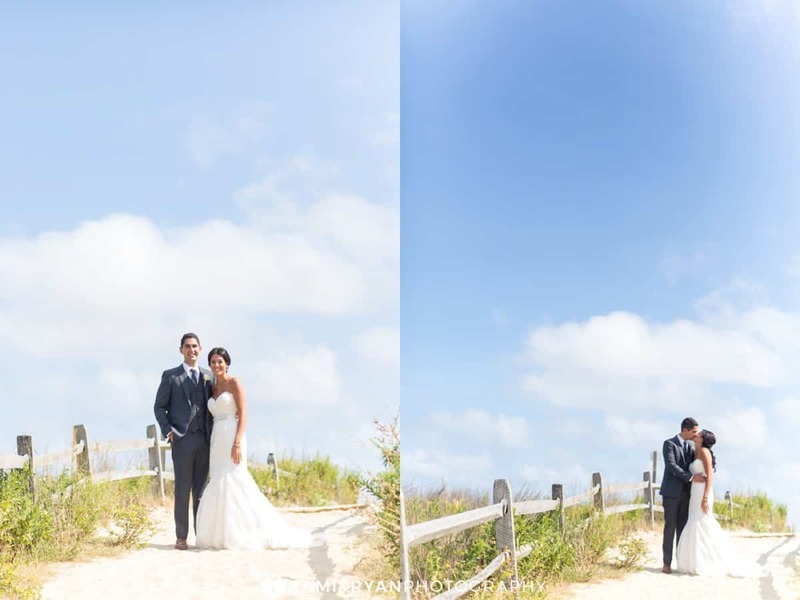 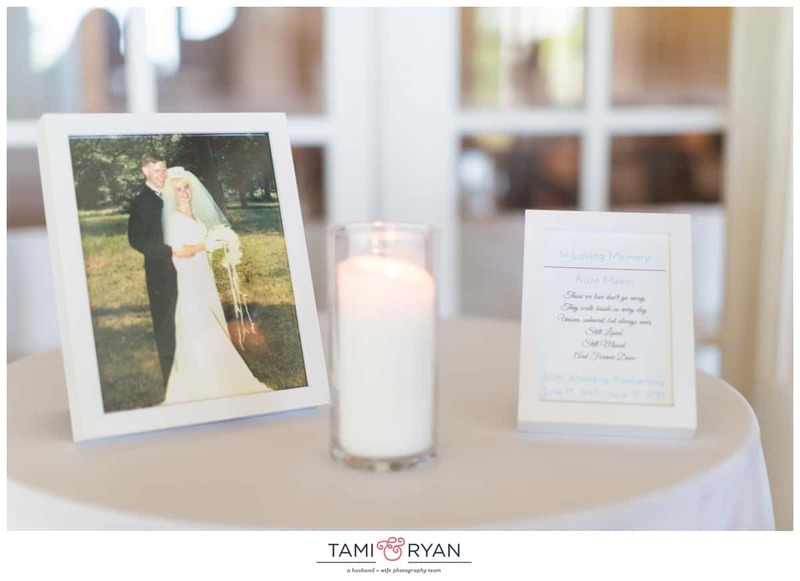 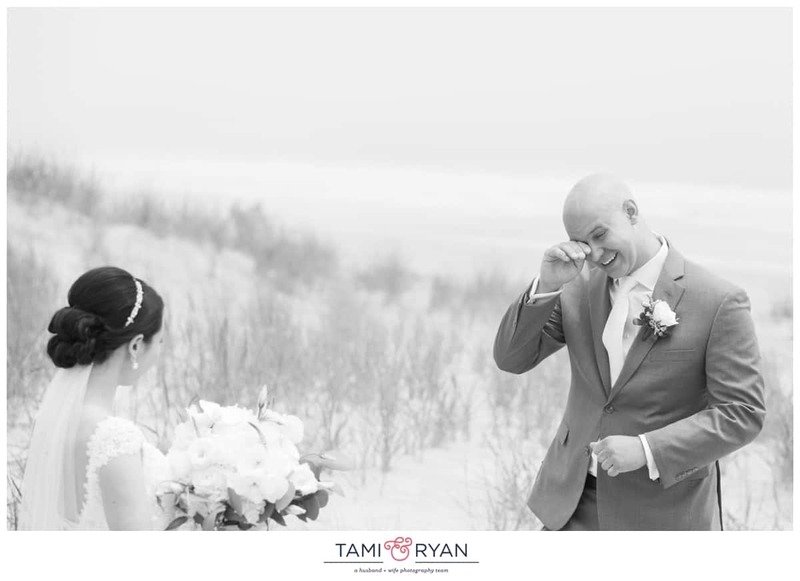 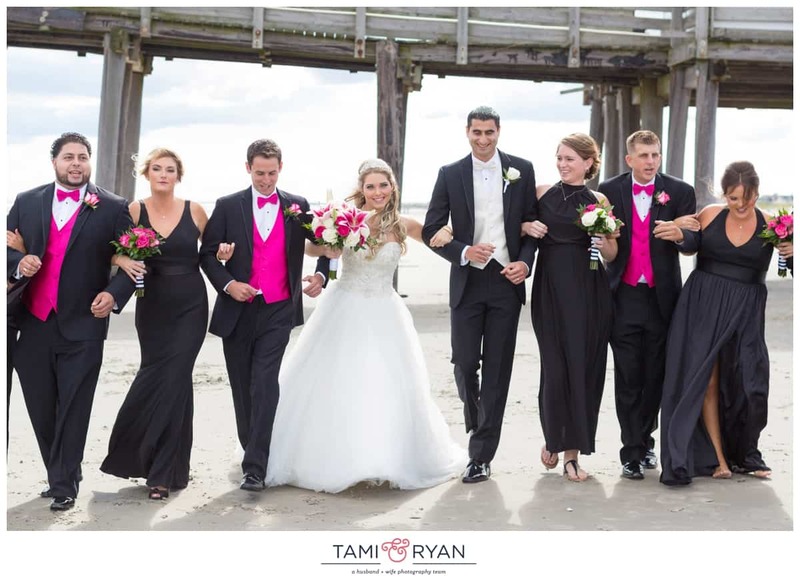 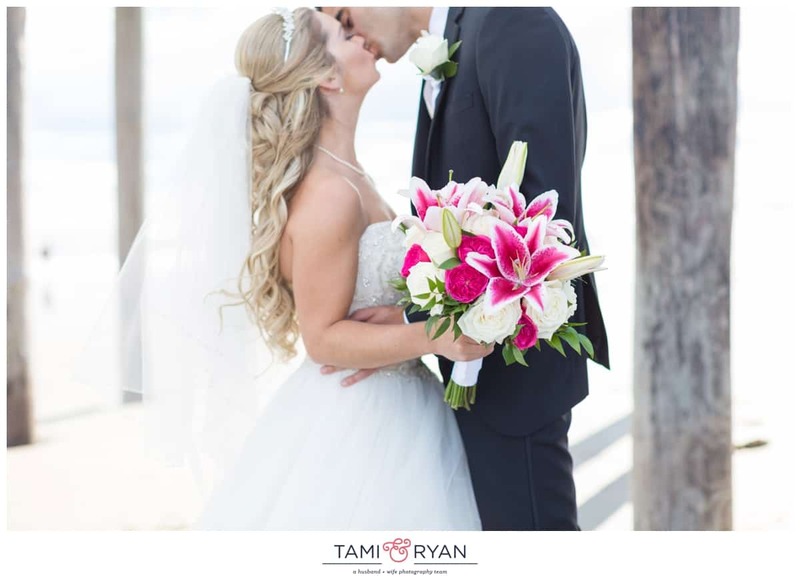 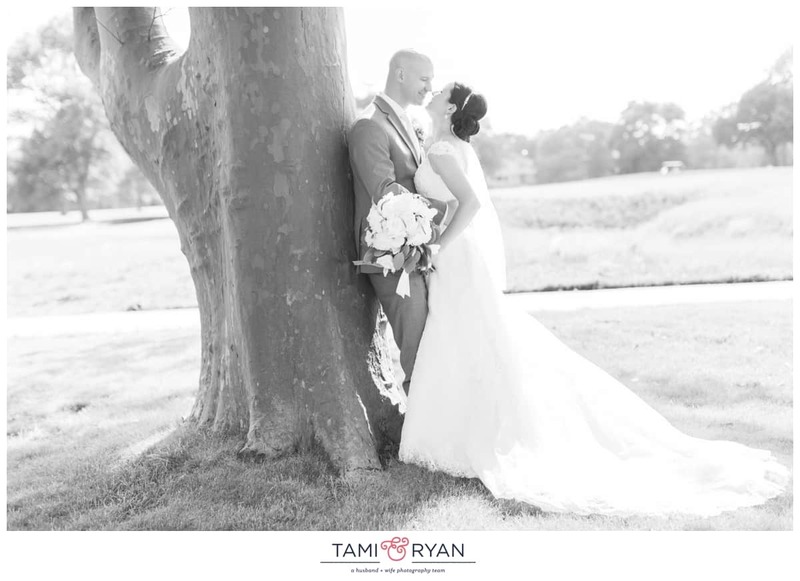 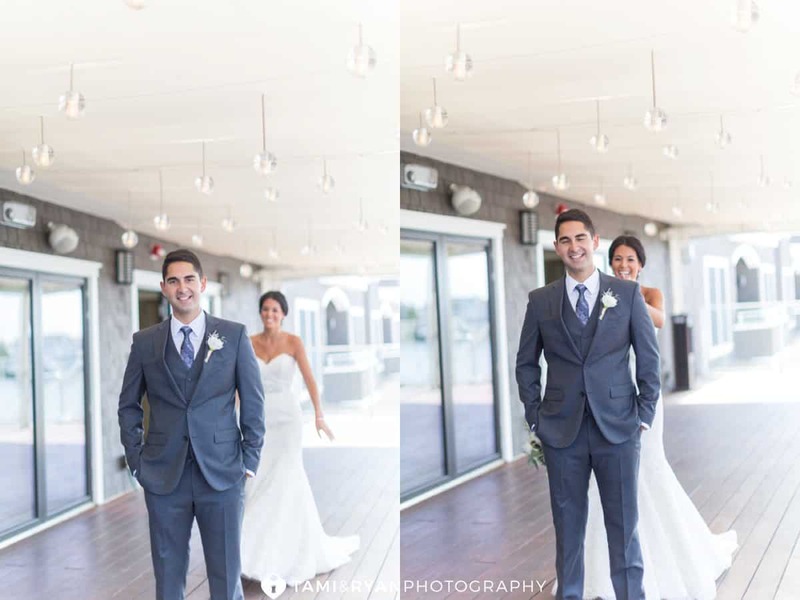 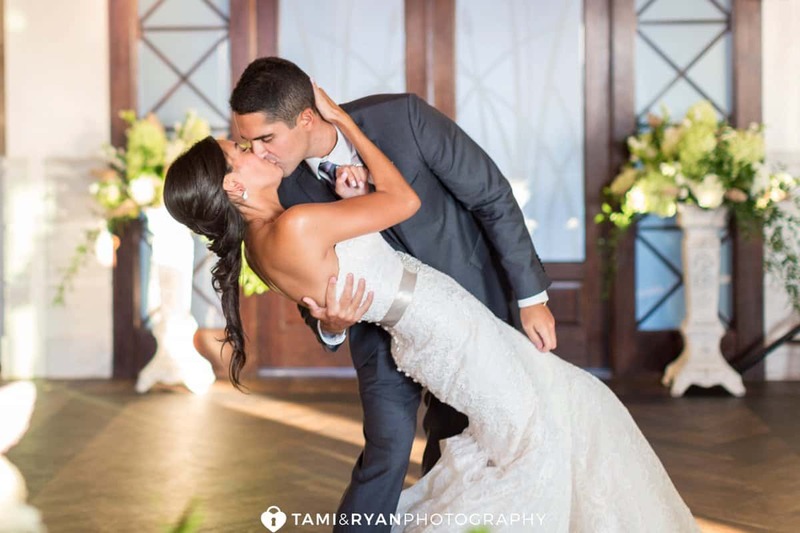 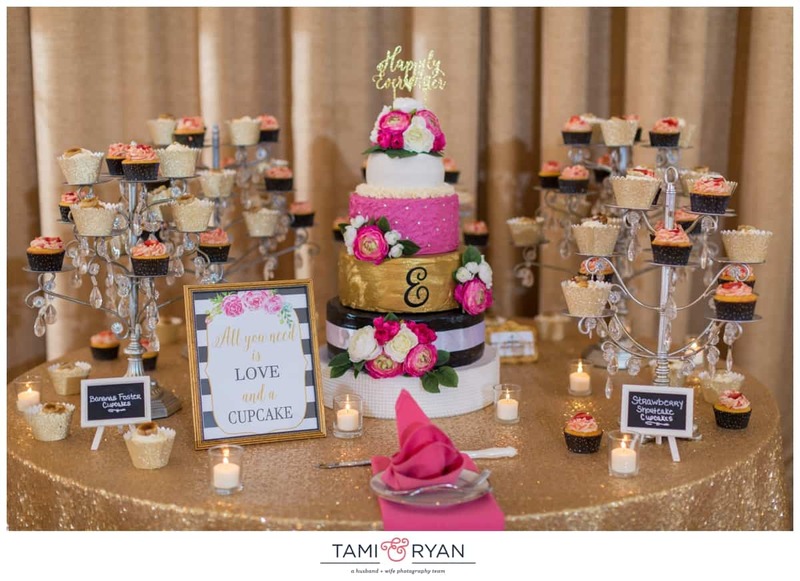 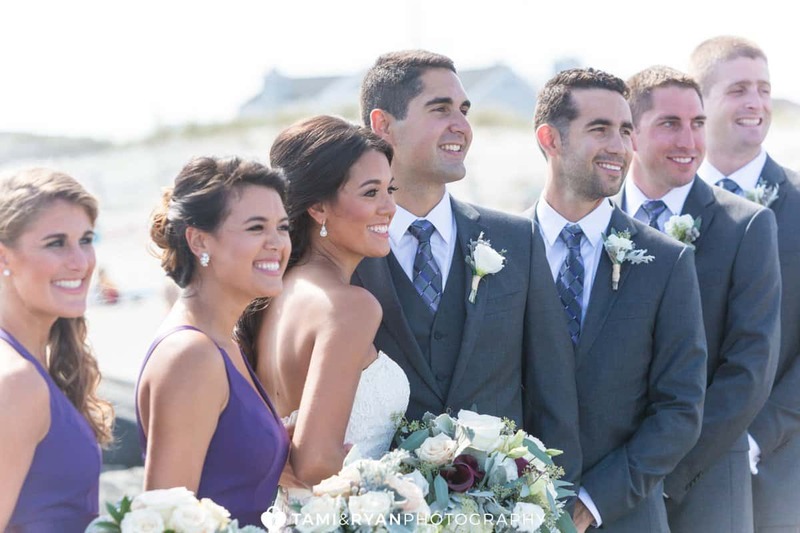 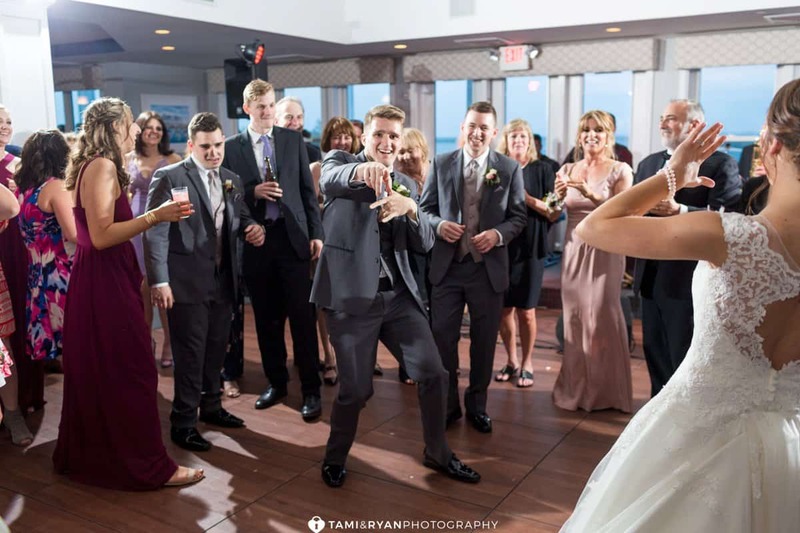 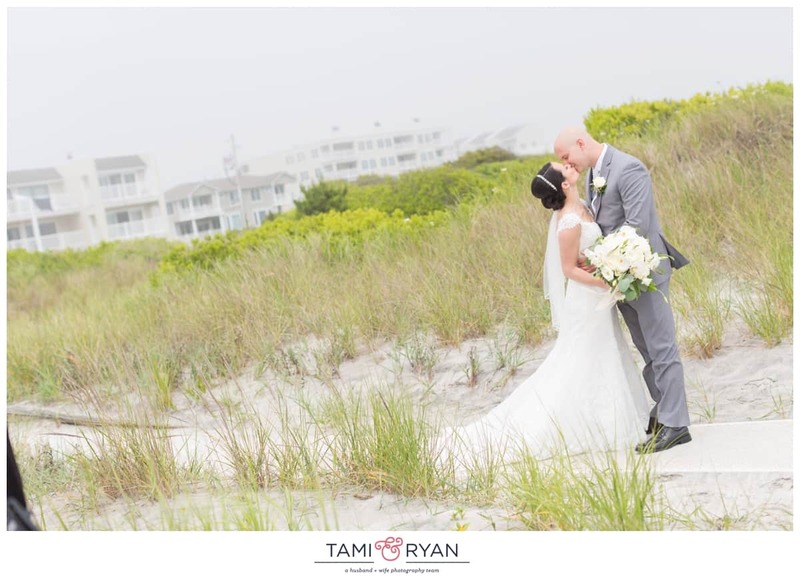 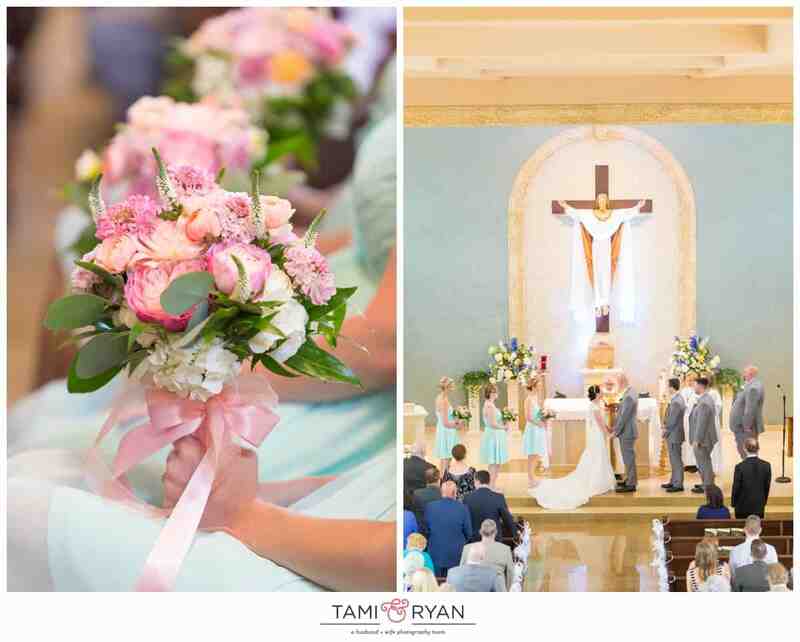 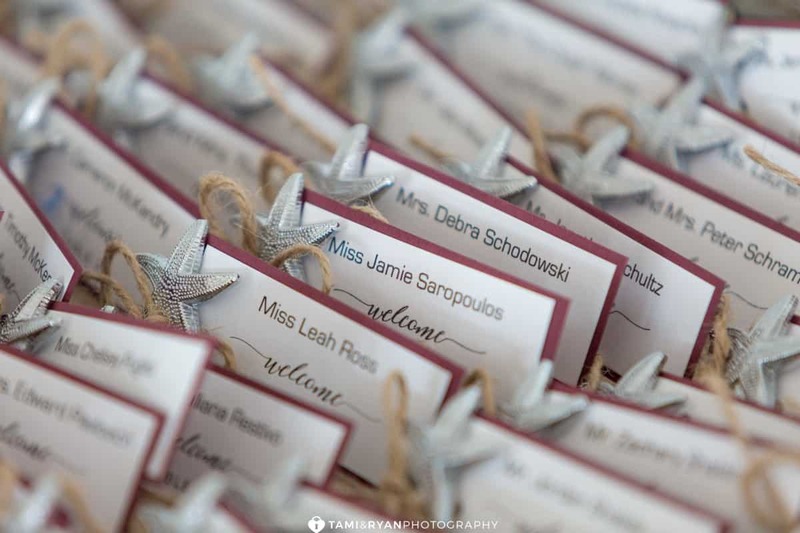 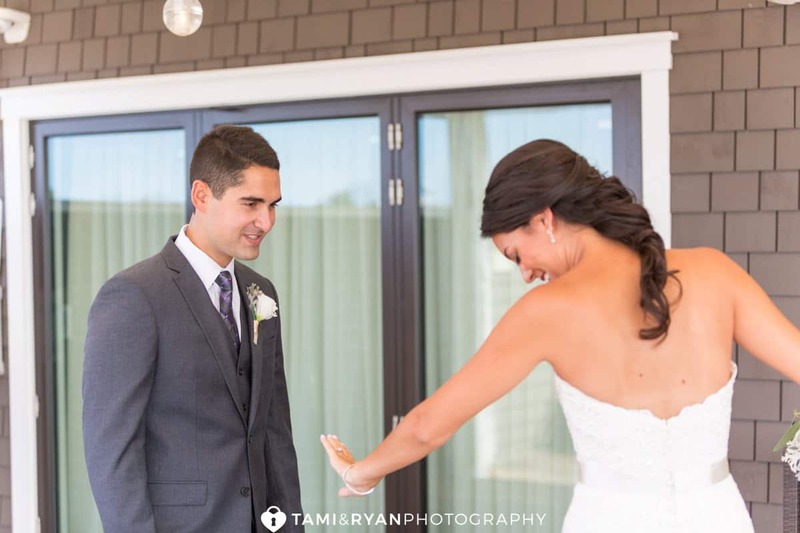 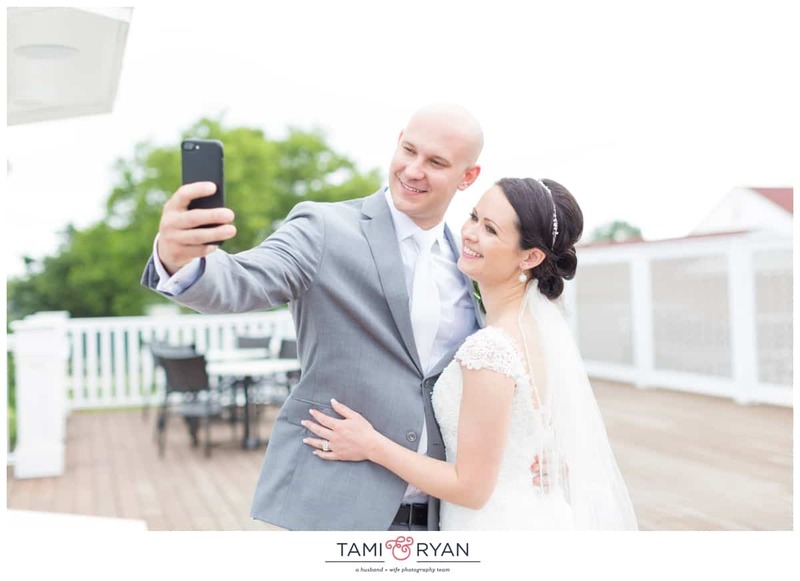 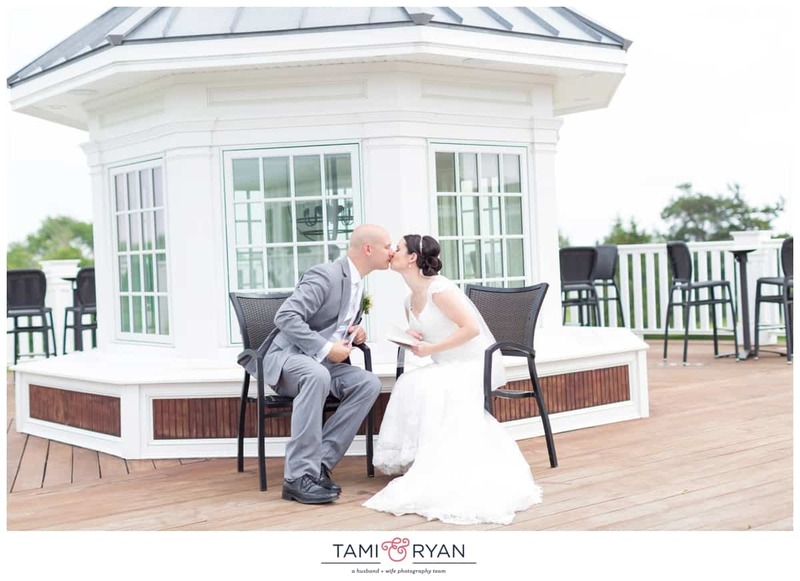 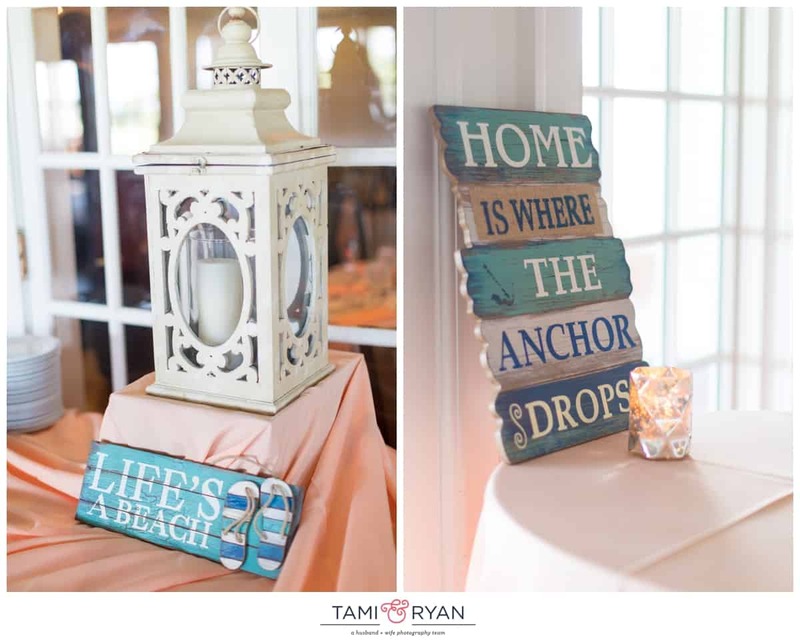 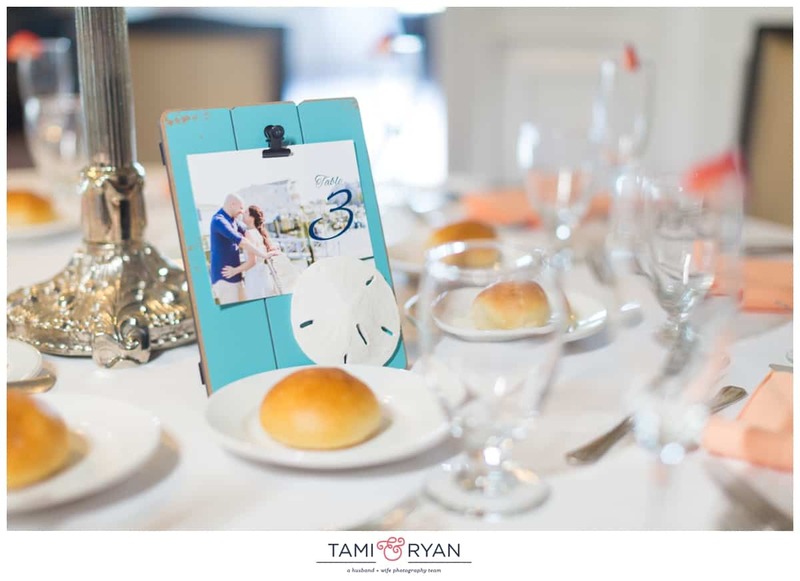 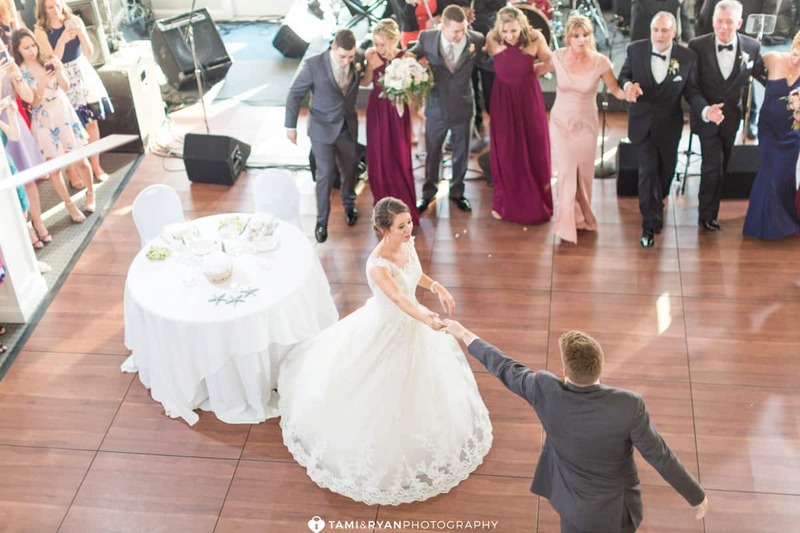 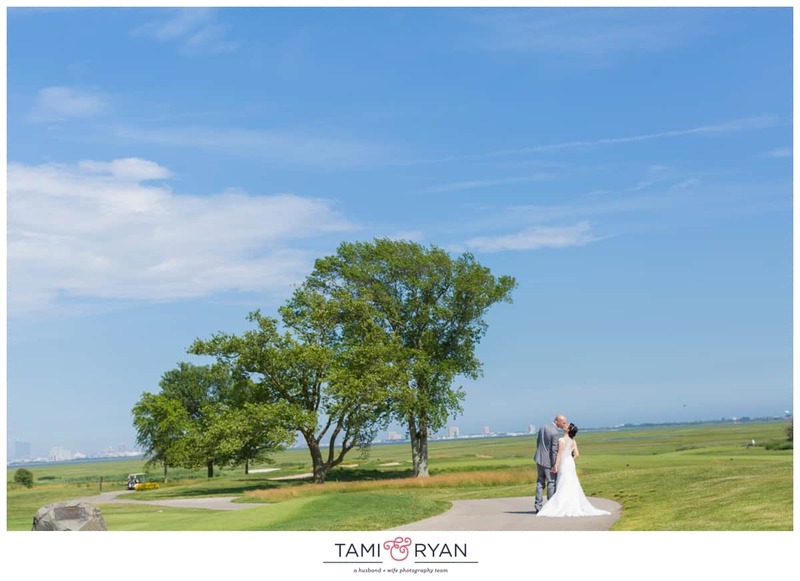 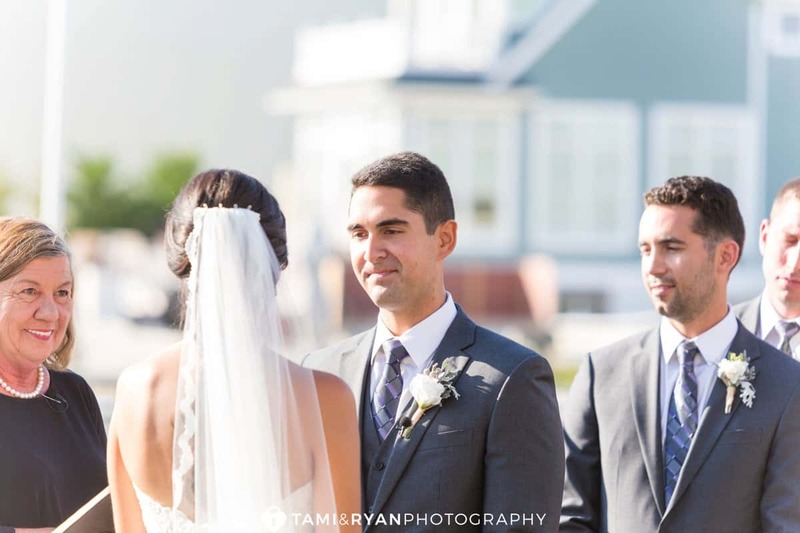 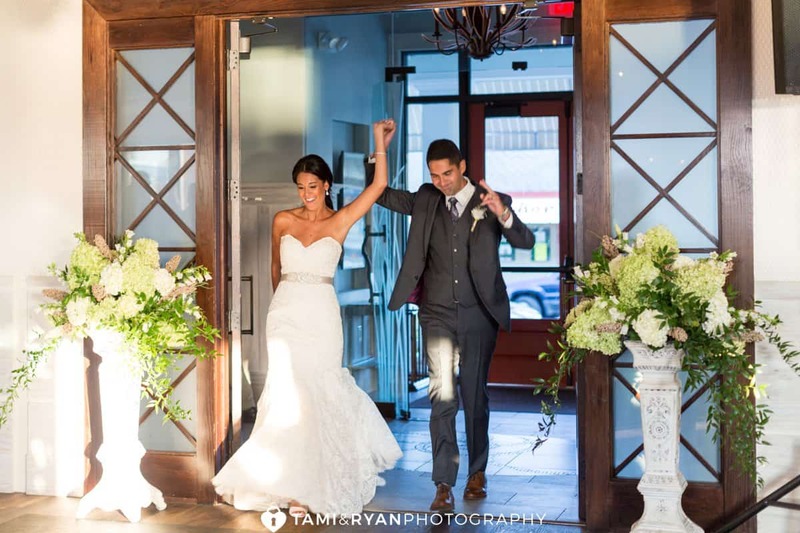 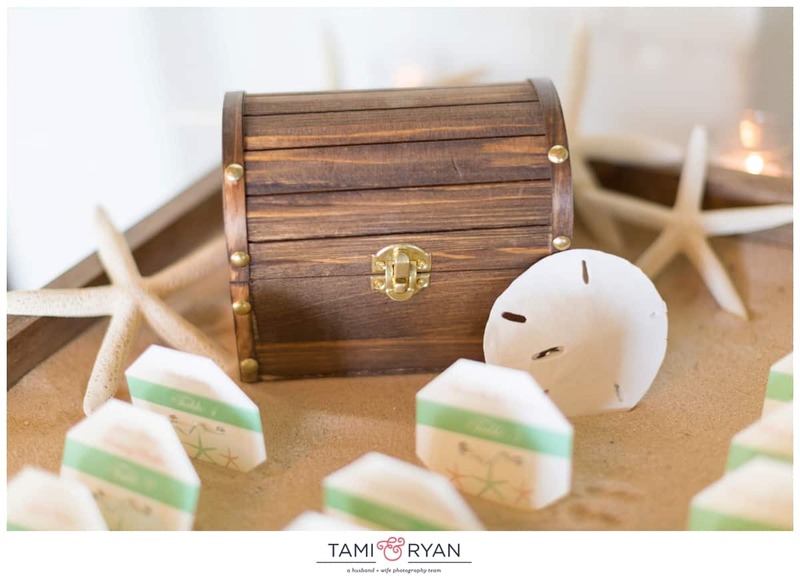 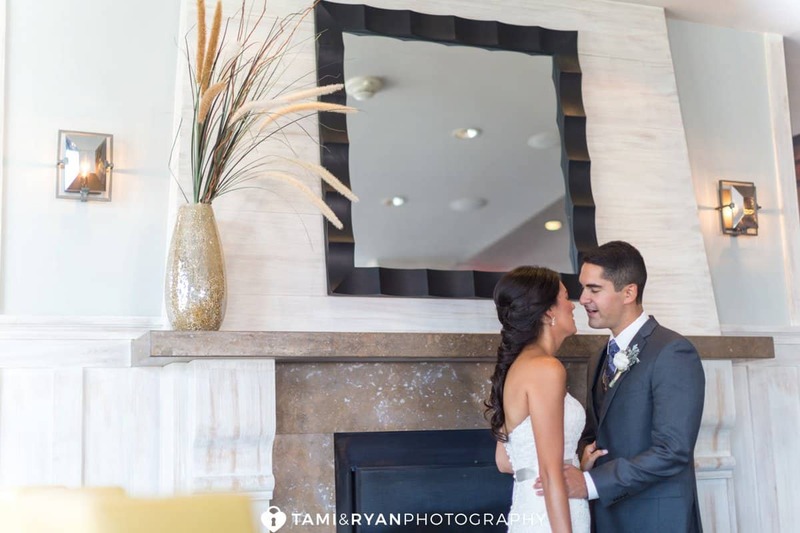 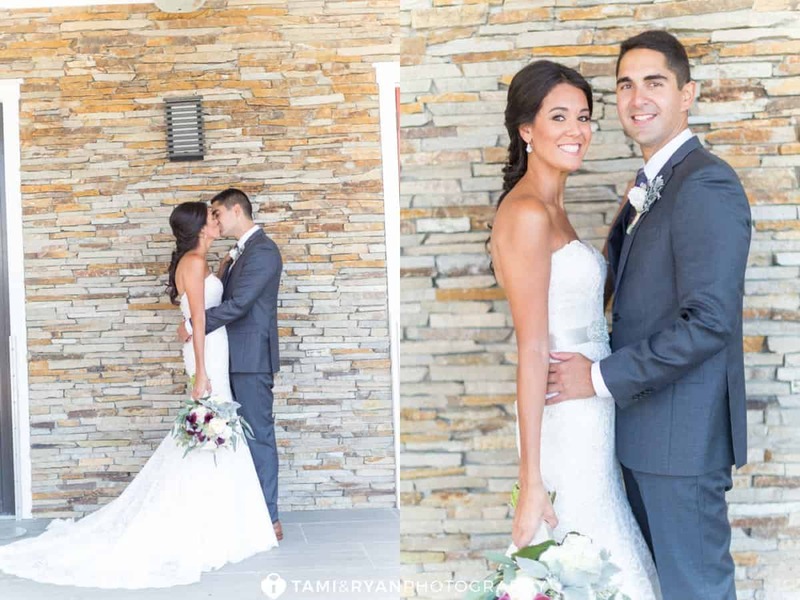 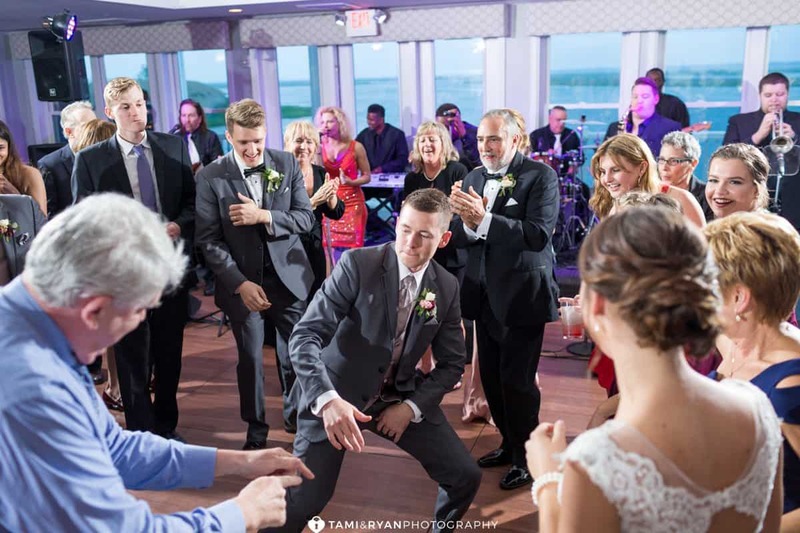 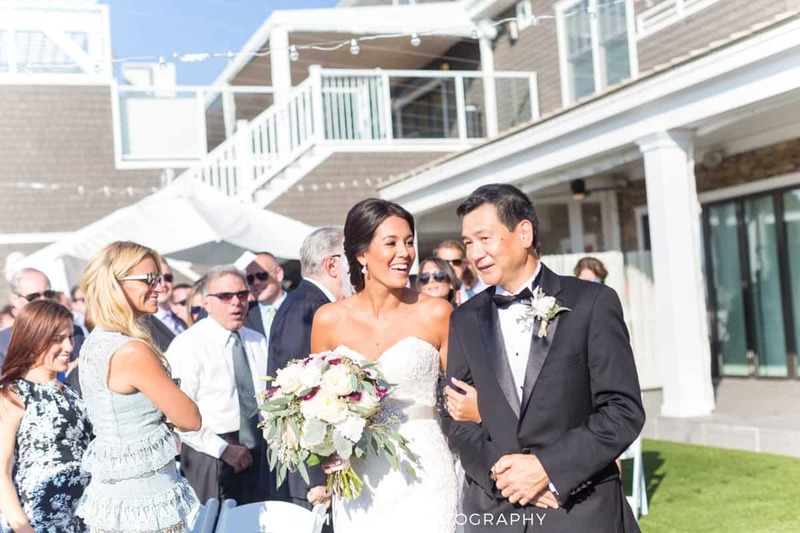 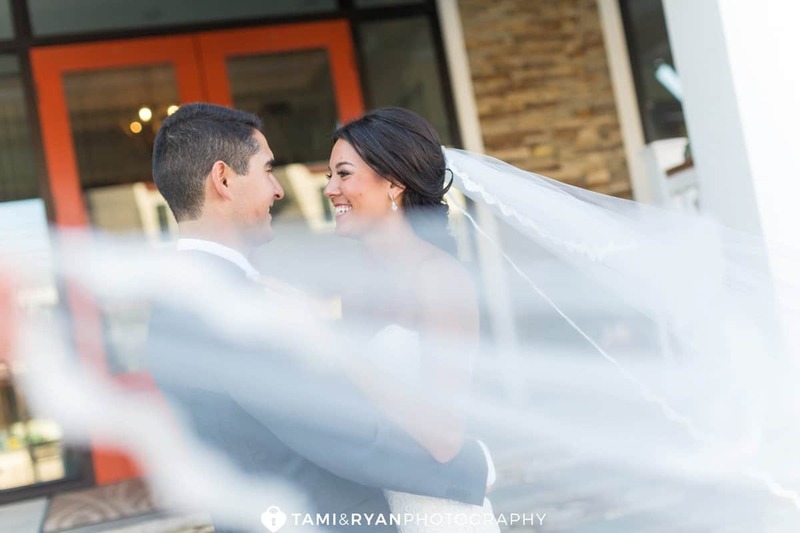 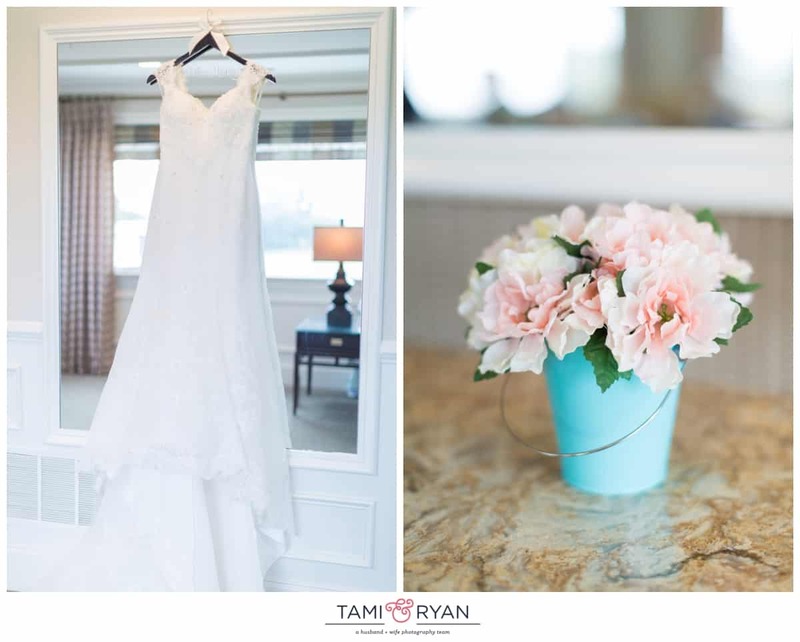 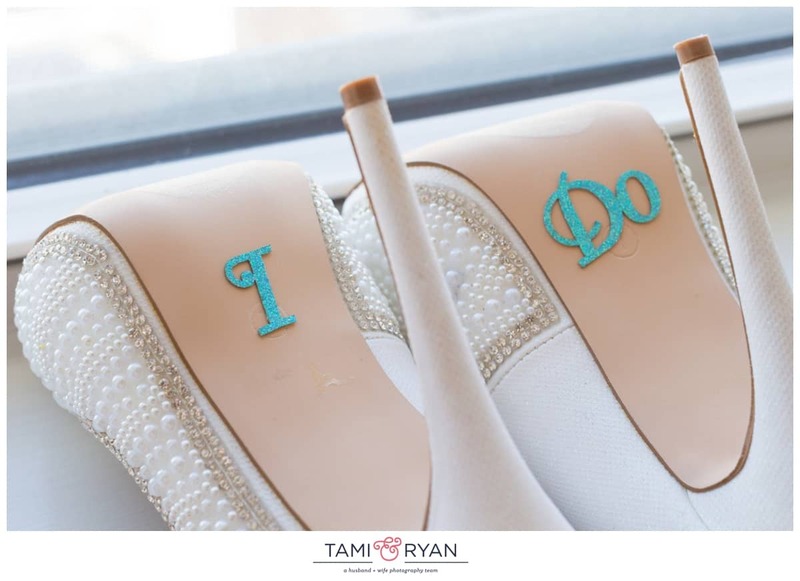 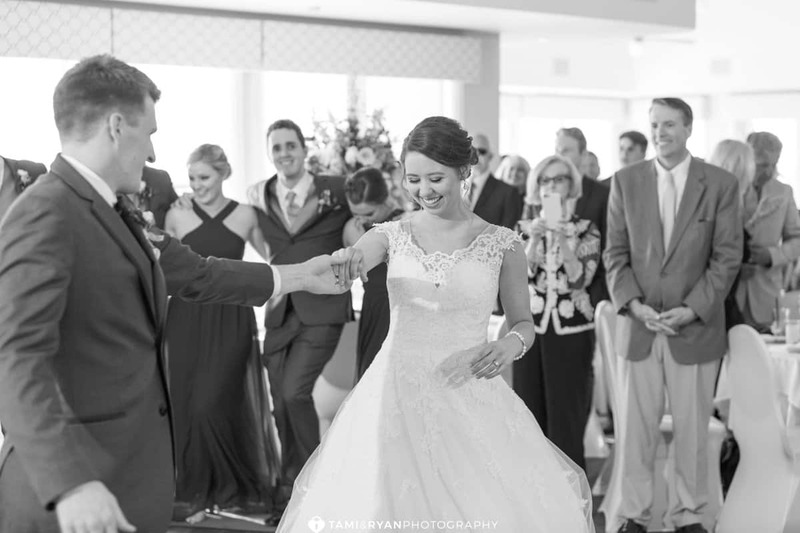 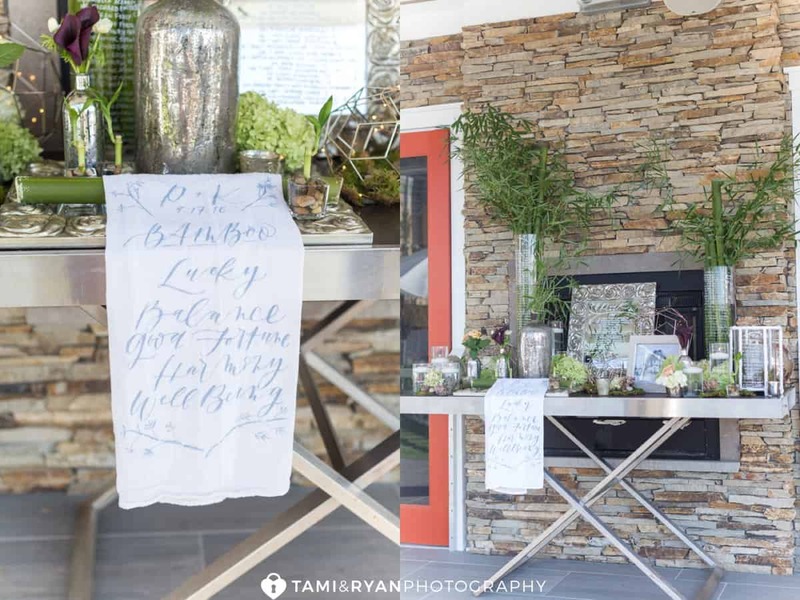 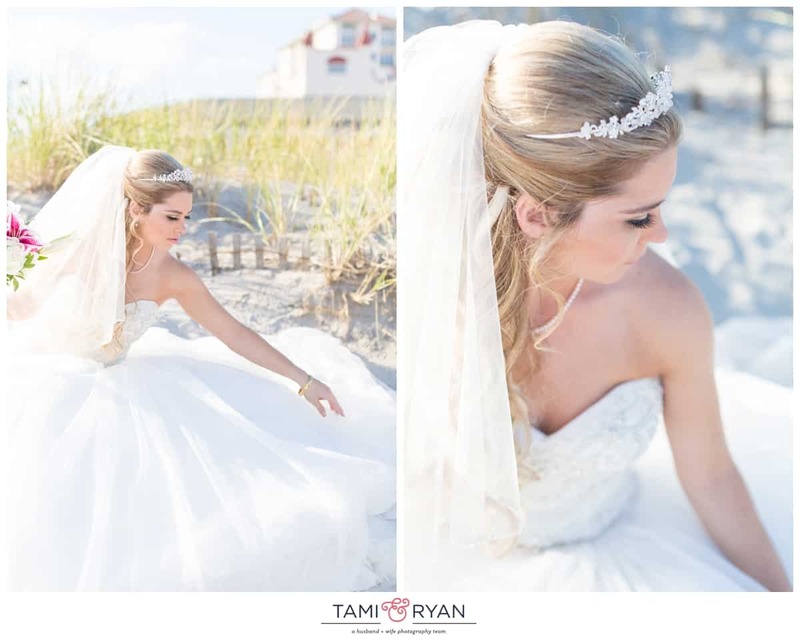 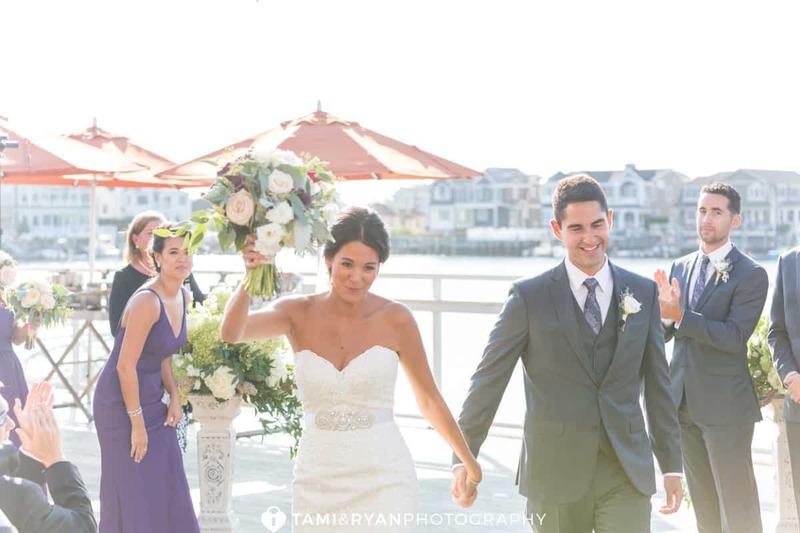 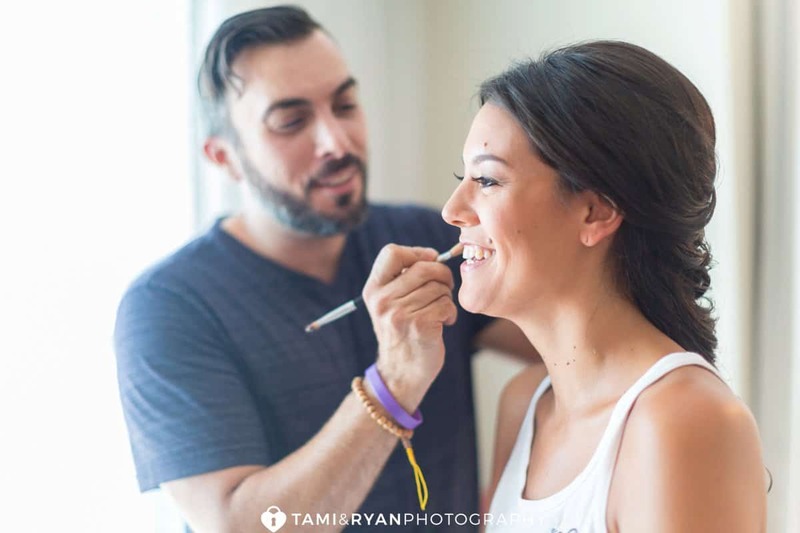 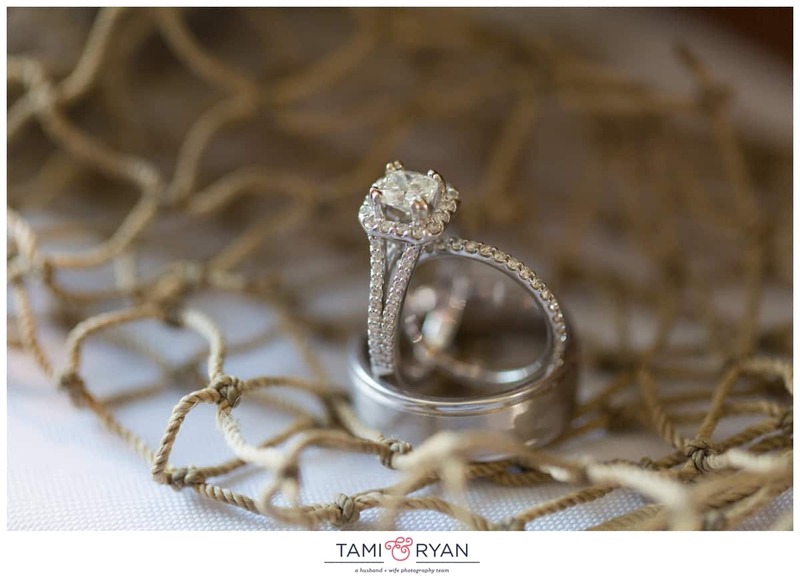 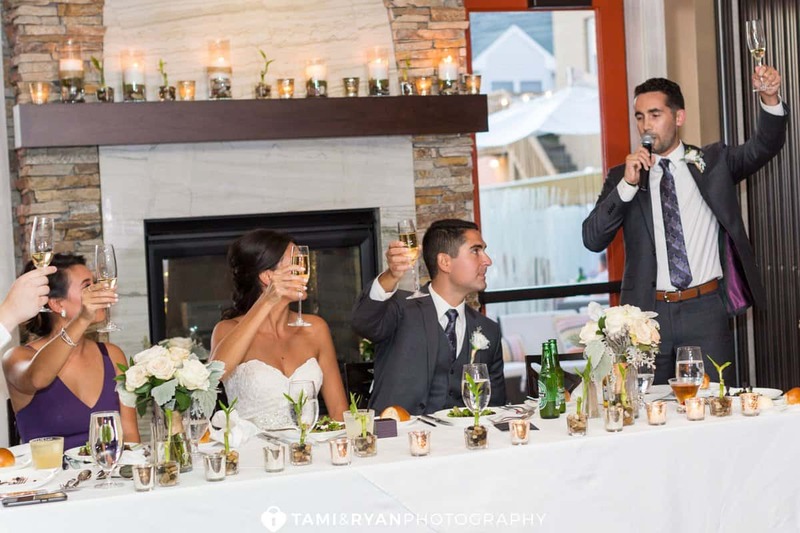 The Reeds is truly a dream venue for a Jersey Shore loving couple! 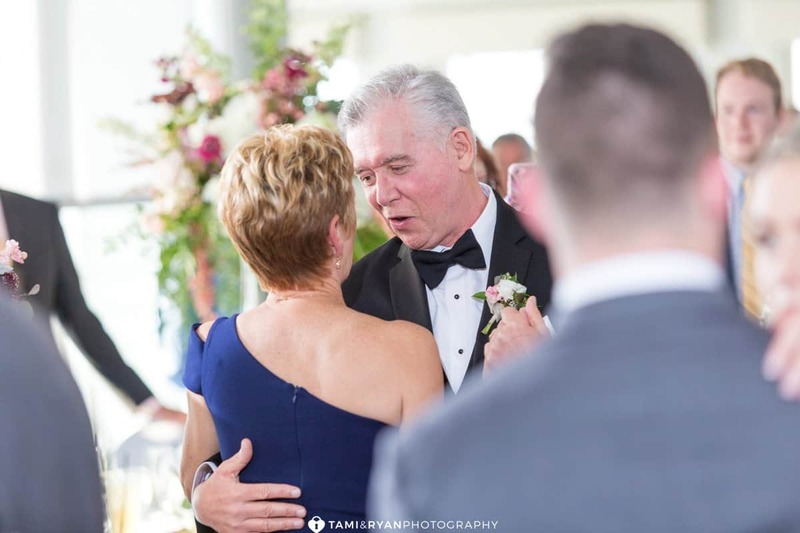 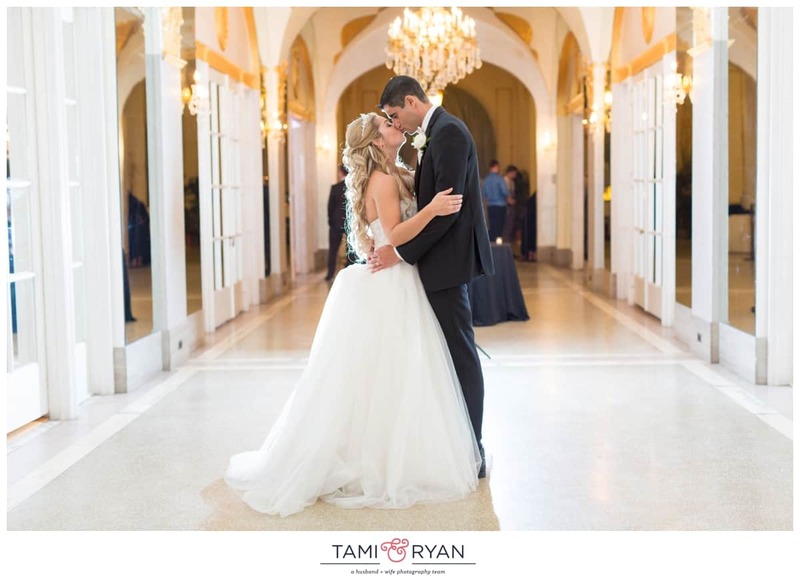 With the open-air concept of the Sweet Grass Ballroom, to saying vows on the veranda, and capturing the most perfect sunset on the bay, you really can’t dream of a more perfect place to start your forever. 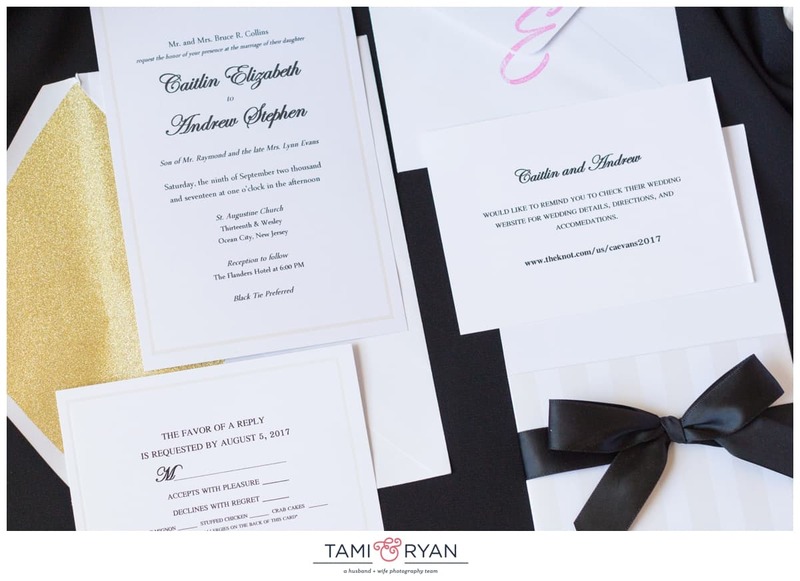 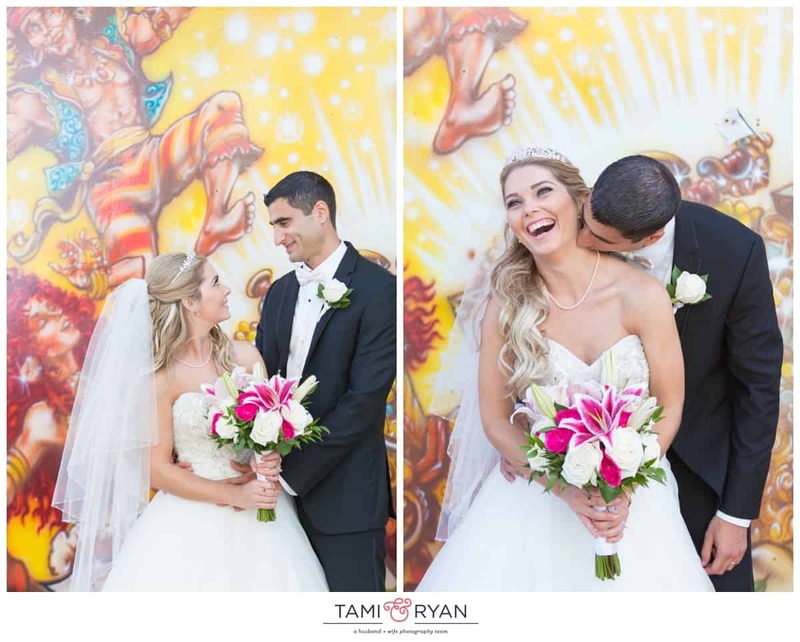 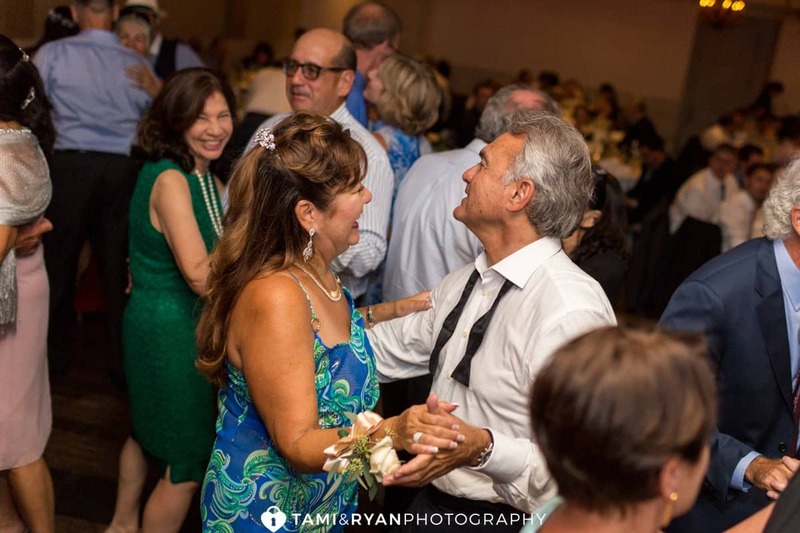 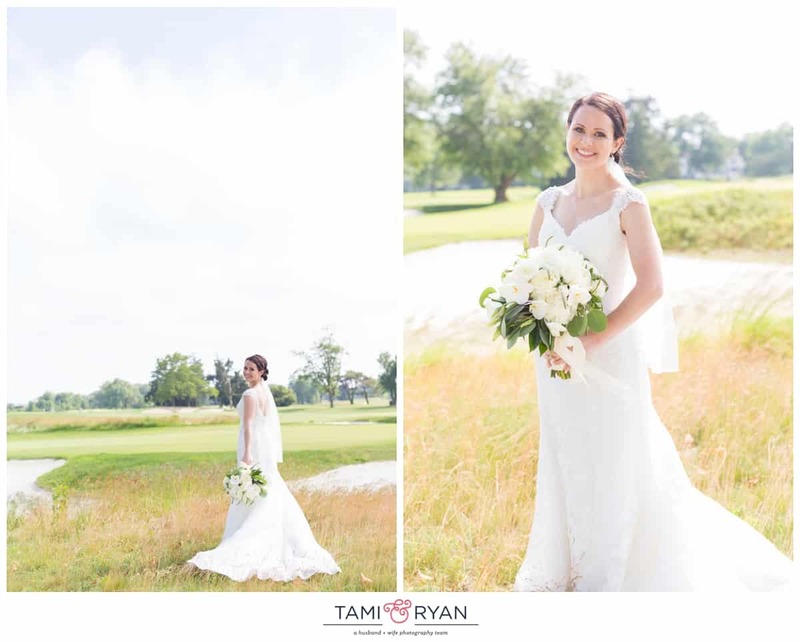 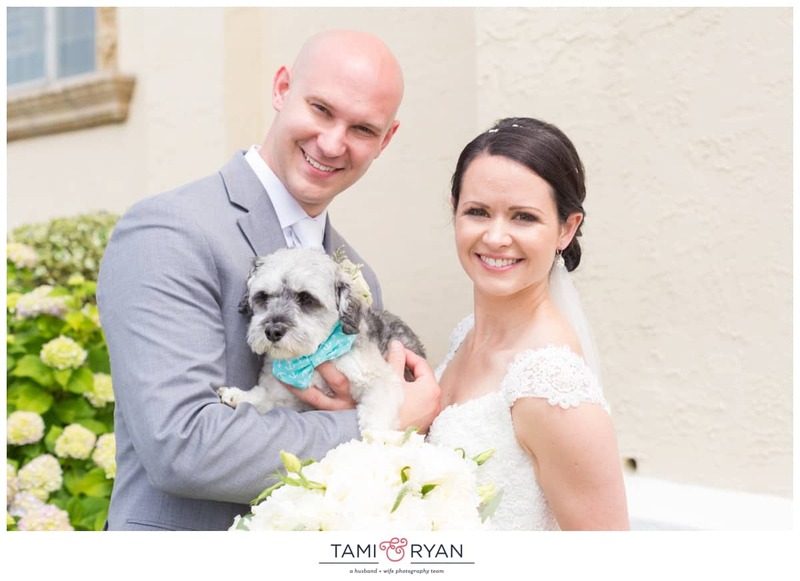 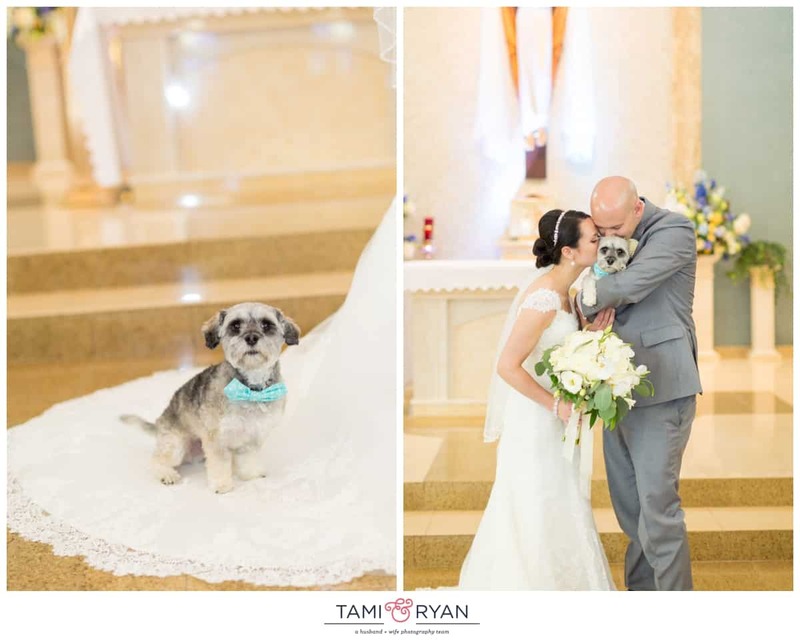 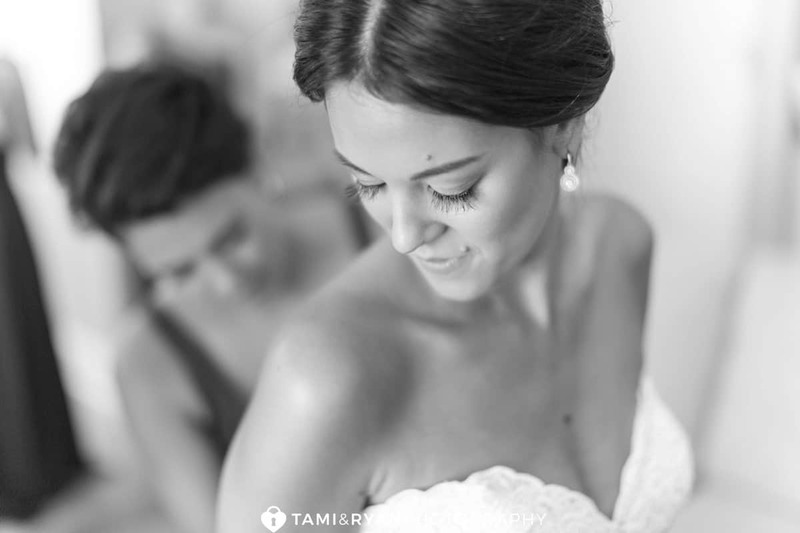 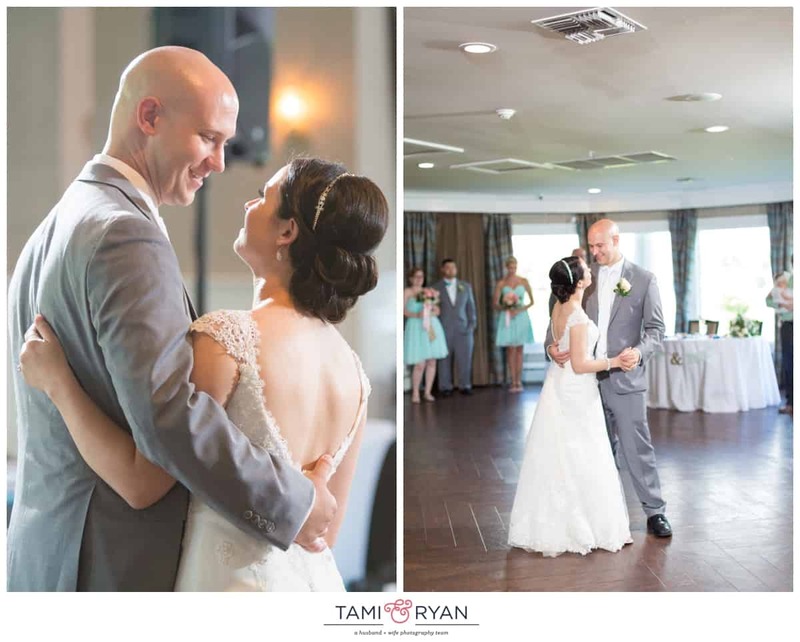 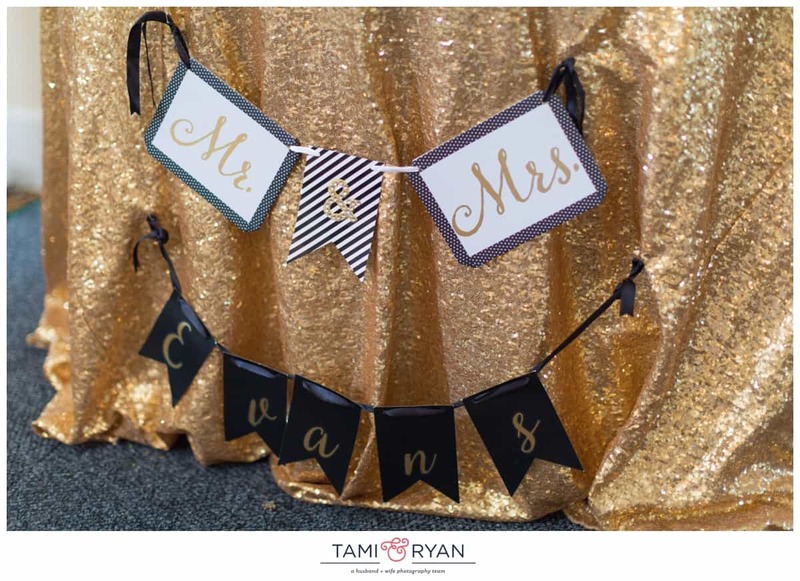 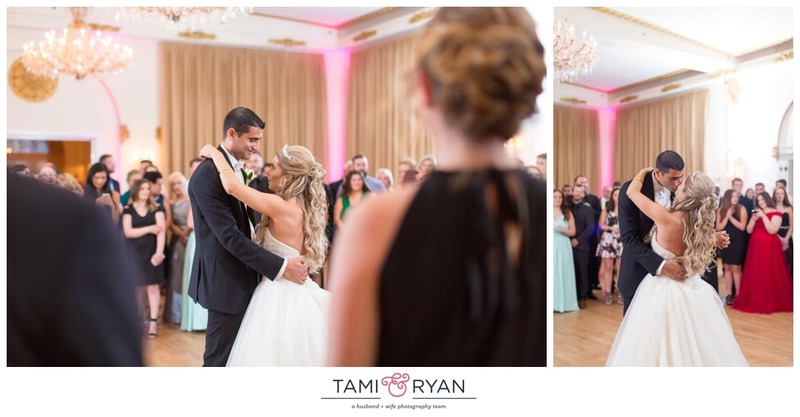 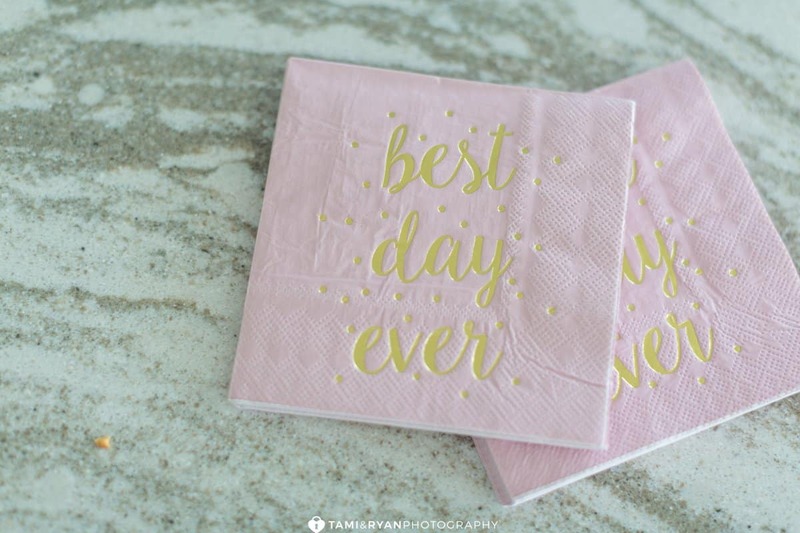 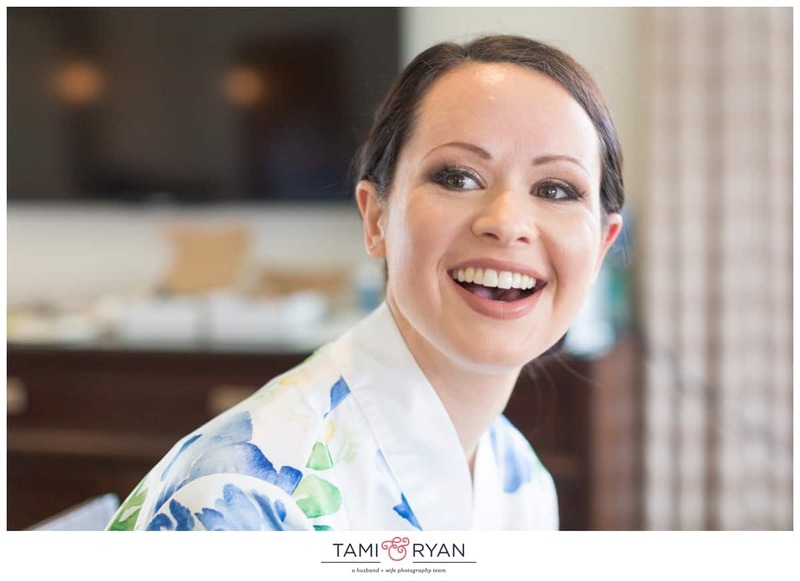 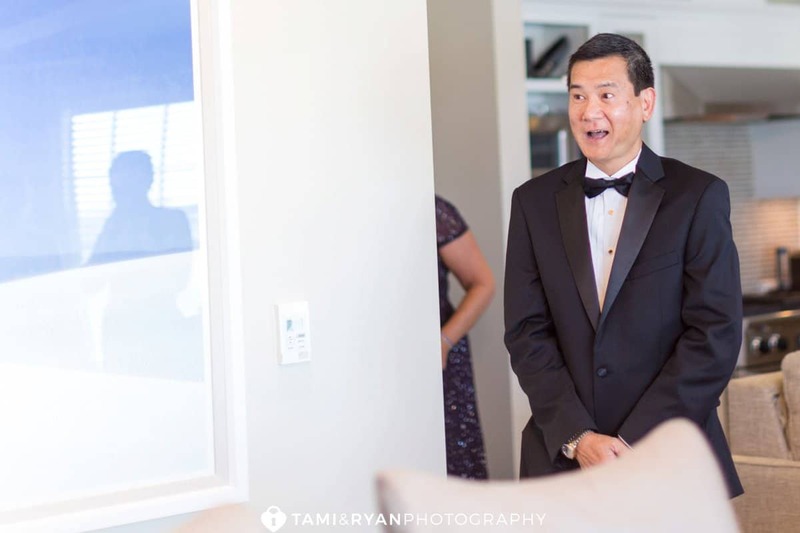 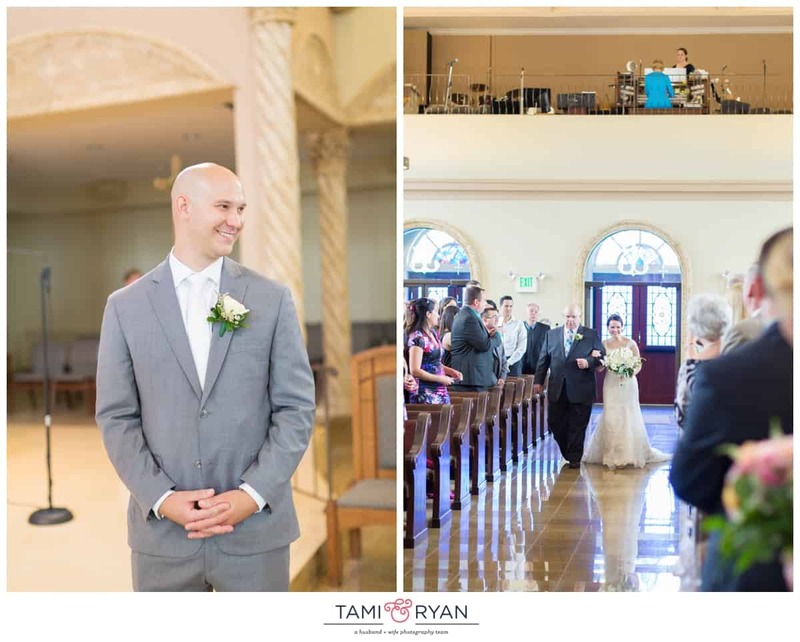 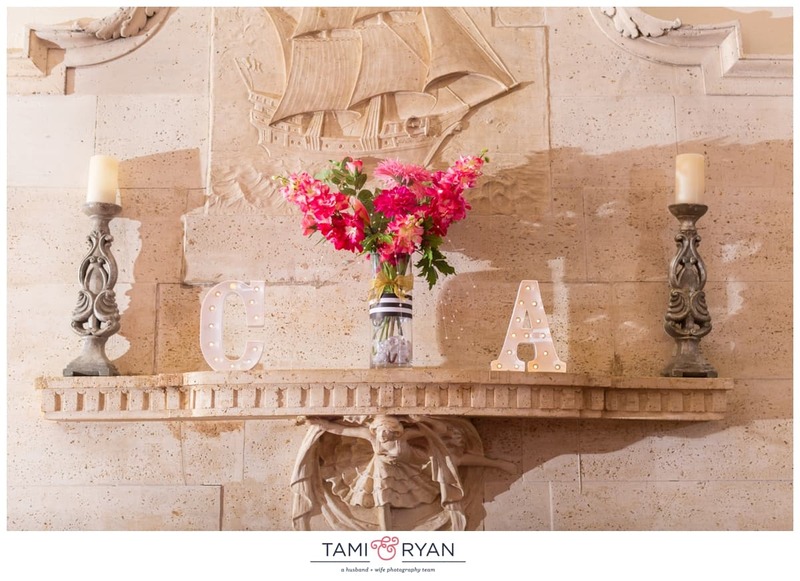 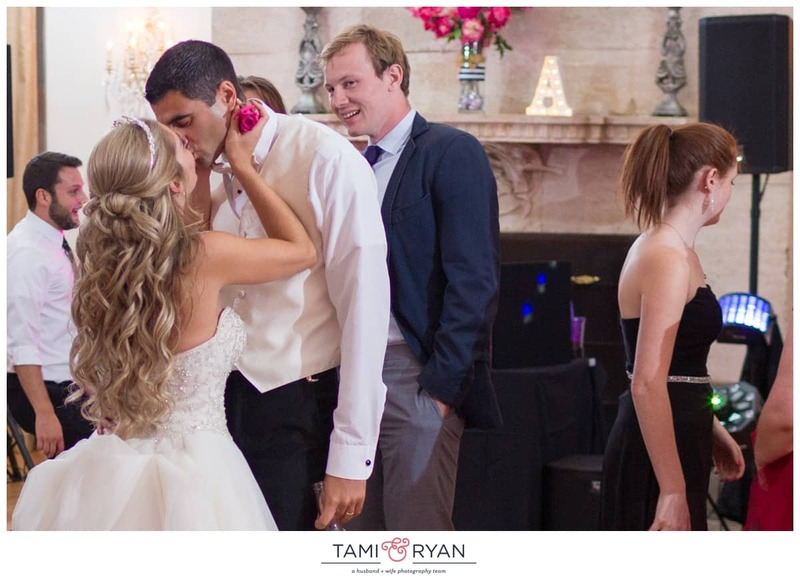 Kensi & Peter’s day was not only full of love and romance, but also full of laughter, fun and celebration! 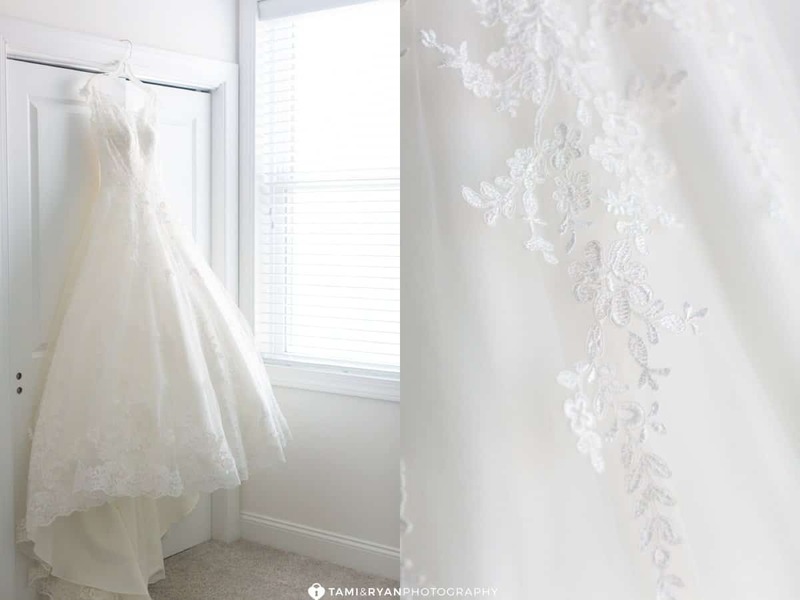 Kensi’s bridal gown was purchased at the famous New York City bridal shop Kleinfeld’s. 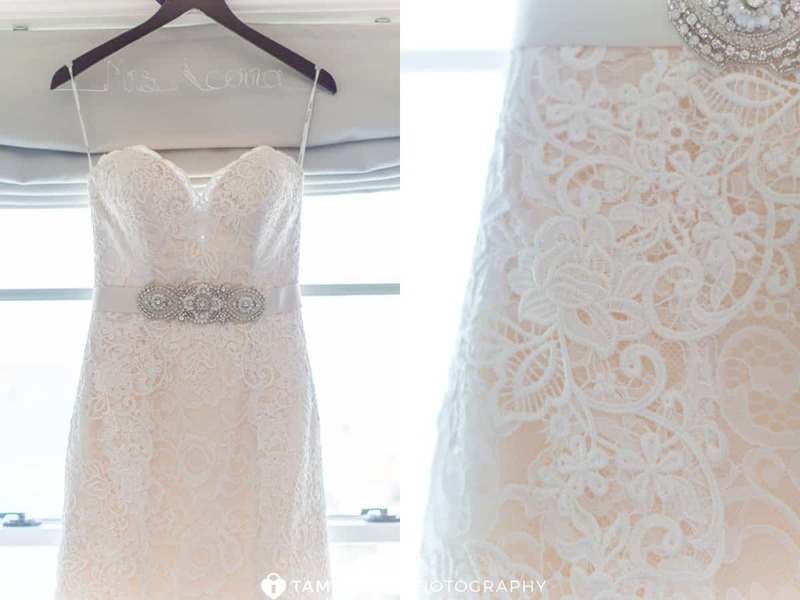 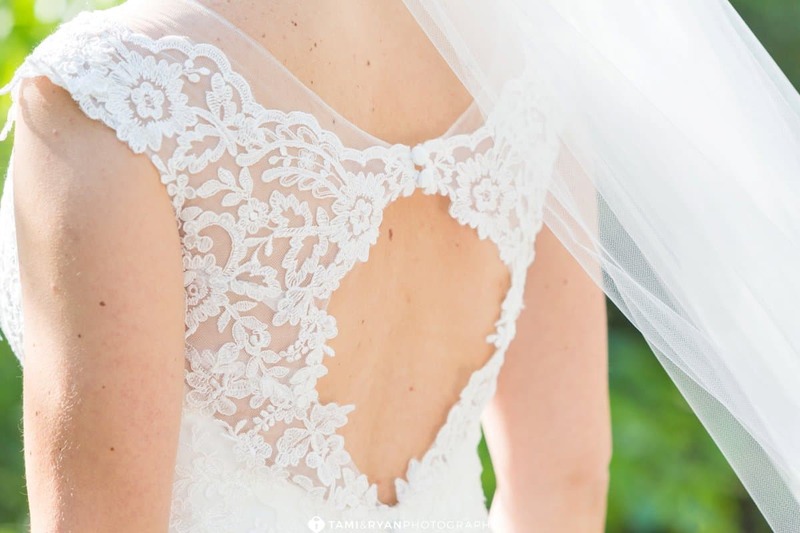 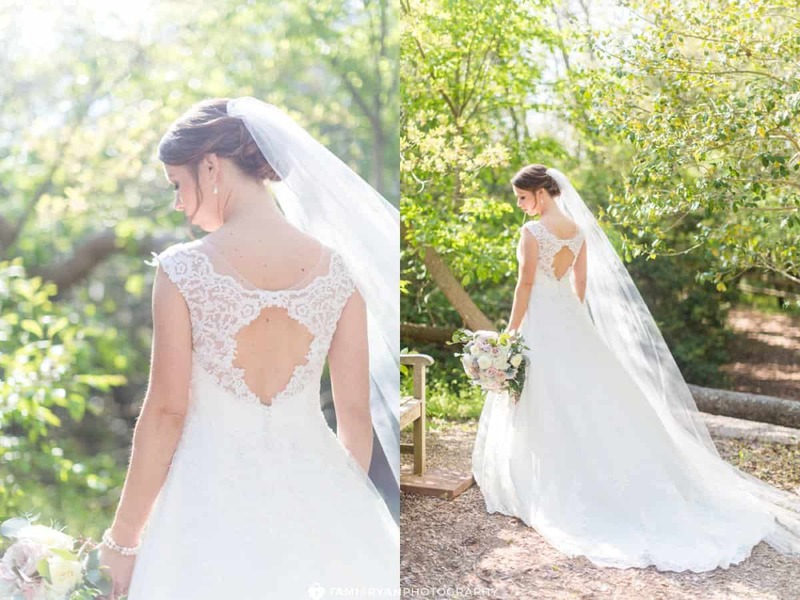 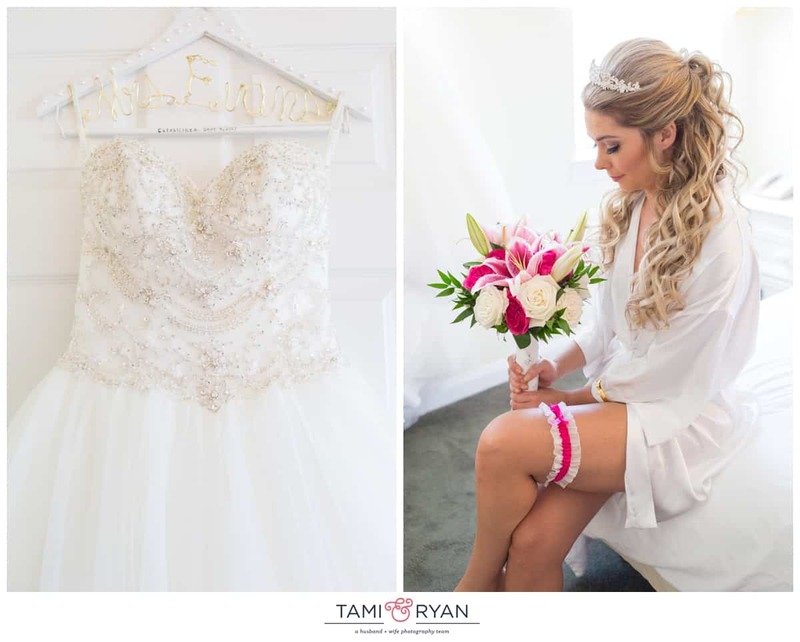 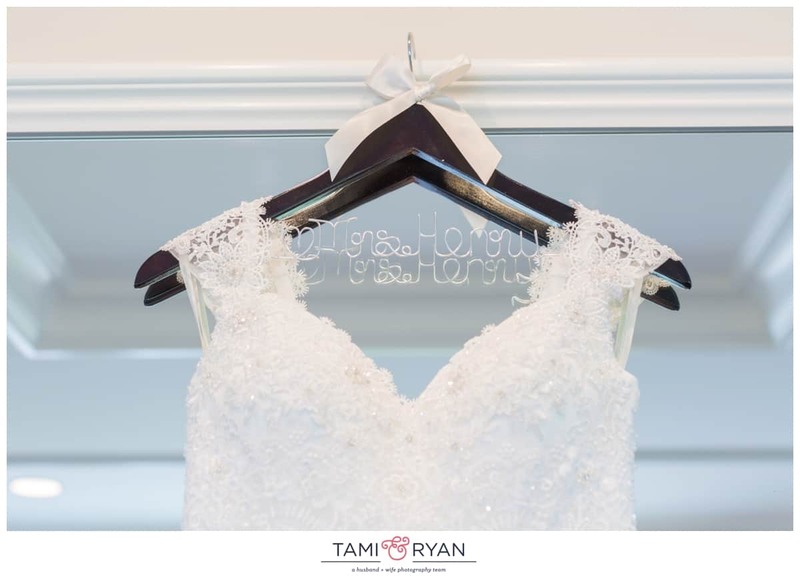 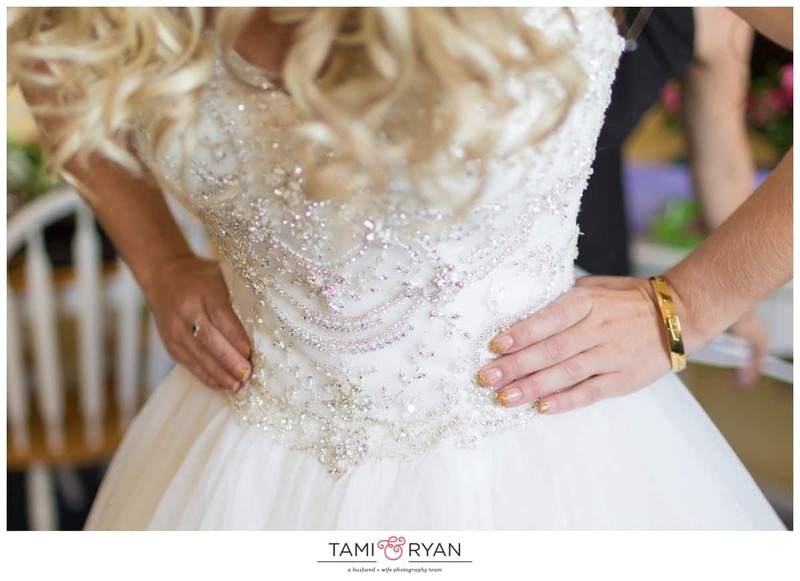 It was a beautiful, lace trumpet dress with a simple, classic belt along the waistline. 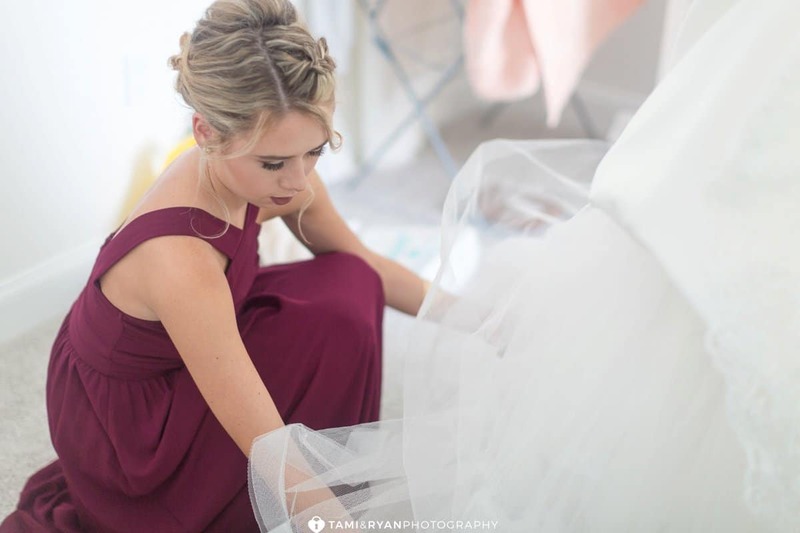 Kensit looked absolutely gorgeous, and the dress fit her like a glove. 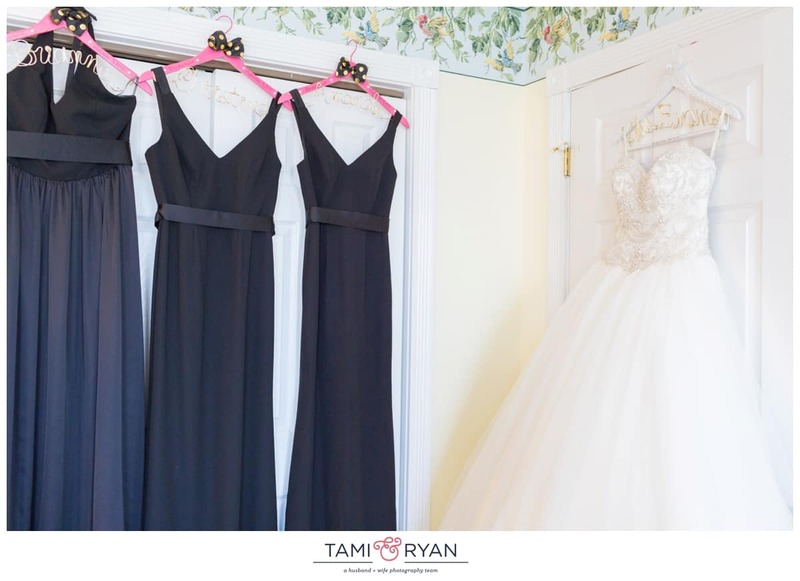 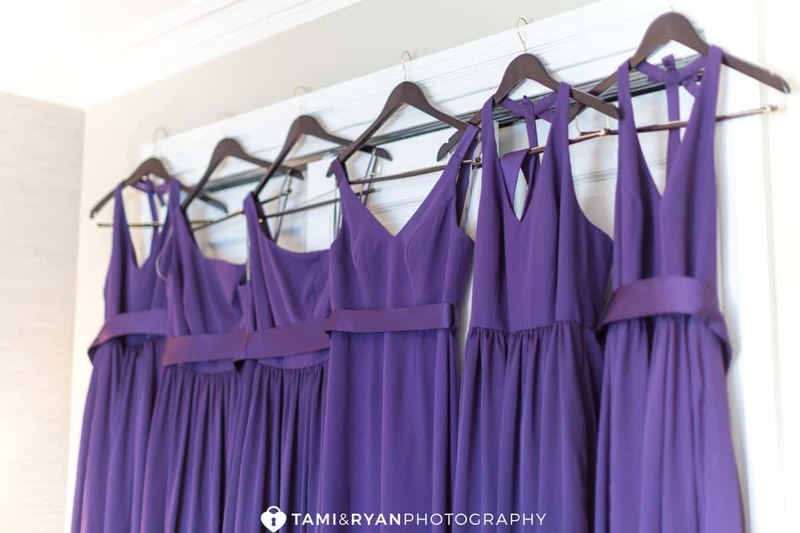 The bridesmaids dresses were from the Vera Wang White Collection, and the color purple she chose looked fabulous on each girl. 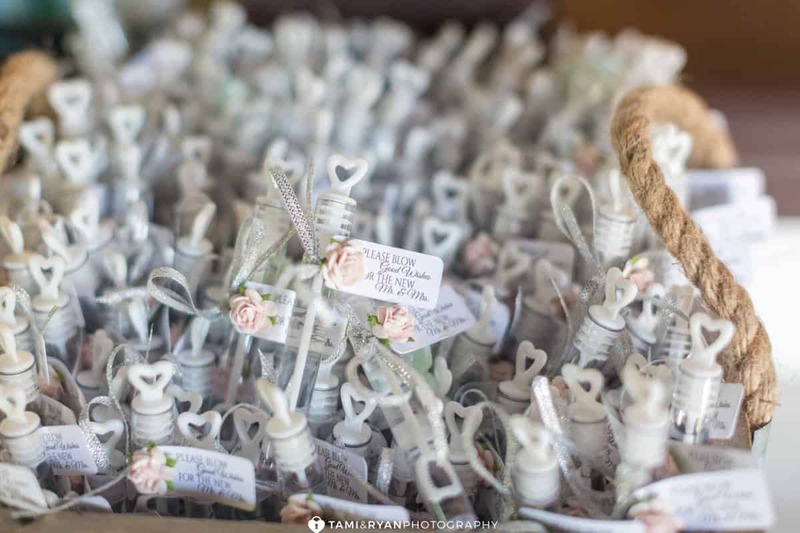 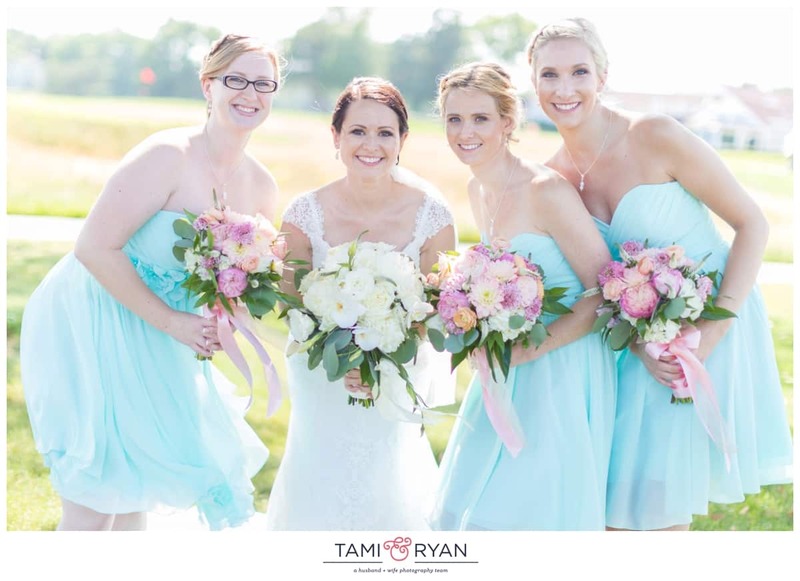 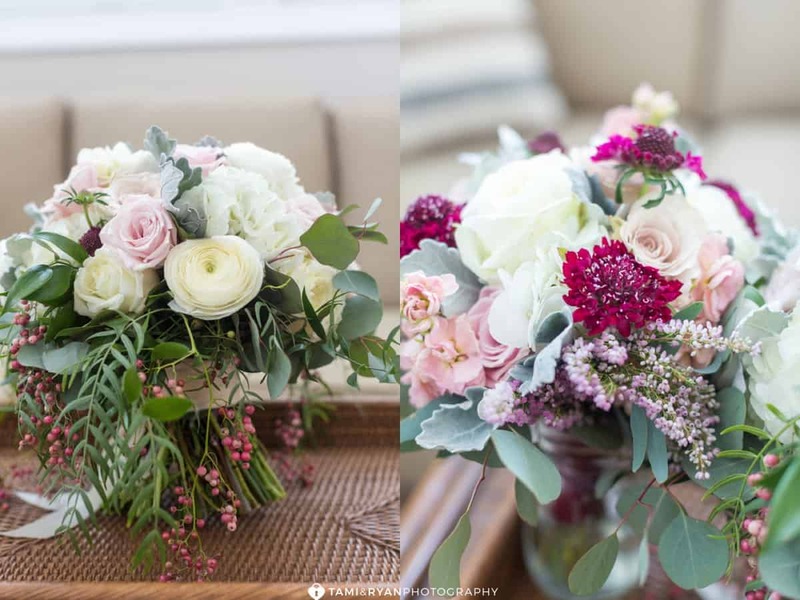 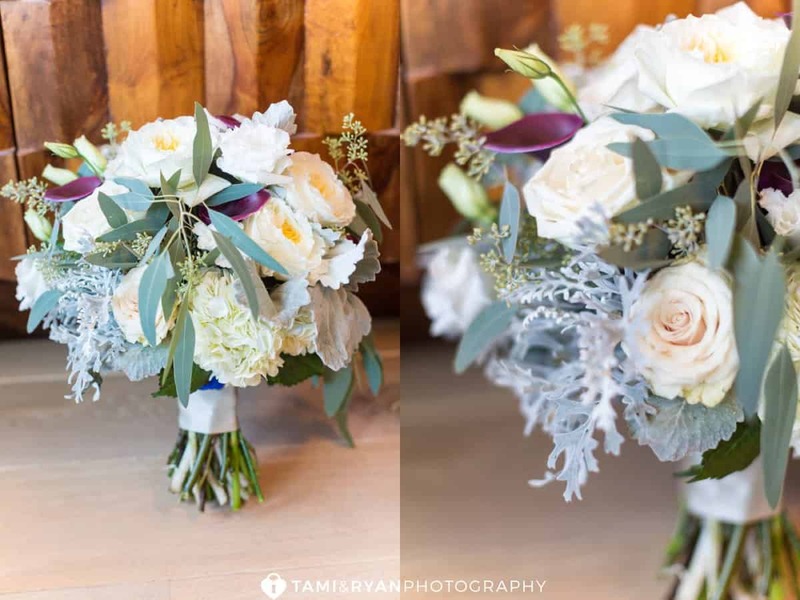 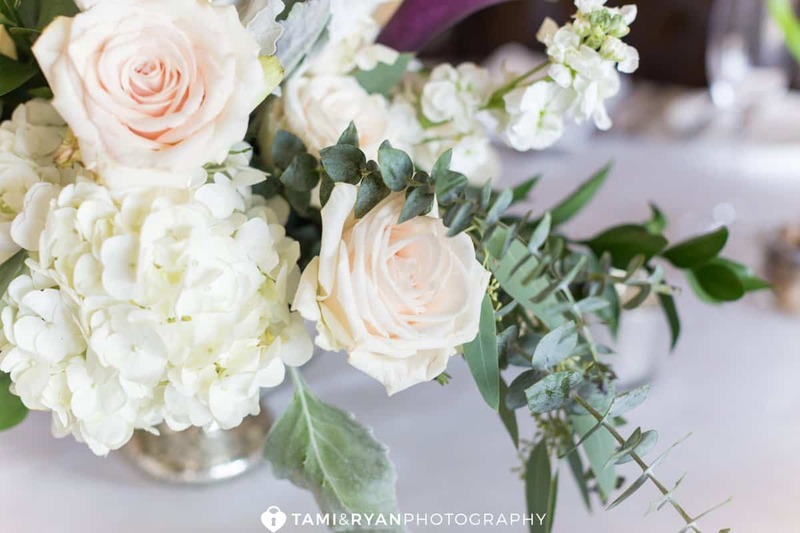 The finishing touch for each lady was the gorgeous floral bouquets designed by Michelle at Primrose and Company. 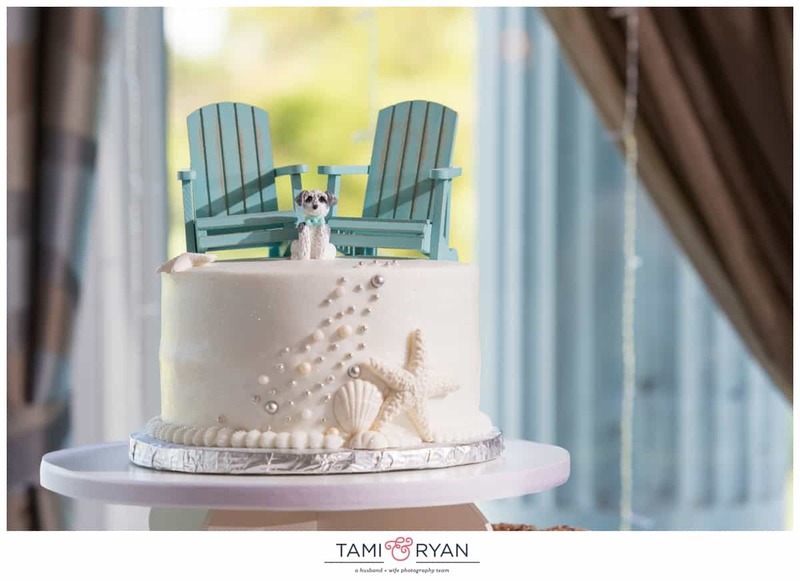 Michelle is so creative, and never disappoints! 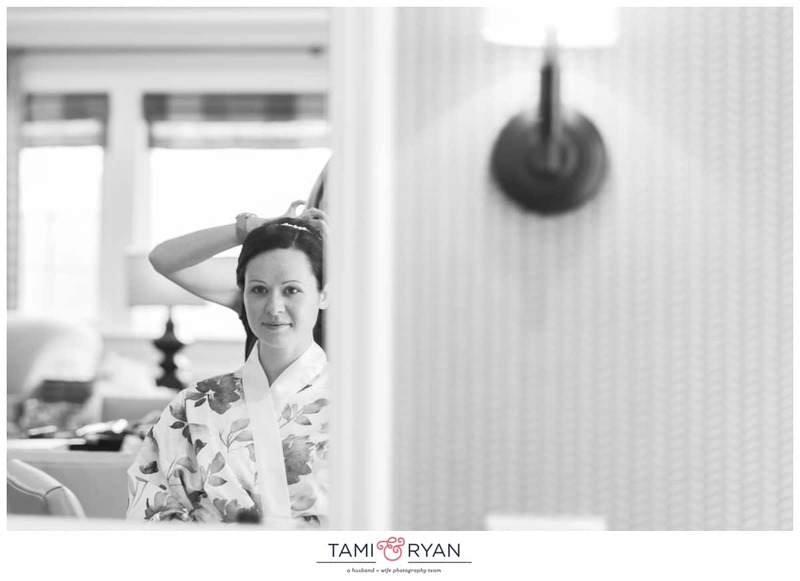 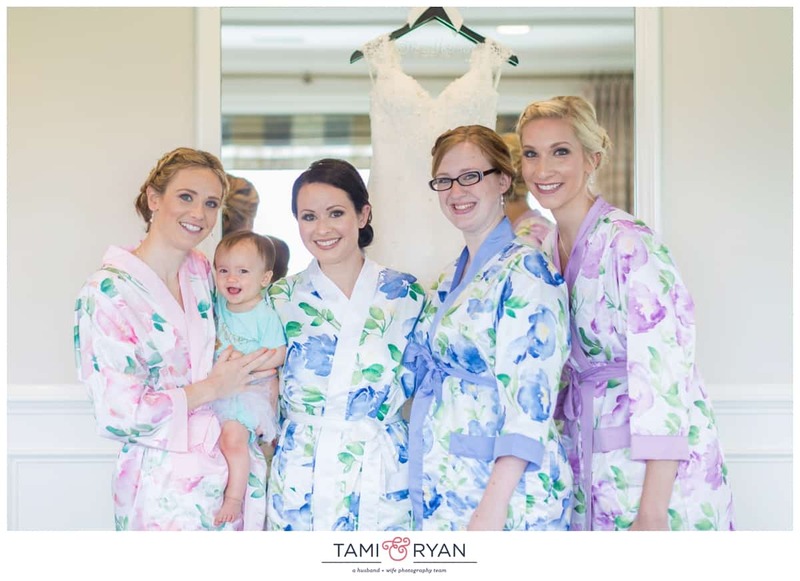 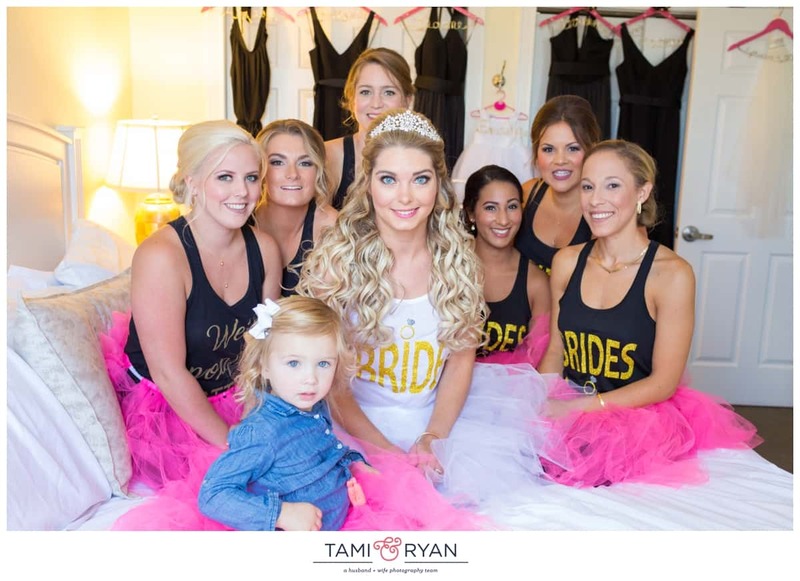 Kensi and her bridesmaids got ready in one of the Superior Suites at The Reeds. 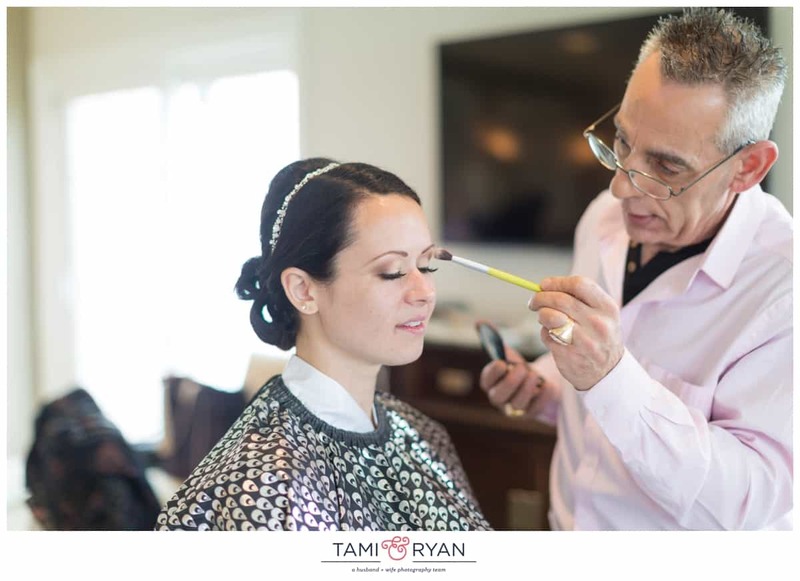 There was so much room for everyone to be able to spread out, relax and get pampered with professional hair and makeup. 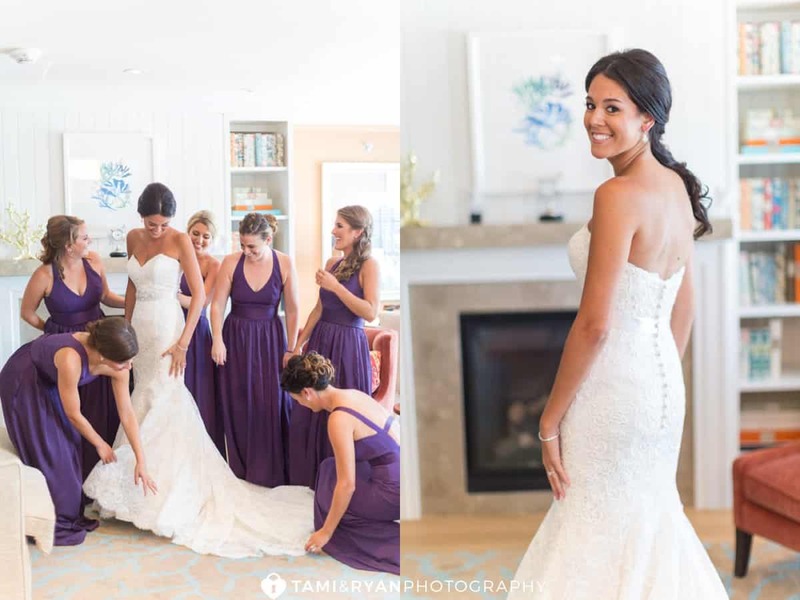 All of the ladies were by Kensi’s side all morning, assuring her that the day would be perfection. 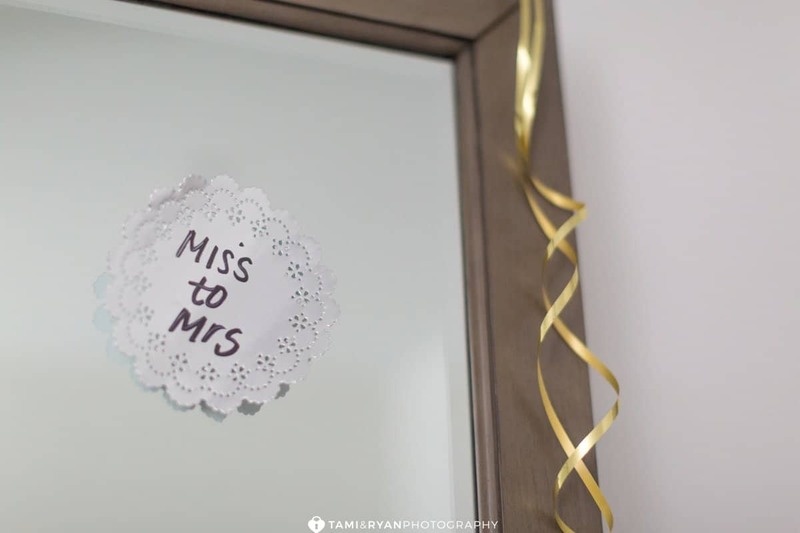 (Spoiler alert – it totally was!) 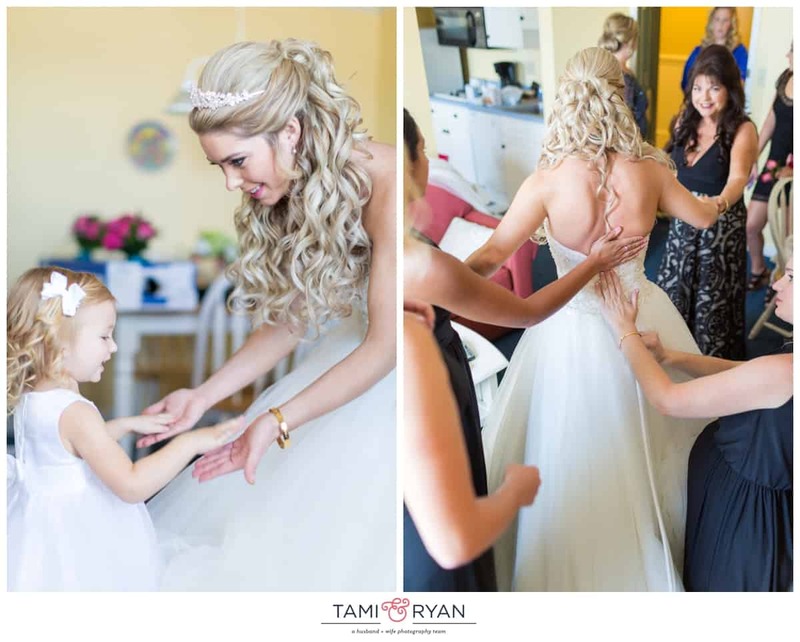 Kensi’s sister Mariya helped her to get in her dress, and make sure everything looked beautiful before seeing her Dad and Peter! 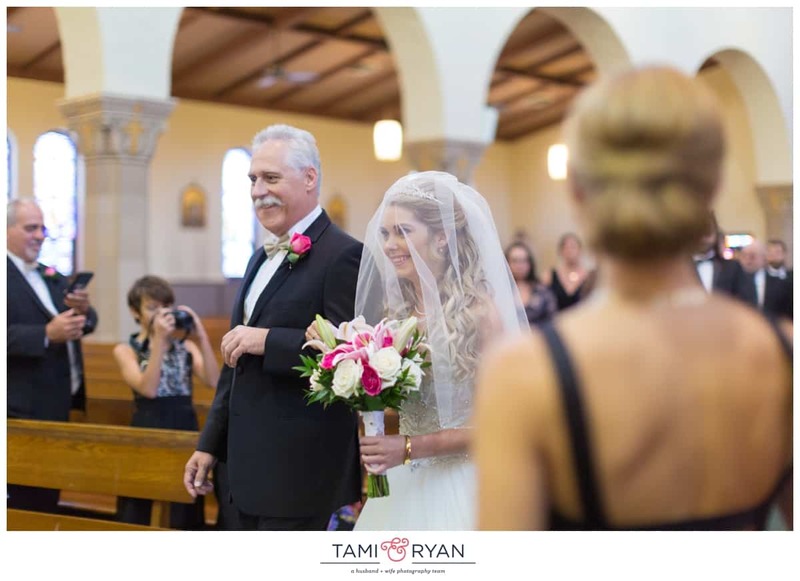 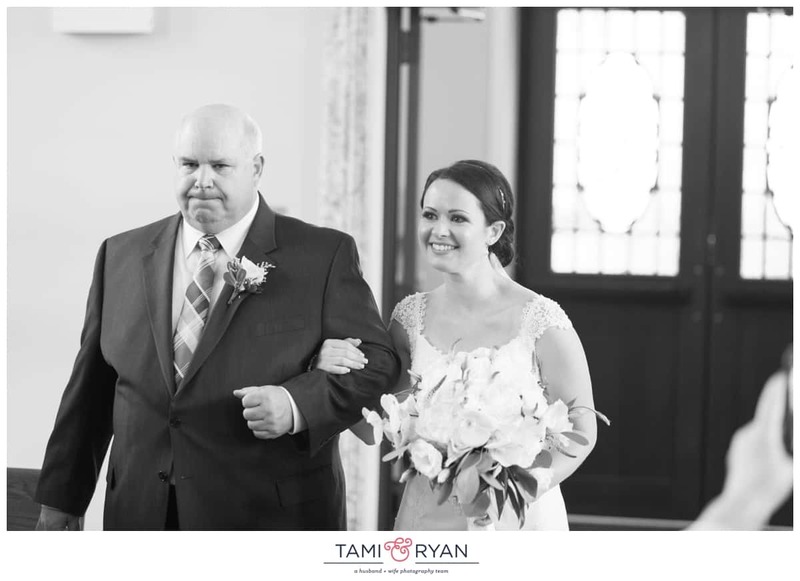 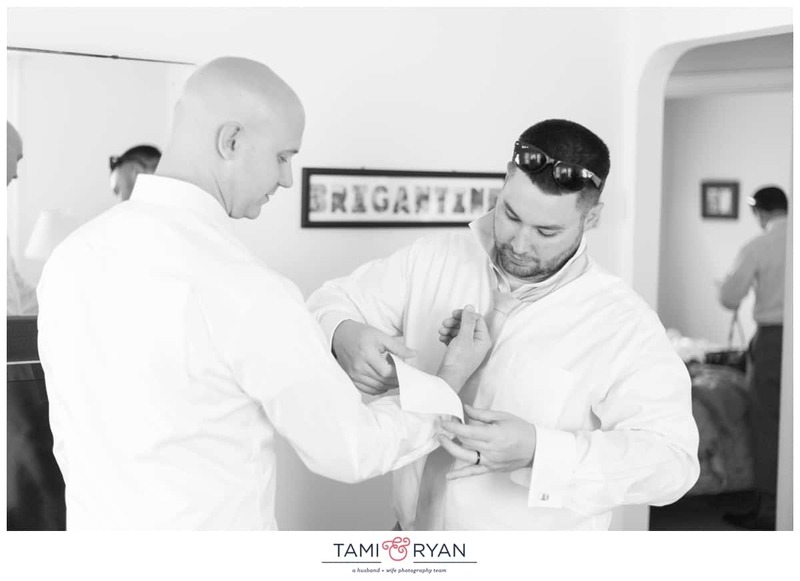 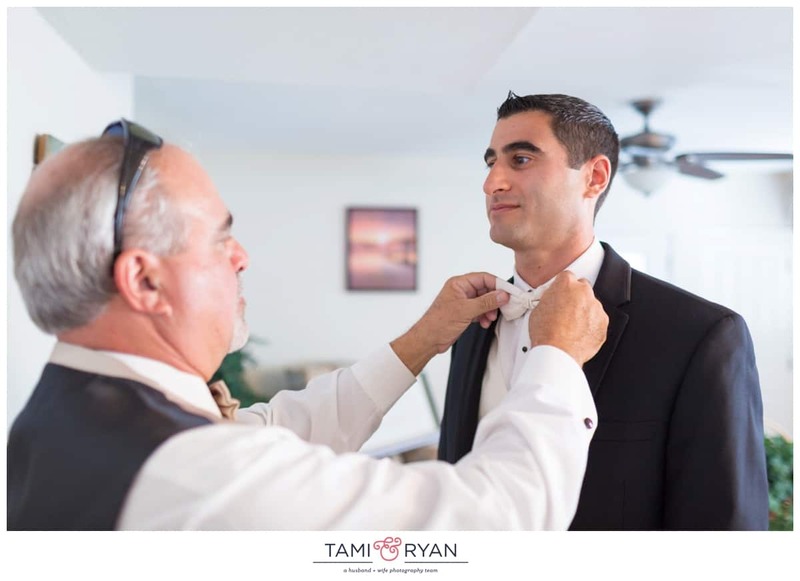 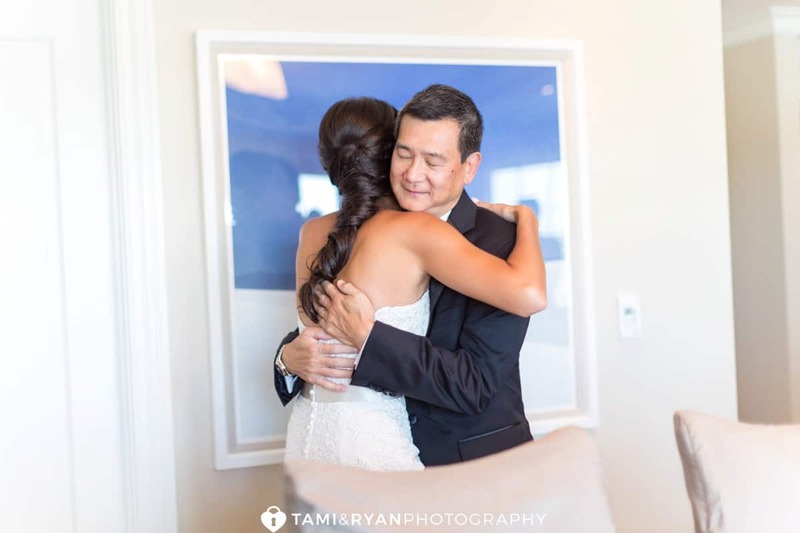 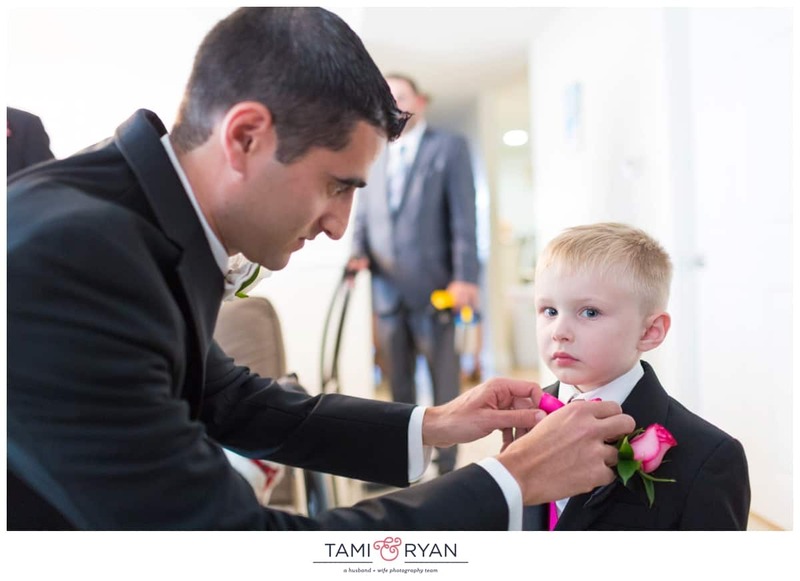 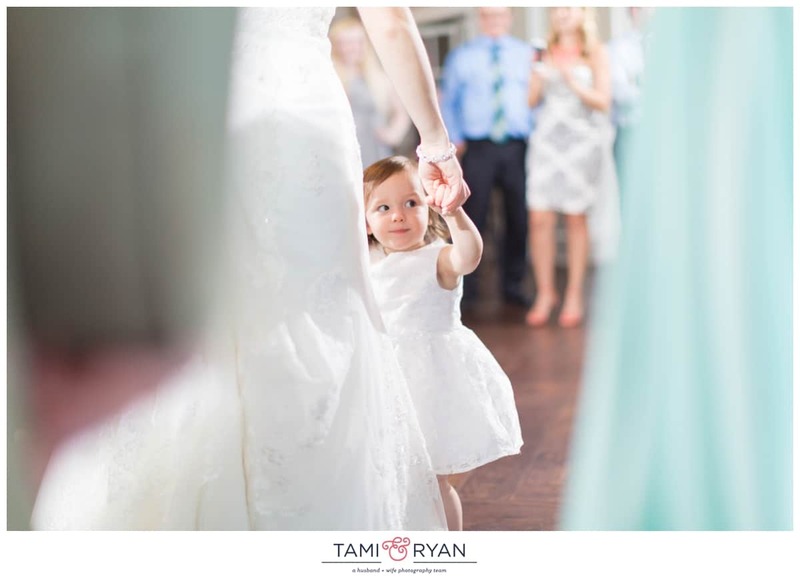 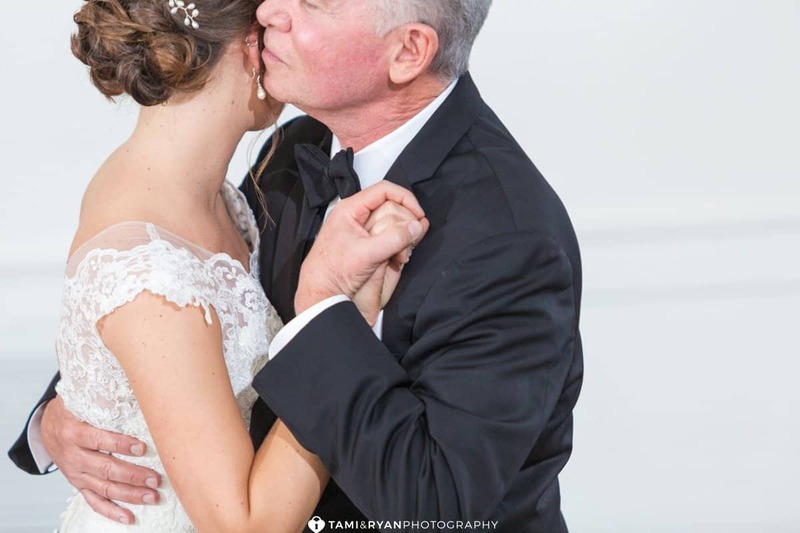 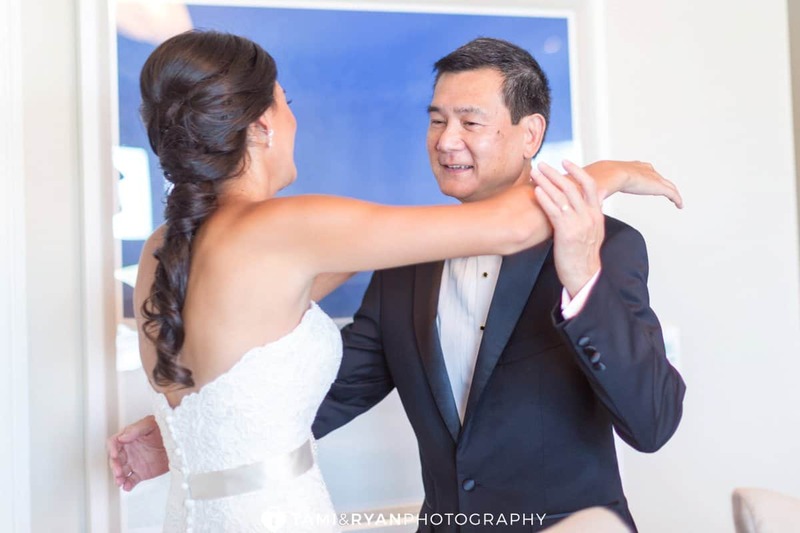 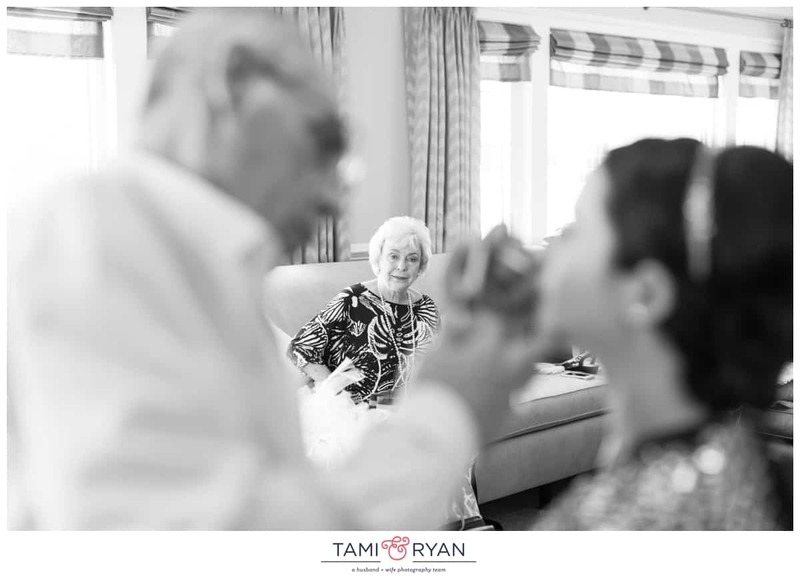 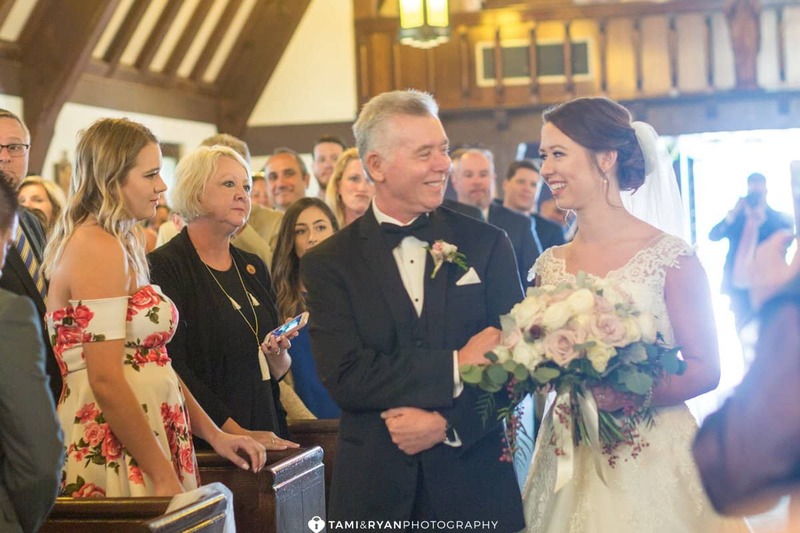 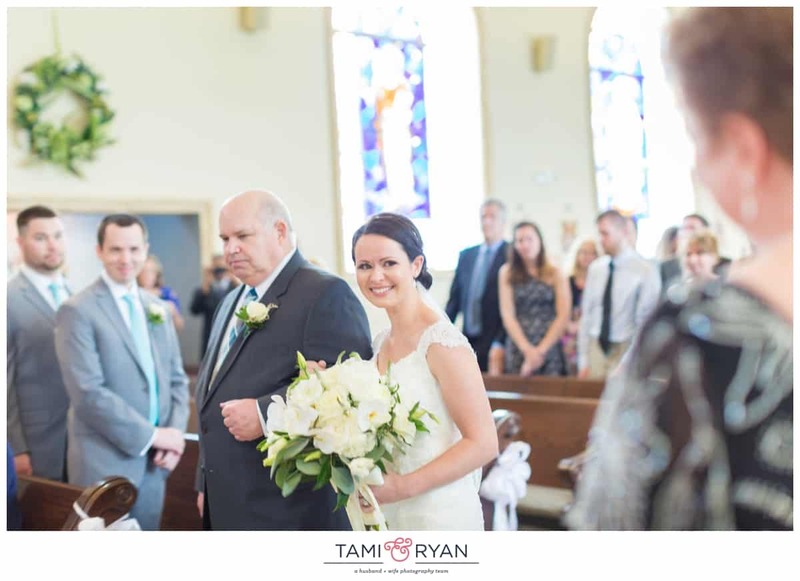 I absolutely adore that Bride’s are now doing First Look’s with their Dad’s! 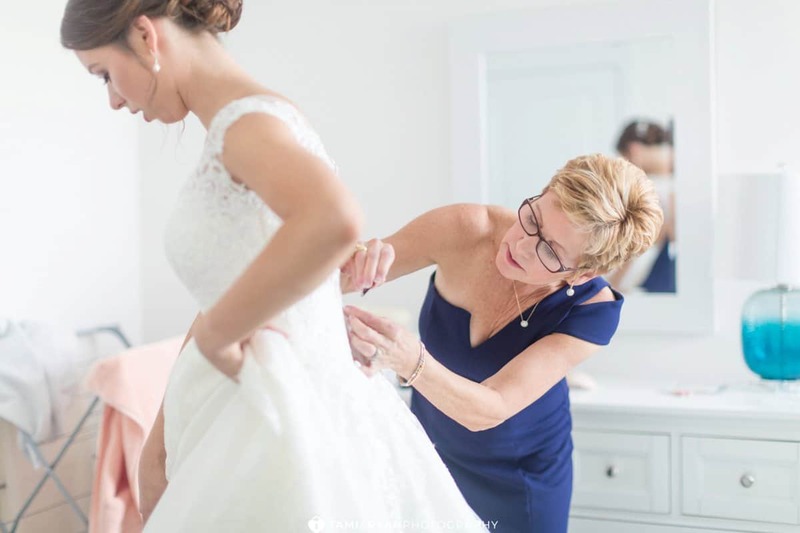 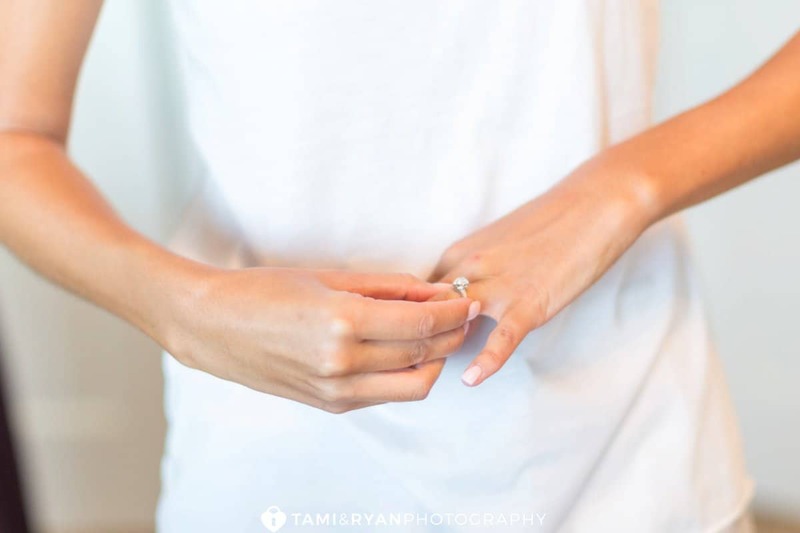 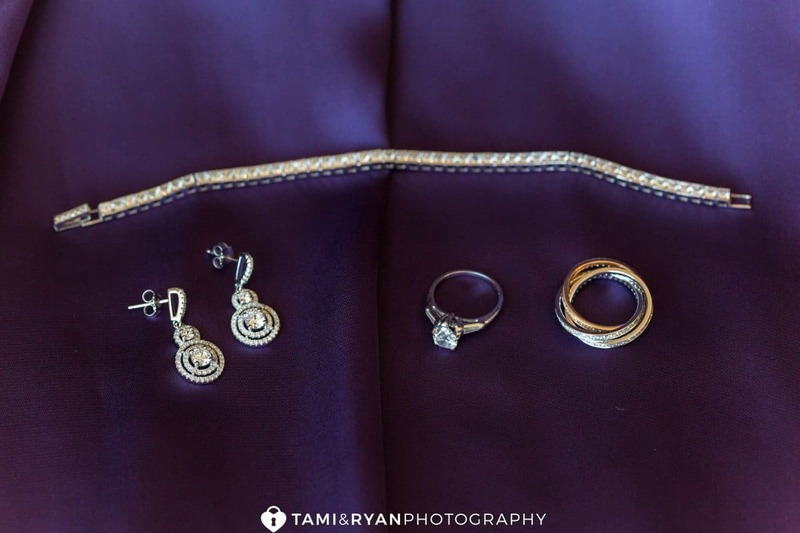 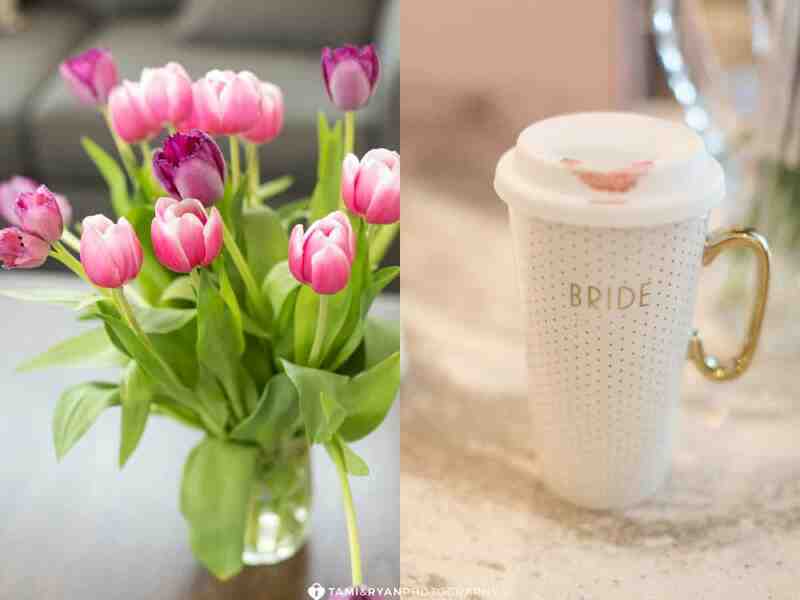 For the most part, the brides mom gets to be a part of a lot of the planning and dress shopping. 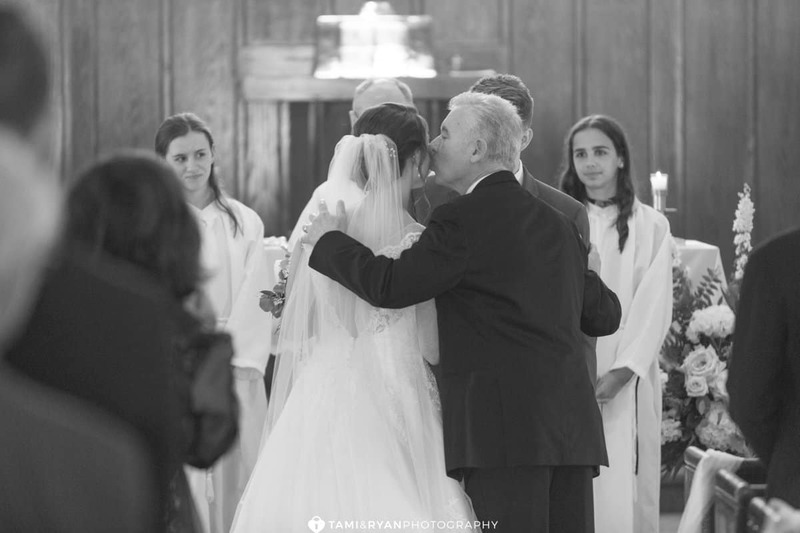 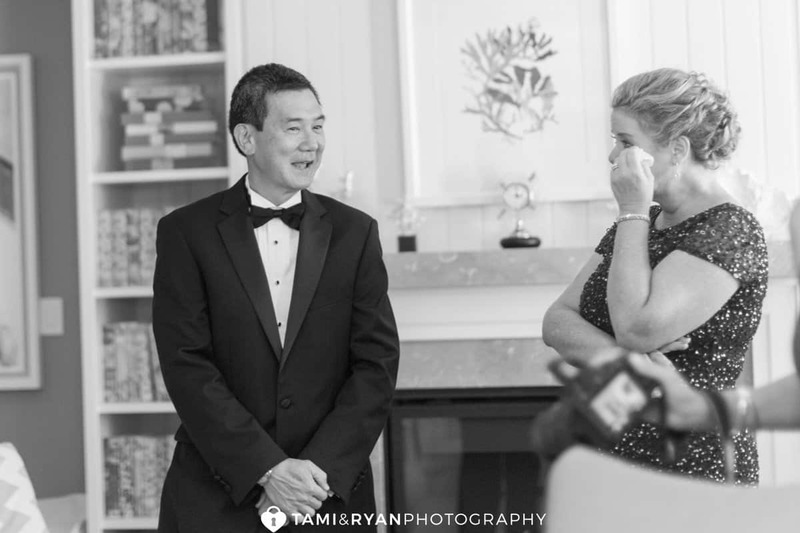 So, why not have a special moment with your dad, where he gets to see you for the very first time, before you officially become a wife. 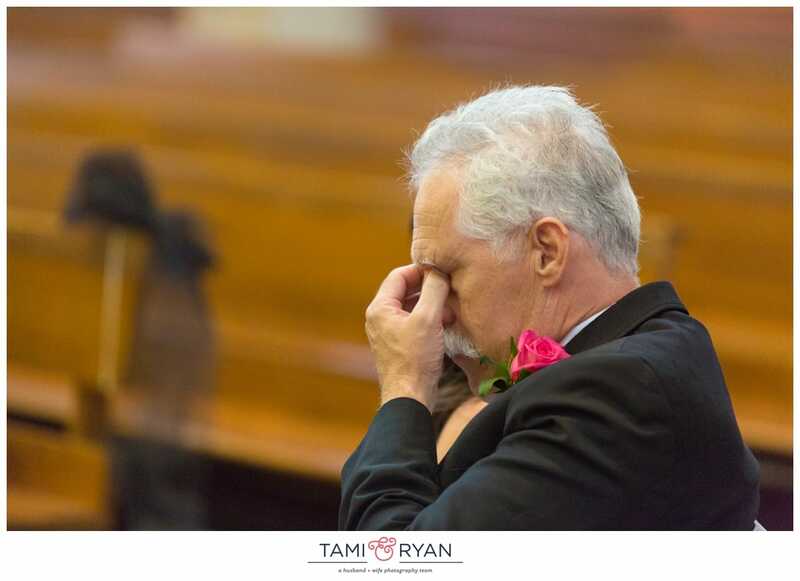 Kensi and her dad had an emotional first look. 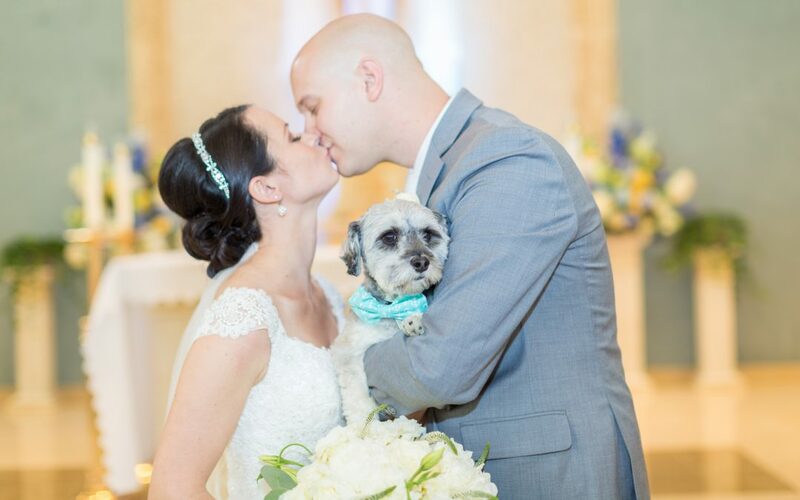 The look on his face says it all! 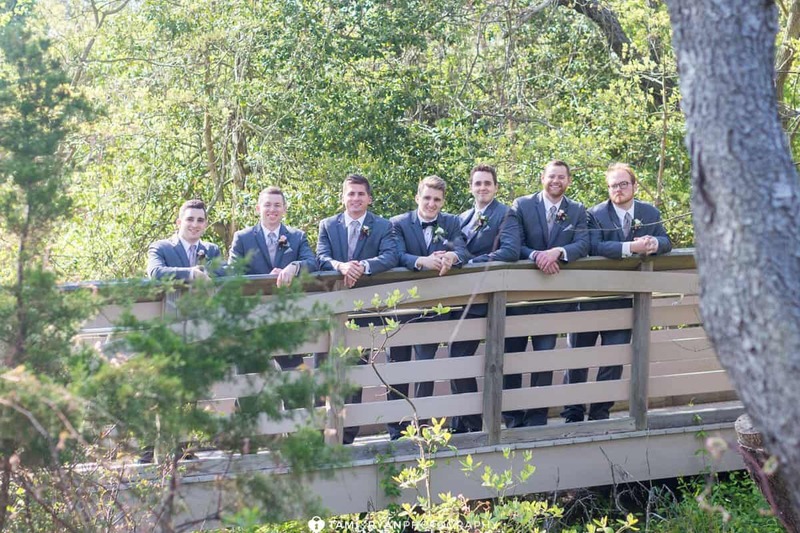 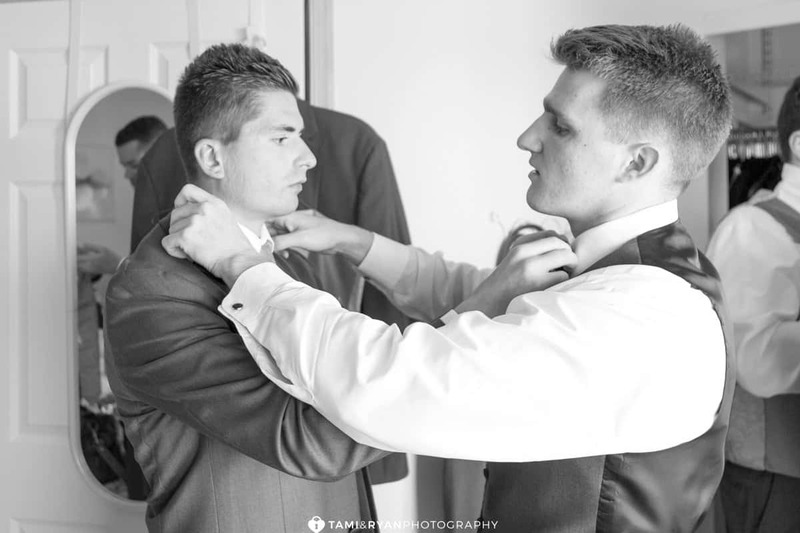 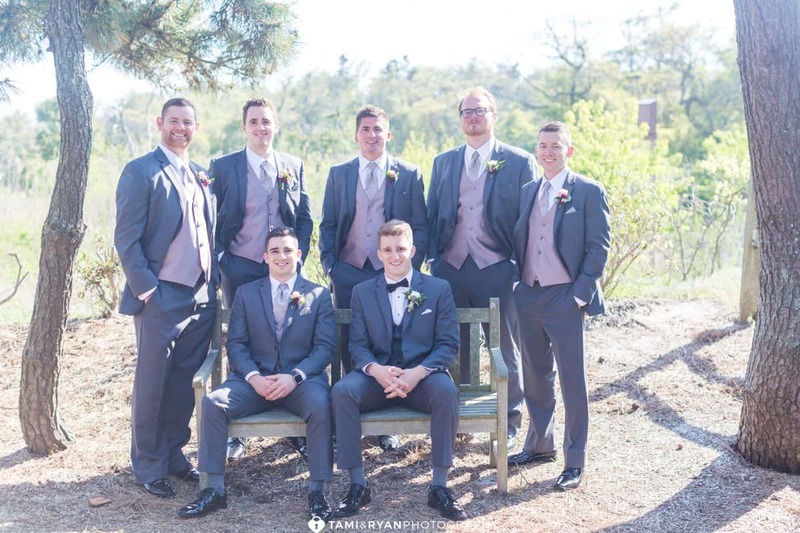 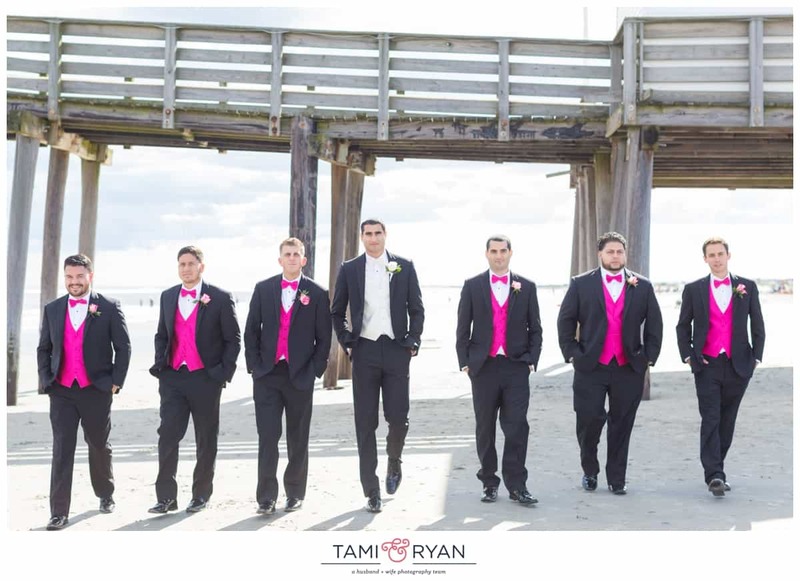 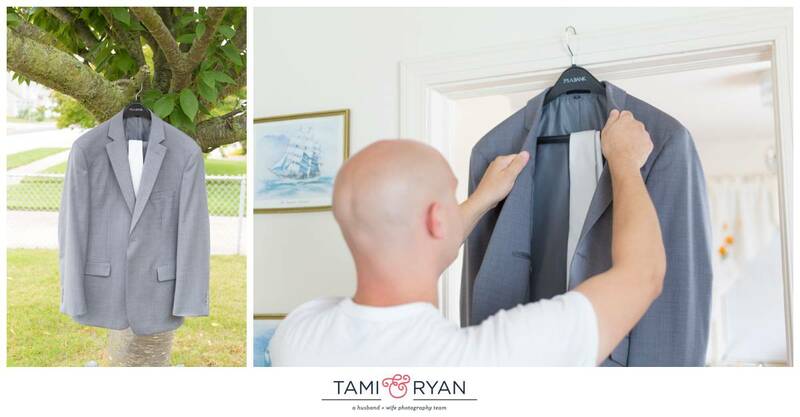 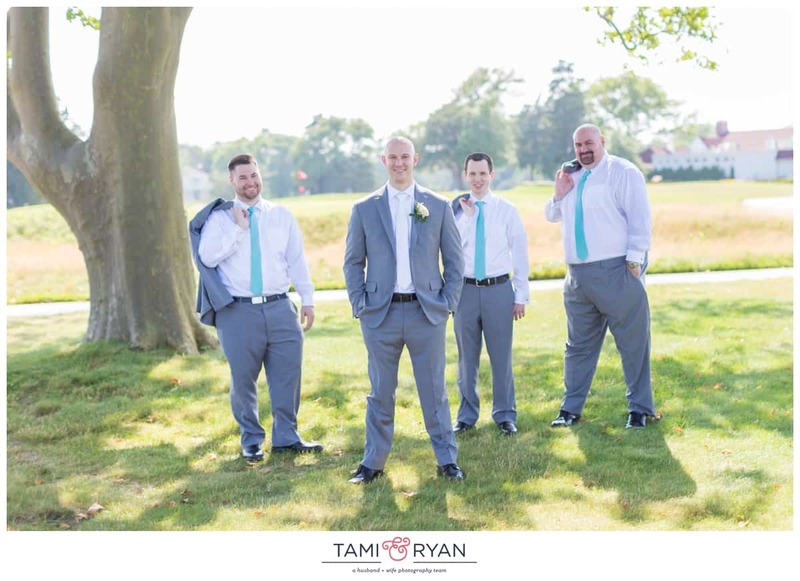 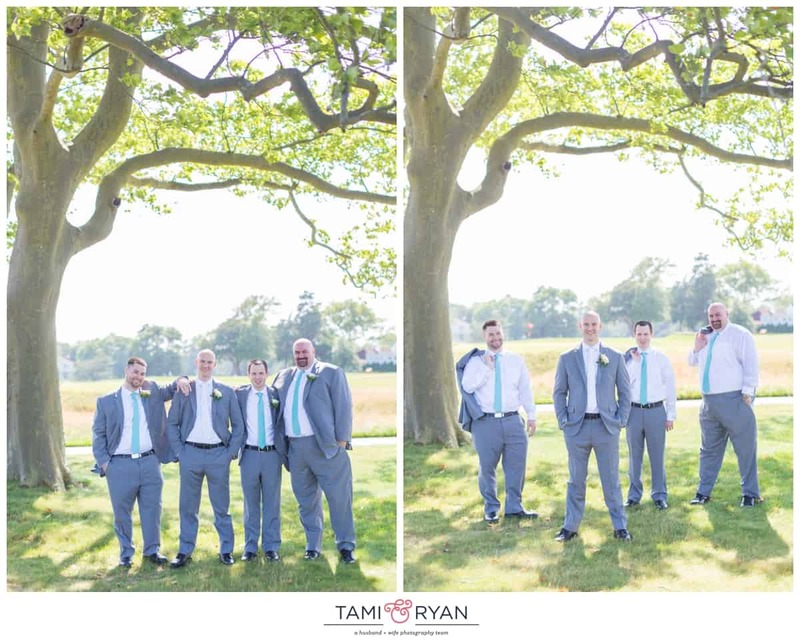 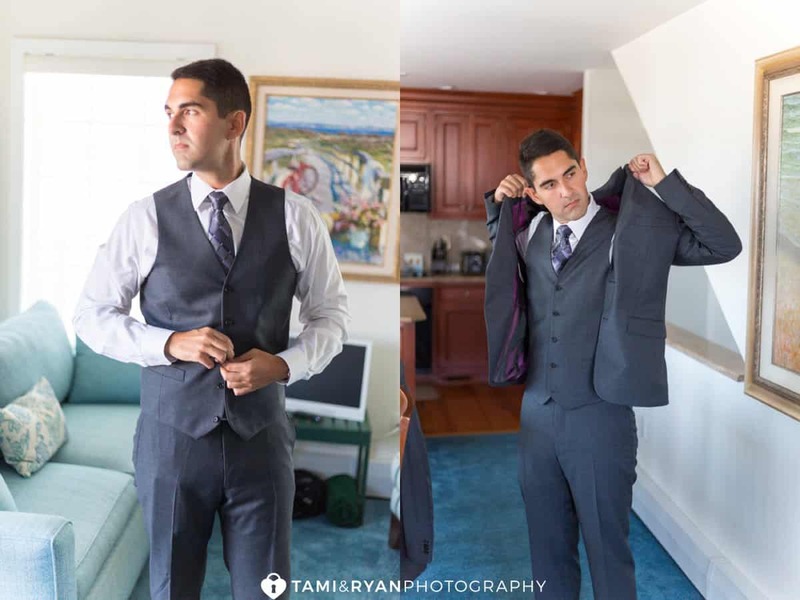 Peter and his groomsmen were hanging out, relaxing at a nearby Private Shore House. 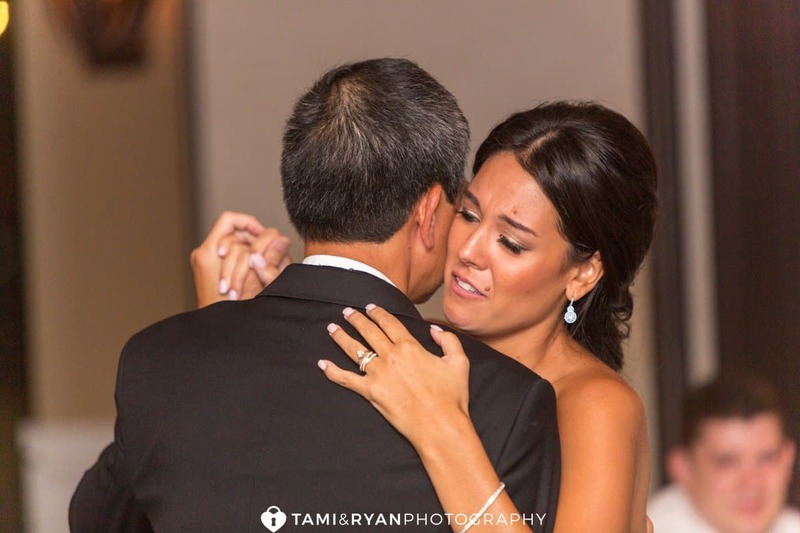 Before Peter left to see Kensi for the first time, he read a beautiful letter that she wrote to him. 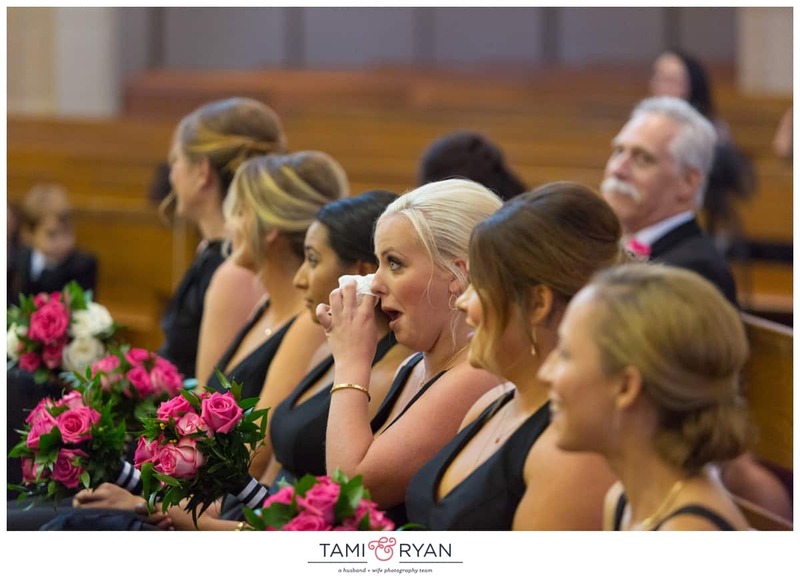 It made him just that much more excited to see his future wife! 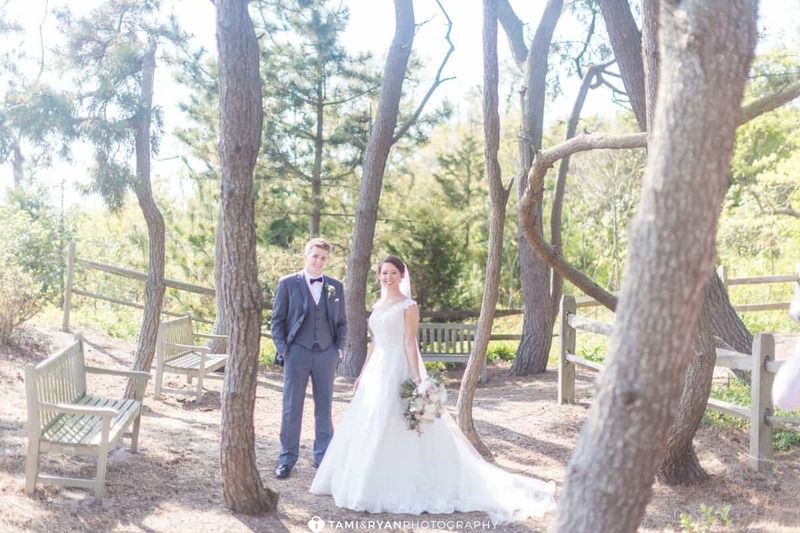 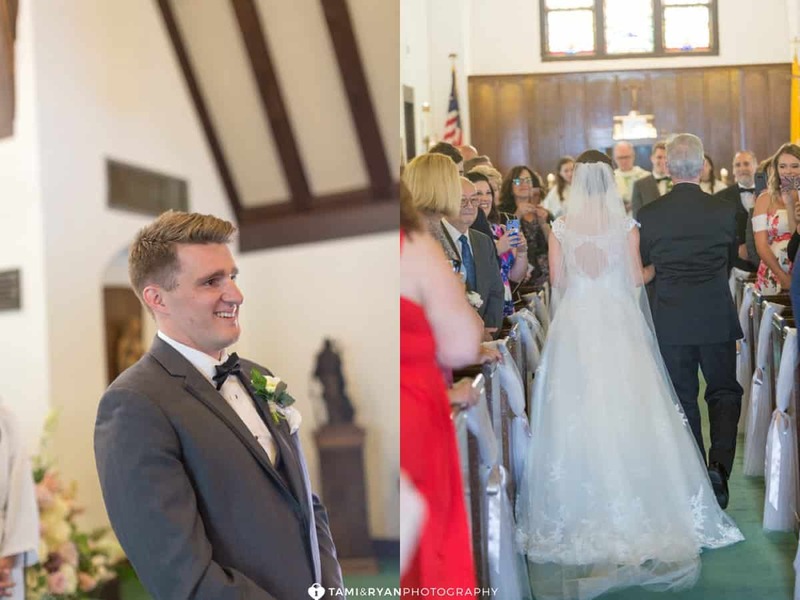 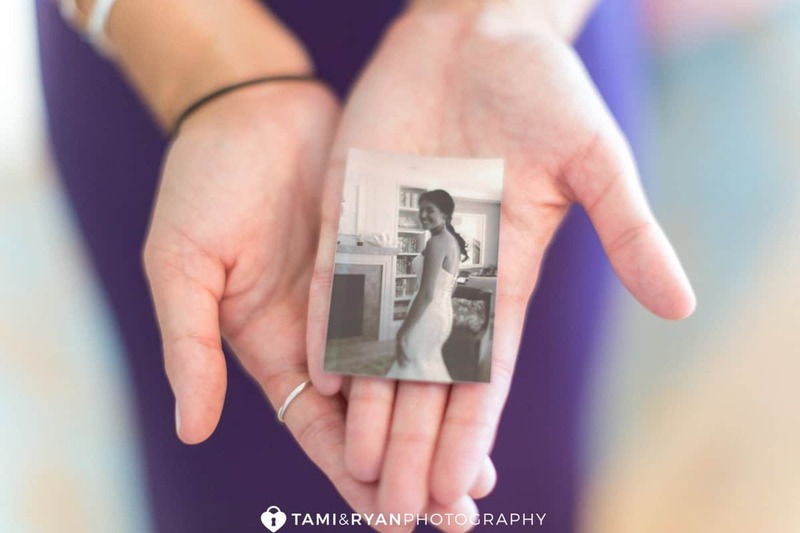 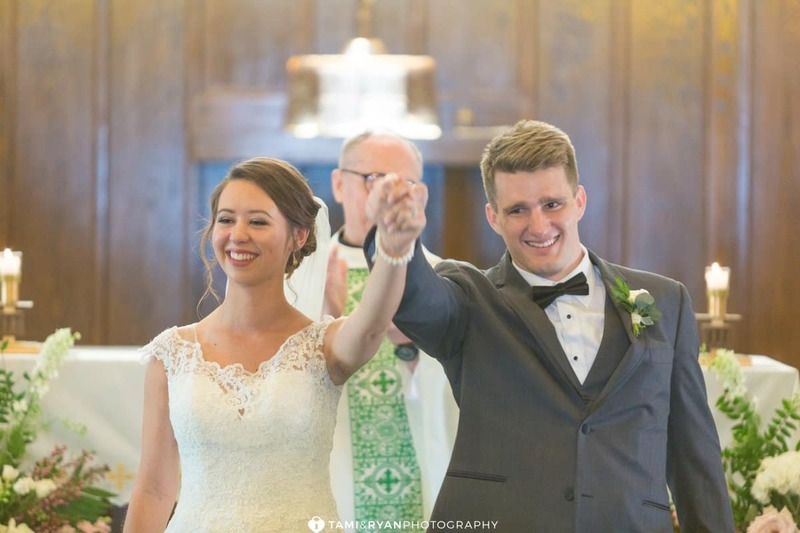 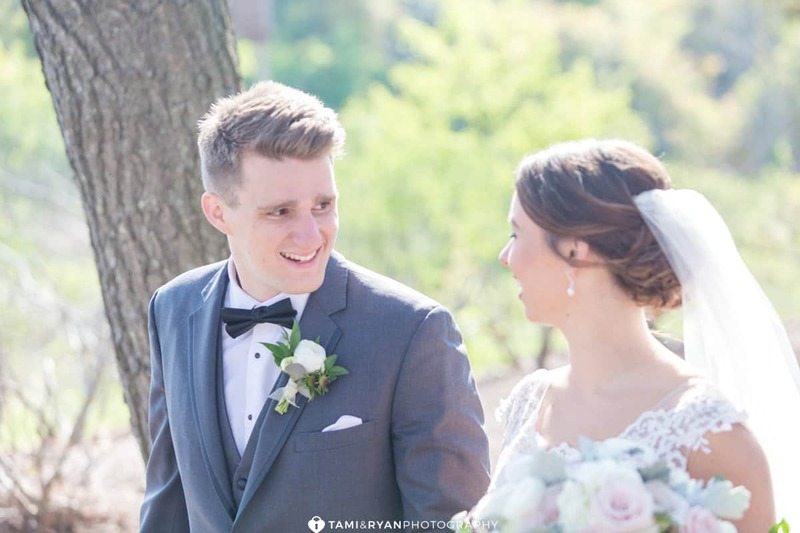 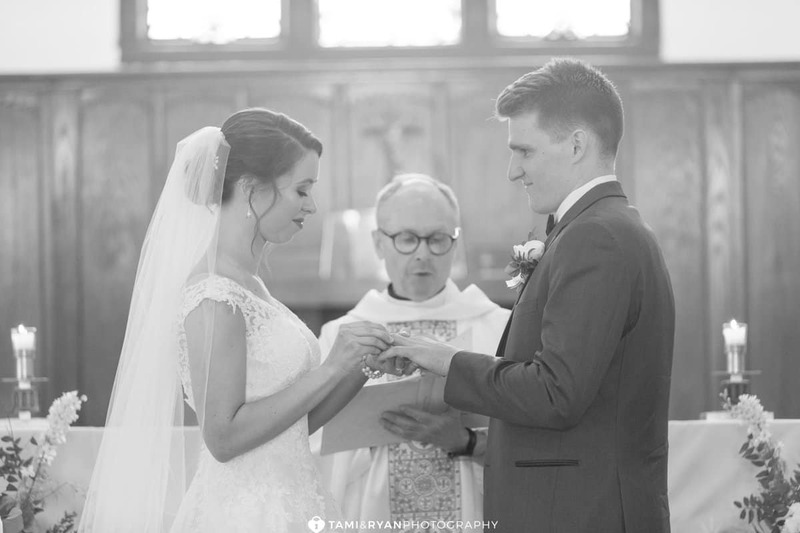 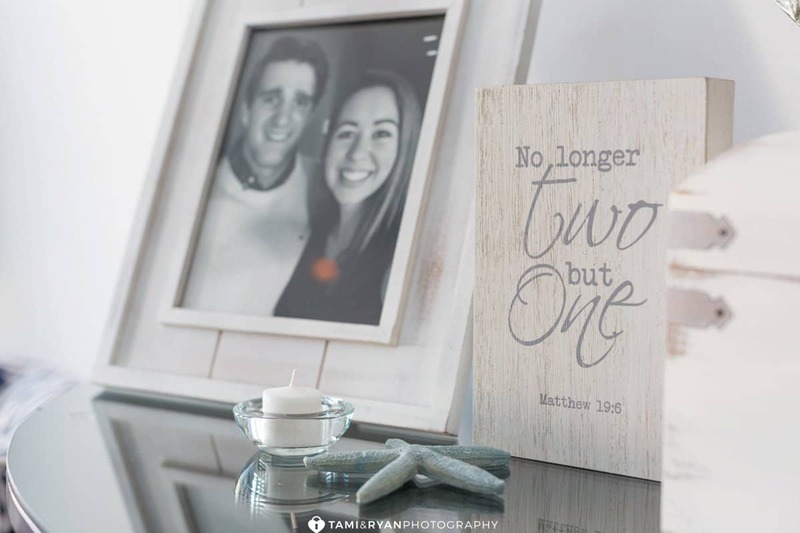 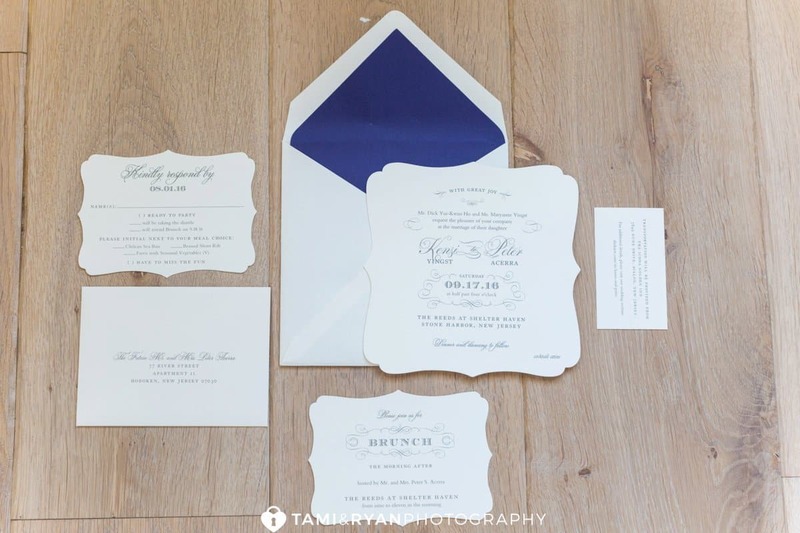 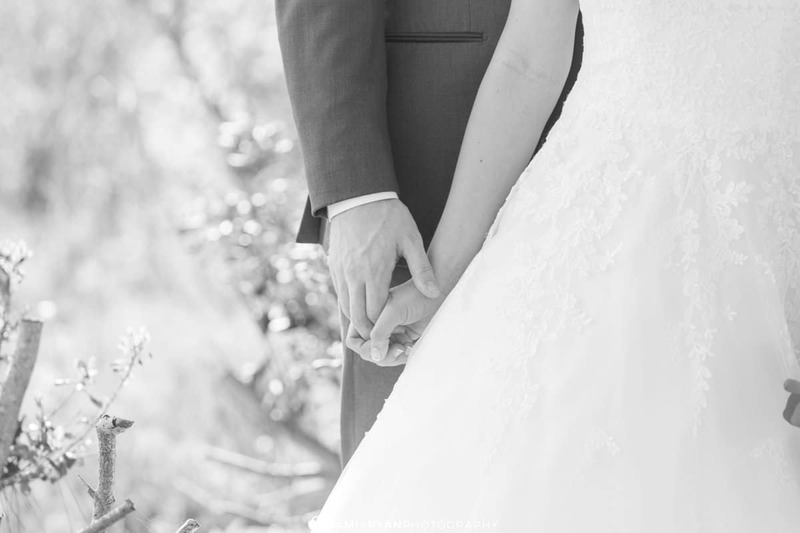 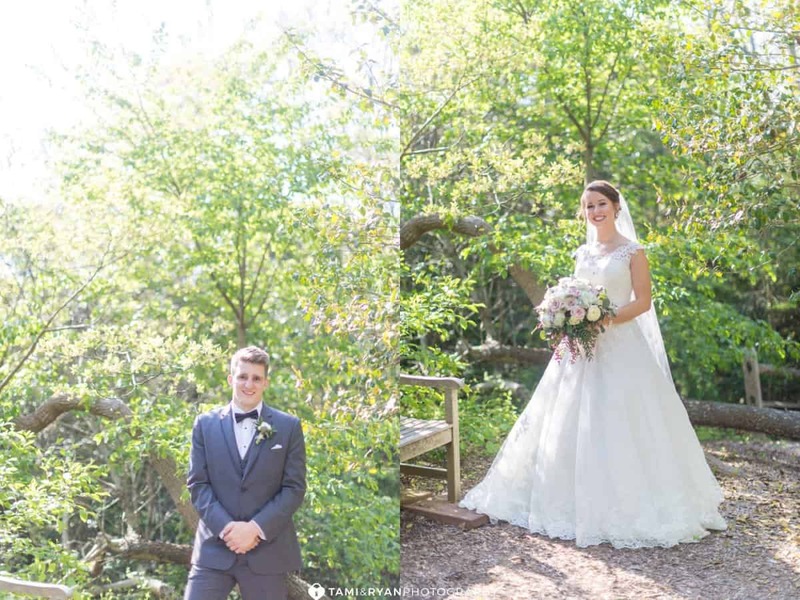 Kensi and Peter met while both attending Villanova University! 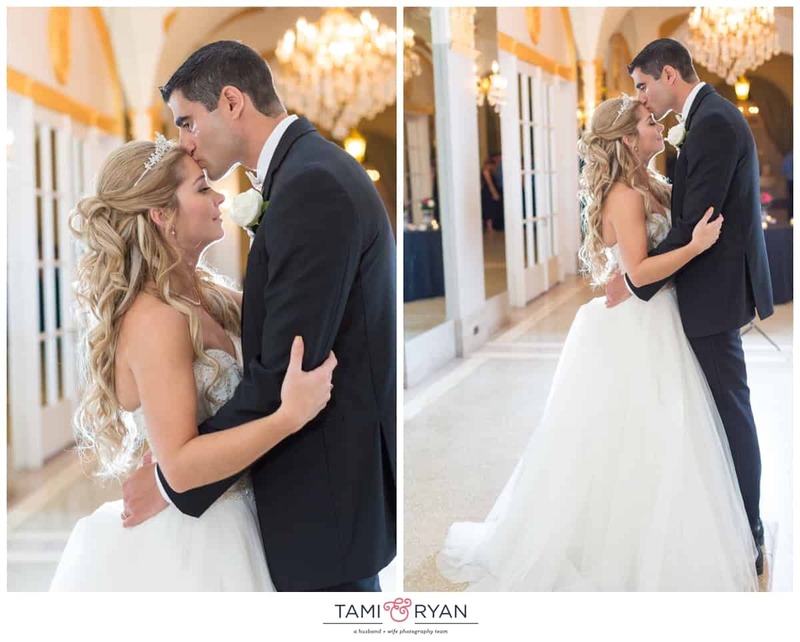 They met through mutual friends and have been dating since their sophomore year! 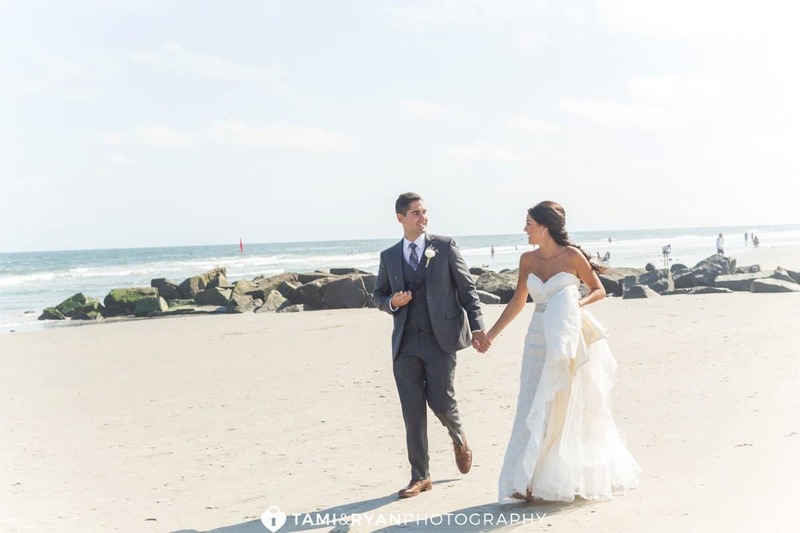 She had moved to NYC to be with Peter after finishing grad school, and the two moved to Hoboken together last year! 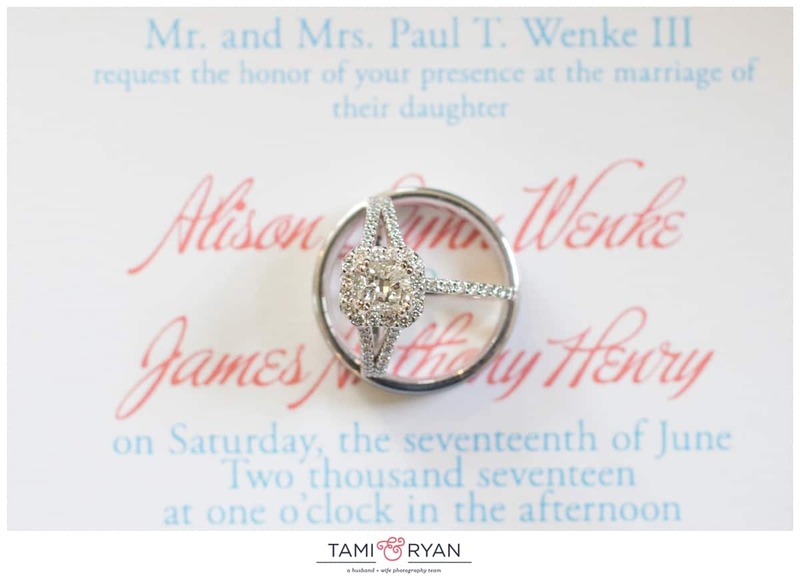 They got engaged on June 13th after hiking to the top of Mohonk Mountain! 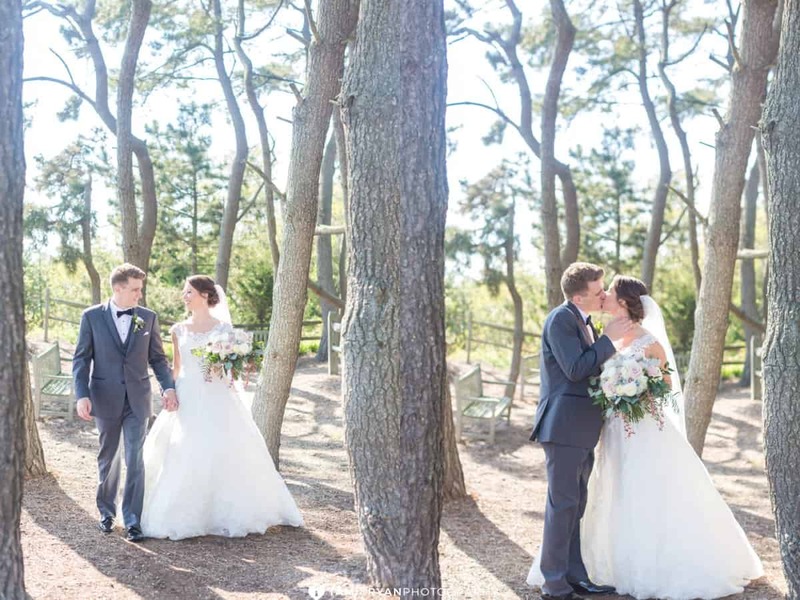 Peter knew that this location was special to her and her family, so what better of a place to pop the question?! 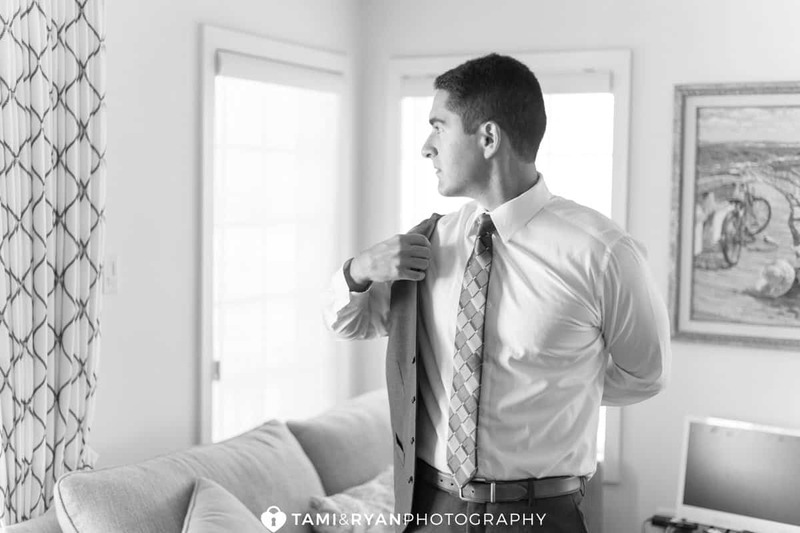 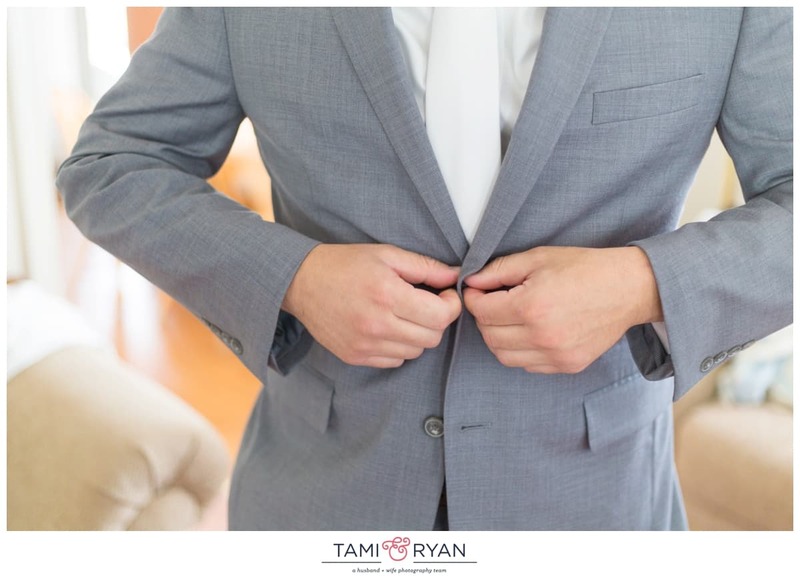 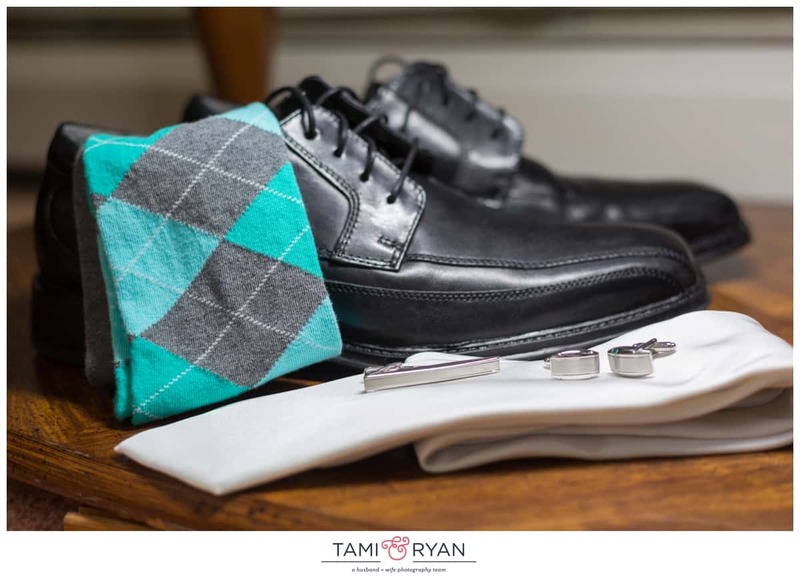 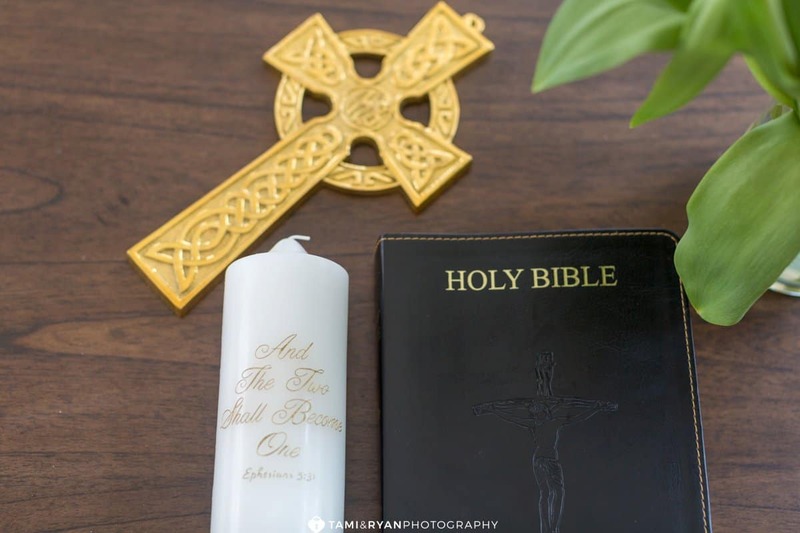 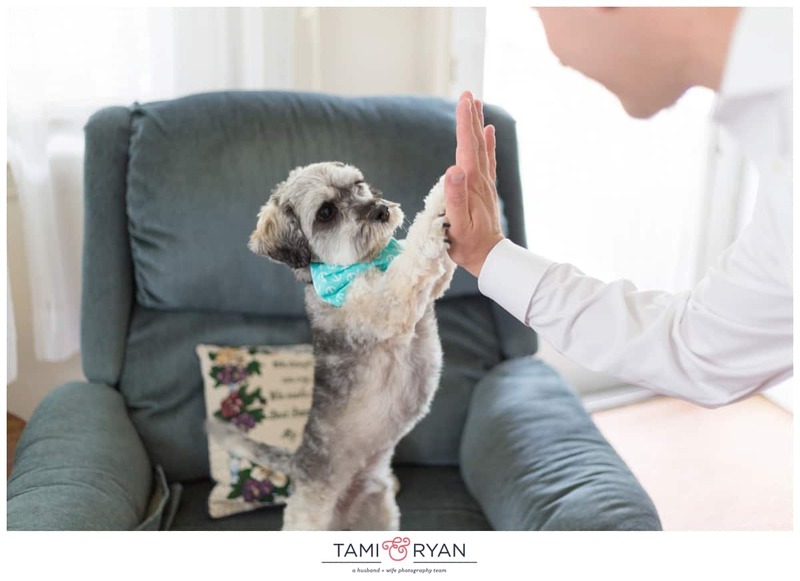 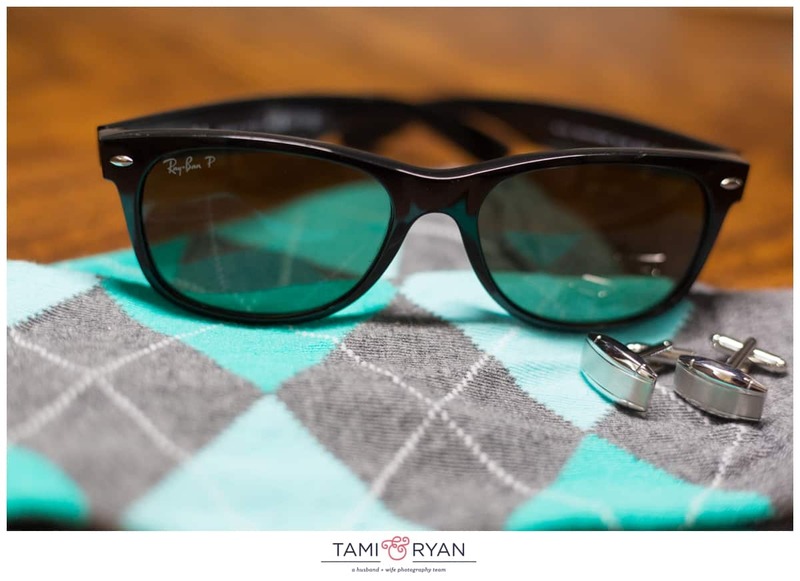 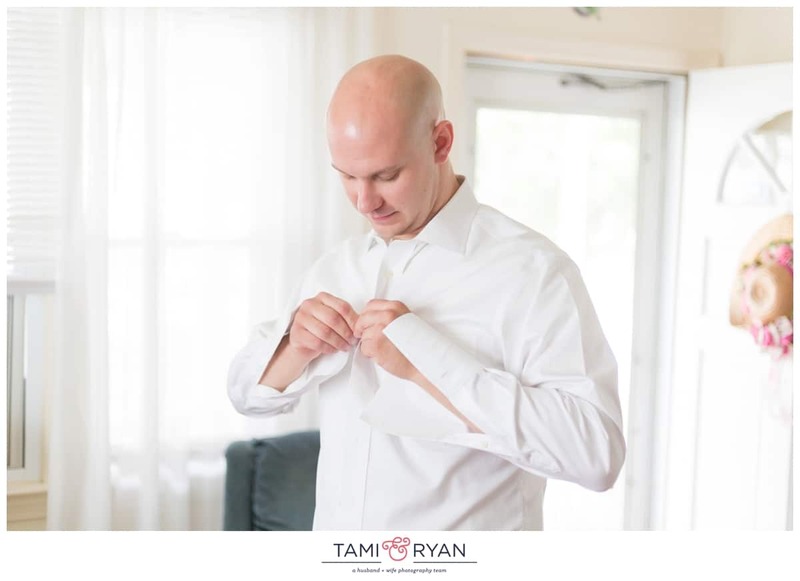 We absolutely loved getting to know these two during their engagement session where it all began – Villanova University! 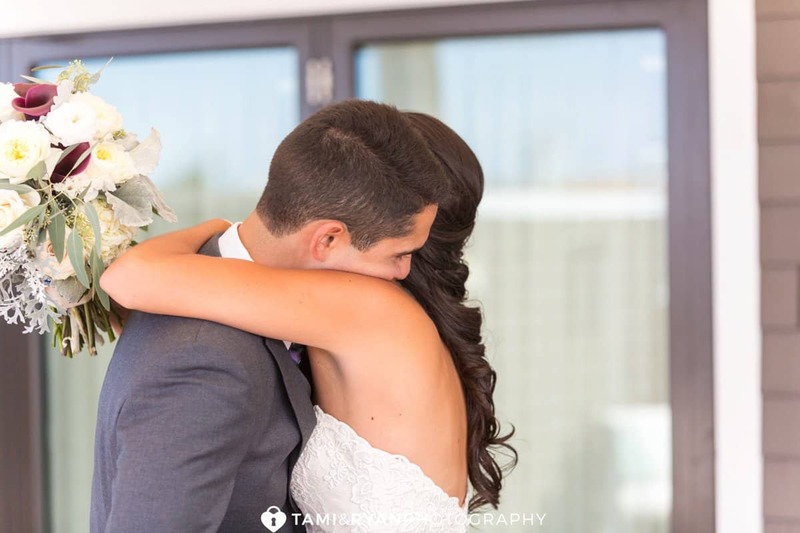 The Roof Garden was the perfect spot for Peter to see Kensi for the first time. 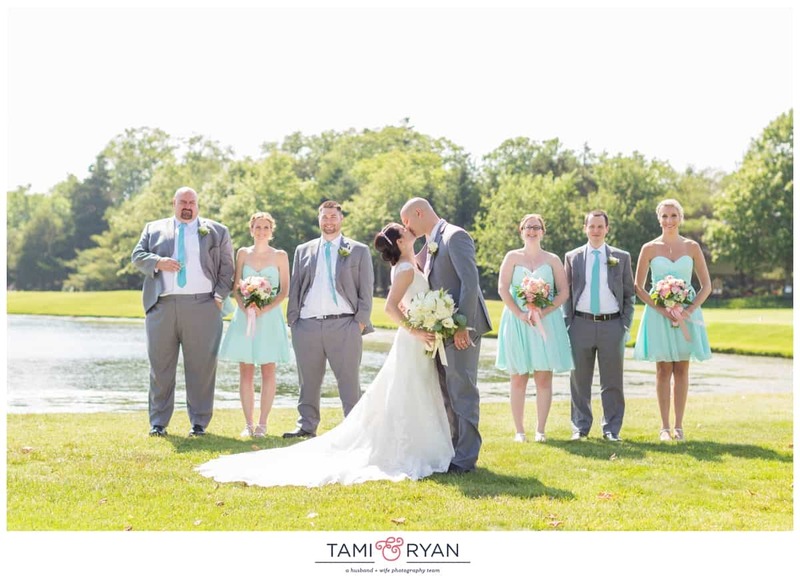 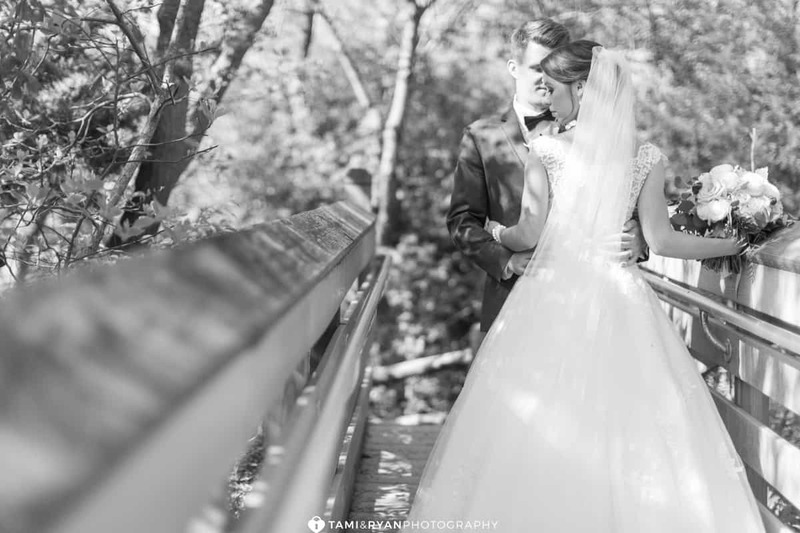 It provided some shade from the sun, as well as some privacy for such a special moment between the bride and groom! 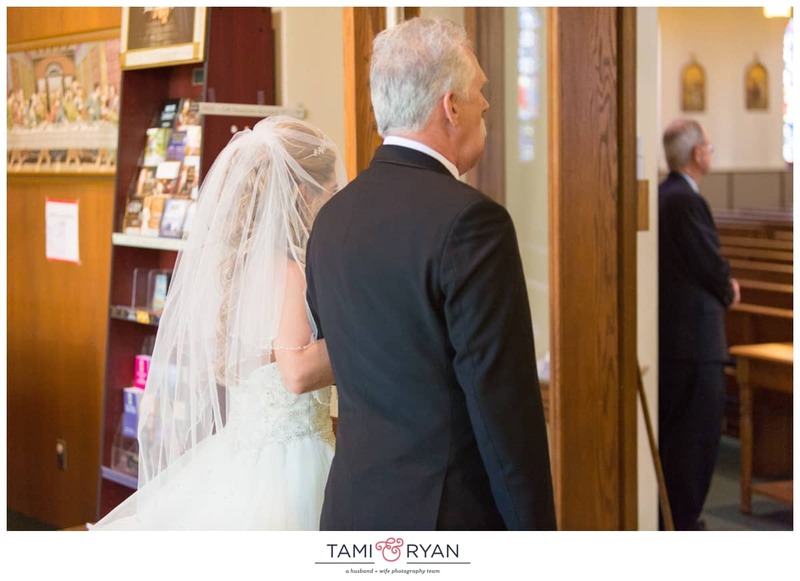 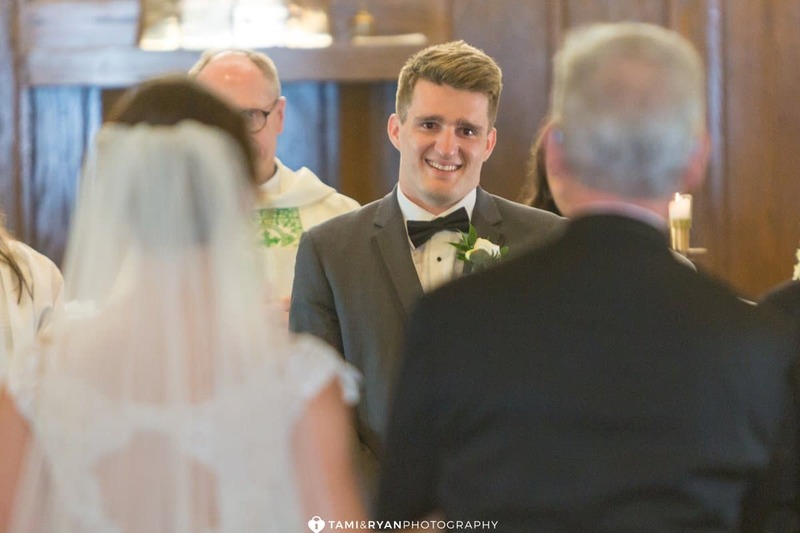 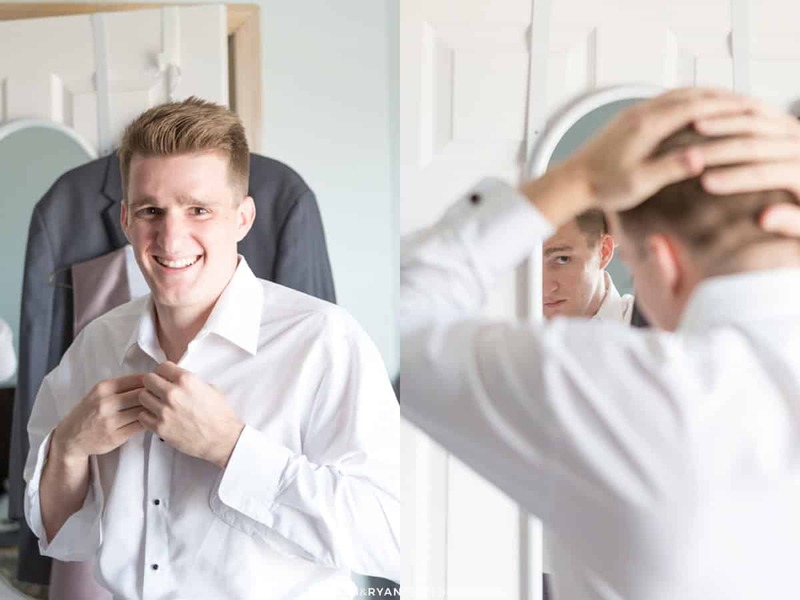 Peter was in absolute awe as her turned around to see his bride for the first time. 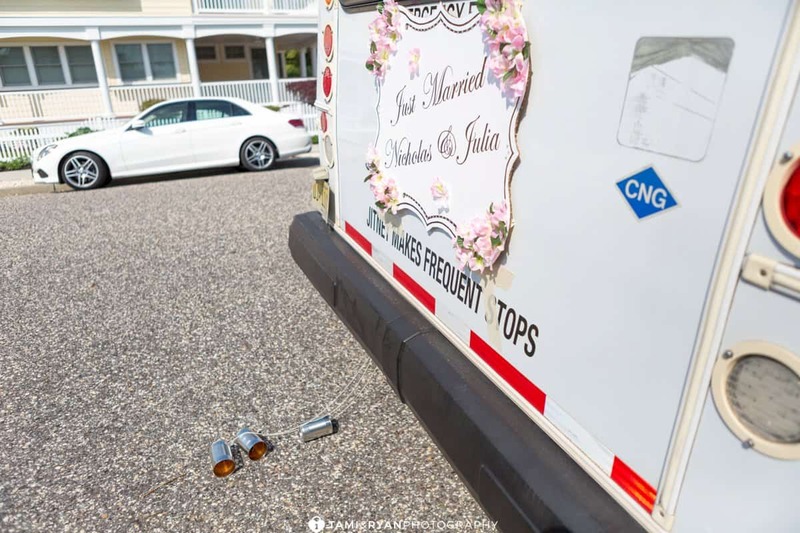 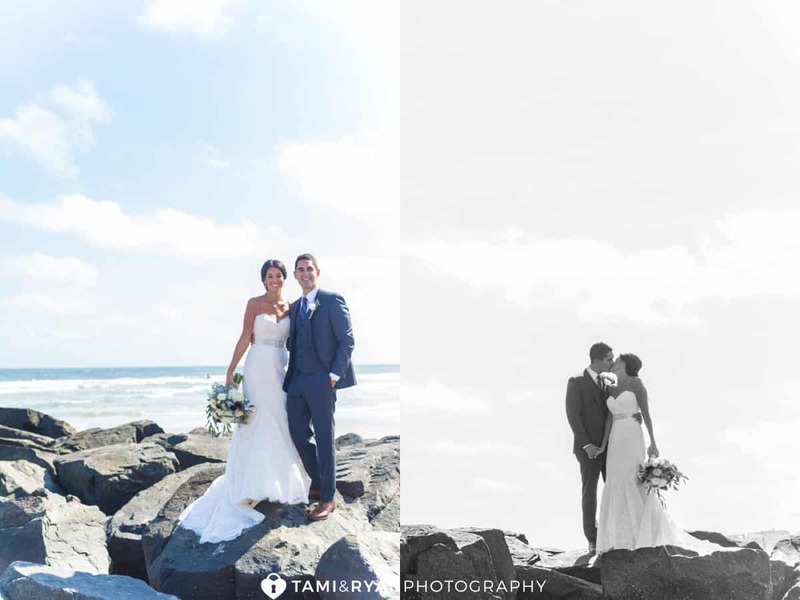 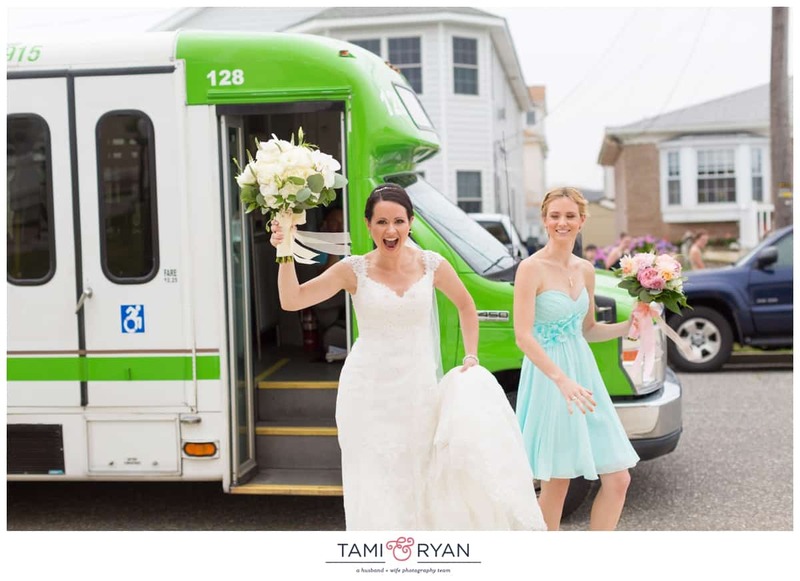 When a couple chooses to get married at the Jersey Shore, there is never a shortage of photo opportunities. 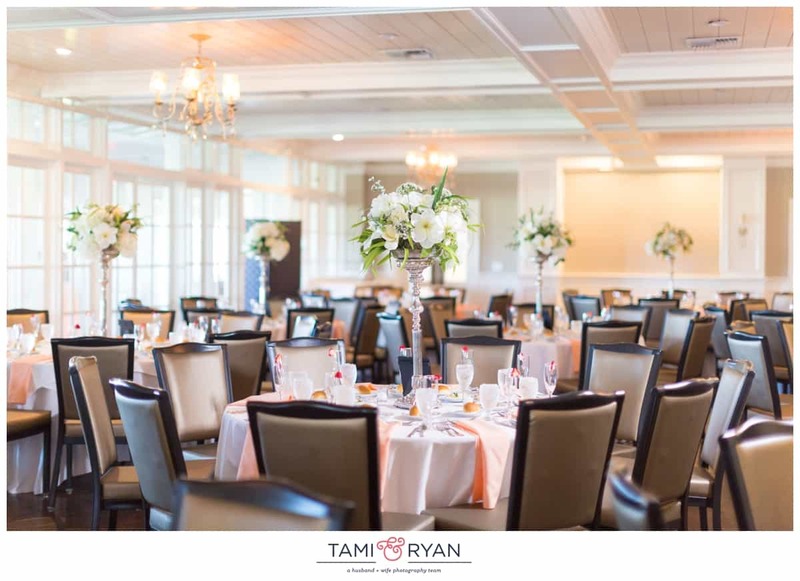 Especially at a beautiful venue like The Reeds. 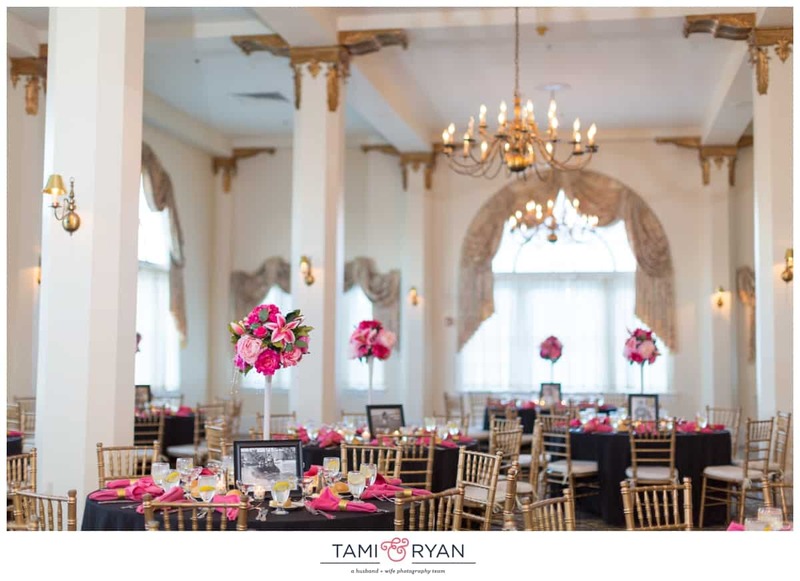 Even if it was raining outside, we’d have more than enough options inside the beautiful lobby, on the Roof Garden or our on the front porch. 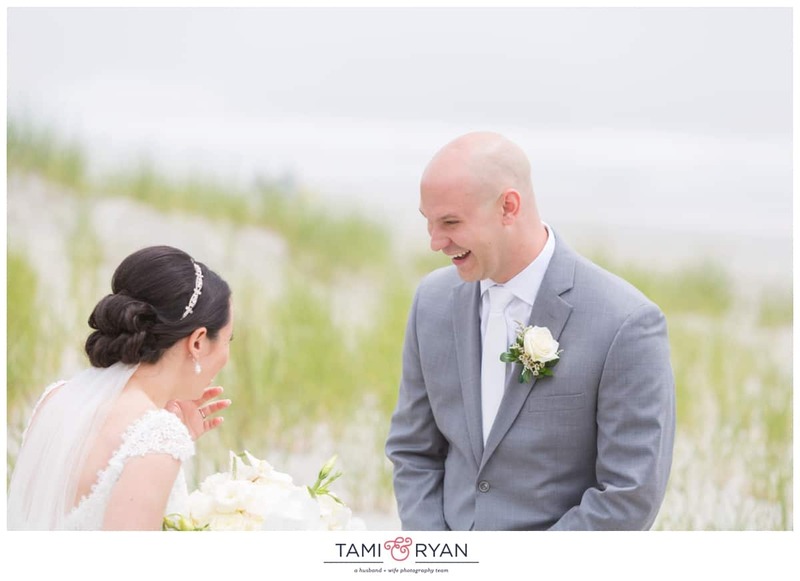 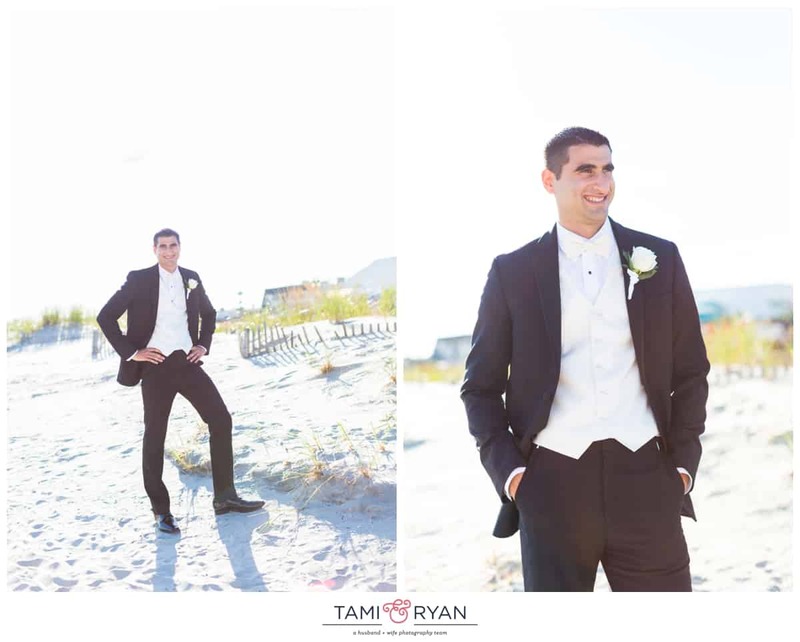 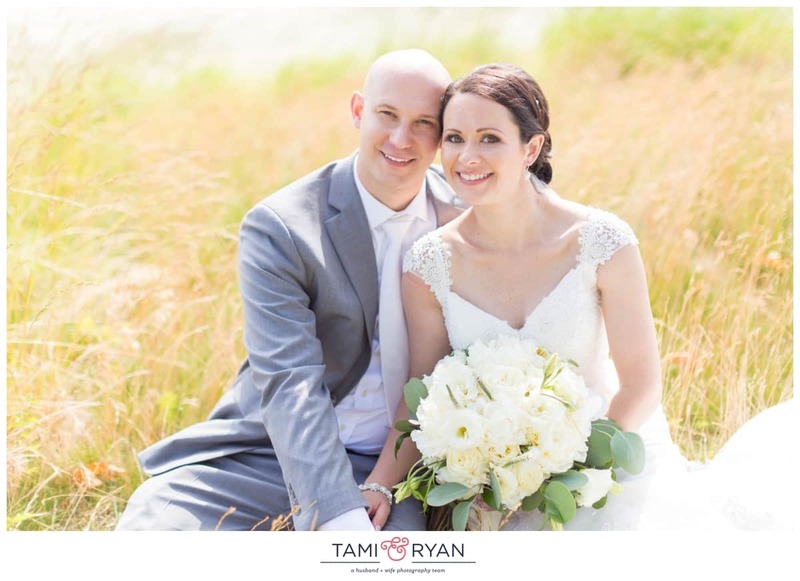 Lucky for us, it was a sunny day, and The Reeds took us all on golf carts down to the beach in Stone Harbor for some additional photos! 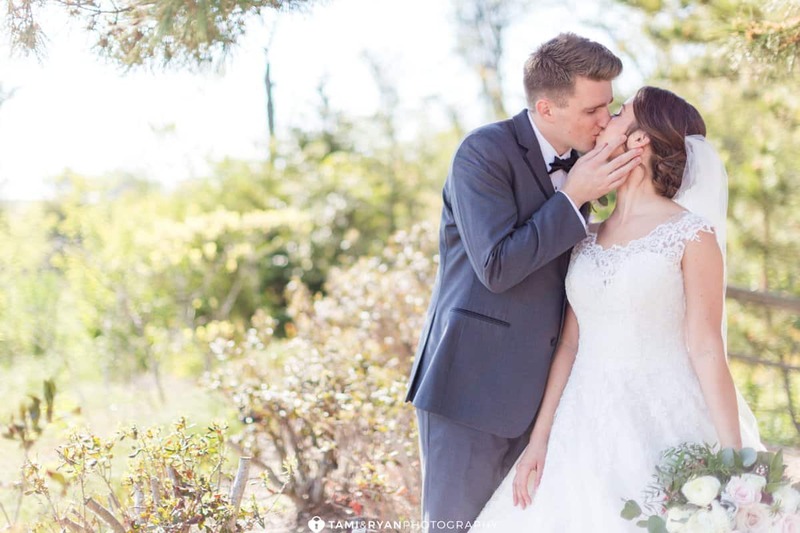 With the sun slowly setting behind them as they say their I do’s, Kensi and Peter looked into each others eyes and promised one another forever. 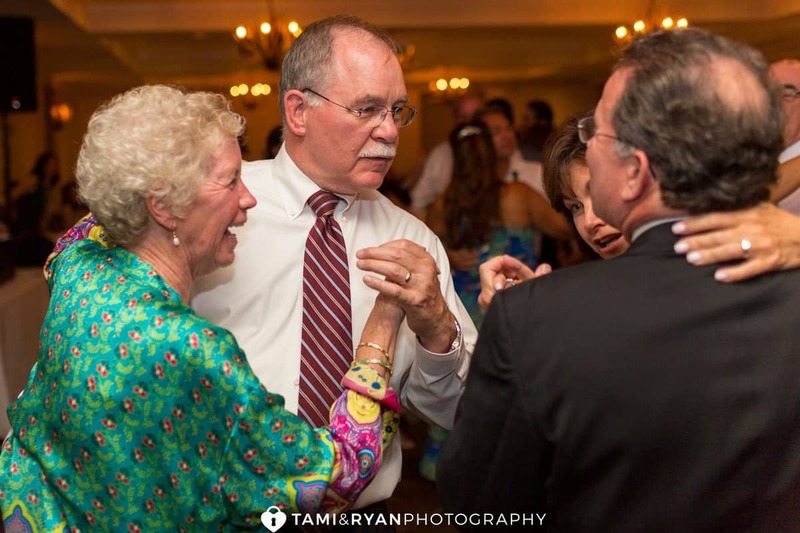 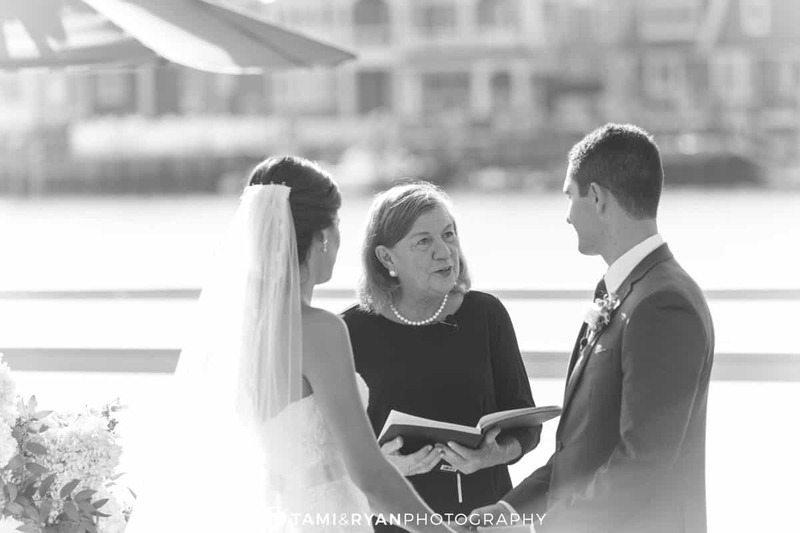 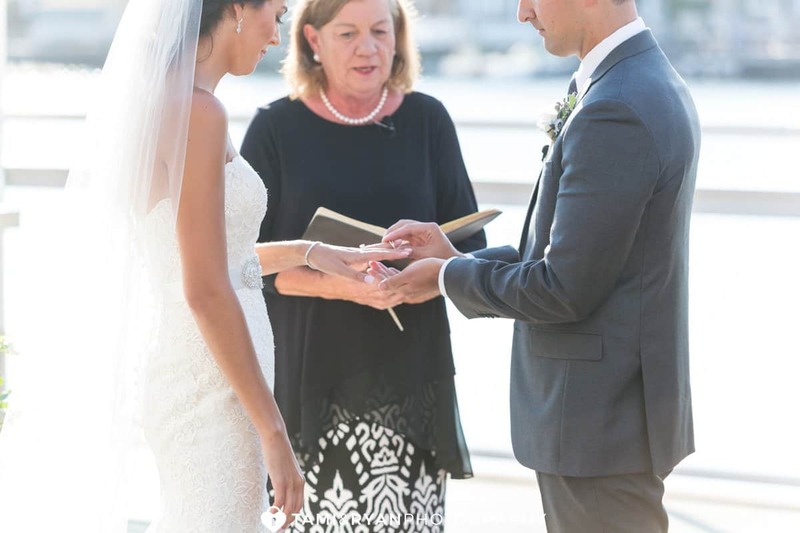 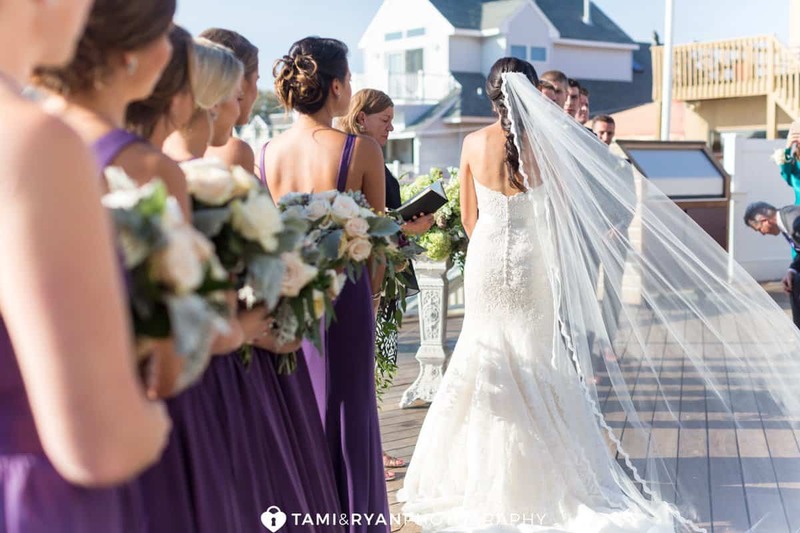 They truly had an intimate ceremony, performed by the Stone Harbor Mayor herself, on the beautiful outdoor Veranda. 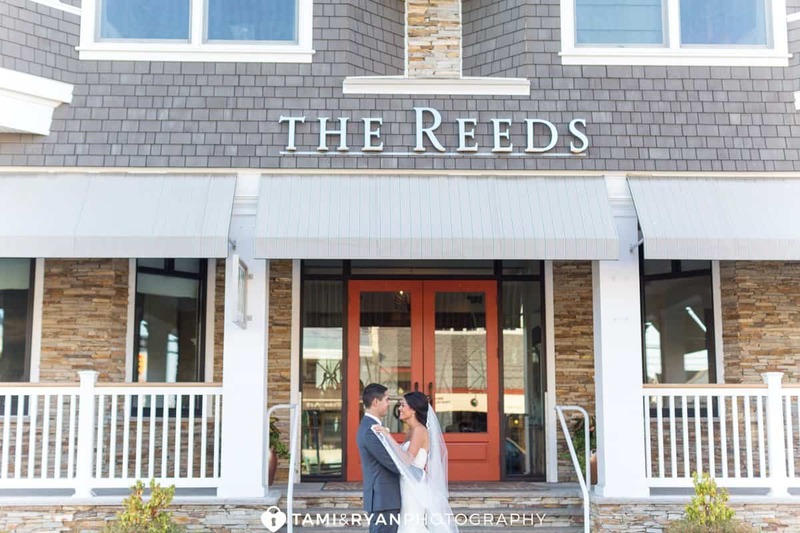 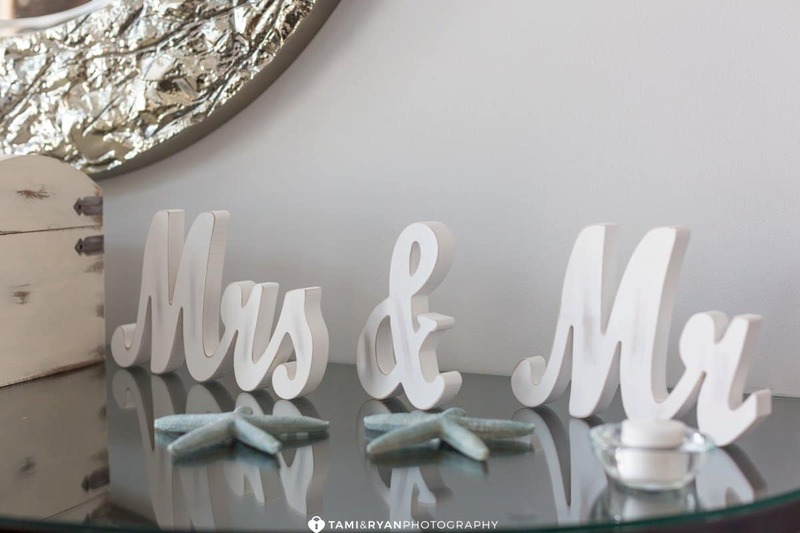 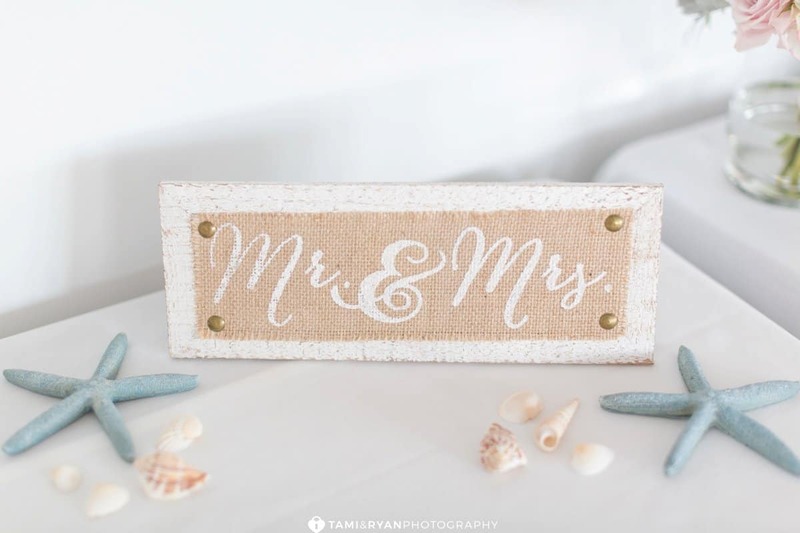 According to The Reeds website, The Reeds was designed by a team of wedding professionals to create the most exclusive seaside experience. 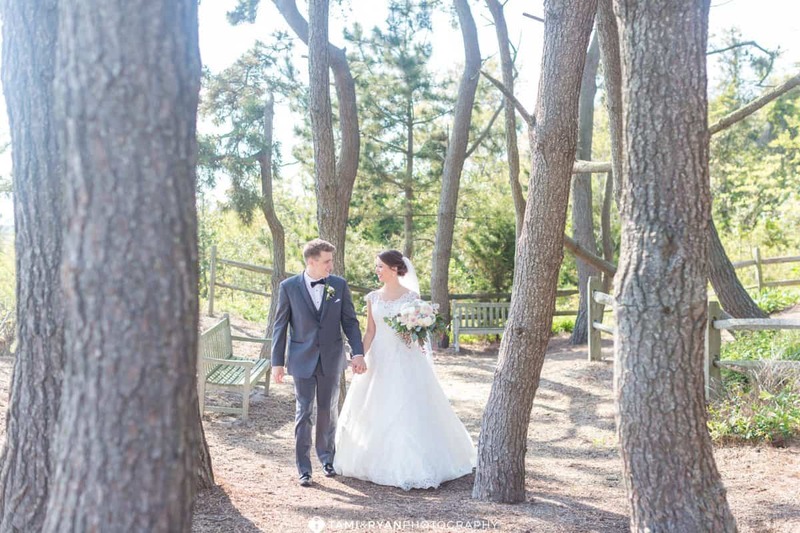 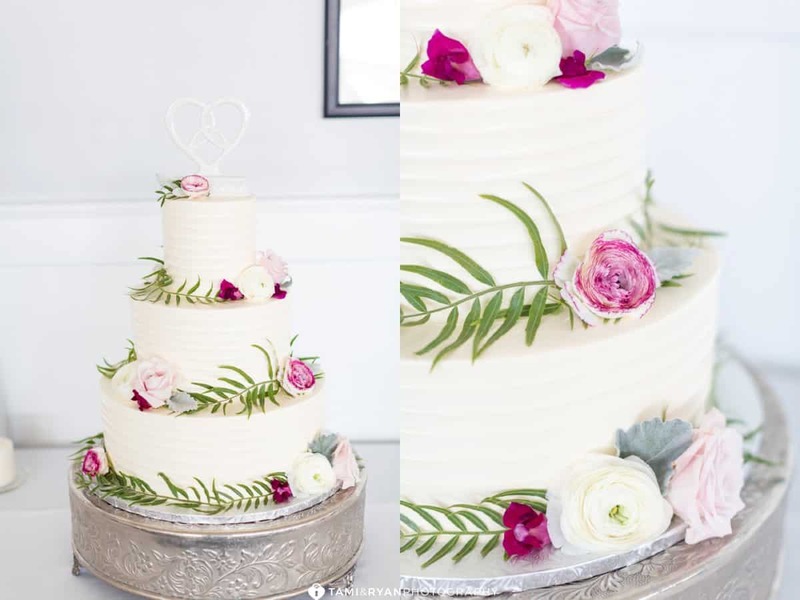 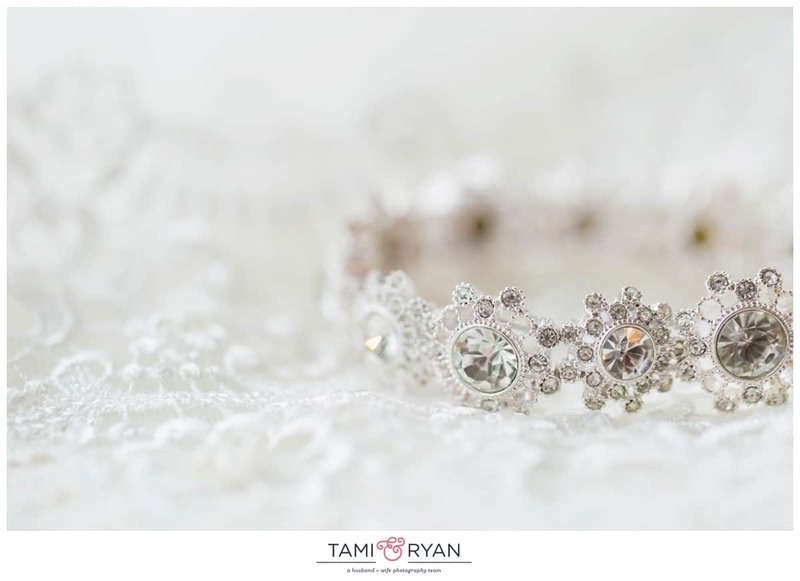 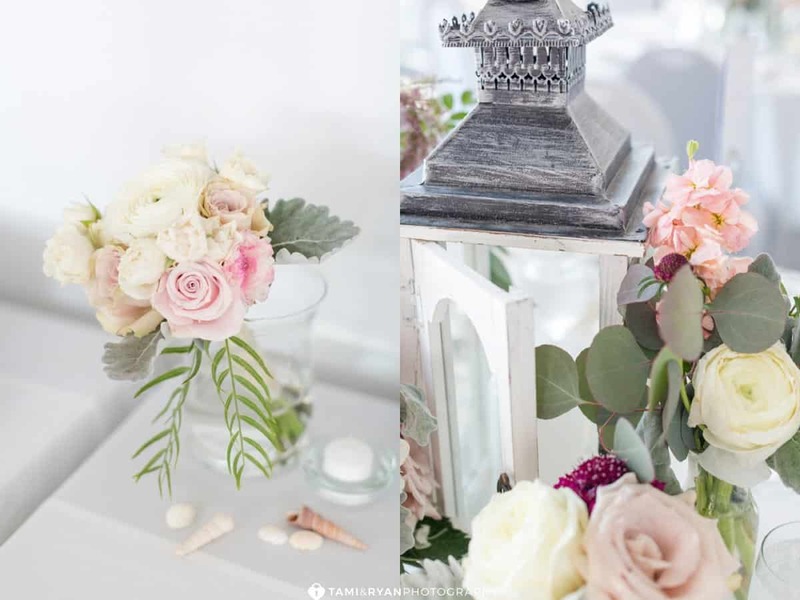 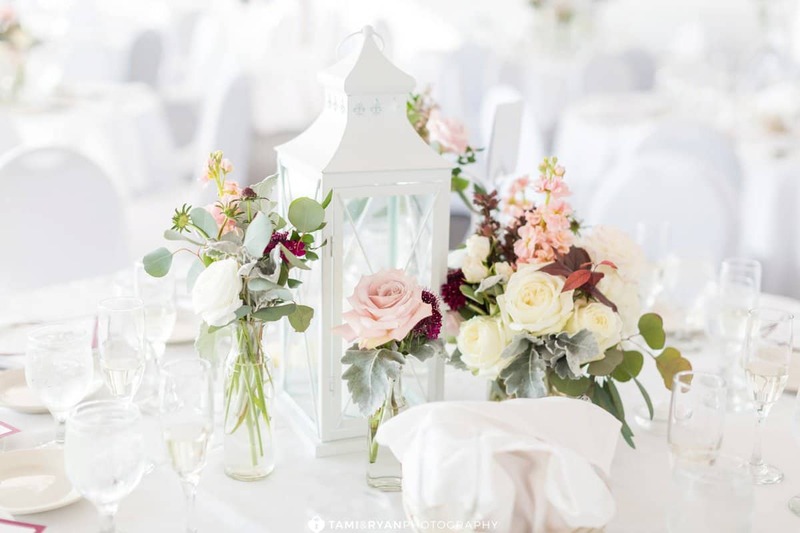 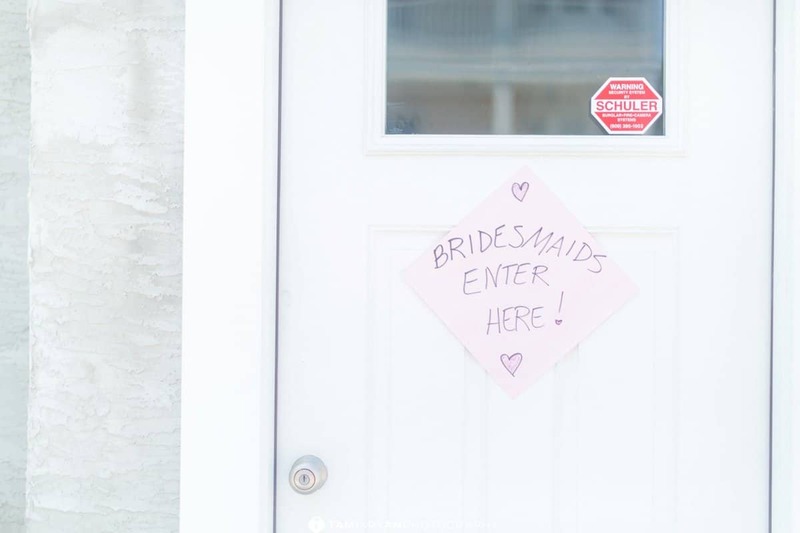 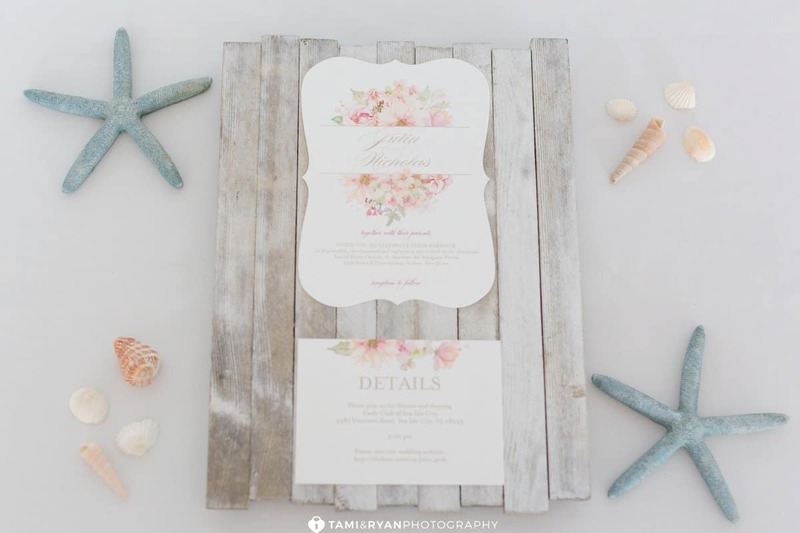 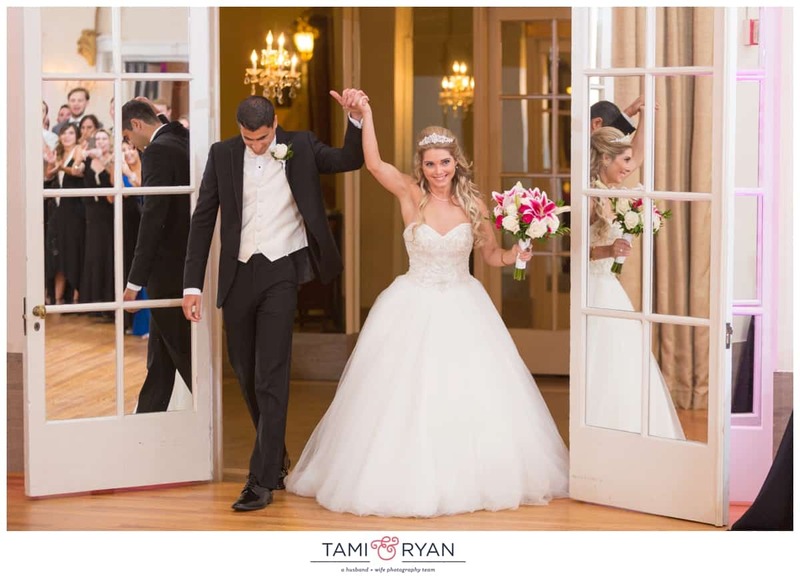 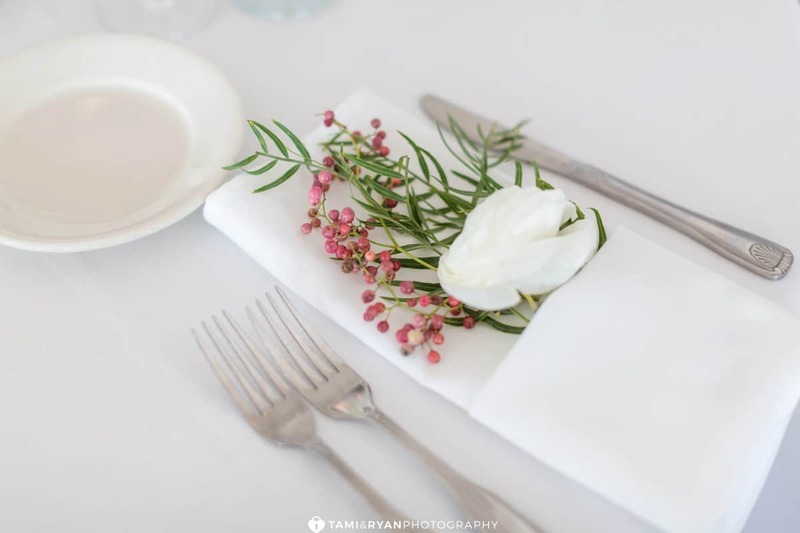 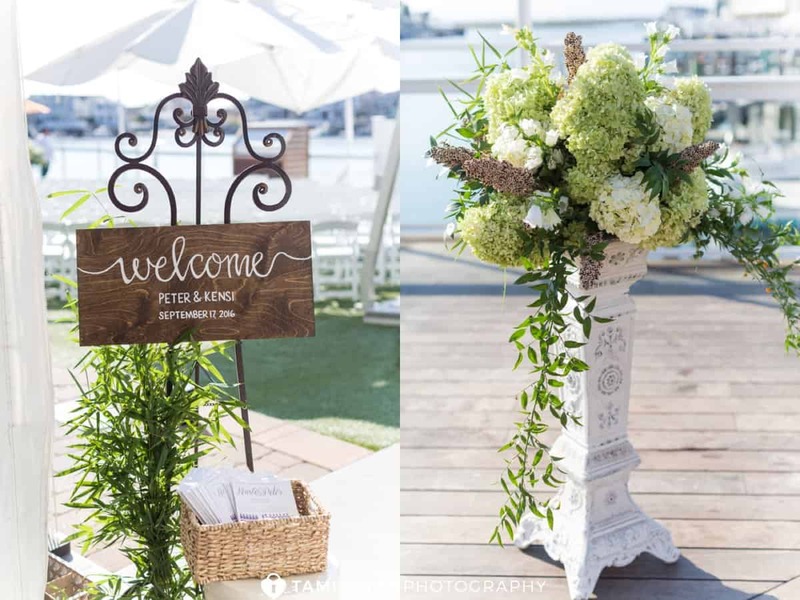 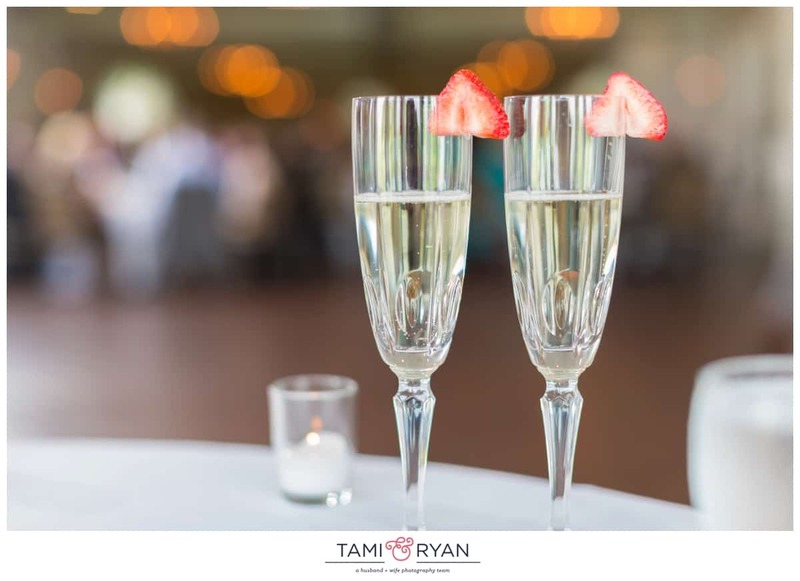 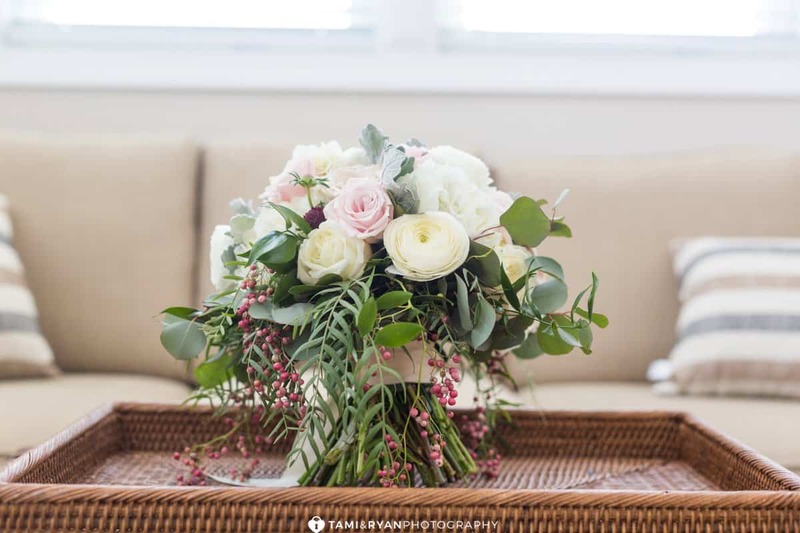 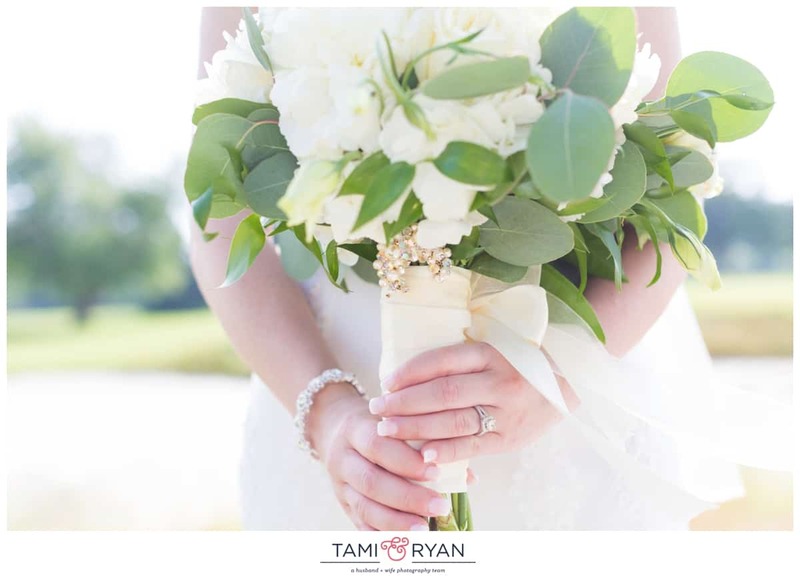 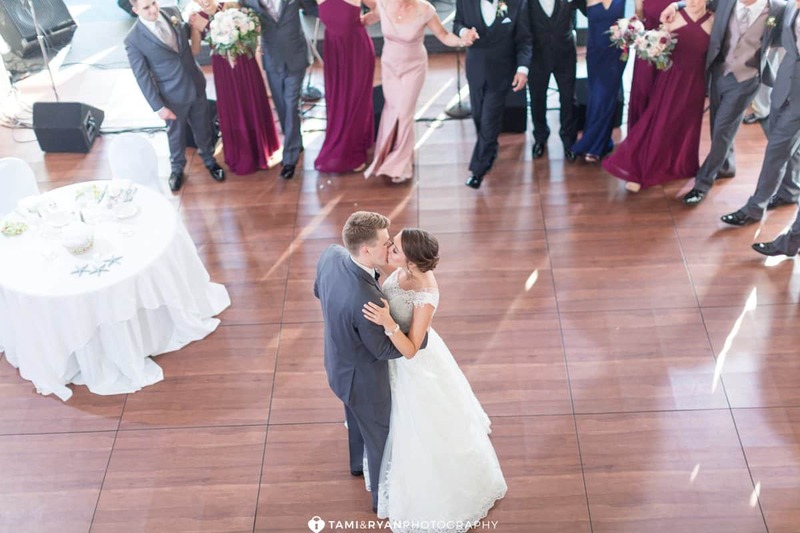 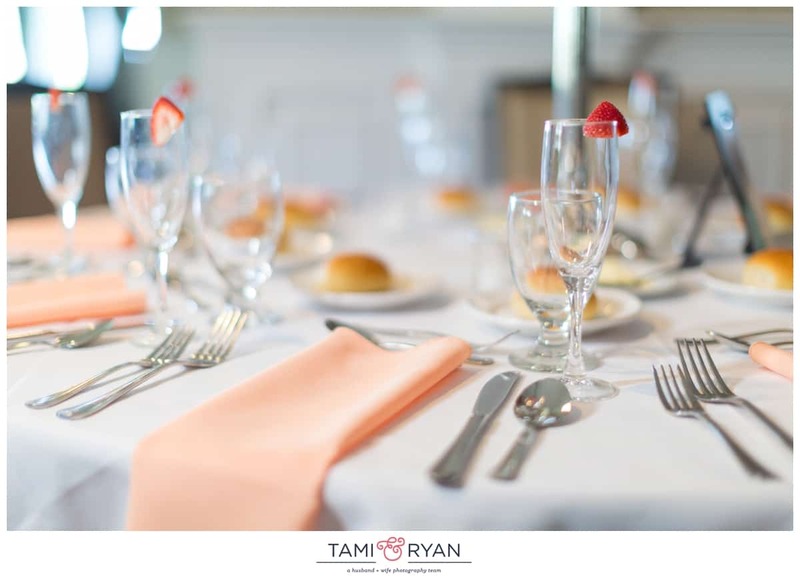 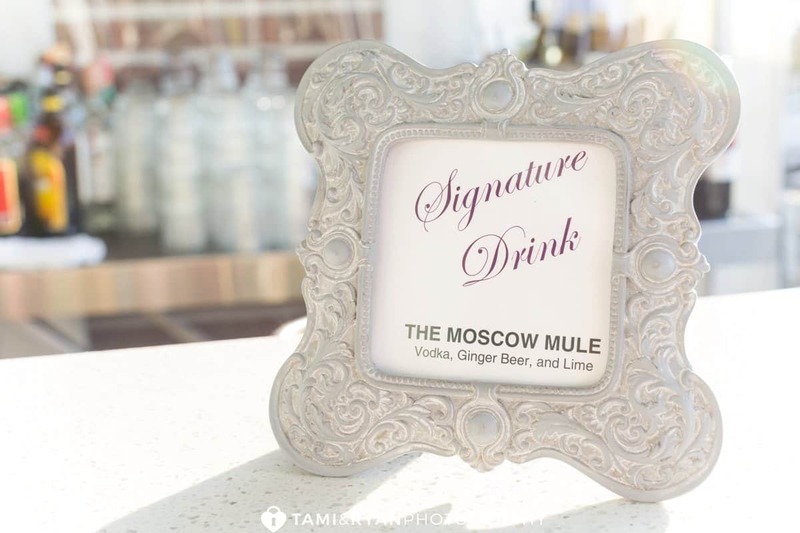 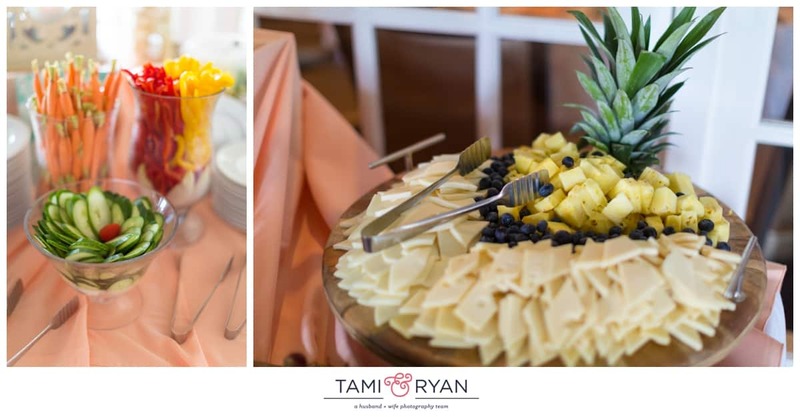 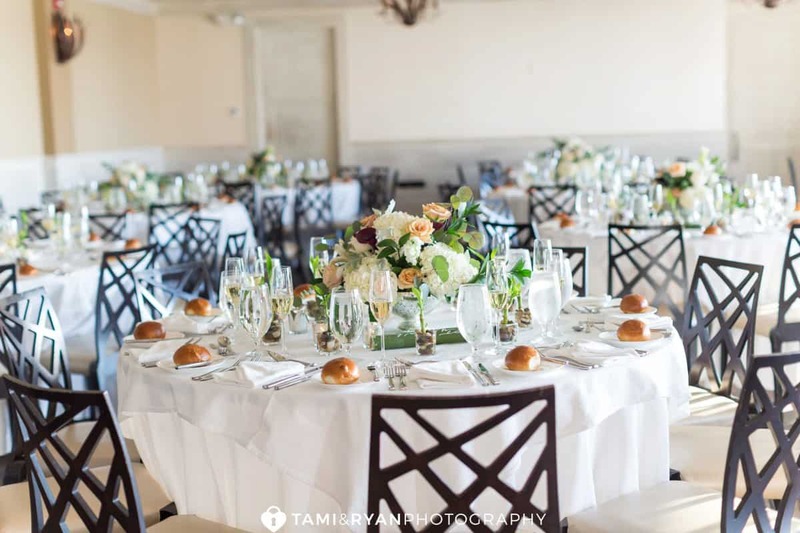 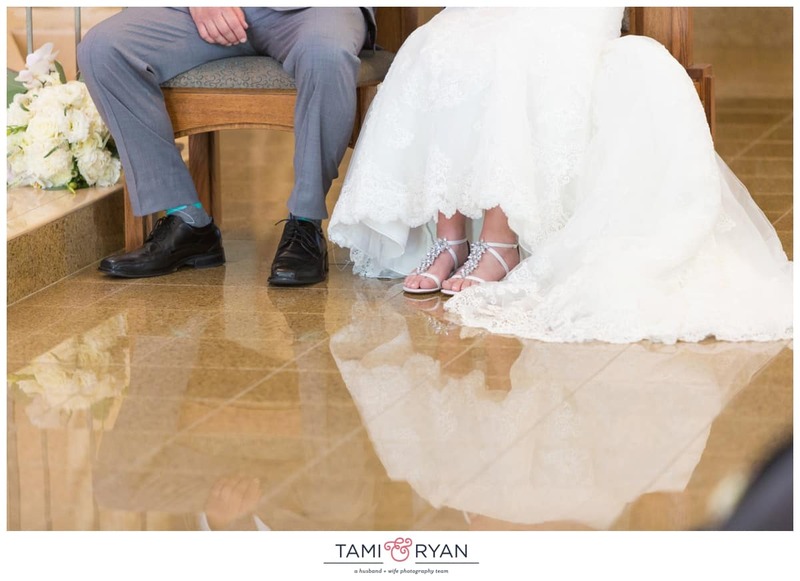 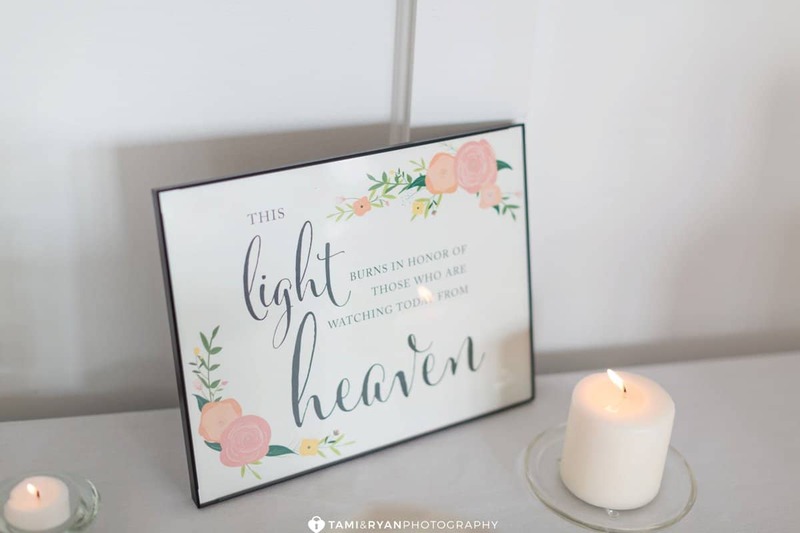 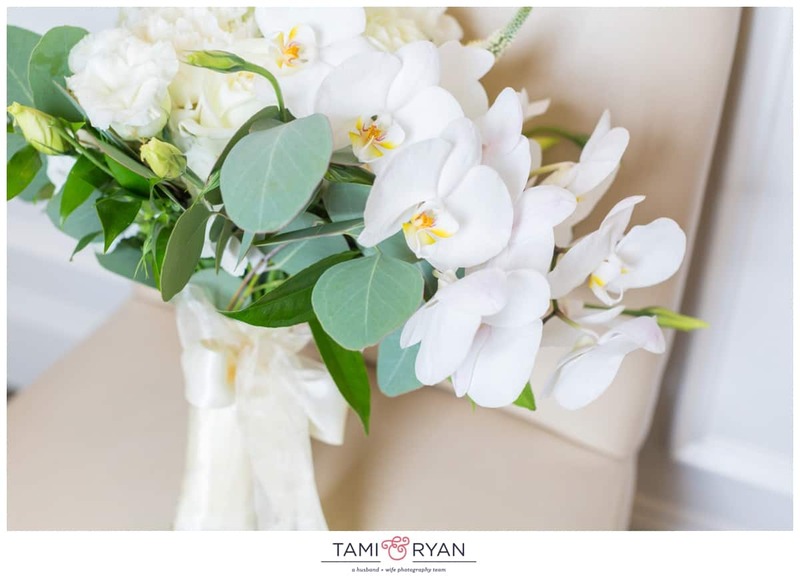 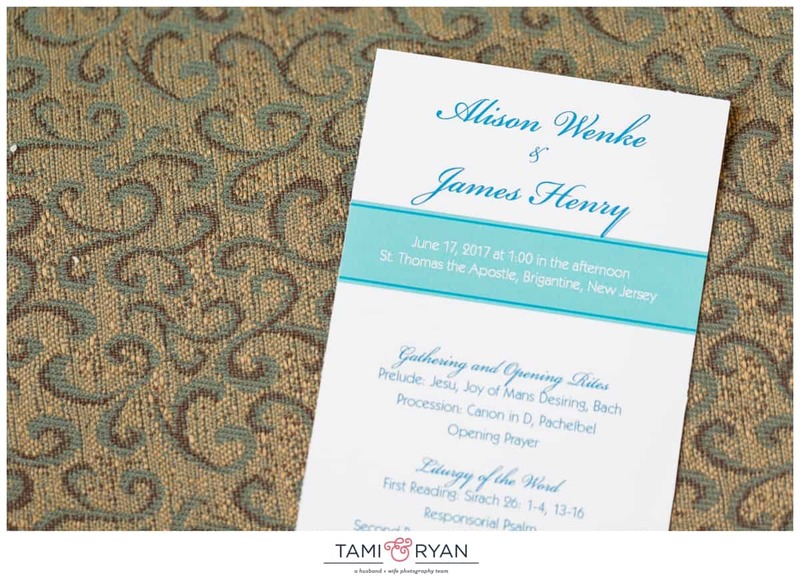 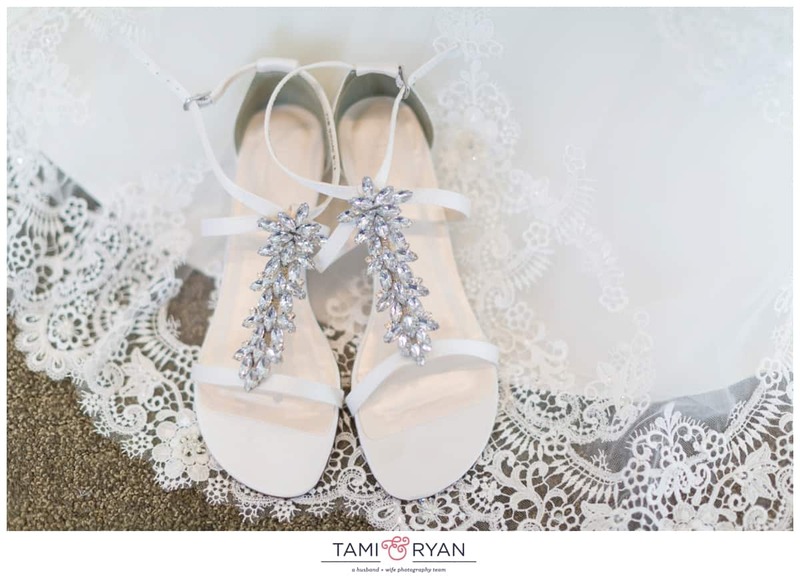 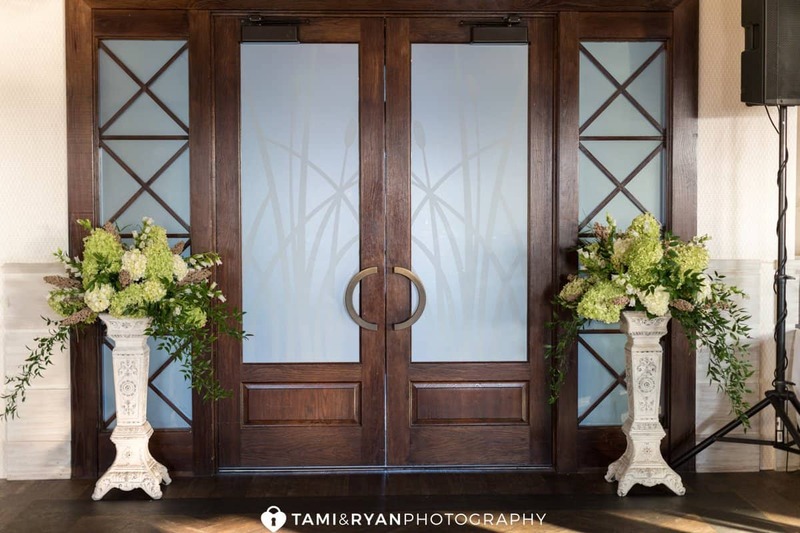 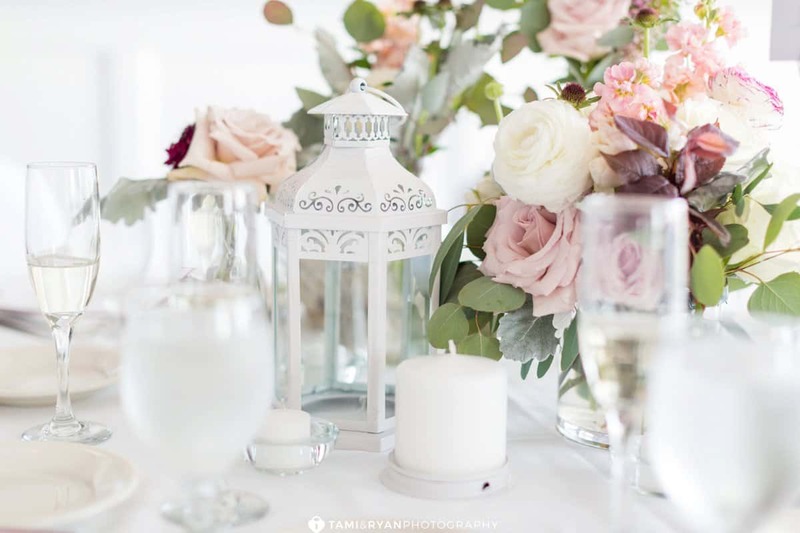 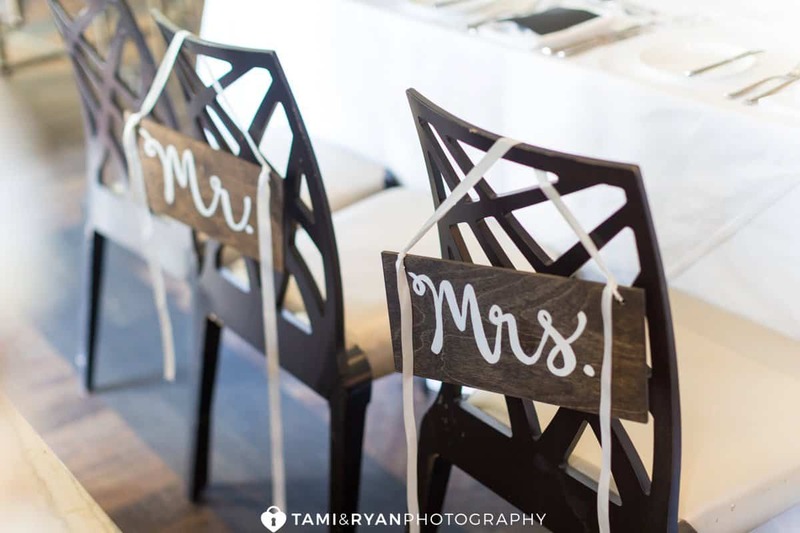 Offering intimate and unique setting with the simple elegance of a coastal chic design, this venue is the most desirable wedding destination at the southern New Jersey shore. 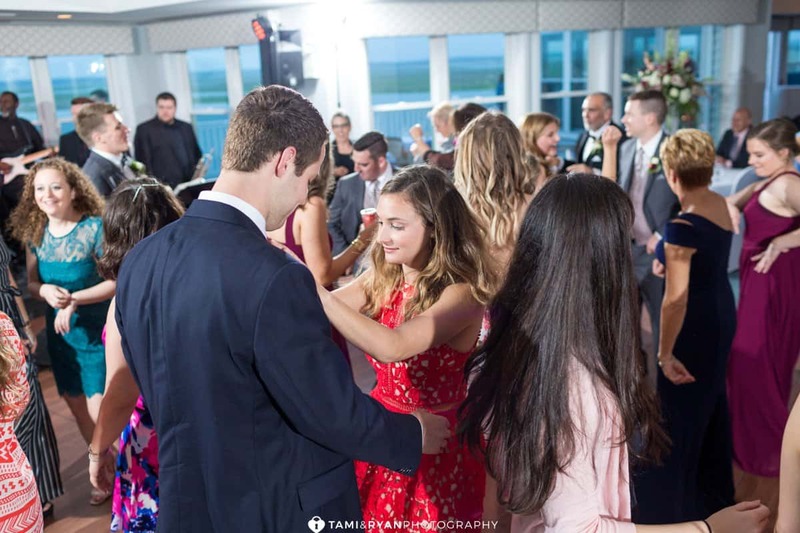 Kensi and Peter had a fun evening planned for their guests! 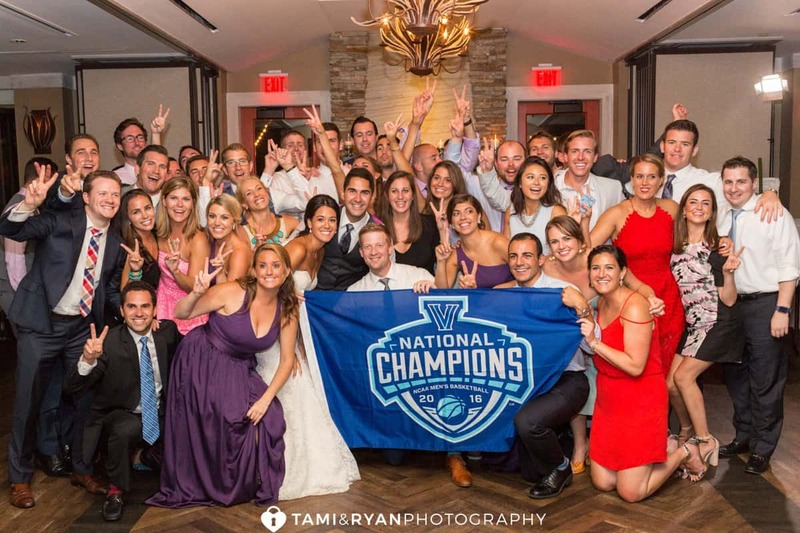 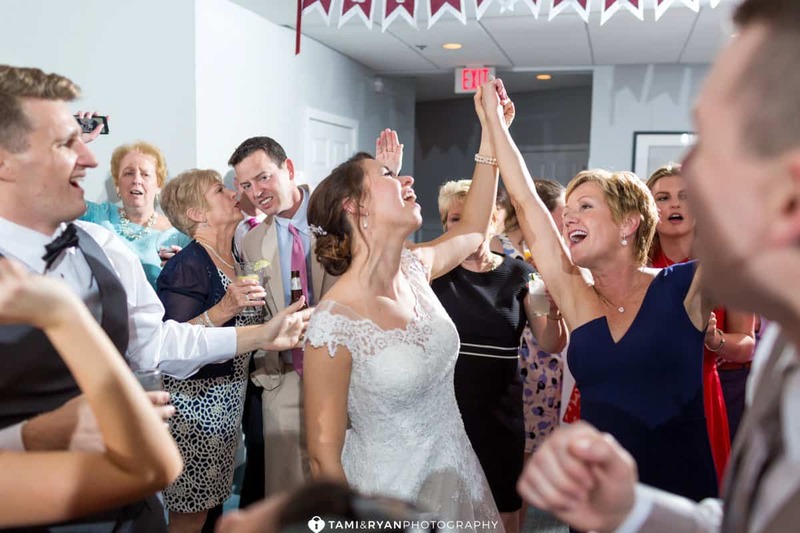 From meaningful toasts, to celebrating Villanova’s NCAA Championship win, to dancing the night away with all of their closest friends and family. 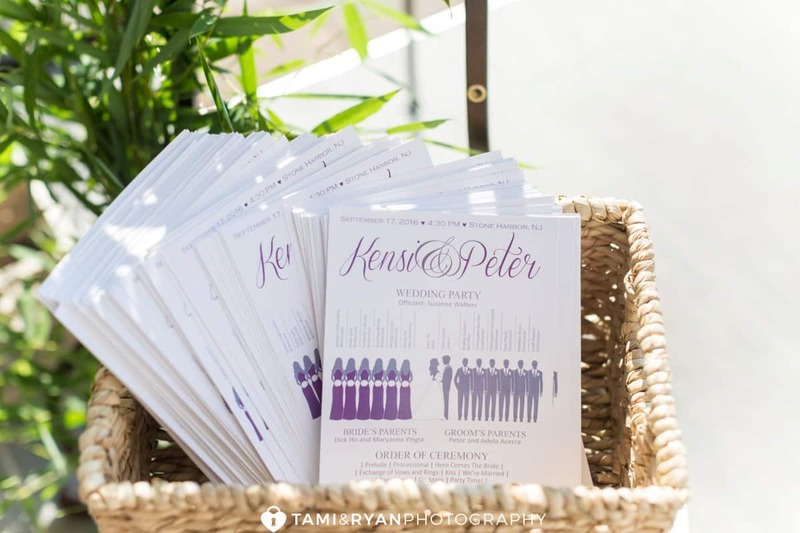 Kensi and Peter truly had a wedding day that would not soon be forgotten by anyone who attended. 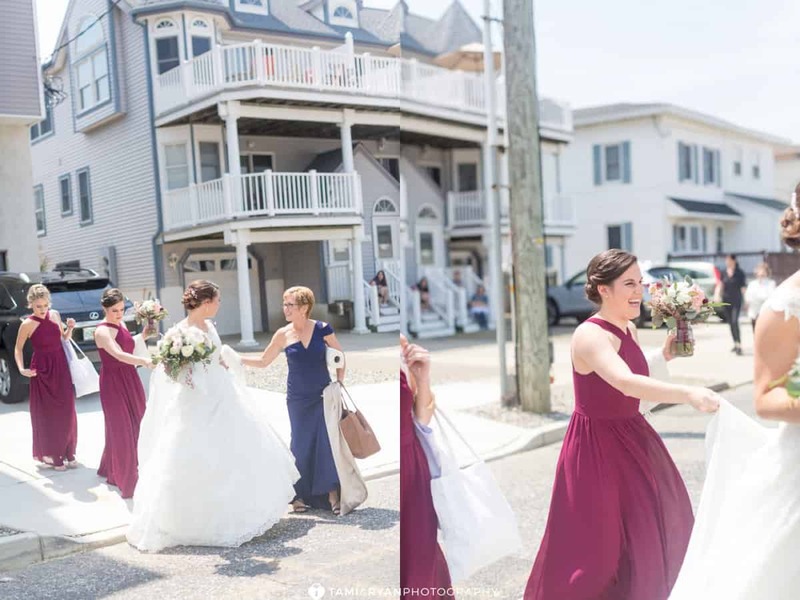 The day began at The Flanders Hotel in Ocean City. 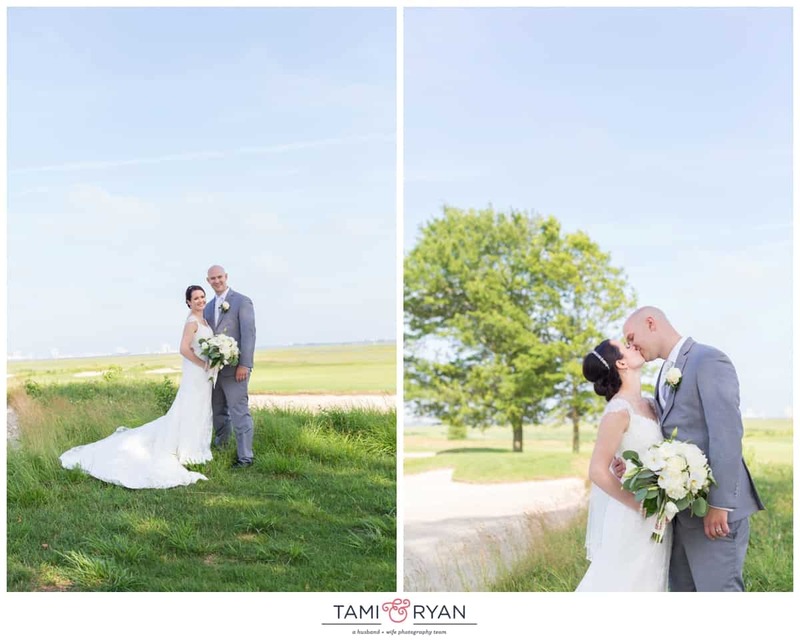 It is the most perfect, breezy summer day. 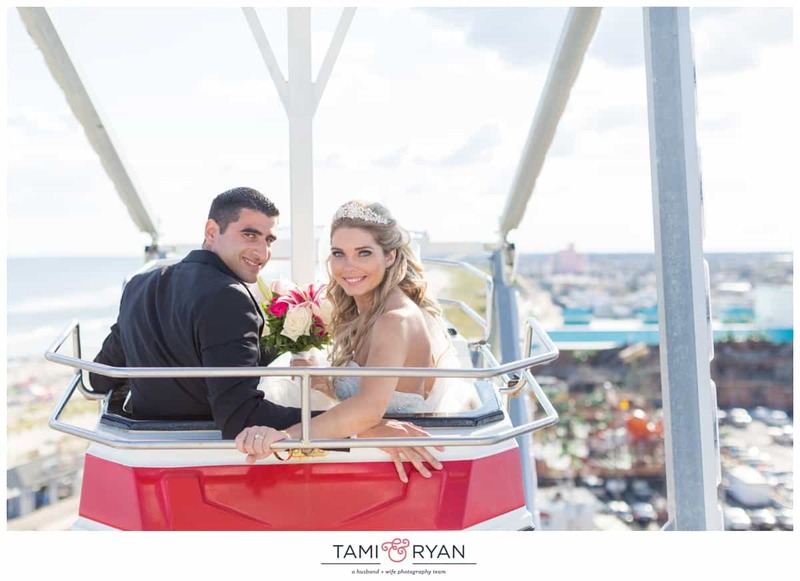 There are seagulls in the sky, a car show happening on the boardwalk, and a joyous, happy calm in the air! 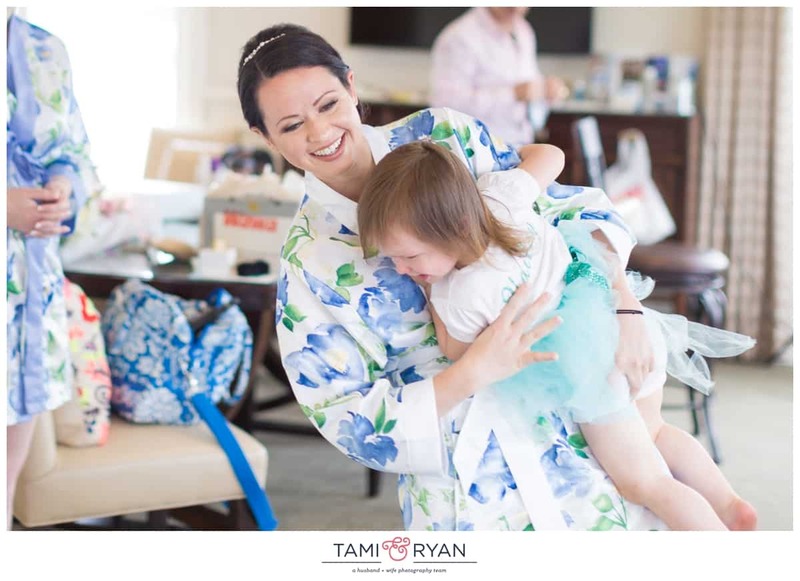 Caitlin is in the makeup chair getting pampered by Taffeta Design, while she is surrounded by the women who mean the most to her! 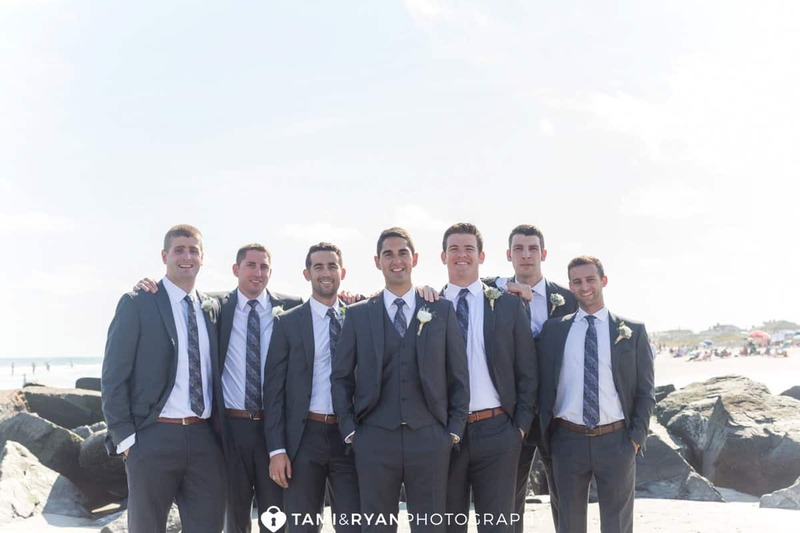 Meanwhile, Andrew is at his parents condo, hanging out with his best guy friends waiting for the festivities to begin. 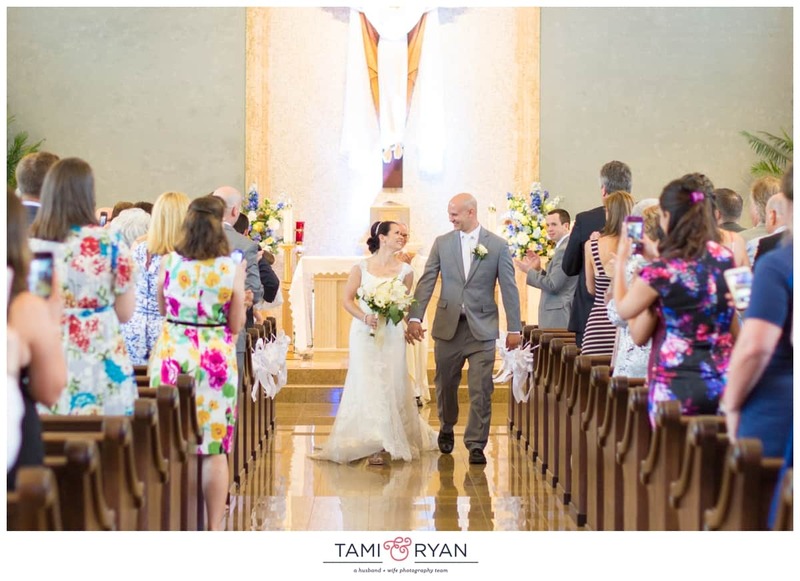 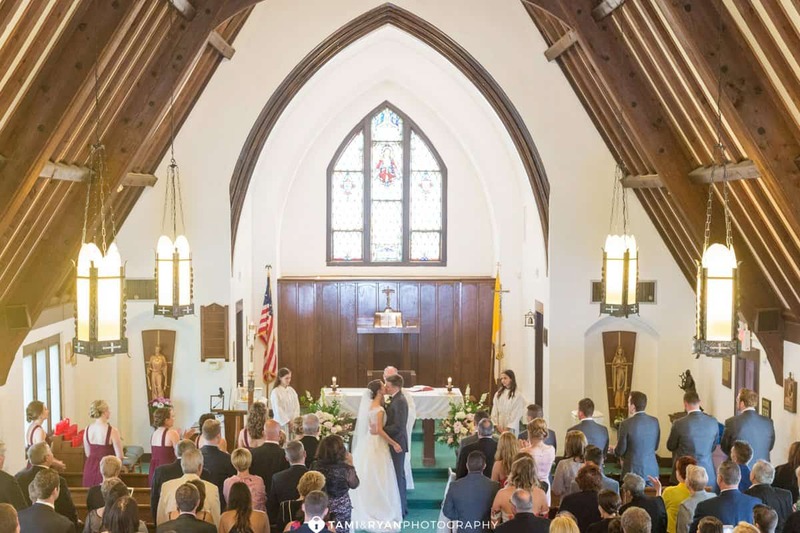 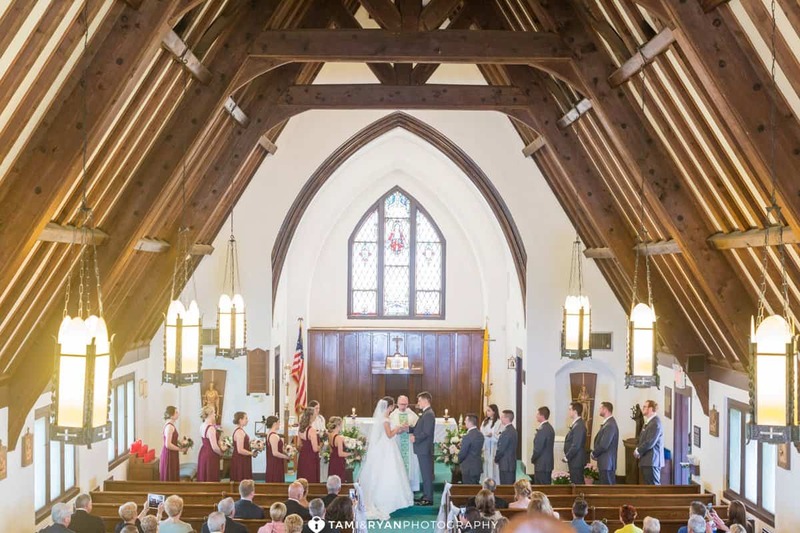 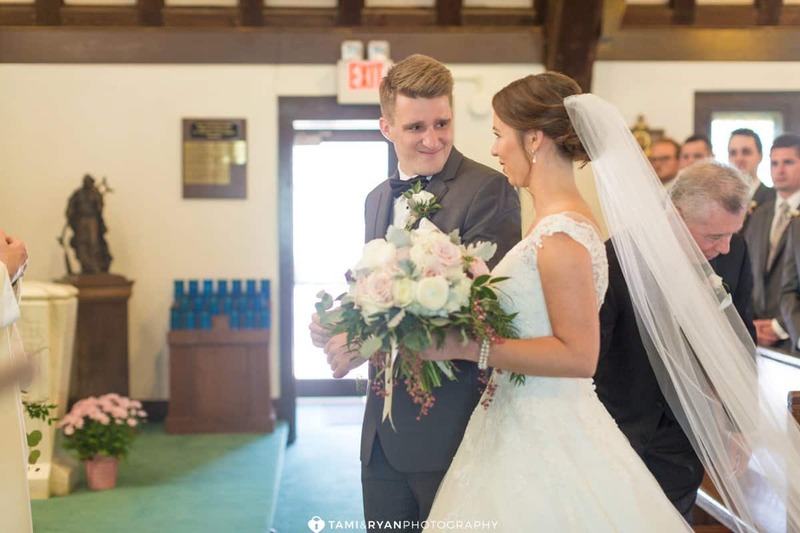 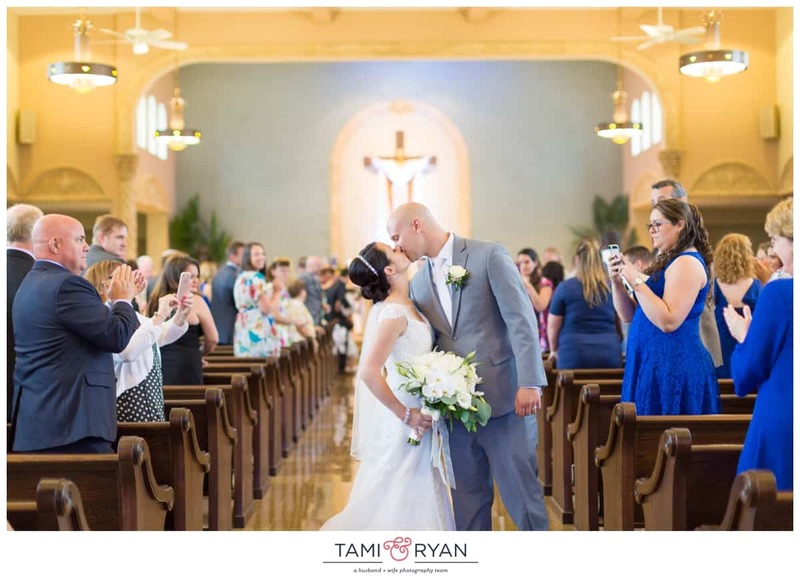 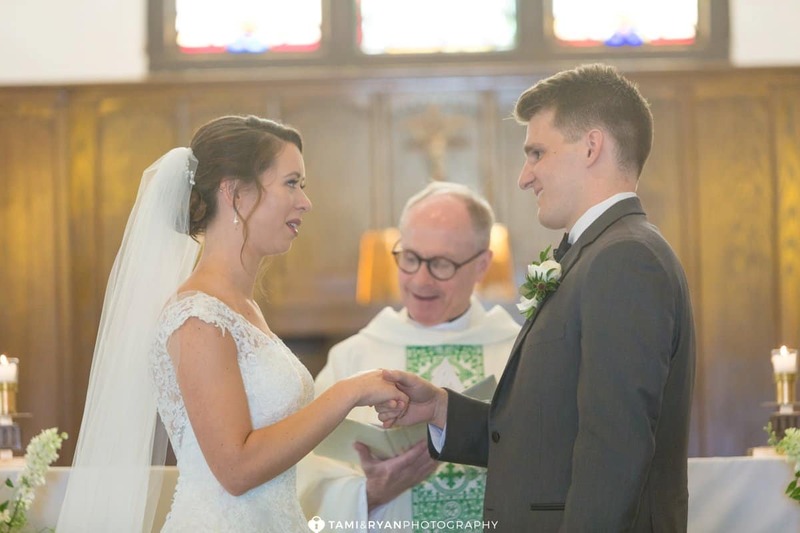 This ninth day of September could not have been a more ideal day for Caitlin and Andrew to get married at St. Augustine Church in Ocean City. 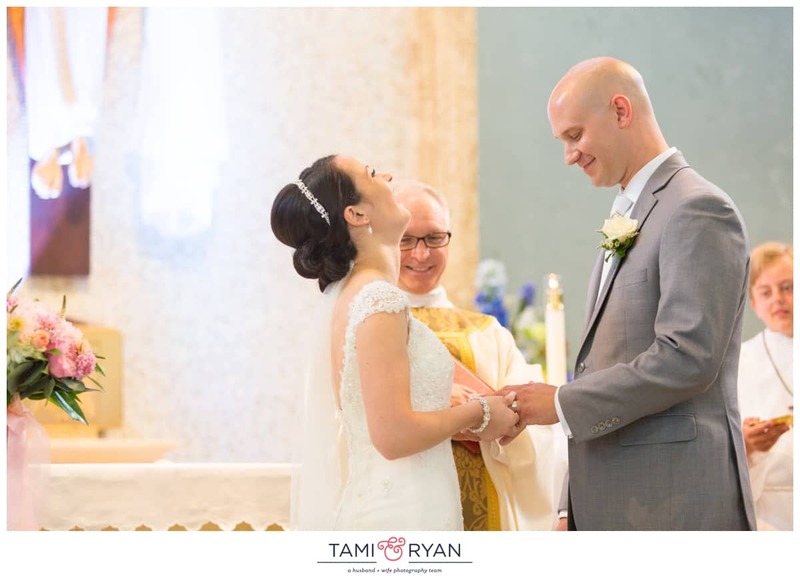 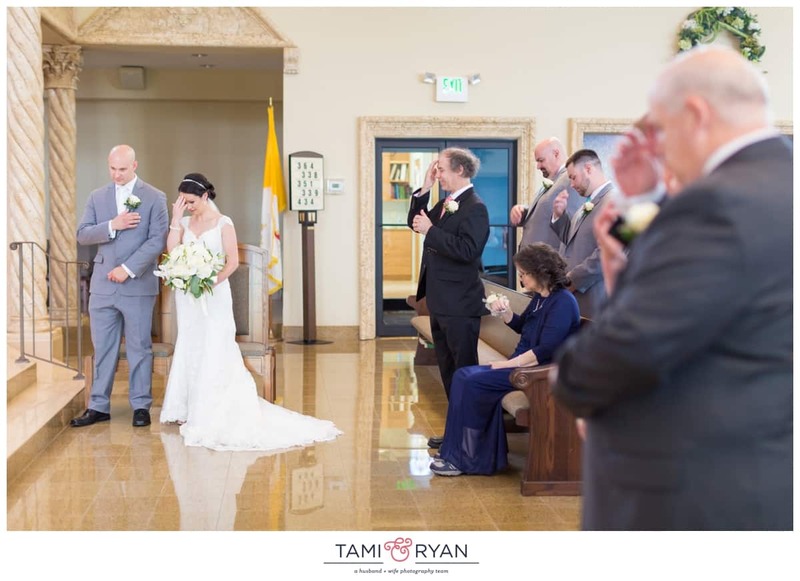 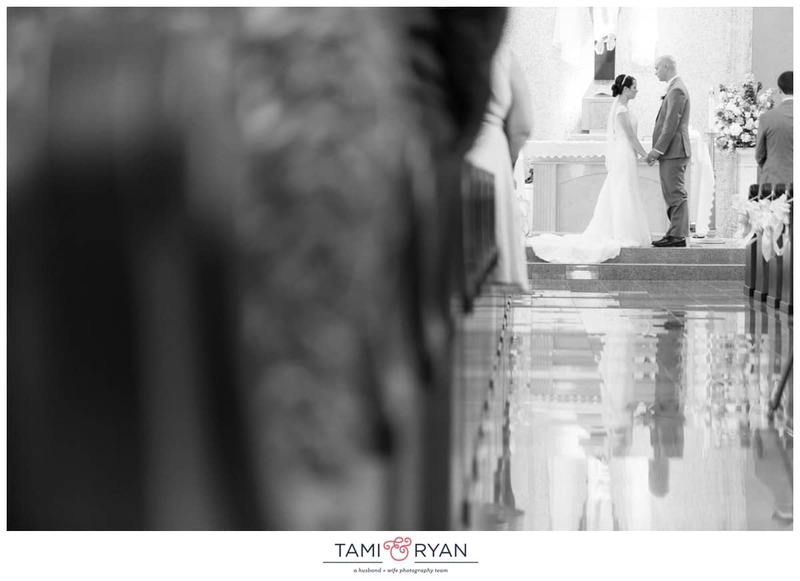 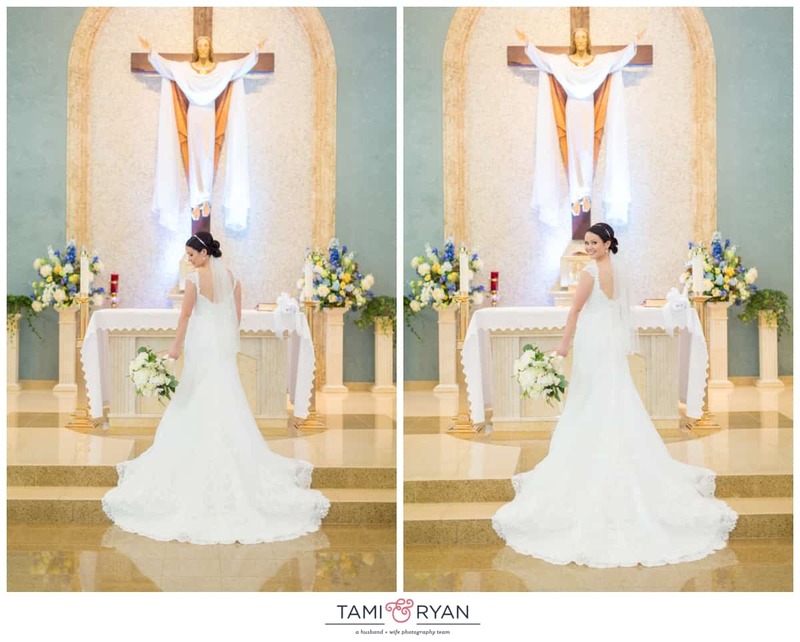 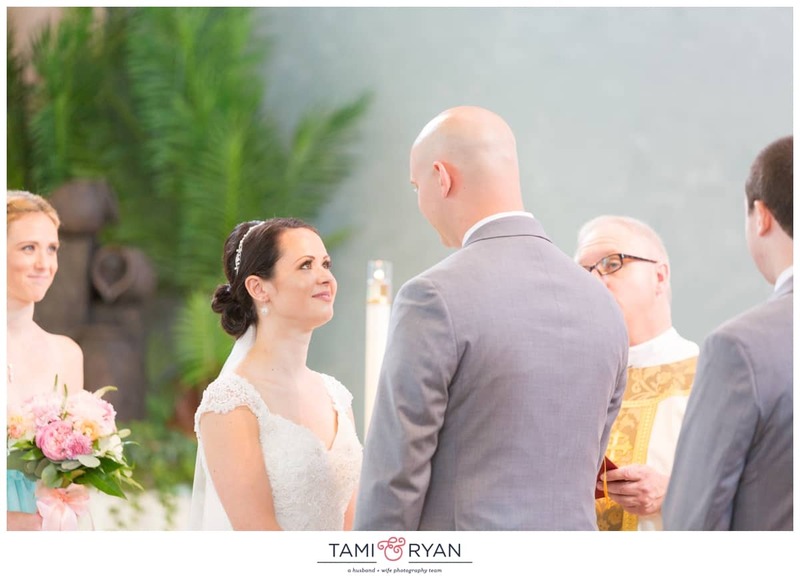 They had a beautiful Catholic ceremony and tears were definitely shed. 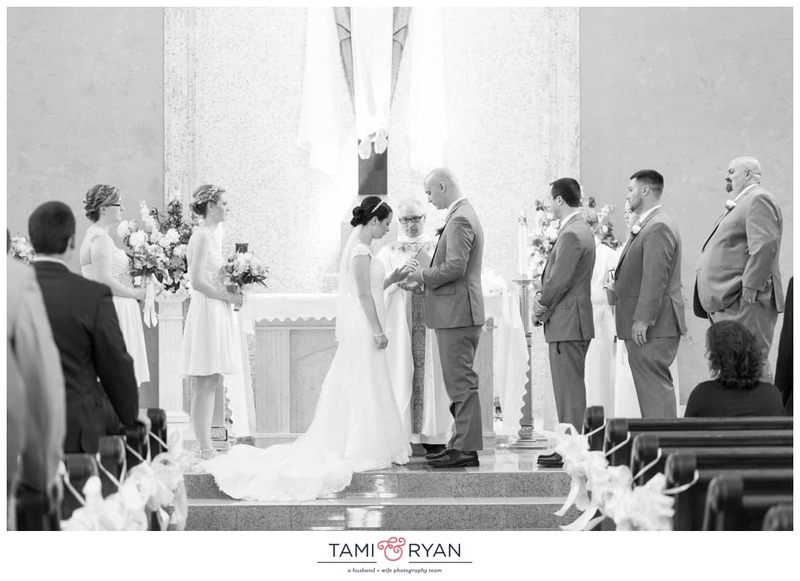 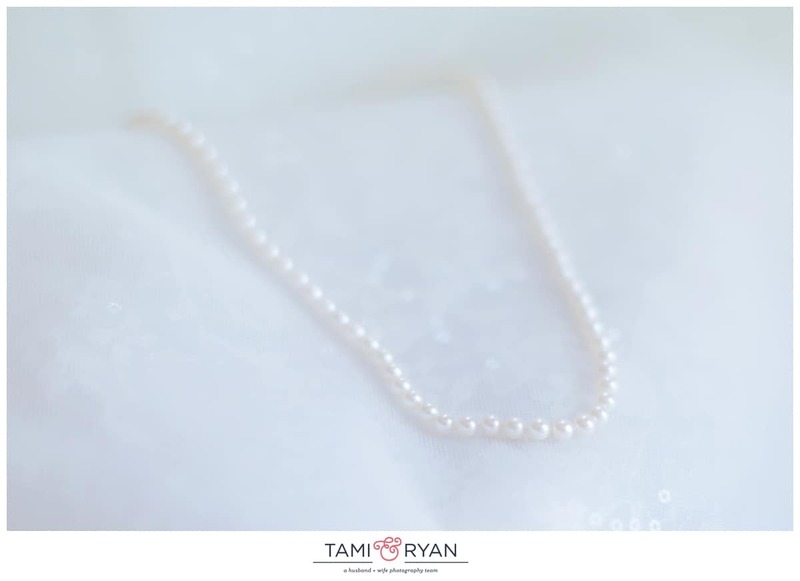 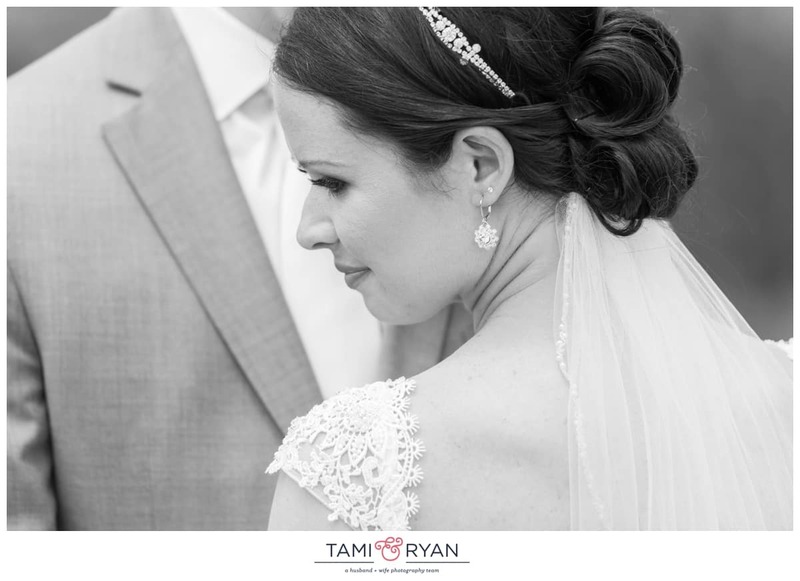 The moment Caitlin & Andrew said their I Do’s, you could feel that the celebration was just beginning. 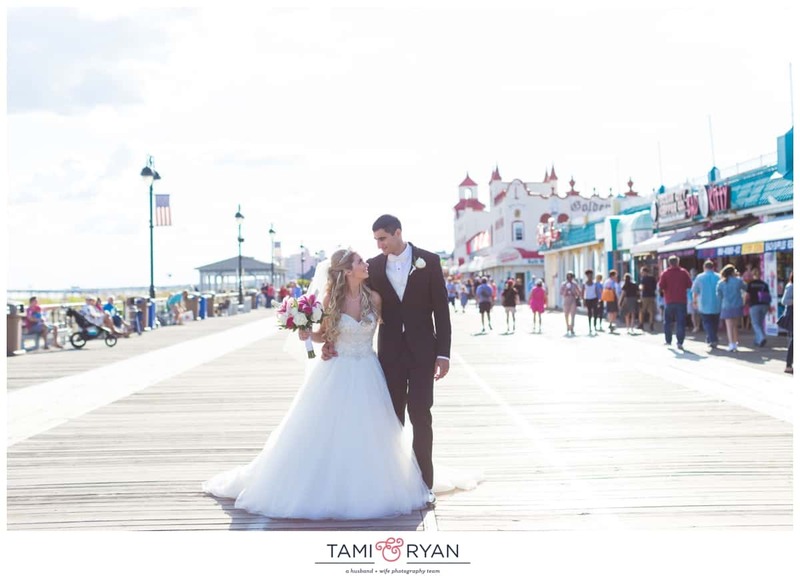 We ventured to the beach at 14th Street Pier in Ocean City. 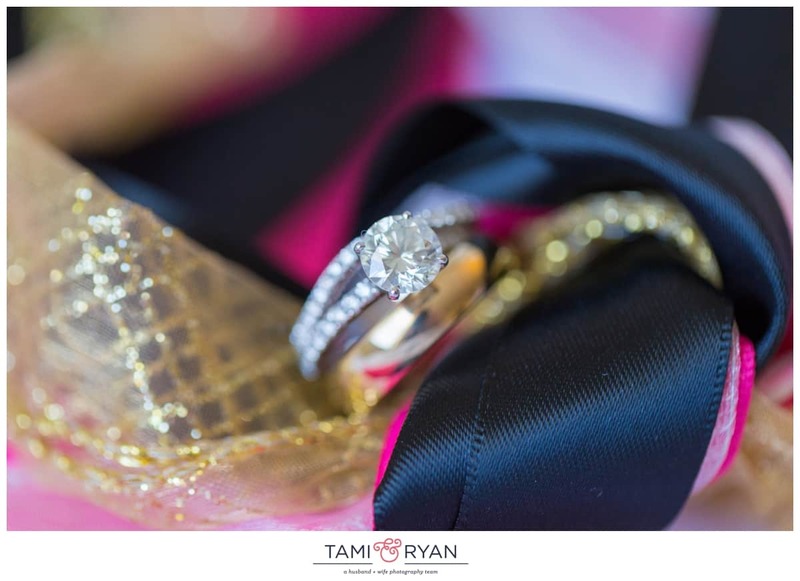 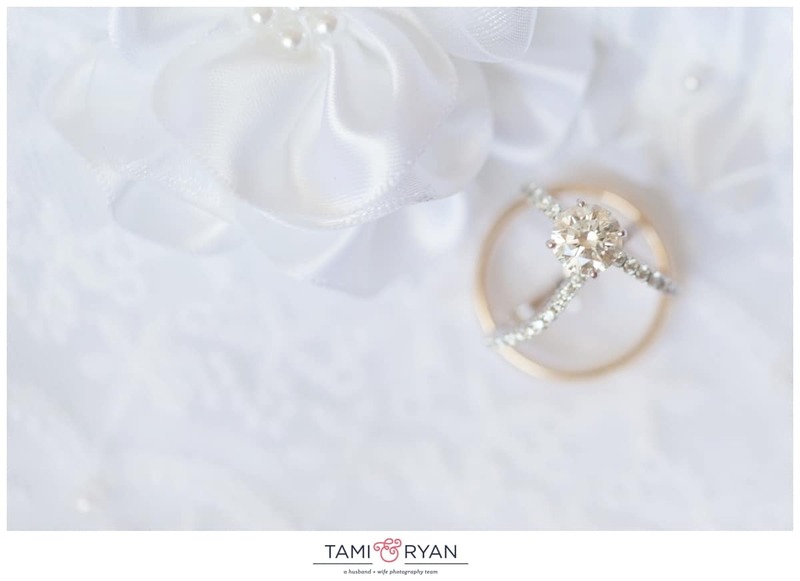 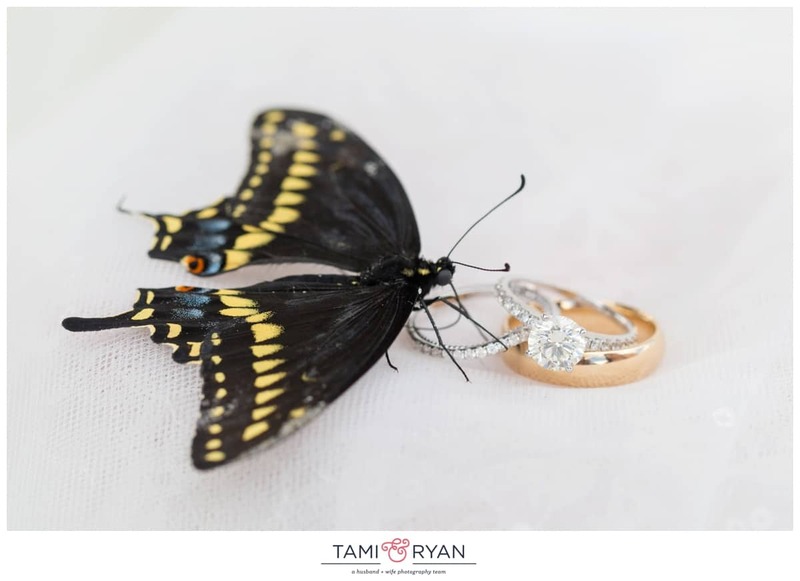 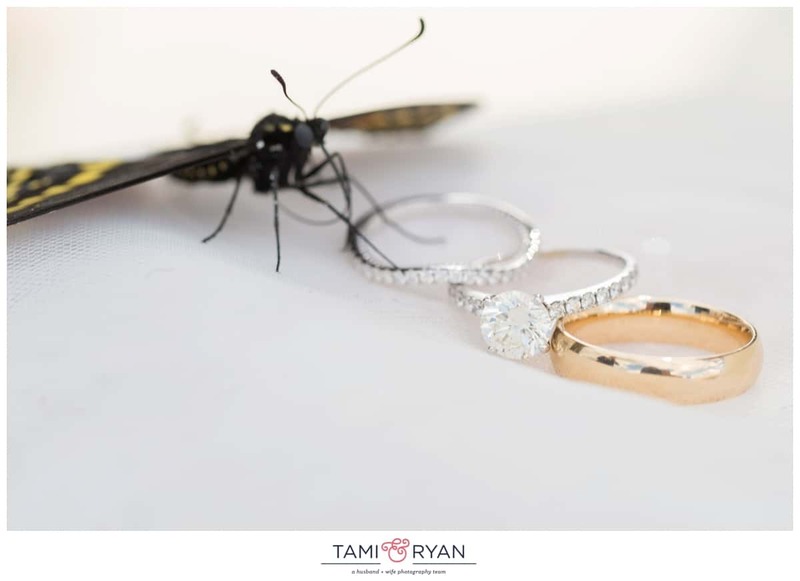 While capturing their bridal party, a butterfly decided to join in, and we were able to capture probably one of my favorite ring shots ever. 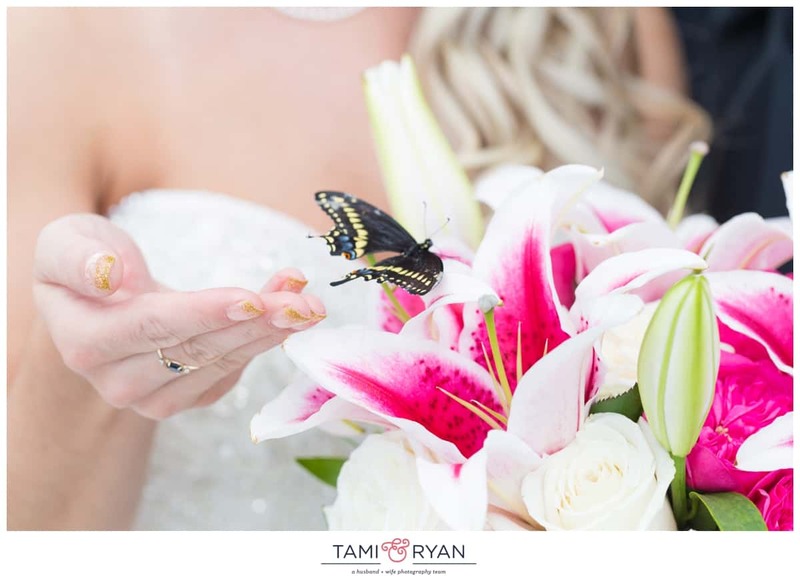 The butterfly reminded Caitlin of her grandfather, and made her feel that he was there with them on this happy day! 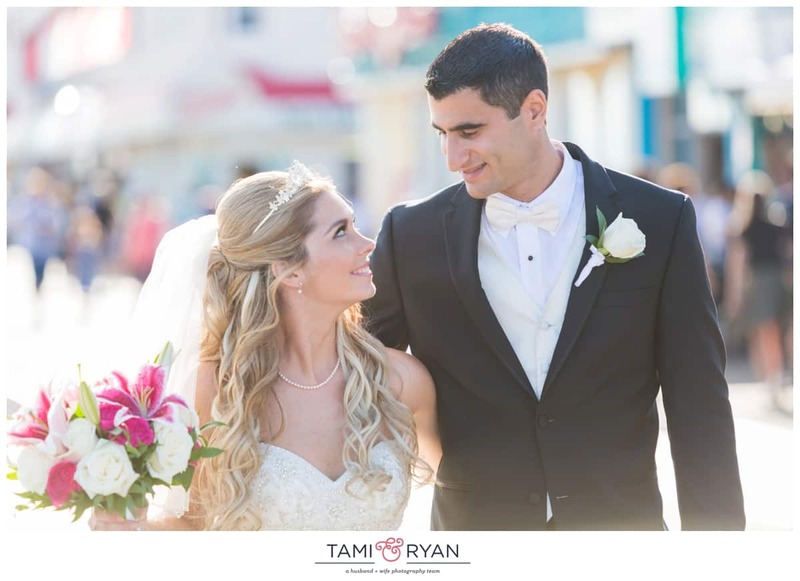 The boardwalk was full of fun, families and a car show, but that didn’t stop us from capturing some fun photos of this bride and groom! 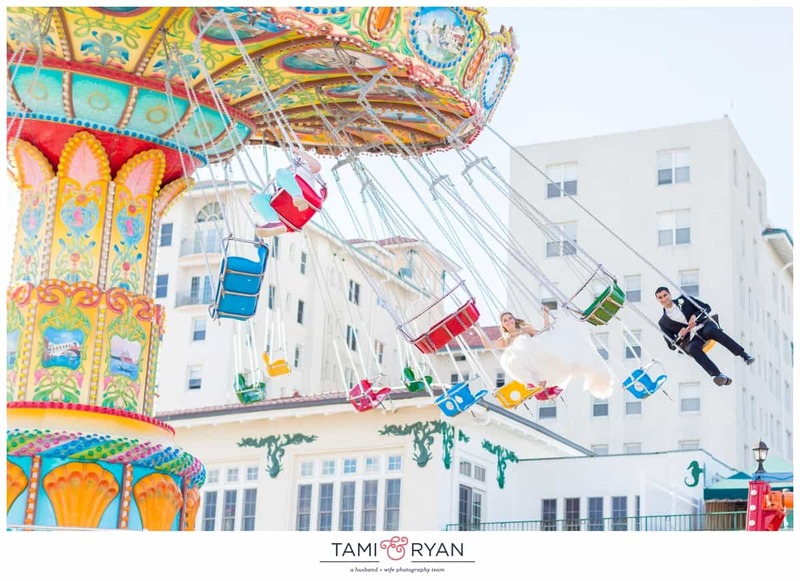 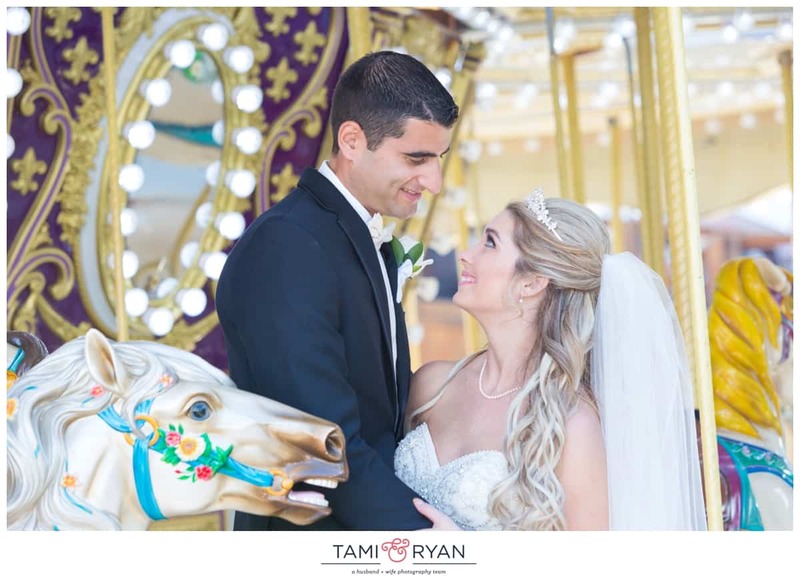 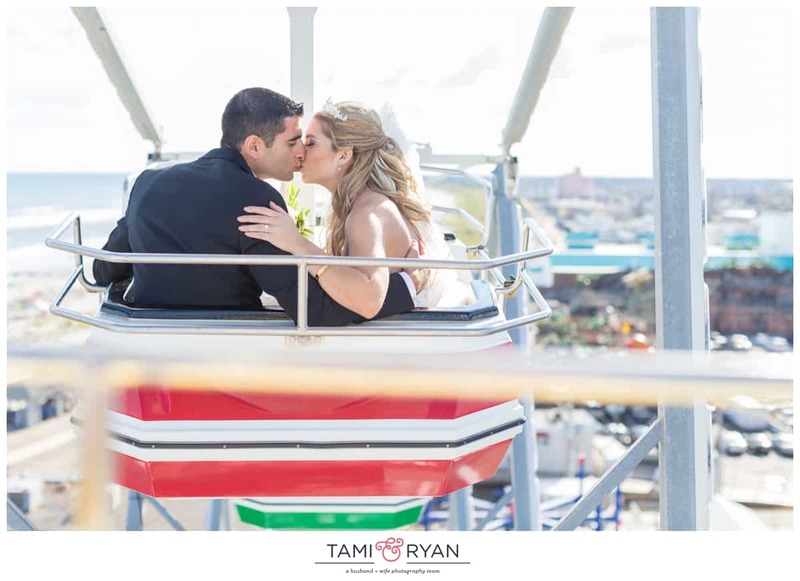 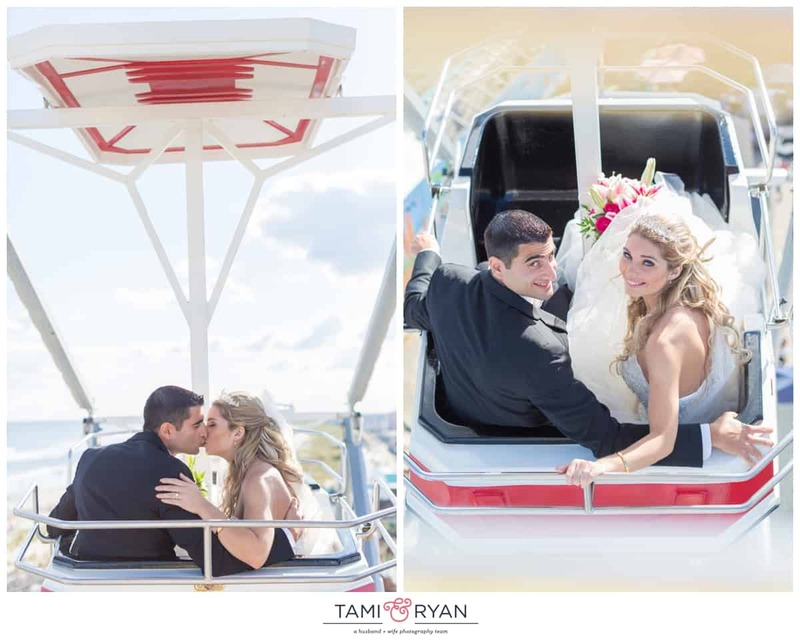 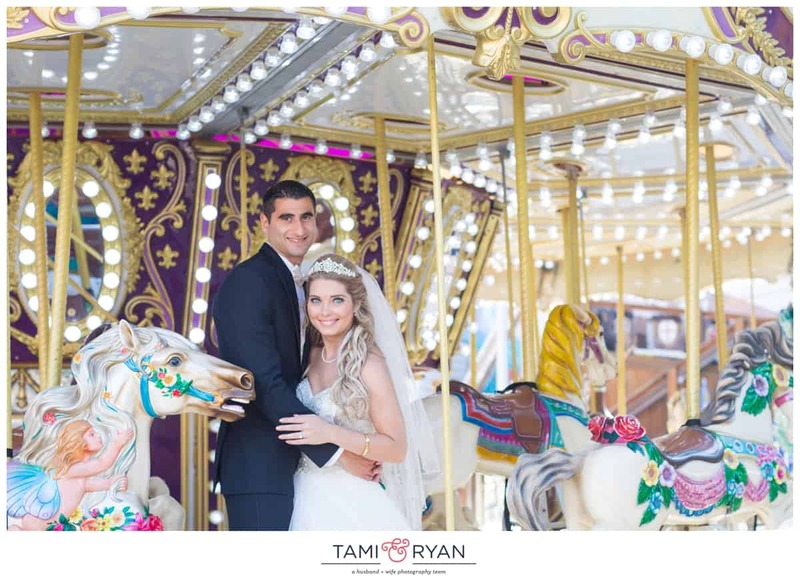 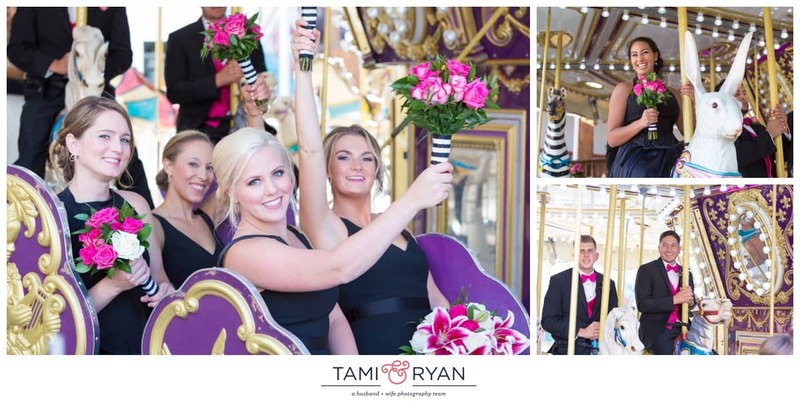 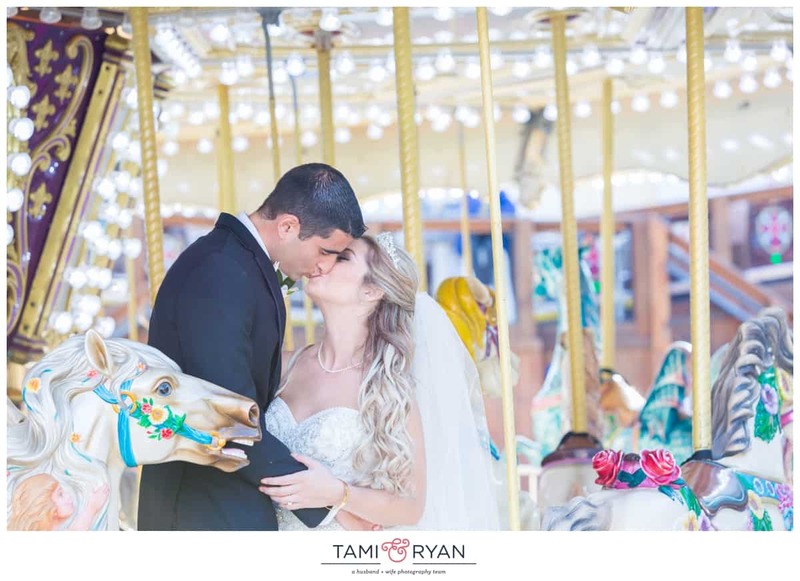 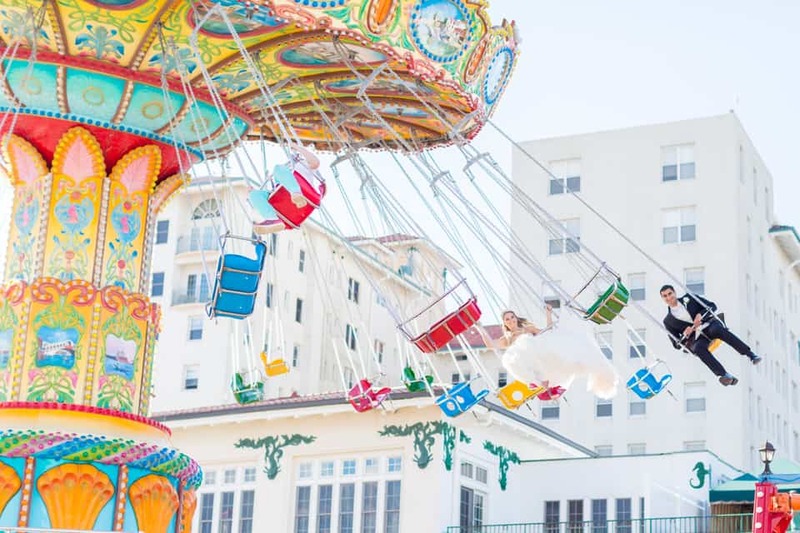 They rode the swings, the carousel and Andrew, although scared of heights, braved the ferris wheel for his new wife! 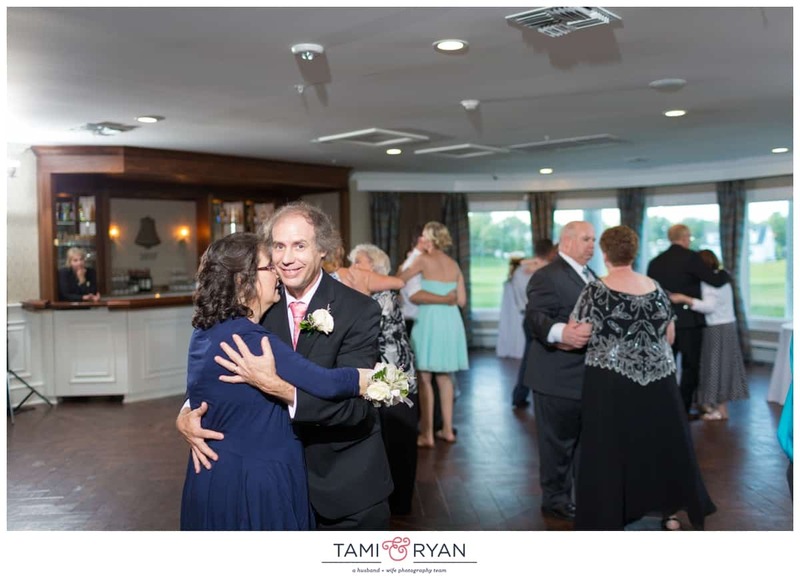 The remainder of the night consisted of so much love as all of their friends and family danced the night away with them!